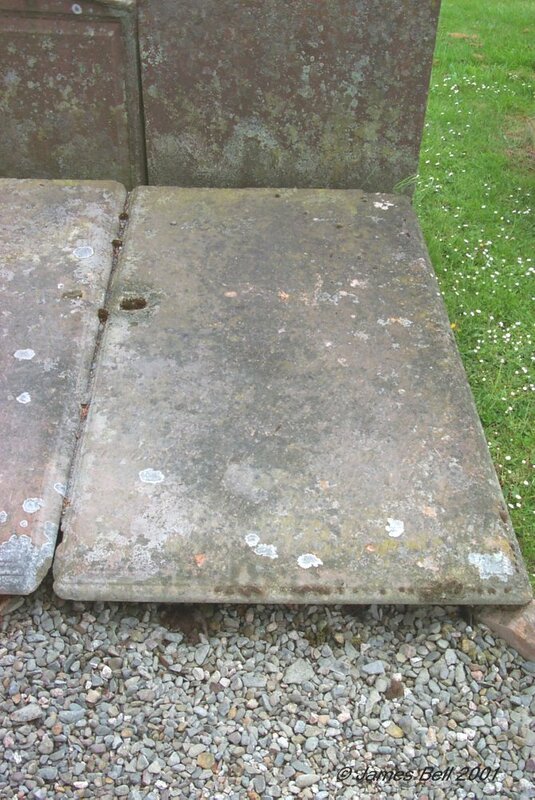 This page lists transcriptions of the 238 visible and readable monumental inscriptions which were found in Twynholm Old Churchyard, near Kirkcudbright, when it was surveyed just after the year 2000, accompanied by photographs of each monument. 001 In loving memory of David Clacherty, who died at Twynholm, 13th Oct’r 1917, aged 69 years. Also his daughter Jessie, who died at Humboldt, Sask., 30th Nov’r 1918, aged 33 years. Also Jessie Ross, wife of the said David Clacherty, who died at Twynholm, 27th December 1930, in her 81st year. 003 In loving memory of Robert Brydson, who died at Millhouse, 6th March 1915, aged 17 months. 004 In loving memory of Sarah Garmory, wife of William Heron, died at Twynholm, 16th Feb'y 1939, aged 64 years. 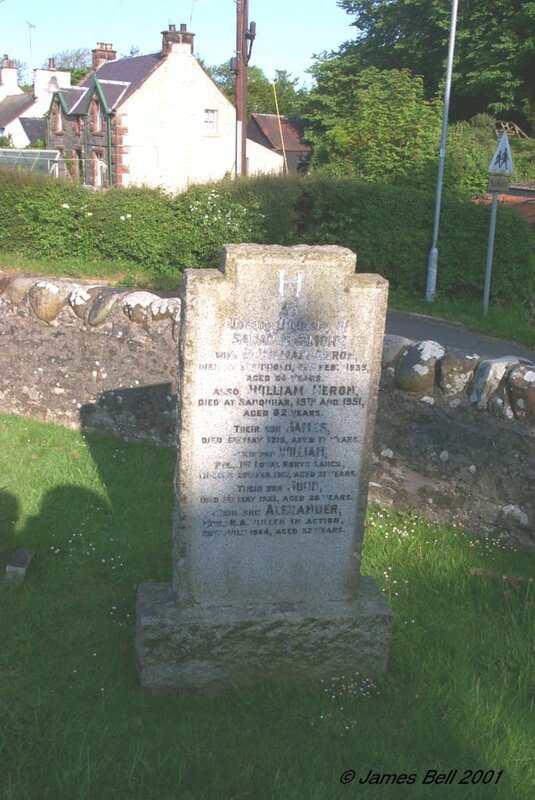 Also William Heron, died at Sanquhar, 19th Aug 1951, aged 82 years. Their son James, died 6th May 1915, aged 17 years, Their son William, Pte, 1st Royal North Lancs, missing 25th Feb 1917 aged 21 years. Their son John died 1st May 1932, aged 28 years, Their son Alexander, Gnr., R.H.A., killed in action 26th July 1944, aged 32 years. 005 Sacred to the memory of Robert Davies, who died at Twynholm Village, on the 19th Jan 1863, in the 72nd year of his age. 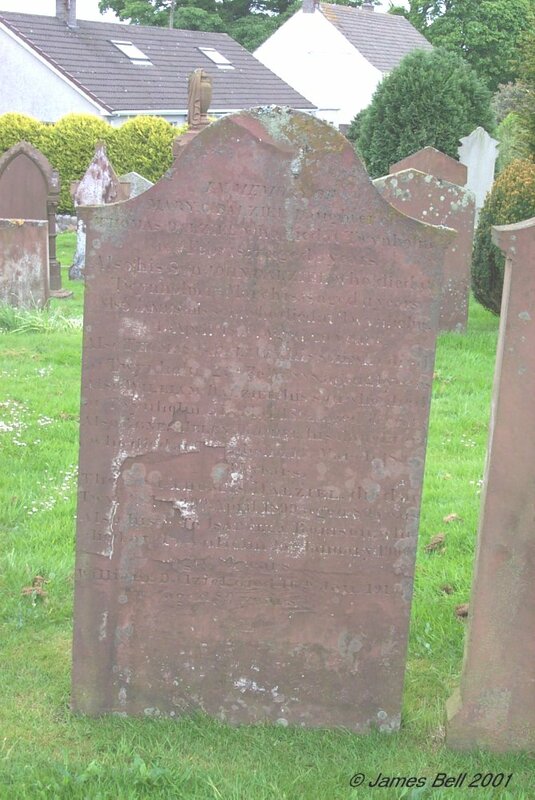 Also Mary Clune, his wife, died at Twynholm Village, Jan 3rd 1873, aged 72 years. 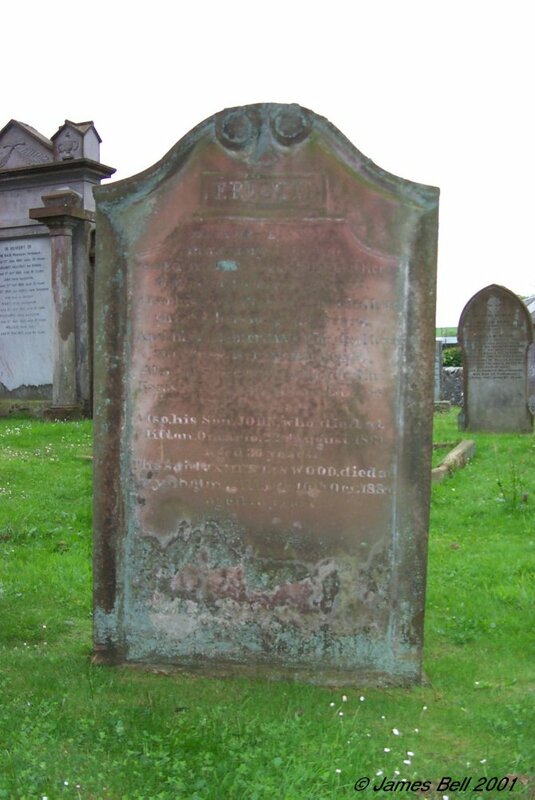 Also Agnes his daughter, who died at Lochhill, Tongueland, 2nd July 1860, aged 27 years. 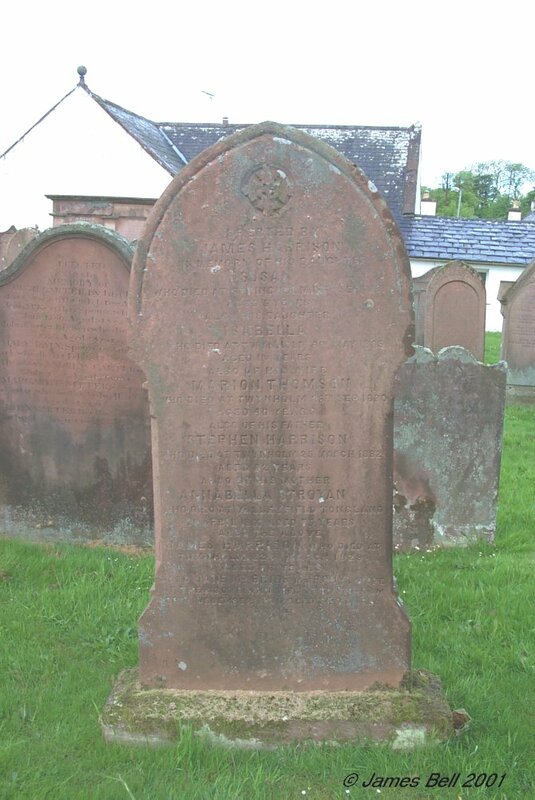 Also Robert Davies, their son died at Craigaploch, Rerwick, 30th Jan 1873, aged 34 years. 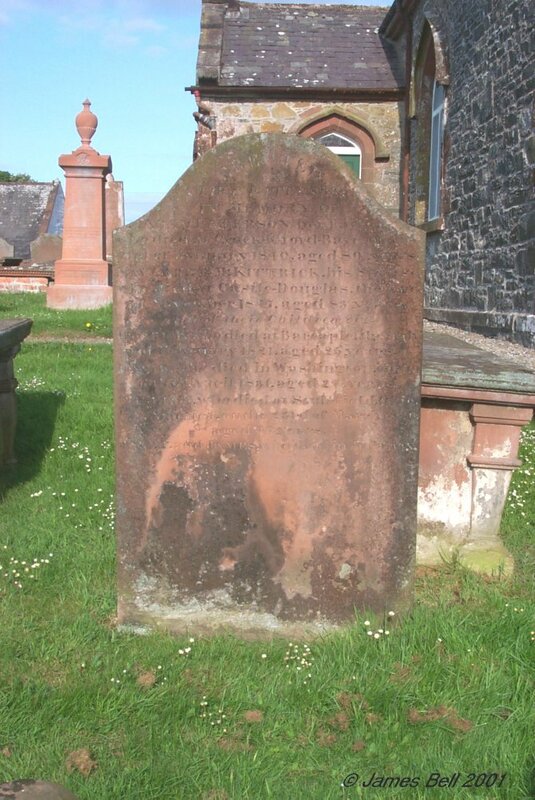 Also David Davies their son, who died at Back Grange, Kirkcudbright, 14th July 1908 aged 78 years. Also Marion Thompson, wife of the above David Davies, who died at Hightae Cottages, Castle Douglas, 1st March 1927, aged 76 years. 006 In loving memory of Isabella Brown, wife of John Green, who died at Twynholm, 14th August 1895, aged 58 years. 007 Erected by Robert Kirkpatrick in memory of Margaret Burnie, his wife, who died at Springholm, 13th Oct 1889, aged 69 years. The said Robert Kirkpatrick ,died at Springholm, on 27th June 1892, aged 72 years. 008a Erected by Robert Cummack in loving memory of James Frederick Murray, who died at Glencroft, 26th February 1909, aged 37 years. 008b In loving memory of David C. Taylor, who died 1st June 1921, schoolmaster of this parish for over 23 years. Erected by his loving wife and children. 010 In loving memory of William Baird who died at Newmills, Tongland, 10th Feb 1903, aged 72 years. Also Isabella McMillan his wife, who died at Newmills, Tongland, 25th October 1906, aged 83 years. Also Jane his daughter, who died 19th May 1861, aged 3 years. Also Isabella his daughter, who died 6th June 1875, aged 6 years. Also James McMillan his son, who died at Twynholm, on 21st Oct 1925, aged 59 years. Also Elizabeth his daughter, who died at Gatehouse, 5th April 1947, aged 87 years. 011 Erected by William Milroy in memory of his wife, Marion Meikle, who died at Drummore, 21st April 1876, aged 29 years. Also of Elizabeth Caig, his wife who died at Culraven, Borgue, 29th Nov'r 1890, aged 30 years. Also Elizabeth his daughter, who died 14th Jan'y 1892, aged 21 years. Also the said William Milroy, who died at Hallcroft, Corsock, 3rd May 1914, aged 64 years. 012 In memory of Thomas McMiken who died at Twynholm, 22nd Dec'r 1863, aged 53 years. 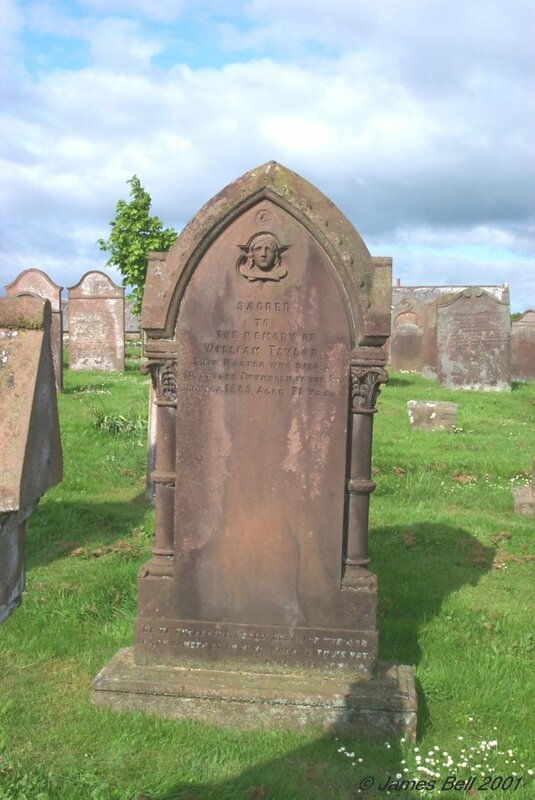 Also Agnes Taggart his spouse, who died at Moatcroft, on the 5th July 1881, aged 74 years. 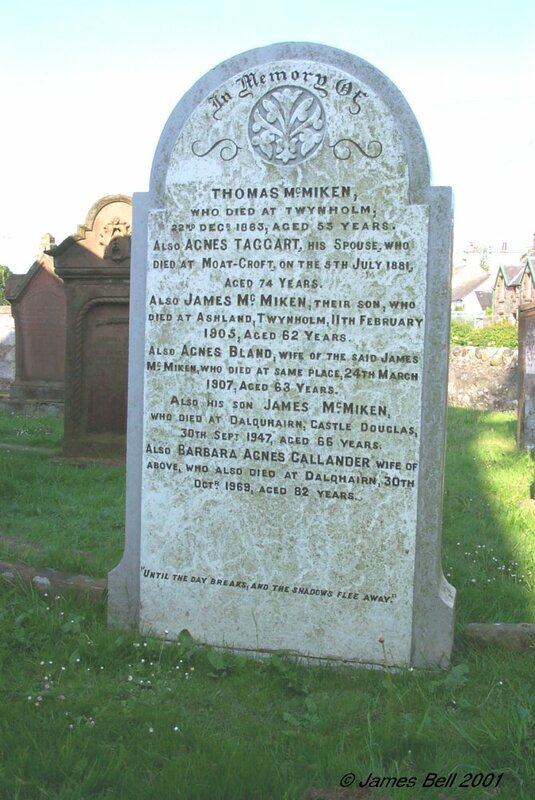 Also James McMiken, their son who died at Ashland, Twynholm, 11th February 1905, aged 62 years. Also Agnes Bland, wife of the said James McMiken, who died at same place 24th March 1907, aged 63 years. Also his son James McMiken, who died at Dalquhairn, Castle Douglas, 30th Sept 1947, aged 66 years. Also Barbara Agnes Callander, wife of the above ,who also died at Dalquhairn, 30th Oct'r 1969, aged 82 years. Until the day breaks and the shadows flee away. 013 In memory of John Rain, Merchant, Twynholm, who died 17th June 1860, aged 78 years. 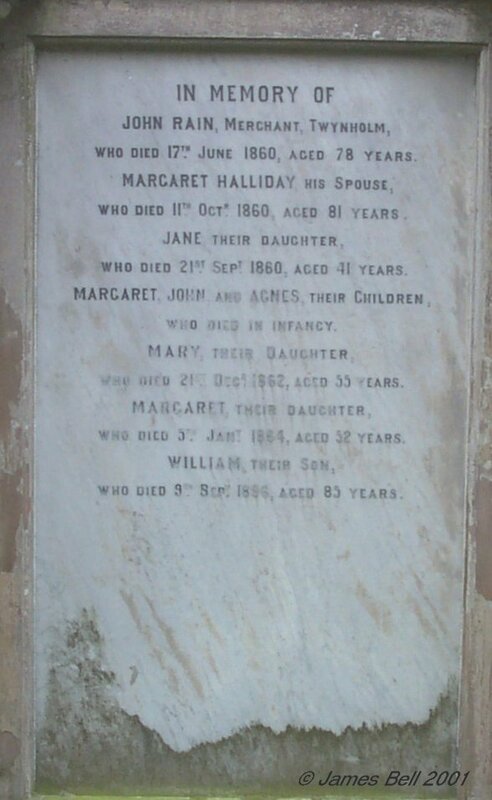 Margaret Halliday his spouse, who died 11th Oct'r 1860, aged 81 years. Jane their daughter, who died 21st Sept 1860, aged 41 years. Margaret, John and Agnes their children who died in infancy. Mary their daughter, who died 21st Dec'r 1862, aged 55 years. Margaret their daughter, who died 5th Jan'y 1864, aged 52 years. William their son, who died 9th Sept 1896, aged 85 years. 014 In loving memory of Rosemary Beatrice Sawford,, who died at Largs, 9th Dec 1915, aged 11 months. That she might longer stay. 015 Erected by William Houston to the memory of Margaret McCulloch, his spouse, who died at High Cumpston, 3rd Jan 1861, aged 35 years. Also Robert their son, who died at Barharrow, Parish of Borgue, 13th August 1846, aged 3 years. Also Alexander their son, who died at Ingleston, 7th May 1860, aged 25 years. Also Samuel his son, who died at High Cumpstone, Nov'r 1st 1863, aged 18 years. 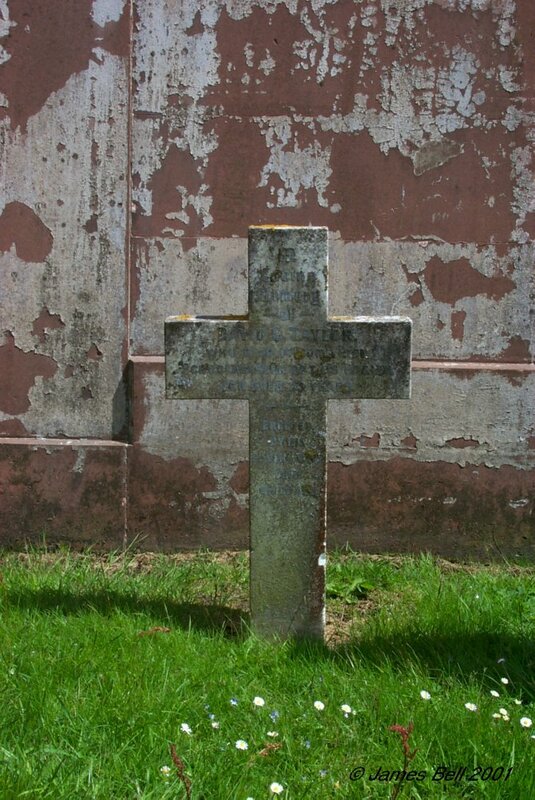 Also Archibald his son, who died at High Cumpstone, Nov'r 18th 1863 aged 25 years. Also John his son, who died on the passage to Queensland, June 10th 1864, aged 20 years. Also William Gordon his son, who died at High Cumpstone, April 3rd 1866, aged 26 years. 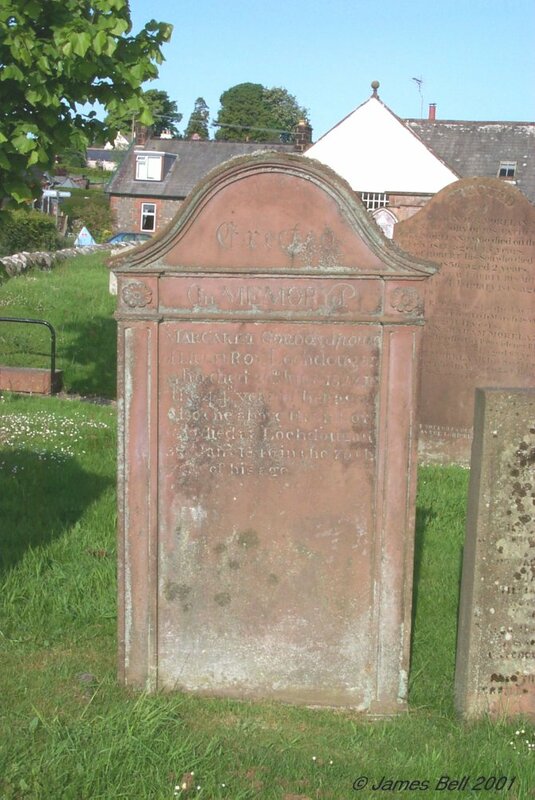 The said William Houston, died at Twynholm Village, April 3rd 1888, aged 76 years. 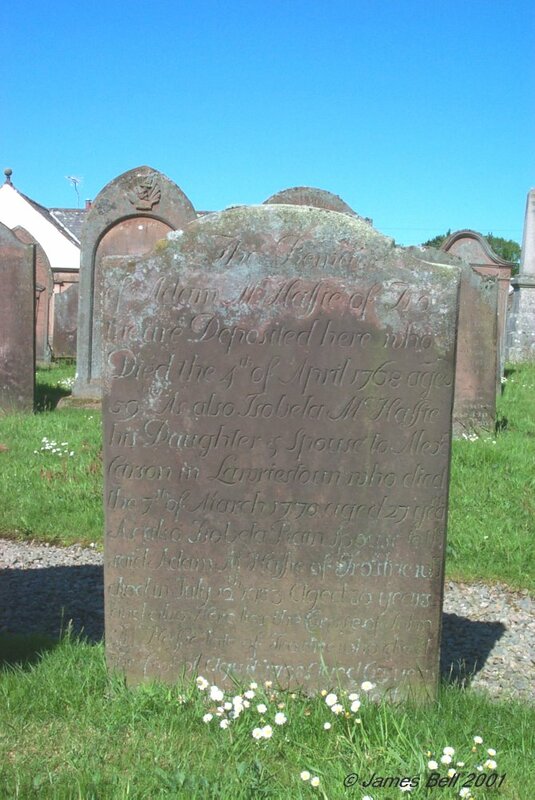 Agnes Herries, wife of the above William Houston, died at Bank of Bishopton, 26th Oct'r 1906 aged 76 years. 016 In memory of Agnes Beattie, wife of Hugh Woods, now at Kempleton, who died at Barlochan, 27th Jan 1860, aged 29 years. Katherine their daughter, died at Liverpool 14th July 1886, aged 34 years. Also his wife Margaret Heron, who died at Kempleton, 3rd March 1891, aged 47 years. Also Mary Kie her daughter, who died at Kempleton, 30th August 1877, aged 17 years. Also his son William G. Woods who died 27th April 1899, aged 47 years. Also the above Hugh Woods who died 10th April 1914, aged 86 years. Also his son Andrew B. Woods, who died in Ohio, U.S.A., 1925 aged 70 years. Also Jane Millington his daughter, who died 17th Dec'r 1926, aged 70 years. Interred at Liverpool. Also Isabella Woods, wife of Ducan Gray and grand-daughter of the above, who died 14th November 1932, aged 60 years. Also Isabella Halliday Woods, daughter of the above Hugh Woods, who died 4th July 1933, aged 80 years. Also Mary his daughter and widow of William Clark, who died 23rd May 1942, aged 83 years. 017 Erected by James Linwood in memory of his wife, Janet McClanachan, who died here on 13th Jan'y 1864, aged 61 years. Also his son Andrew, who died here on 26th Feb'y 1860, aged 21 years. And his daughter Jane who died here on 12th Oct'r 1861, aged 20 years. 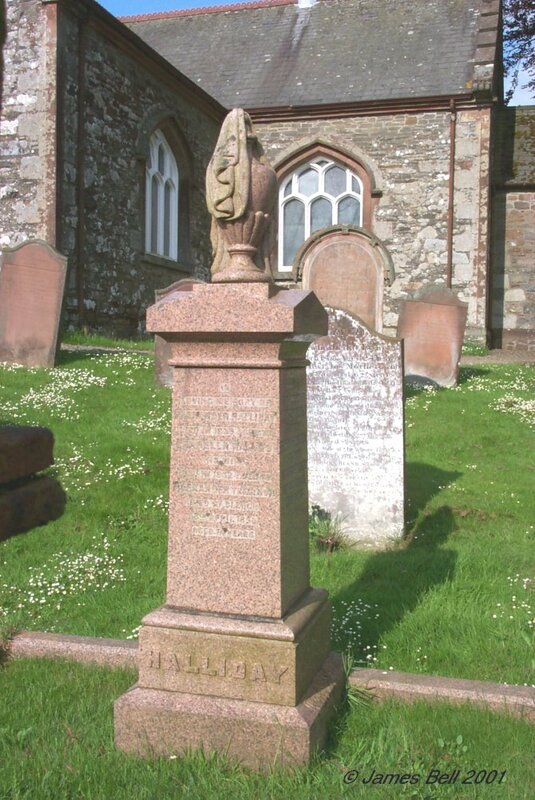 Also his son George who died on Ramsay, Isle of Man, on 31st Jan'y 1865 aged 22 years. Also his son John who died at Clifton, Ontario, 22nd August 1887, aged 36 years. The said James Linwood, died at Twynholm Village, 10th Oct 1884 aged 93 years. 018 Erected by Hugh Orr in memory of his wife, Janet Lenox, who died at Glen Kirkmabreck on 17th Nov 1862, aged 33 years. Also of his son Andrew, who died at Inglestone, 8th June 1860, aged 3 years. Also Mary McCoskrie his wife, who died at Gatehouse of Fleet 25th September 18-9 aged -- years. Also the above Hugh Orr, who died at Underwood, 20th July 1910, in his 84th year. 019 Erected by William Hannah in memory of his daughter Agnes, who died at Inglestone, 3rd Dec 1865, aged 22 years. 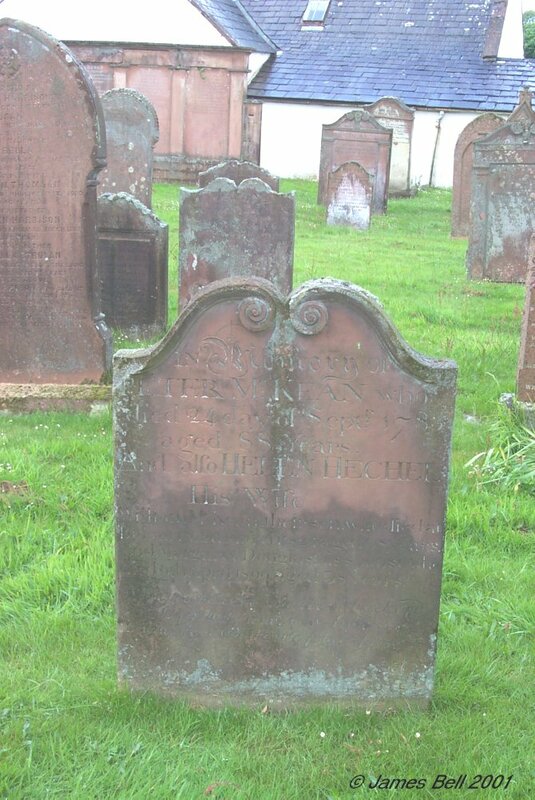 Also Janet McGhie, his wife who died at Doon, Twynholm, 24th March 1893, aged 70 years. 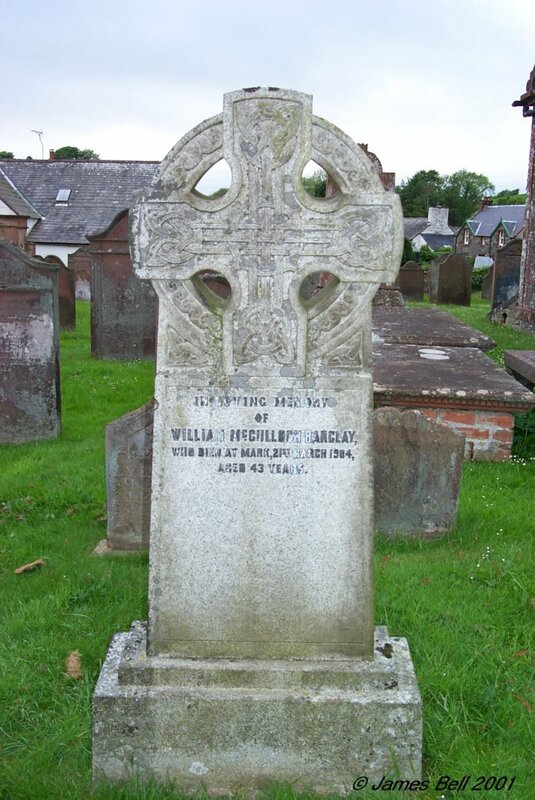 Also the above William Hannah, who died at Kirkcudbright, 24th August 1906, aged 89 years. 020 In memory of John Wallace at Kempleton, who died 27th November 1887, aged 35 years. Agnes his daughter, died 12th January 1891, aged 2 years and 10 months. 021 In memory of Agnes McCaul, wife of Alexander Brown, who died at Twynholm Village on the 9th January 1859, aged 72 years. Also the above Alexander Brown, who died at Twyhholm Village on the 5th April 1863, aged 81 years. Also Anthony Brown, their grandson, son of Anthony Brown, who died on the 19th of June 1861, aged 10 months. Also John Brown, son of the above Alexander Brown and Agnes McCaul, who died 30th December 1865, aged 15 years. Also Ann Brown their daughter, who died in London on the 7th February 1872, aged 58 years, and is buried in Nunhead Cemetery. Also Thomas Brown, son of the above Alexander Brown and Agnes McCaul, who died in Australia on the 13th March 1873, aged 46 years. Also Anthony Brown, son of the above Alexander Brown and Agnes McCaul, who died in Liverpool, 4th July 1875, aged 63 years, and was buried in Anfield Cemetery. 022 Sacred to the memory of William, eldest son of James Muir, lately Farmer, Muirhead, Twynholm, who died at Corsock, Colvend, the 14th Sept 1858, aged 22 years. Also James Muir his father ,who died at Crown Hotel, Laurieston, the 16th Jan'y 1876 in the 62nd year of his age. Also Henrietta Ireland, widow of the above James Muir, who died at Laurieston, 28th Sept 1894, aged 80 years. Thy will be done. The Lord gave & the Lord taketh away. In loving memory of James Gordon, who died at Miefield, 5th May 1915, aged 42 years. Also his daughter Margaret Jane, who died at Landlands, 28th March 1922, aged 14 years. 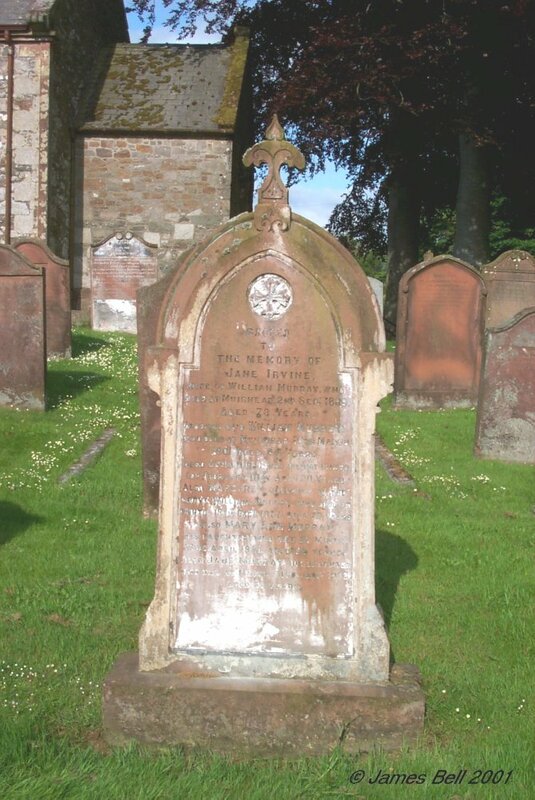 Also Margaret Jane Leith, his wife who died at Annan, 28th Feb'y 1941, aged 63 years. 024 In memory of Alexander Gillone who died at Barley Mill, Gatehouse, 16th Sept. 1860, aged 50 years. Also Janet his daughter, who died at Kempleton Mill, 9th May 1858, aged 9 years. Also Mary Shannon, his wife, who died at Birtwistle Street, Gatehouse, 2nd September 1908, aged 78 years. 025 Erected to the memory of Nicholas McAdam, wife of John McClure, who died at Hilltop, Twynholm, 17th February 1854, aged 45 years. Also John McClure her son, who died 13th February 1872, aged 33 years. 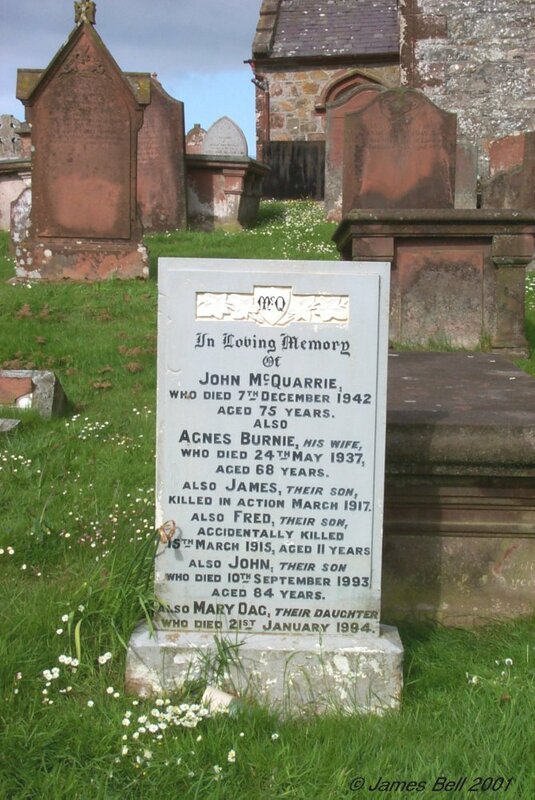 Also John McClure, her husband, who died 8th January 1875, aged 70 years. Also Robert McClure their son, who died 5th April 1889, aged 57 years, and buried at Gordonsville, Virginia, U.S.A. Also David McClure their son, who died 16th August 1903 aged 51 years. 026 In loving memory of James Lidderdale, who died 14th March 1858, aged 35 years. Also Janet Caldow, his wife, who died 3rd June 1890, aged 70 years. And Laurie their son, who died in infancy. Also Elizabeth Lidderdale, wife of Thomas Peacock, who died October 1926, aged 71 years. Also the above Thomas Peacock, who died 14th January 1930, aged 72 years. 027 Sacred to the memory of Robert Comrie of Largs, who died there on the 23rd January 1868, aged 58 years. 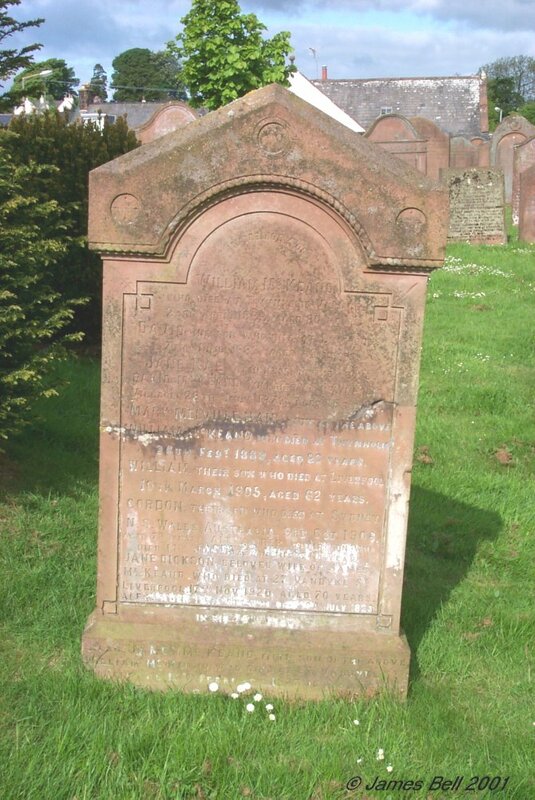 Also of Margaret McNeillie his wife, who died at Dumfries on the 15th July 1895, aged 62 years. 028 In memory of Thomas Phillips who died on 20th December 1895, aged 19 years. 029 Sacred to the memory of Margaret Bland, wife of James Houston, who died at Twynholm Village, 15th January 1865, aged 43 years. Also the above James Houston, who died at the same place, 25th April 1883, aged 73 years. Not lost but gone before. Also Mary, daughter of the above, who died at the same place, 10th May 1936, aged 72 years. Also James, son of the above, who died at the same place, 23rd April 1944, aged 79 years. 030 Erected in memory of John, son of James Duffy, who died at Irelandton, on the 24th December 1835, aged 14 years. Also Elizabeth Geddes, wife of James Duffy, who died at Twynholm, July 24 1868, aged 73 years. Also the above James Duffy, who died at the same place, Jan 9th 1878, aged 66 years. Also Mary Steel, wife of the above James Duffy, who died at Twynholm Village, 16th June 1887, aged 63 years. Forever in the Lord. Robert who died at Castrees on the 6th of August 1818 aged 19 years. James who died in London on the 14th of October 1833 aged 35 years. 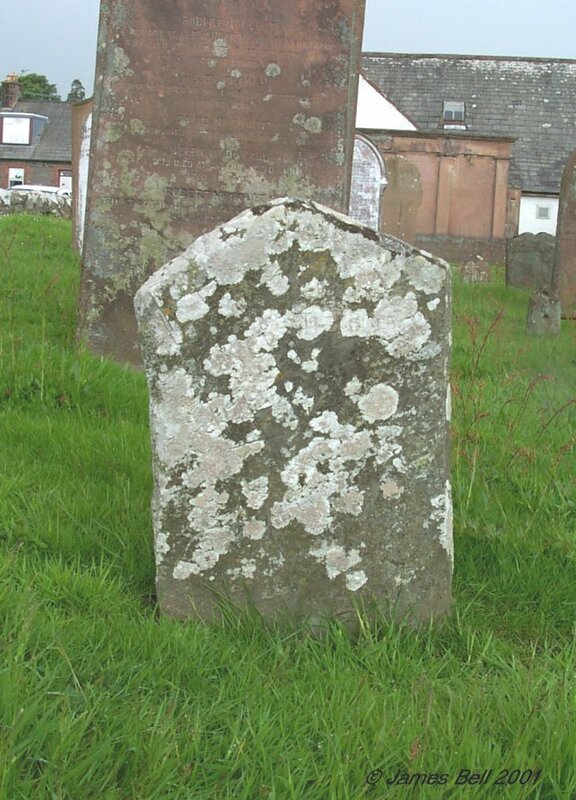 Mary who died at Twynholm Village on the 26th of Feb'y 1848 aged 33 years. John who died at Liverpool on the 17th April 1860 aged 52 years. Joseph who died in London on the 30th Jan'y 1864 aged 64 years. William who died at Derby 29th July 1868 aged 53 years. The above Lydia Carson, died at Twynholm Village, 17th July 1869, aged 91 years. 032 Erected by James L. Maxwell, Springfield, Ohio in memory of his father John Maxwell, who died 1st July 1903, aged 82. Also his mother Agnes Lindsay, who died 2nd Oct 1908, aged 81. Also his uncle David Maxwell, who died 10th Jan 1901, aged 68. 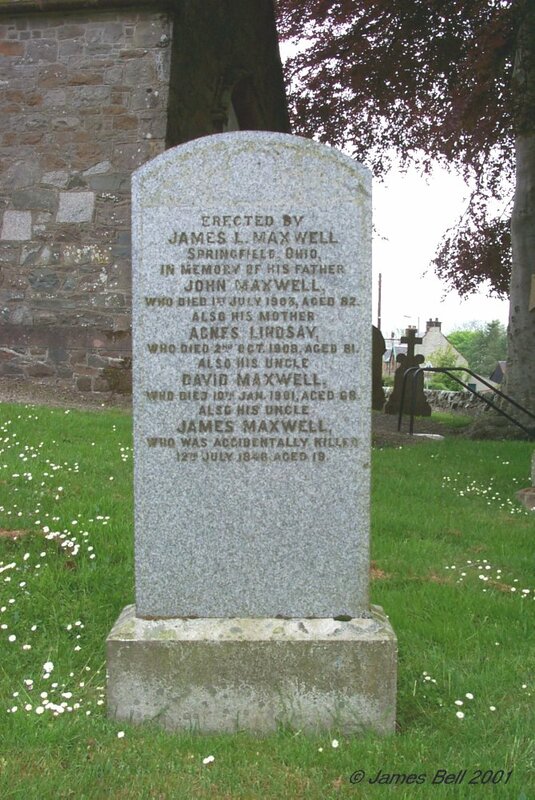 Also his uncle James Maxwell, who was accidentally killed 12th July 1848 aged 19. 033 Erected by Alexander Carter in Greenslack, Borgue, in memory of his wife Barbara McMickan, who died 6th February 1848, aged 27 years. Also Jane Thompson, his only and dearly beloved daughter, who departed this life on the 20th December 1875, aged 21 years. The star that set at early dawn, now shines in realms of love. 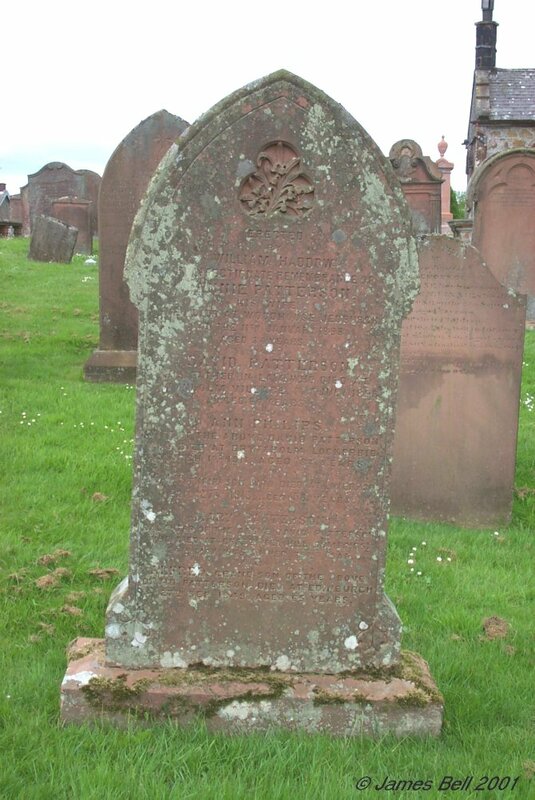 Also the above Alexander Carter, who died at the Selkirk Arms Hotel, Kirkcudbright, 11th May 1879, aged 69 years. Also Alexander Barbara Carter, his son who died at same place, 24th Oct 'r 1882, aged 33 years. 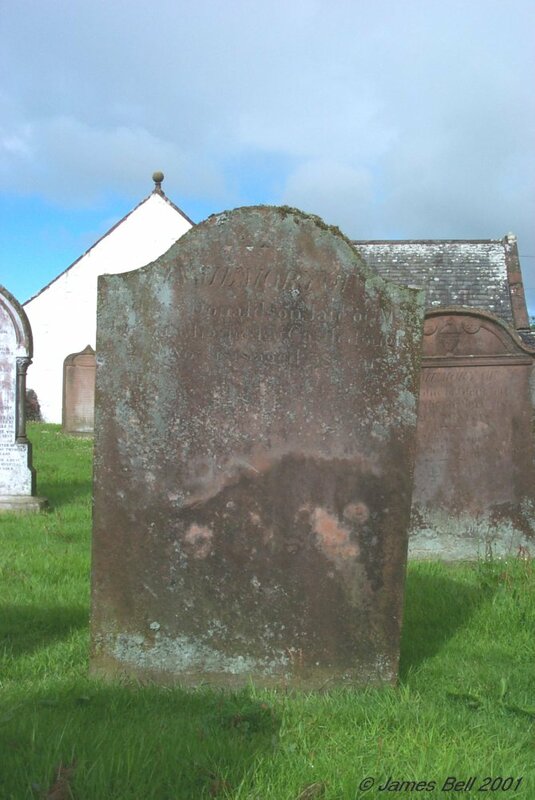 Also of Jane Davidson, wife of the above Alexander Carter, who died at Kirkcudbright, 4th July 1898, aged 65 years. 034 Also in memory of Hugh Carter, son of the said Alexander Carter, who died at Selkirk Arms Hotel, Kirkcudbright, on the 8th of June 1908, in his 50th year. Also Alexandra, daughter of the above Hugh Carter, who died 8th July 1903, aged 8 months. Also Robert Carter, of Education Office, Whitehall, fourth son of the said Alexander Carter, who died in London on the 29th of August 1913, aged 51 years. And is interred here. Also Elizabeth Currie, widow of the above Hugh Carter, who died at the Selkirk Arms Hotel, Kirkcudbright ,on the 7th October 1920, aged 58 years. Also James Carter, late of the Admiralty, London, who died at Kirkcudbright, on the 2nd April 1924, aged 64 years. Also Jean Davidson Carter, late of Star Hotel, Twynholm, and daughter of the above Hugh Carter, who died at White-Liggate, Stell, 6th October 1966, aged 64 years. Also Agnes D.H. Lamont, dear friend of the above Jean D. Carter, who died 22nd April 1978, aged 88 years. 035 Erected by Alexander Murray, in memory of William Murray, who died 1st July 1847, at Twynholm aged 60 years. 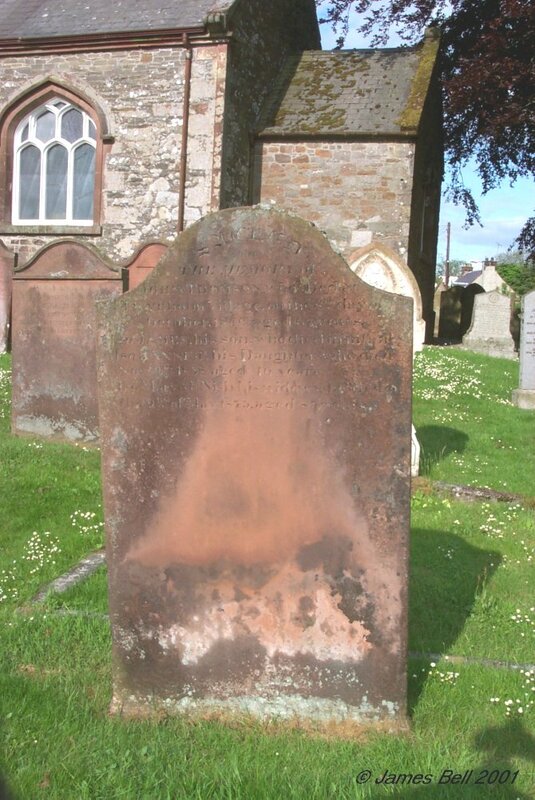 Also Jean Rain, relict of William Murray, who died at Twynholm Village, 9th June 1849, aged 53 years. 036 a. Sacred to the memory of James Murdoch, who died at Twynholm Manse on the third day of January 1848, aged 66 years. And of Margaret McBryde, who died at the same place, on the twenty seventh day of April 1848, aged 70 years. Blessed are the dead which died in the Lord. b. Sacred to the memory of Penelope Murdoch, relict of the Rev John Gordon, Minister of Twynholm, who was born 11th August 1805, and died at Kirkcudbright, 1st July 1875. 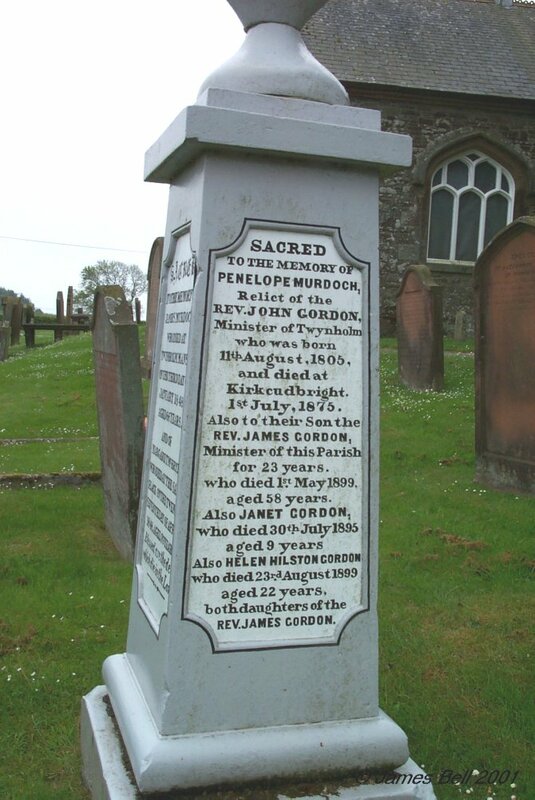 Also to their son the Rev James Gordon, Minister of this Parish for 23 years, who died 1st May 1899, aged 58 years. Also Janet Gordon, who died 30th July 1895, aged 58 years. Also Helen Hilston Gordon, who died 23rd August 1899, aged 22 years, both daughter of the Rev James Gordon. c. Sacred to the memory of the Rev'd John Gordon, minister of the parish of Twynholm, who died at Liverpool the 24th October 1854, in the 51st year of his age, and the 21st of his ministry, distinguished for his classical attainments, steady in friendship of deep but unostentatious piety and esteemed by his people, as a kind and faithful pastor. Also to the memory of Margaret Elizabeth his youngest daughter, who died at Boedelheim on the 10th February 1864, aged 17 years. d. Sacred to the memory of Helen Hilston, widow of the Rev'd James Gordon, minister Twynholm, who died and was buried at Lanark, 20th Nov 1903, aged 62 years. Also John Hilston Gordon, M.B.Ch.B., their eldest son, who died at Manchester 16th May 1908 aged 37 years. Also James Hilston Gordon, M.P.S., their younger son, who died at 'Airntully,' Underwood, 7th March 1961, aged 77 years. 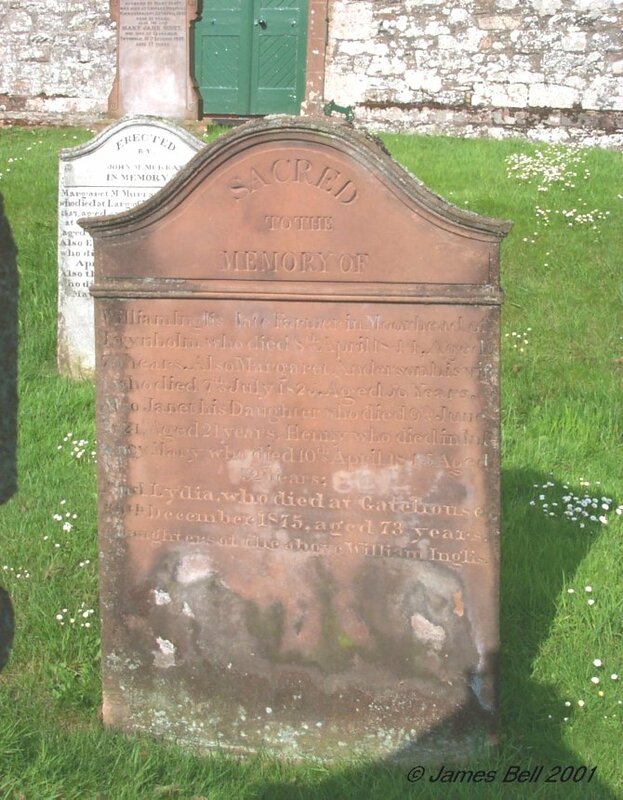 037 Sacred to the memory of George McWilliam, son of Peter McBride, Twynholm who died 21st Jan'y 1847, aged 9 years. Also the above Peter McBride, who died 25th Sept'r 1857, aged 46 years. 038 Erected by David Adams, in loving memory of Thomas Smith Adams, his son, who died ar Barlucco, Twynholm, 5th April 1906, aged 11 months. Also Agnes Smith & Nicholas Boyle who were lost by the sinking of the Lusitania on the 7th May 1915. Also Amy Adams, his grandchild, and daughter of John Adams, died 22nd Dec 1922, aged 11 months. Also Jeannie McGugan, aged 20 years, daughter-in-law of the above David Adams, died 13th June 1944, aged 73 years. Also the said David Adams who died at Whitehill Cottage, Balmaghie, 28th Sept 1947, aged 84 years. 039 Erected by Hugh Anderson in memory of his wife Isabella Sproat, who died at Twynholm Village, December the IX, MDCCCXXXIII, aged LXXI years. 040 Sacred to the memory of Nicholas Black, the dearly and deeply regretted wife of Edward McCoull, who died 22nd October 1885, aged 70 years. "Not lost but gone before." Also the above Edward McCoull, who died 7th January 1888, aged 75 years. "There remaineth a rest for the people of God". Also their son Hugh, who died at Plymouth, U.S.A., 30th April 1900. 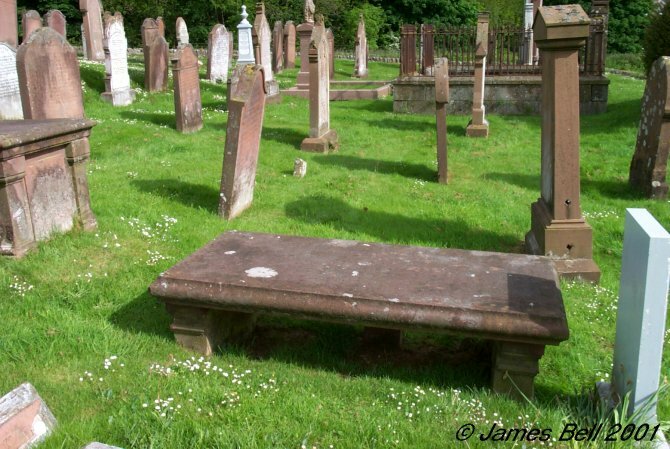 Also Edward McCoull, their nephew who died at Dumfries, 22nd March 1912, in his 75th year, and interred here. 041 Erected by Edward McCoul, their grandson in memory of John McCoul, who died at Twynholm Village, 10th July 1847, aged 75 years. Also Margaret Johnston, his wife, who died 1st May 1846, aged 64 years. 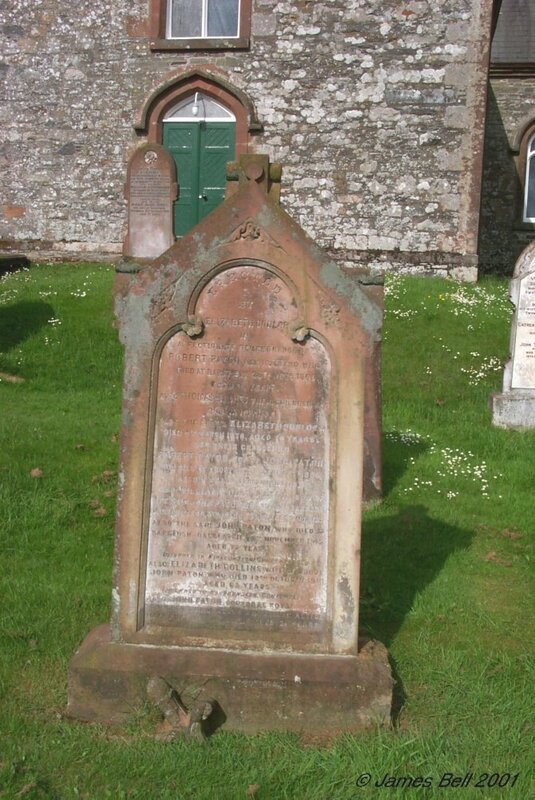 Also Margaret, their daughter, who died at Kirkcudbright, 12th March 1891, aged 82 years. 042 Erected by Thomas McCoul, in memory of Elizabeth Burnie, his wife, who died at Kirkcudbright, 18th Jan'y 1856, aged 37 years. Also his sons, Thomas who died 22nd Sept 1847, aged 4 years; Thomas who died 9th Nov'r 1850, aged 3 years; John who died 22nd Dec'r 1853, aged 8 years; And Alexander who died 4th Feb'y 1854, aged 4 years. Also the above Thomas McCoul, who died at Fish-house, Dec'r 27th 1873, aged 59 years. 043 In loving memory of Dorothy, infant daughter of William and Mary Drummond, who died at Twynholm, 7th March 1913. Also the above William S. Drummond, husband of Mary Scott, who died at Cottage Hospital, Kirkcudbright, 23rd April 1935, aged 51 years. Also the said Mary Jane Scott, who died at Glenairlie, Twynholm, 19th October 1955, aged 77 years. 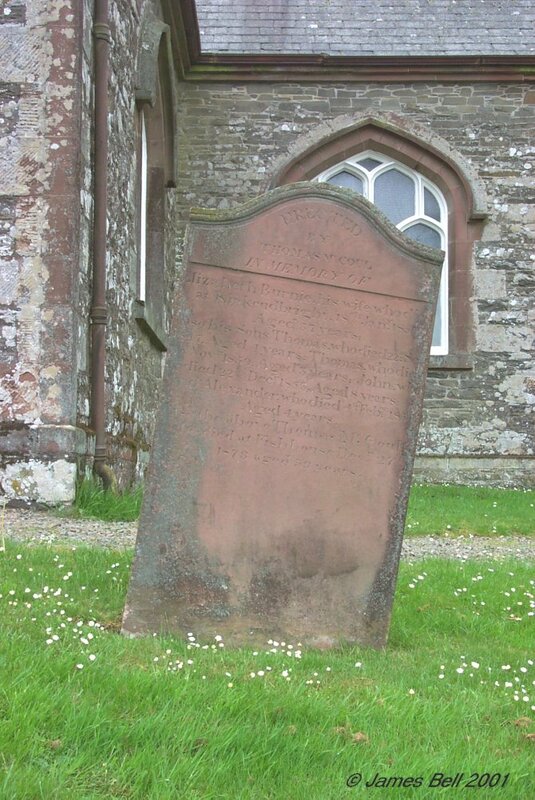 044 Erected to the memory of Robert McNish, who died in Old Miln of Twynholm, April 13th 1793, aged 70 years. And Janet Kissock, his spouse, who died -- June 1780, aged 59. Also David McNish their son, who died July 1-, 1793, aged 40 years. 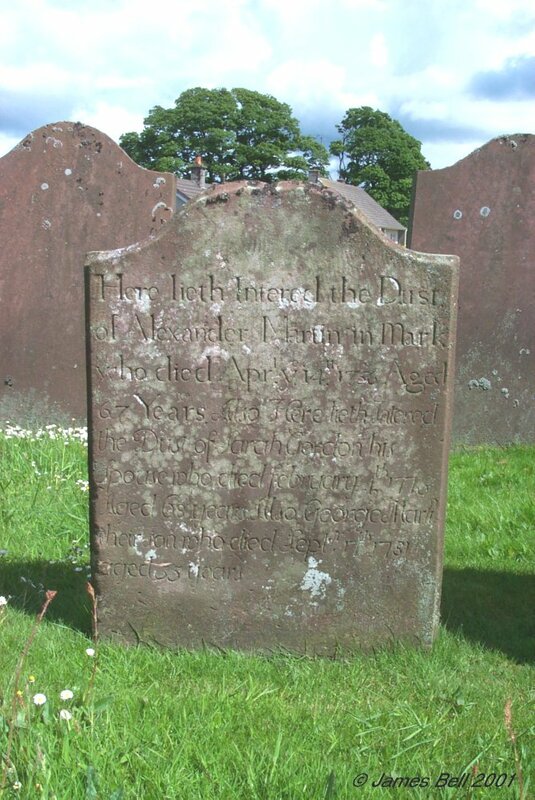 Also David McNish, son of James McNish in Old Miln of Twynholm, who died August 6 1790, aged 1 month. Also the said James McNish who died -- August 1797 years. Much regretted by all who knew them. 045 Flat stone, which does not carry an inscription. 046 (Upright Stone) In memory of Hugh McConnel, mason, who died 23rd Dec'r 1816, aged 74 years. 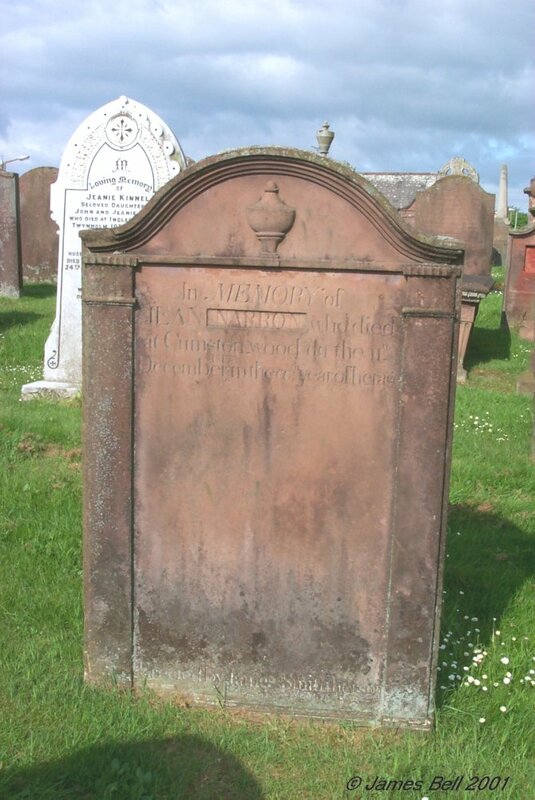 Also his spouse Jannet McNish, died 10th March 1829, aged 82 years. Also his son David, died June 1811. 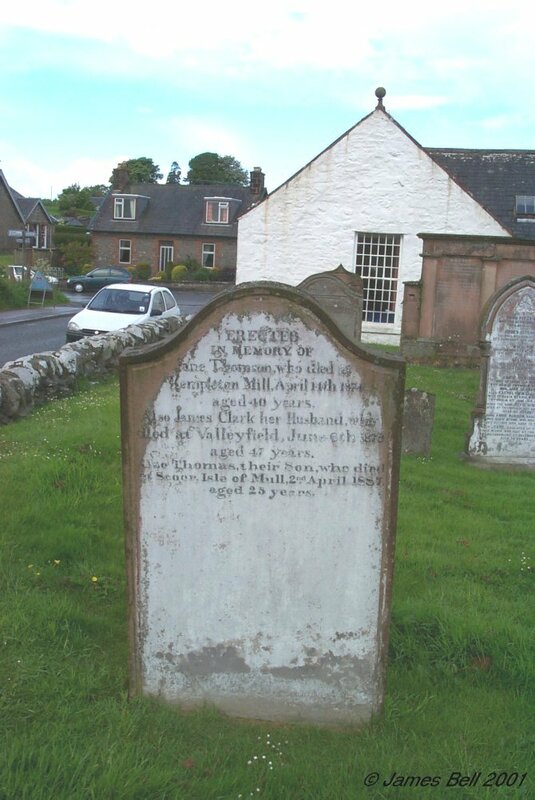 Also Grace McConnel who died at Twynholm Village, 10th Nov'r 1859. 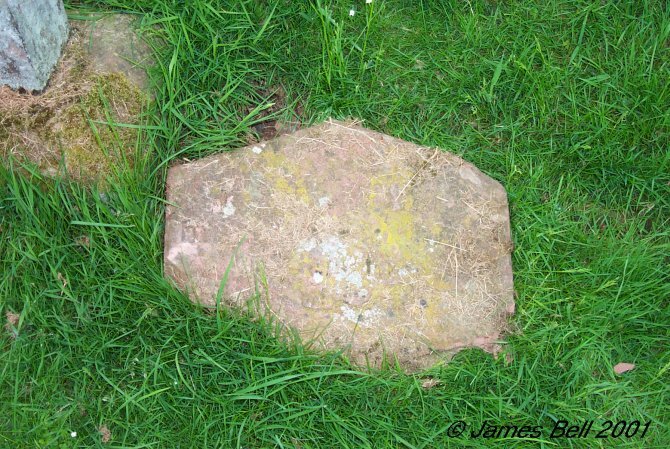 047 Underneath this stone lies the remains of Mary McGhie, spouse to Robert McMillan of Barwhinnock, who died November 1752, aged 42 years. 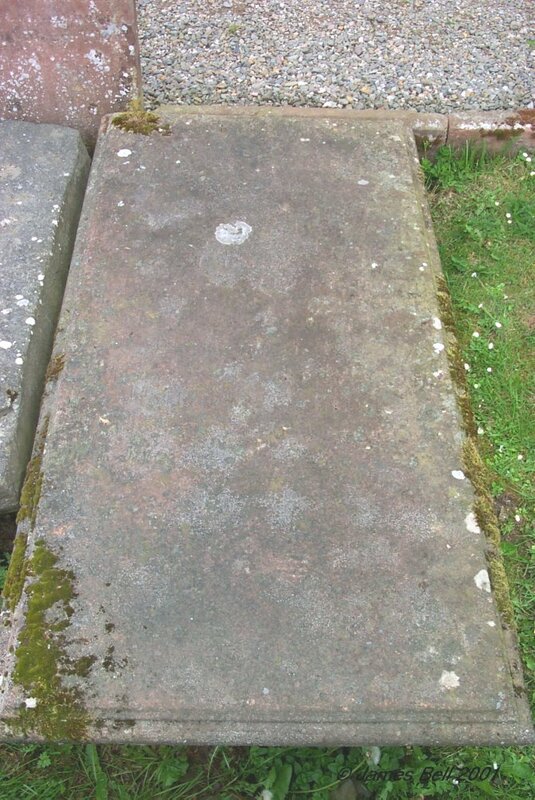 Also here lies the remains of Robert McMillan of Barwhinnock, who died 24th March 1785, aged 90 years. 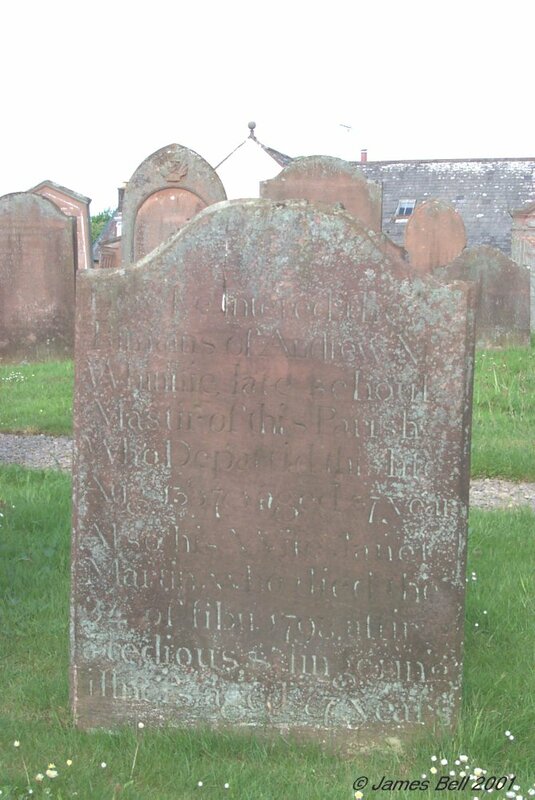 Also of their son James McMillan, Esq'r, of Barwhinnock, who died 9th December 1809, aged 63 years. 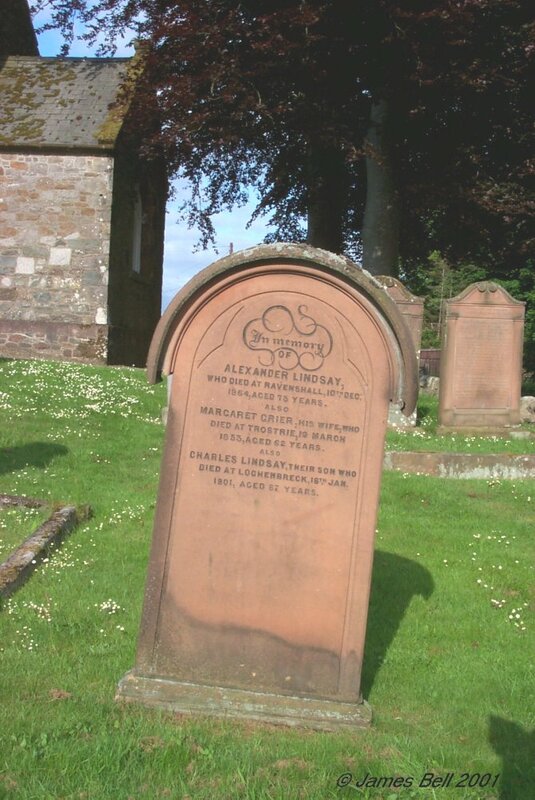 Also his relict Margaret Laurie, who died 21st January 1821, aged 80 years. James McMillan, their son, who died 16th Sept. 1812. 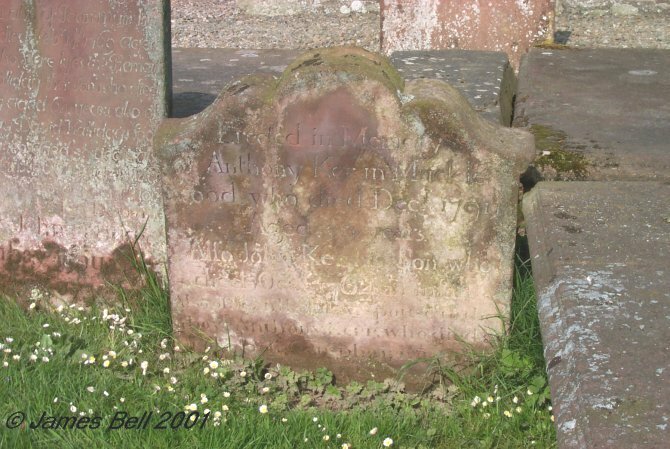 Also to the memory of Margaret McMillan, second daughter of James McMillan of Barwhinnock, who died 11th Oct'r 1861 aged 81 years. Remember man that thou must die. 049 Erected by Esther Janet Milligan in memory of her husband Rev John Milligan, A.M. for 20 years minister of this Parish, born 20th May 1810, died 16th June 1875. The said Esther Janet Milligan, died 8th Oct 1879, aged 68. 050 In memory of Alex'r Shannon who died at Howford, 9th Dec'r 1807, aged 70 years. 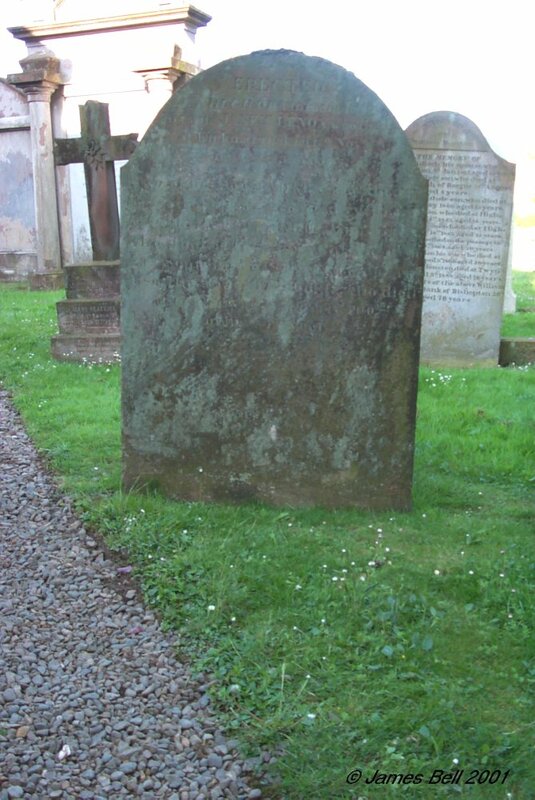 Also Will'm, who died 8th Aug 1766, aged one month. Also Janet his daughter, who died 6th Nov'r 1786, aged 14 years. 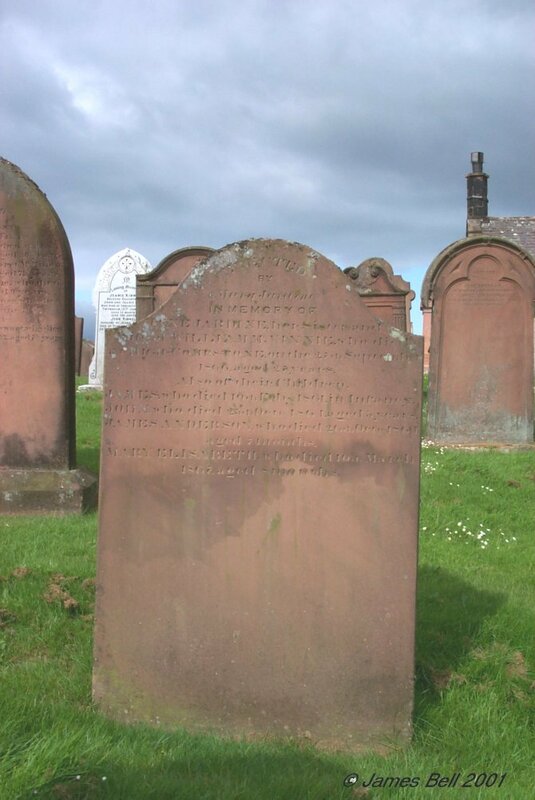 Also of Agnes McGuffie, his spouse, who died 16th April 1821, aged 79 years. 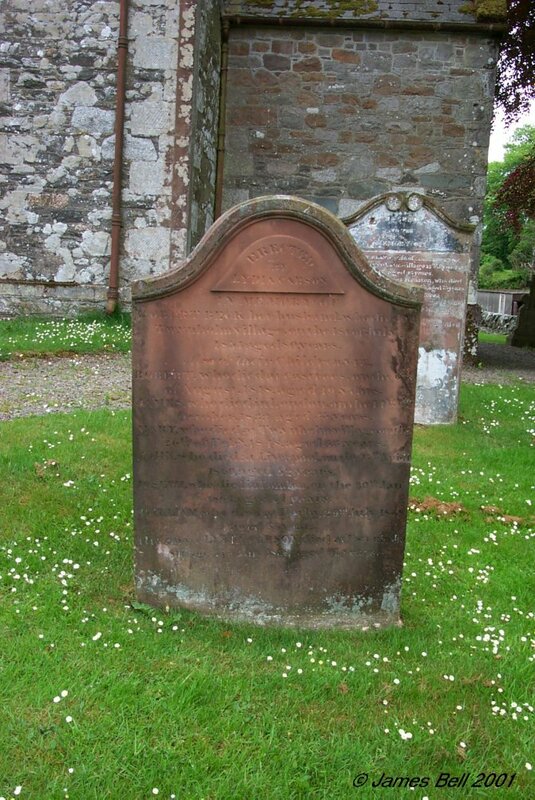 Also Janet Thomson, spouse to David Shannon, who died 4th March 1835, aged 48 years. 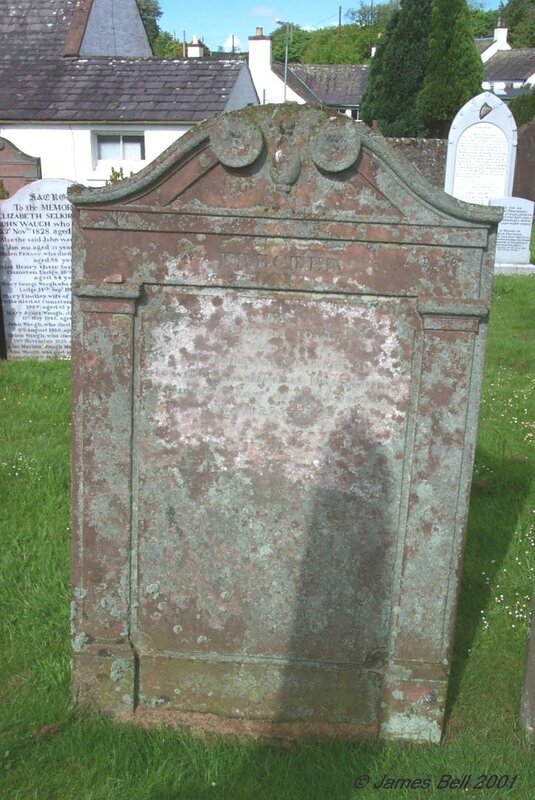 And his son John Shannon of Barnolleys, died 9th April 1848, aged 82 years. Jean Shannon his daughter, who died 2d April 1857, aged 83 years. 051 The is a small stone with an early looking simple inscription. 052 Erected by John McMinn in memory of his wife Agnes Affleck, who died at Twynholm Village, 14th Jan 1888, aged 29 years. Mary McBryde, widow of Alexander McMinn, who died at Twynholm, 21st August 1909, aged 88 years. Also the above John McMinn, who died at Twynholm, 27th January 1933, aged 76 years. Also Agnes, who died at Twynholm, 7th February 1939, aged 80 years. Also Alexander McMinn, only son of the above John McMinn and Agnes Affleck, who died 4th Dec 1939, aged 53 years. 054 In memory of Margaret McCulloch, wife of William Barclay, who died 18th Oct'r 1860, at Mark in Twynholm, aged 34 years. For trouble finds work for itself. Also James Barclay who died at Mark, 2nd April 1878, aged 18 years. 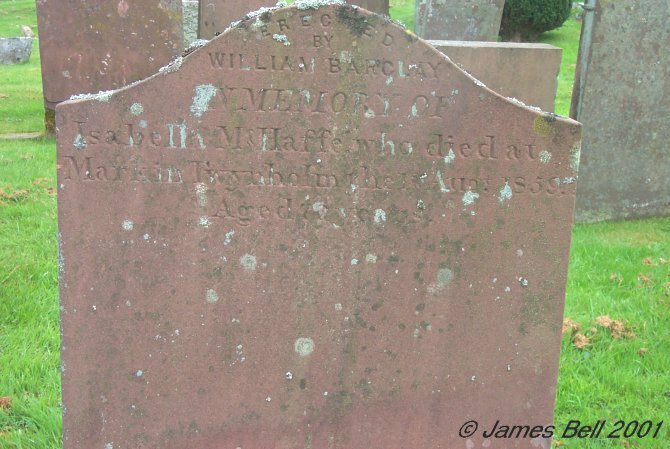 Also the said William Barclay, who died at Mark, Twynholm 7th June 1884, in his 67th year. In hope of eternal life which God that cannot lie, promised before the world began. Also Elizabeth Cleland, widow of the said William Barclay, who died at Culgaigrie, Twynholm 24th July 1905, aged 76 years. And John Cleland Barclay, their son, who died at Culcaigrie, 24th September 1912, aged 41 years. 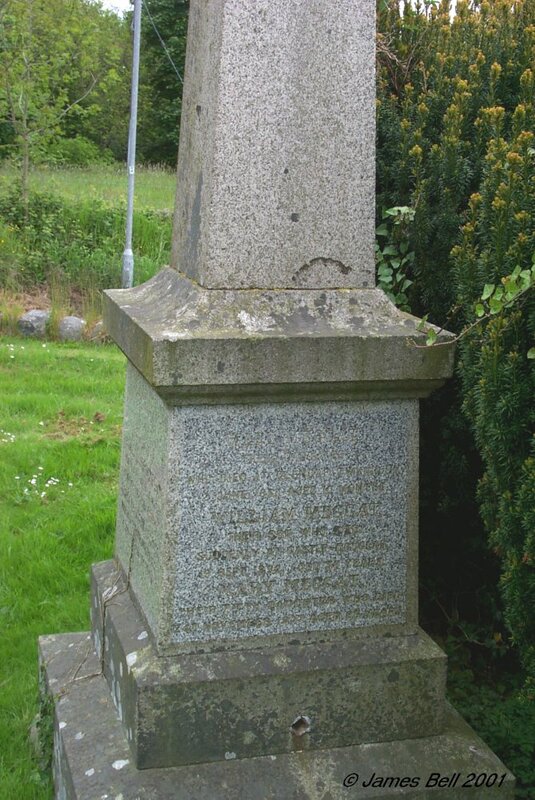 Reverse - Erected by William Barclay in memory of Isabella McHaffe, who died at Mark in Twynholm, the 1st Aug'st 1859, aged 70 years. 055 Erected by Alexander Moreland in memory of his father, John Moreland, who died on the 14th of Feb 1815, aged 45 years. Also of Robert, his son, who died on the 6th of Oct 1836, aged 2 years. Also Jannet McCourty, his mother, who died 10th January 1848, aged 80 years. 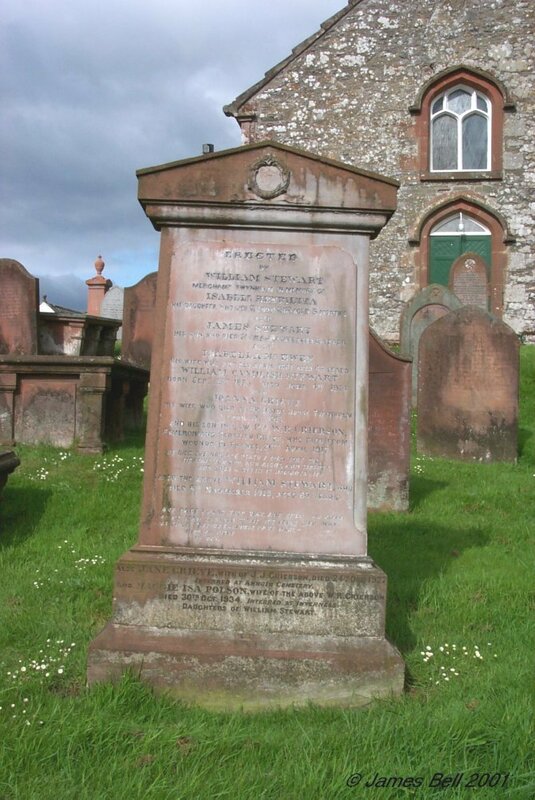 Also the erector, who died at Pough Keepsie, America, 17th March 1853, aged 41 years. Also Helen Graham Moreland his sister, who died at Providence, Rhode Island, 24th Nov'r 1881, aged 69 years. Also Jane Moreland his sister, who died at Twynholm Village, 25th January 1882, aged 76 years. it was the Lord his will be done. 056 In memory of Maggie Dalziel, the beloved wife of John Smith, Beith, who died at Twynholm, on 26th March 1886, aged 27 years. Isabella, daughter of Thomas McNeillie, who died at Elk-Creek, U.S.A., 28th Sep 1907, aged 21 years. Agnes McNeillie his daughter, who died 2nd March 1915, aged 24 years. Also the above Thomas McNeillie, who died 15th July 1926, aged 73 years. Also Elizabeth Sproat, his wife, who died 26th February 1932, aged 78 years. 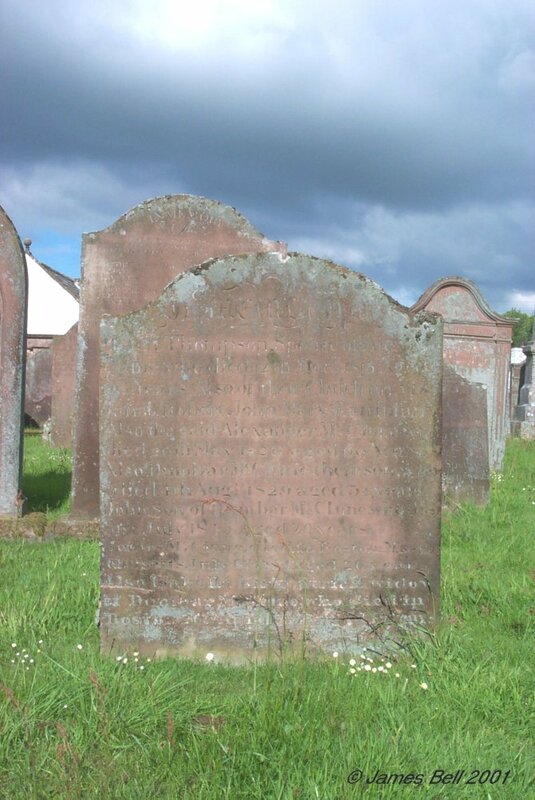 Elizabeth Sproat, wife of James Robison and mother in law of Thomas Dalziel, died 6th August 1872, aged 76 years. 057 In memory of John Roy who died 15th Dec 1817, aged 62 years. 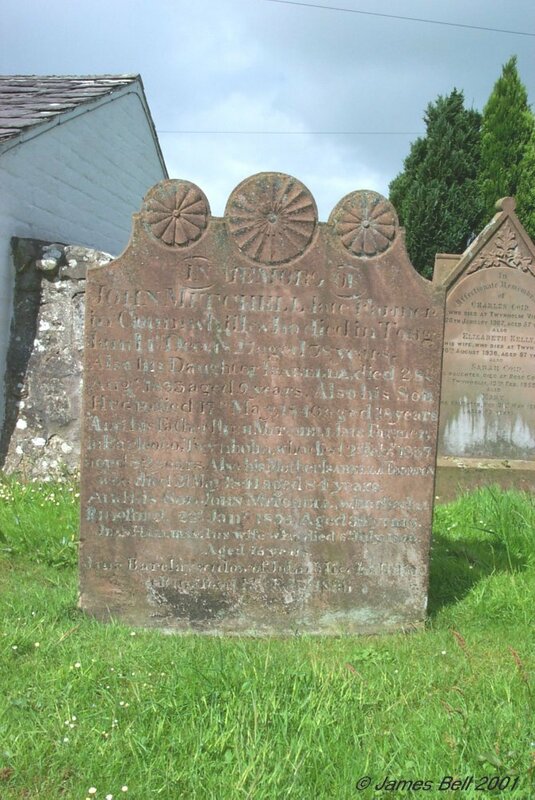 Also of children; William died 22nd Aug't 1785, aged 2 years; Grizel died 8th March 1794, aged 10 months; Catherine died 21st April 1816, aged 23 years; John died 4th Dec 'r 1836, aged 54 years. Agnes Dickson his spouse, who died 9th Nov'r 1843, aged 88 years. Agnes Dalzell wife of Thomas McClure who died 16th Feb'y 1839 aged 24 years. 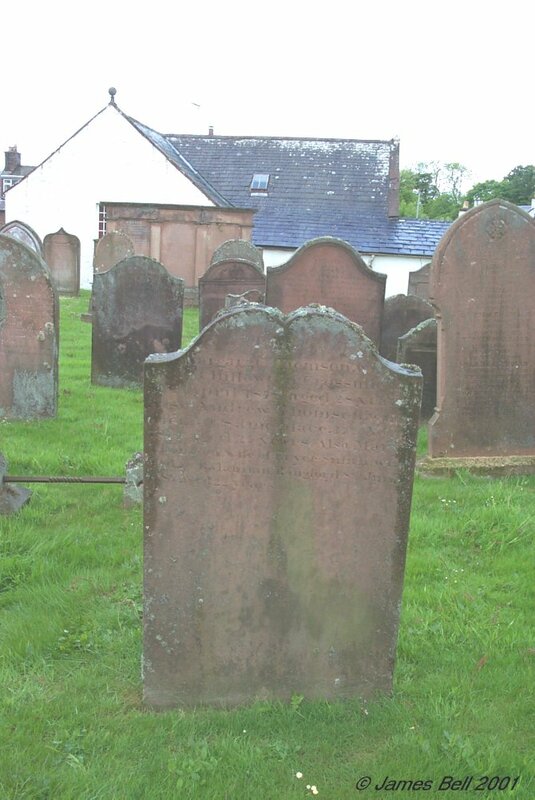 Also Margaret Roy, wife of James Dalzell, who died at Twynholm, 12th July 1864, aged 85 years. The said James Dalzell, died at same place 23rd Oct'r 1872, aged 88 years. 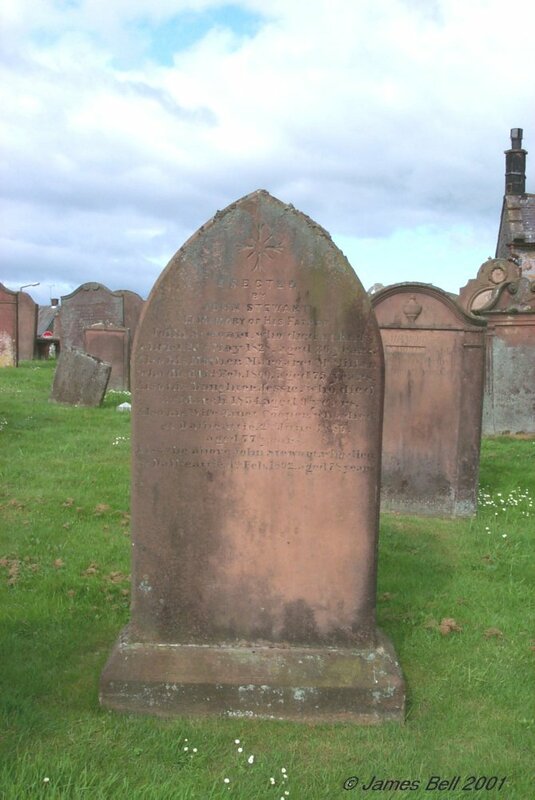 Mary Hudson, wife of James Dalziel, died 27th March 1904, aged 74. 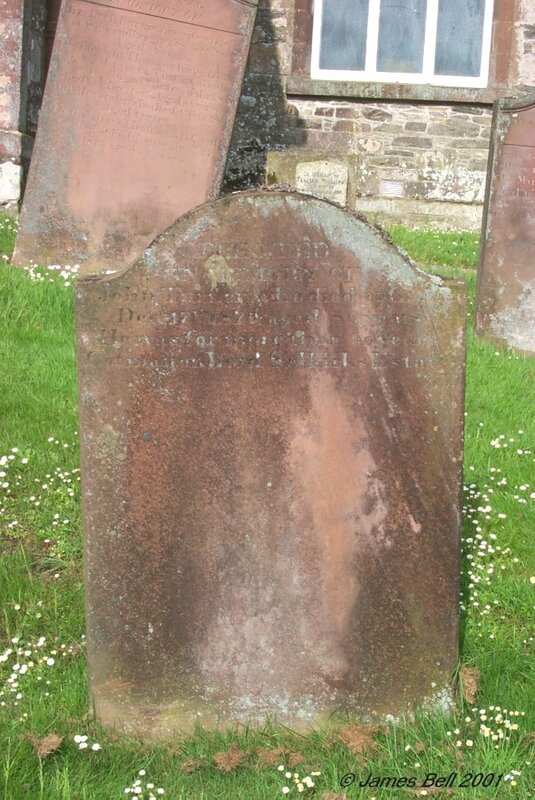 Reverse - In memory of Mary G. Dalziel, daughter of Thomas Dalziel, who died at Twynholm 16th Feb'y 1857, aged 5 years. Also his son John Dalziel, who died at Twynholm 1st March 1858, aged 11 years. Also James his son ,who died at Twynholm 4th April 1869, aged 20 years. Also Thomas G. Dalziel his son, who died at Twynholm 23rd Feb 1888, aged 21 years. 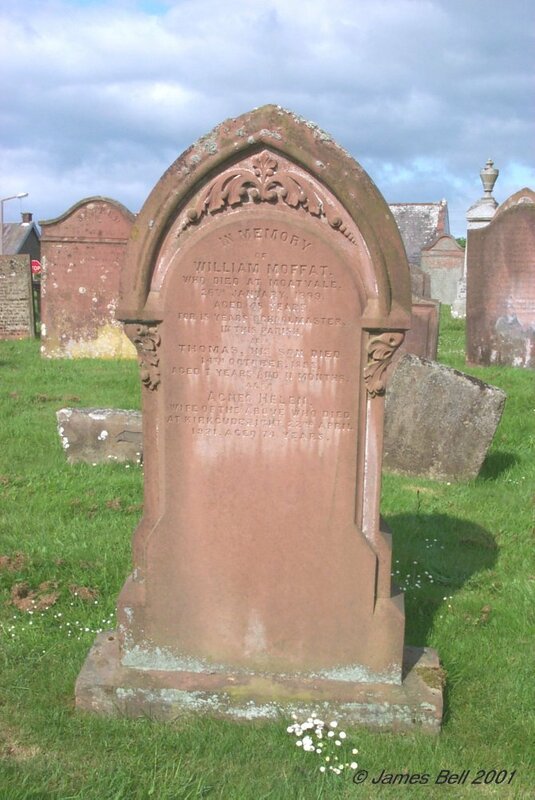 Also William Dalziel his son, who died at Twynholm 27th Mar 1892, aged 36 years. Also Agnes Helen Dalziel his daughter, who died at Twynholm 16th March 1895, aged 34 years. 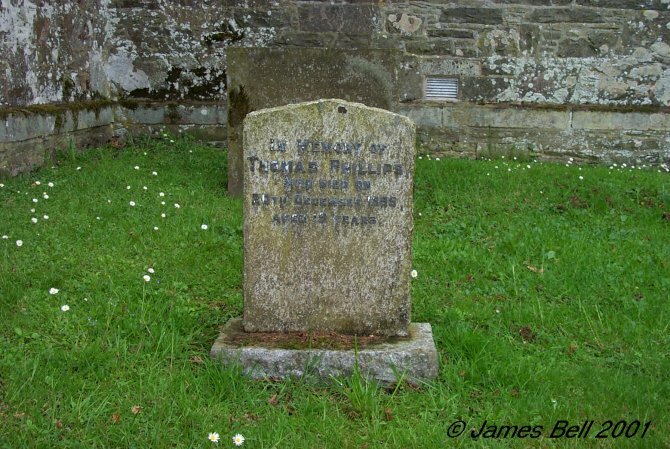 The said Thomas Dalziel died at Twynholm, 29th April 1899, aged 80 years. Also his wife Isabella Robison, who died at Twynholm 25th January 1900, aged 81 years. William Dalziel, died 16th Jan 1915, aged 80 years. 058 Erected in memory of Margaret Gordon, spouse of Hugh Roy, Lochdougan, who died 26th June 1822, in the 44th year of her age. Also the above Hugh Roy, who died at Lochdougan, 28th Jan'y 1846, in the 76th year of his age. 059 In affectionate remembrance of Marion M. Roy, younger daughter of William Roy, who died at Kirkbride, Anwoth, 29th Sep 1876, aged 13 years & 6 months. Also Janet Brown, eldest daughter and wife of W. Cairns, who died in London 6th Nov 1892, aged 33 years and was interred in Ilford Cemetery, Essex. Also Janet Brown the beloved wife of William Roy, who died at Kirkbride, Anwoth, on the 25th November 1902, in the 82nd year of her age. Also Hugh Alexander Roy, only son of William Roy, who died at Kirkbride, Gatehouse, on the 23rd February 1908, aged 47 years. Also the above William Roy, who died at Castle Douglas, 30th May 1910, aged 90. 060 In memory of William Roy in Glencroft, who died Dec'r 16th 1797, aged 78 years. Also Catherine Sproat his spouse, who died in Aug't 1762. 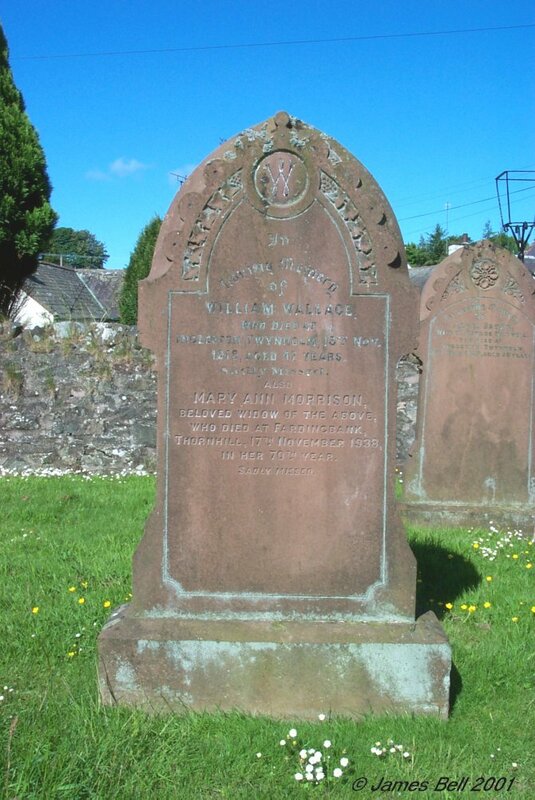 Also Janet McClure relict of the said William Roy, who died at Lochdougan, 2nd Sept'r 1830, in the 92nd year of his age. 061 In memory of Thomas Torbit who died 3rd Jan'y 1830, aged 77 years. Jane Green Gordon, his grand-daughter, who died 14th July 1832, aged 20 years. 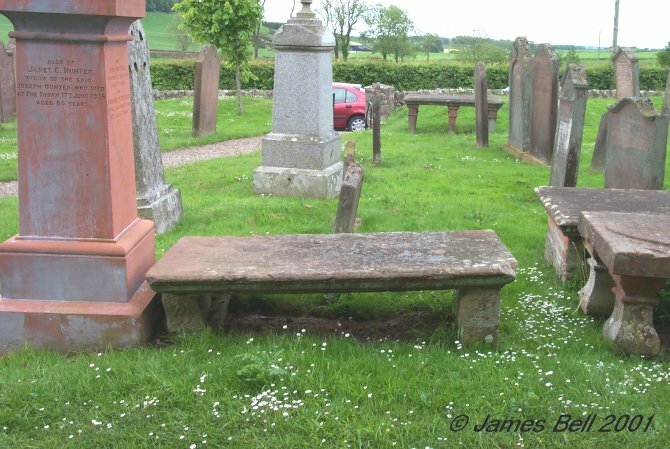 062 Here lye interred the remains of Andrew McWhinnie, late Schoolmaster of this parish, who departed this life Aug't 13th 1761, aged 37 years. Also his wife Janet Martin, who died the 14th of February 1798, after a tedious & lingering illness, aged 67 years. 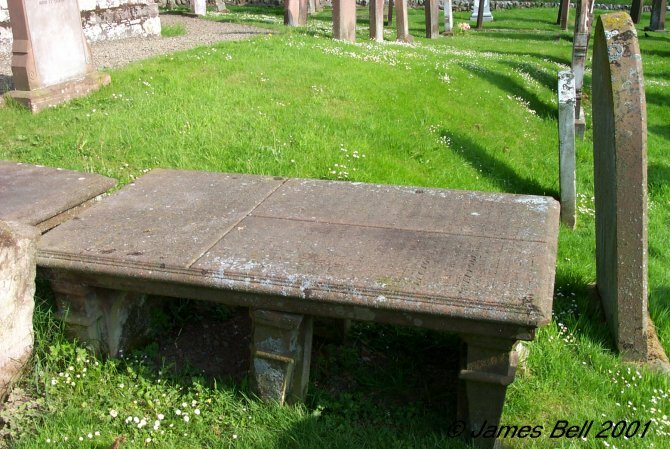 Reverse: Here lieth interred the dust of Alexander Martin in Mark, who died Apr. ye 14th 1756, aged 67 years. 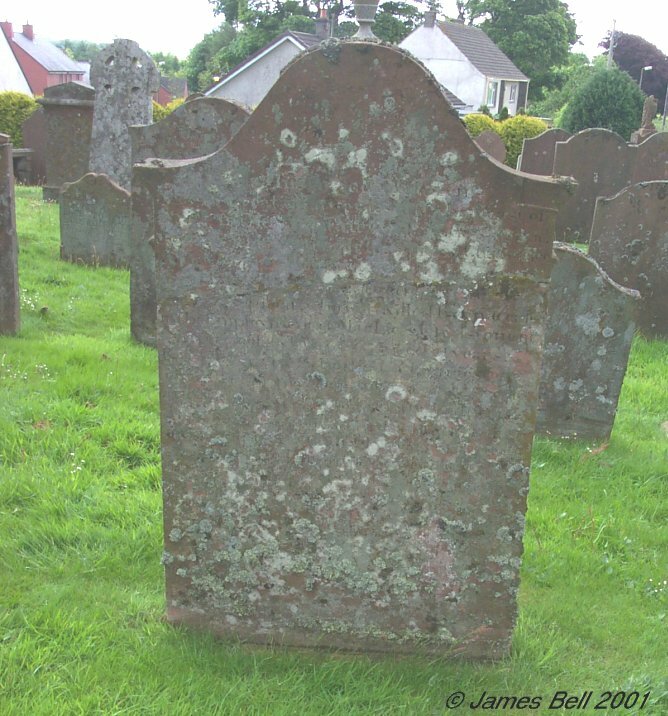 Also here lieth interred the dust of Sarah Gordon, his spouse, who died February 4th 1775, aged 68 years. Also George Martin, their son, who died Sep'r 17th 1781, aged 55 years. 063 Sacred to the memory of Ann Campbell, wife of Thomas Roy, who died at Kirkcudbright, on the 20th of January 1847, aged 49 years. 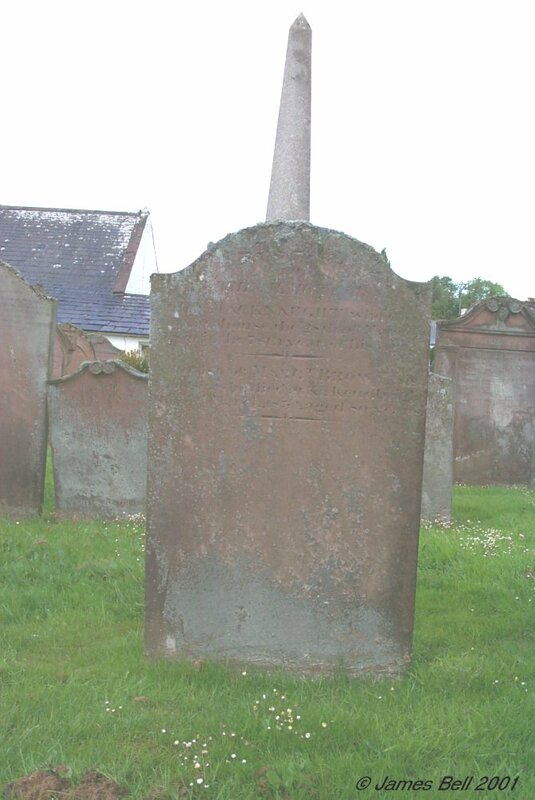 Also Thomas Roy, her spouse, who died at Kirkcudbright, 3rd October 1852, aged 65 years. 064 Sacred to the memory of Margaret McKewn, spouse to William Roy, Ringford, who died 23rd January 1829, aged 82 years. William Roy her husband, who departed this life at Ringford, on the 19th of Dec'r 1836, in the 86 year of his age. 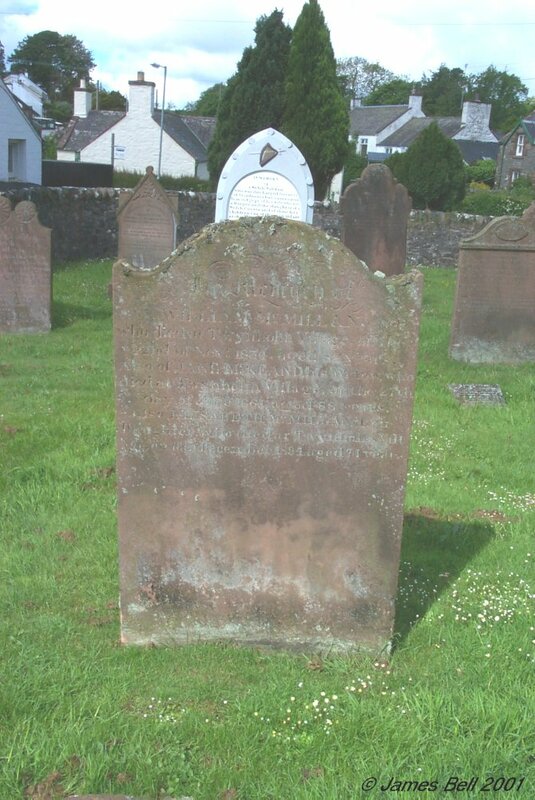 Also William Roy, eldest son of the above, who died at Kirkcudbright, 3rd Oct'r 1875, aged 90 years. Thomas Roy born 1st July 1820, died 14th Feb 1909. 065 Erected by Mary McMonnies in memory of William Houston, her husband, who died at Compston, on the 31st of Dec'r 1825, aged 46 years. Robert their son, who died same place on the 24th of June 1835, aged 23 years. William their son, who was lost at sea on the coast of North America the 26th of August 1838, aged 22 years. Margaret their daughter who died in Italy on 30th Oct'r 1856, aged 30 years. David their son, Master Mariner, aged 34 years, Ellen Kissock his spouse aged 28 years, and David their son aged 18 months, who were lost off the Cape of Good Hope, 20th April 1859. The said Mary McMonnies who died at Tongland Village, on 14th February 1863, aged 73 years. 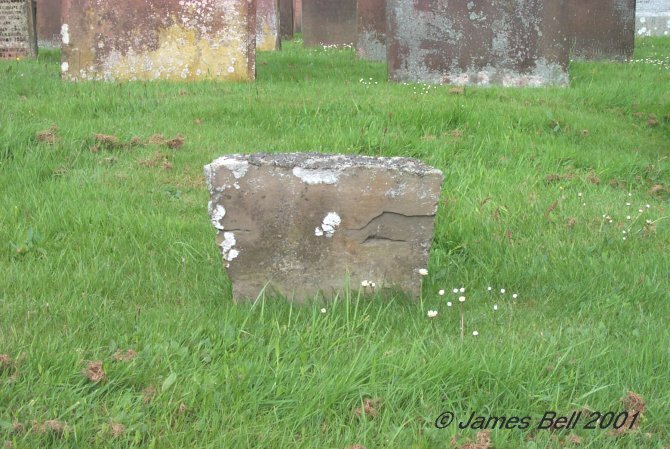 066 In memory of Janet McMonnies, daughter of Robert McMonnies in Laigh Nunton, who died May 24th 1801, aged 15 years. Also the said Robert McMonnies who died in Underwood on the 18th August 1822, aged 82 years. 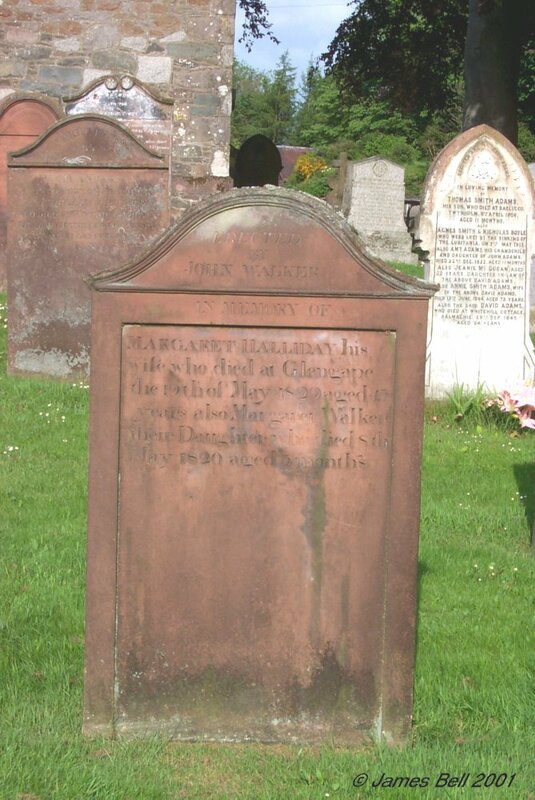 And of Mary Halliday, his wife, who died at Cumston Mains on the -- December 1837, aged 72 years. Also to the memory of William McMonnies, son of the above Robert McMonnies, who died at Underwood, 7th July 1857, aged 65 years. Also Mary Clement, wife of the said William McMonnies, who died at Underwood, 24th May 1862, aged 65 years. 067 Note: The rectangular piece in the centre of this stone is loose, and normally rests on the grass. 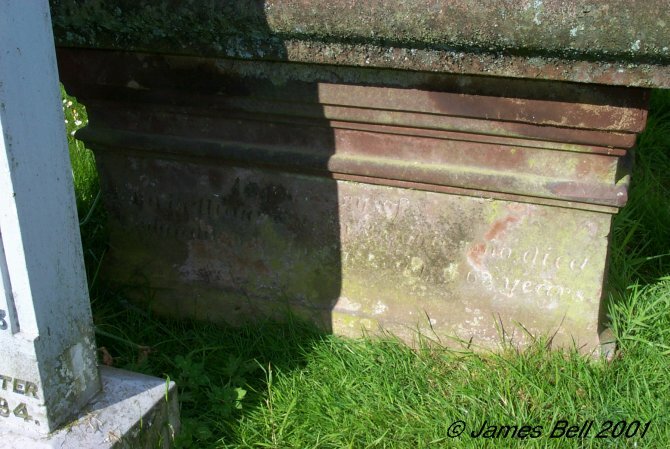 Sacred to the memory of Janet Cochran, spouse of William McMonnies in Nuntown, who died 13th Feb'y 1793, aged 77 years. 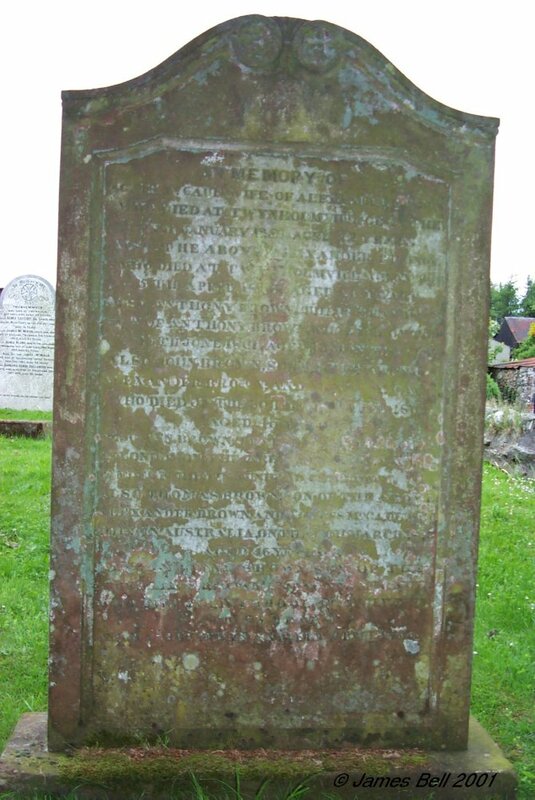 Also the said William McMonnies, who died April 8 1799, aged 92 years. 068 Here lyes Alexander Halliday of Mayfield, who departed this life March 31st 1725, aged near 70 years. Niclous Halliday, his spouse. who departed this life April 22 1749. aged 67. Also Margaret Halliday. his daughter. 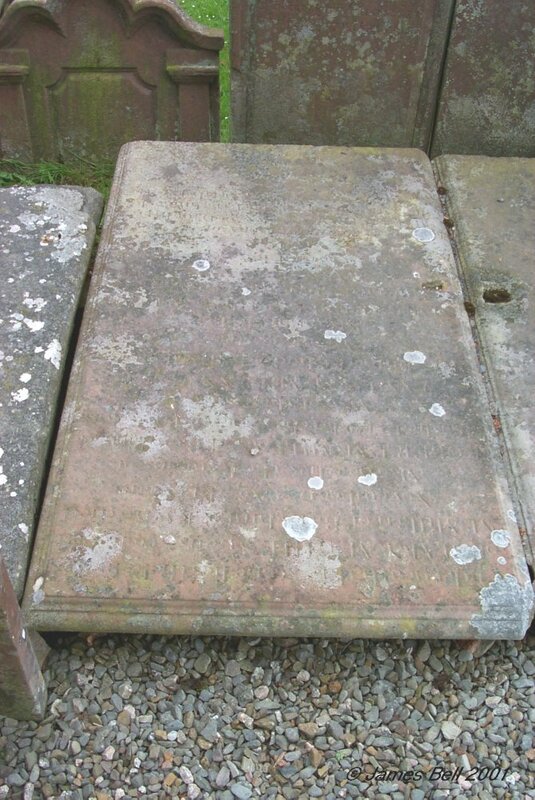 who departed this life November 17th 1752. aged 56. Also here lyse the corps of Alexander Halliday of Mayfield, his son, who departed this life Sept'r 20th 1768, aged 50 years. 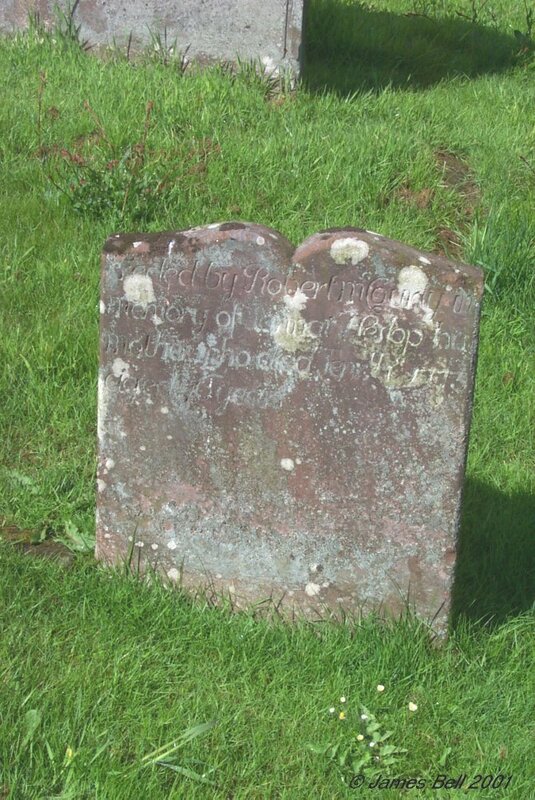 Also of Mary Halliday, daughter to Alexander Halliday younger, who departed this life March 15th 1774, aged 11 years. Also here lieth the corps of Niclous, his daughter, who died 7th of Jan'y 1776 aged 23 years. 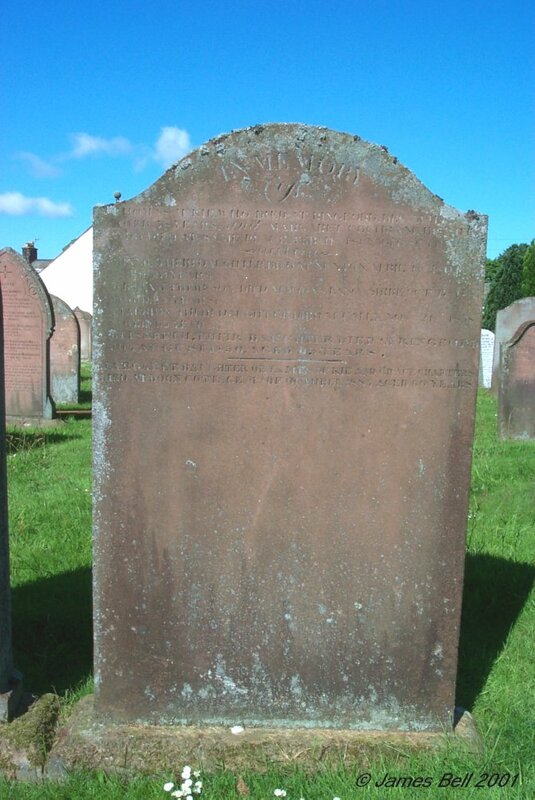 Also of Alex'r Halliday, grandson to Alex r Halliday, Junior who died Oct'r 2nd 1786, aged 11 years. 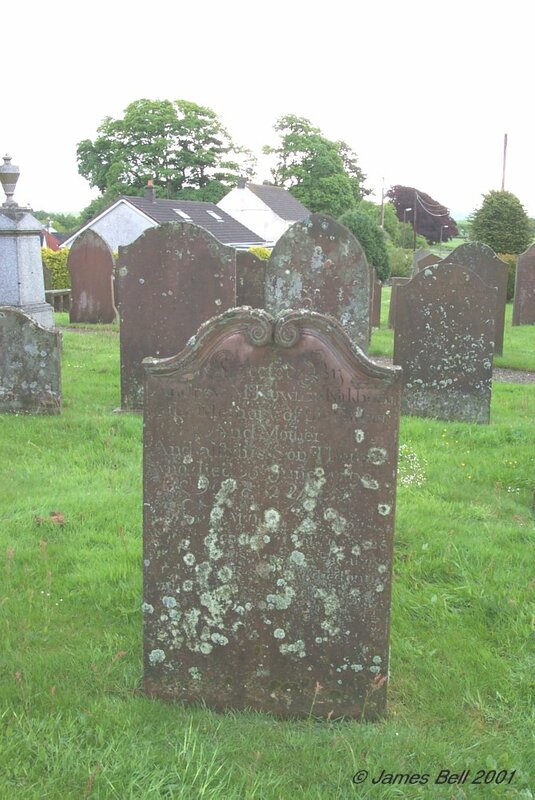 Also Mary Gordon, spouse to the late Alex'r Halliday Junior, of Mayfield, who died May 17th 1805, aged 77 years. 069 Erected by John Halliday, esquire, of Mayfield, in memory of Margaret Halliday, his wife, who died at Culcaigrie, the 18th Oct 1824, aged 72 years. Also of the said John Halliday of Mayfield who died at Mullock, 26th July 1832, aged 83 years. 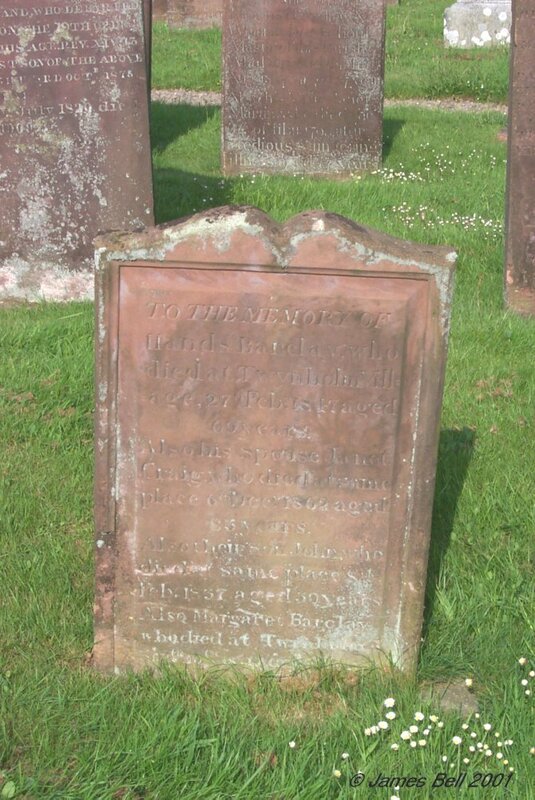 Also their daughter Isabella, spouse to Thomas McQuhir, who died at Barnshalloch, 19th Oct'r 1842, aged 34 years. 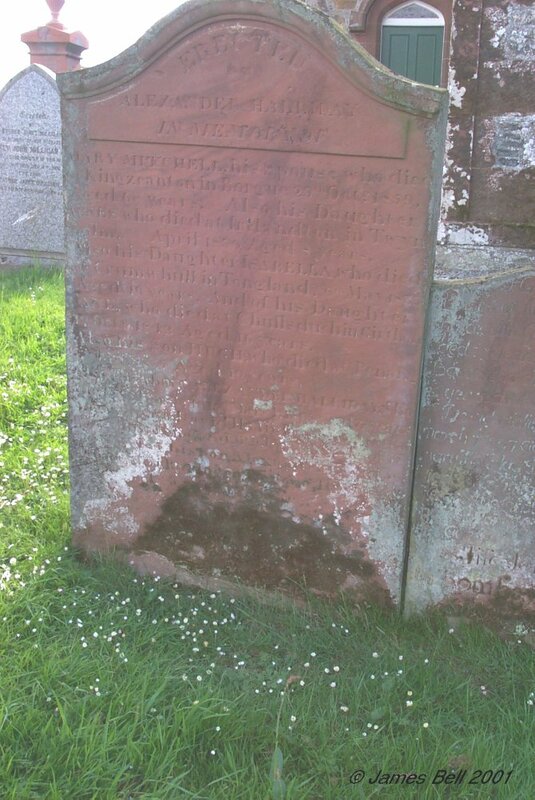 Also Alexander Halliday, their son, died at Culcaigrie July 7th 1871, aged 79 years. 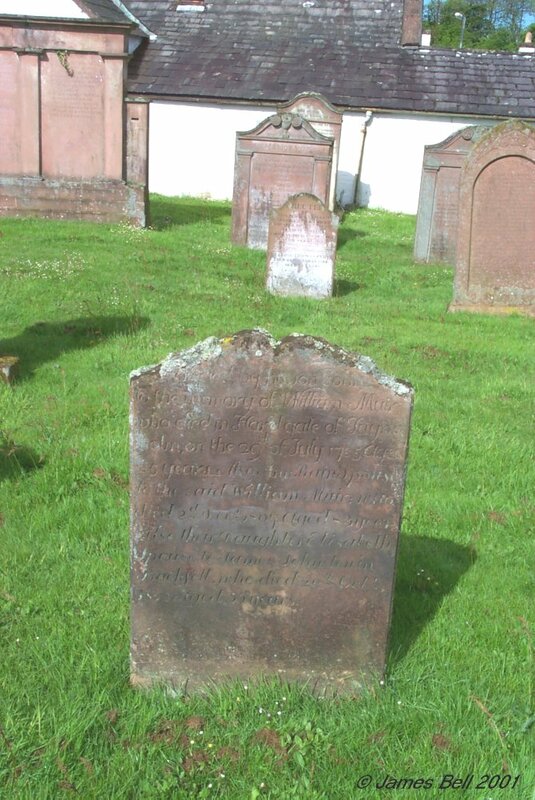 Also Agnes Halliday, their daughter, died at Mullock, September 30th 1871, aged 76 years. Also John Halliday of Mayfield, their son, died at Mullock, April 8th 1872, aged 85 years. 070 Erected by Alexander Halliday, in memory of Mary Mitchell, his spouse, who died at Kingzeanton, in Borgue, 29th 0ct'r 1859, aged 68 years. 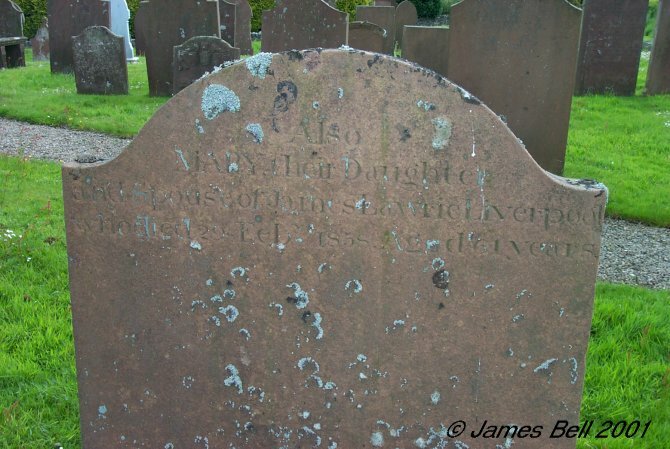 Also his daughter Agnes, who died at Irelandton in Twynholm, April 1830, aged 8 years. 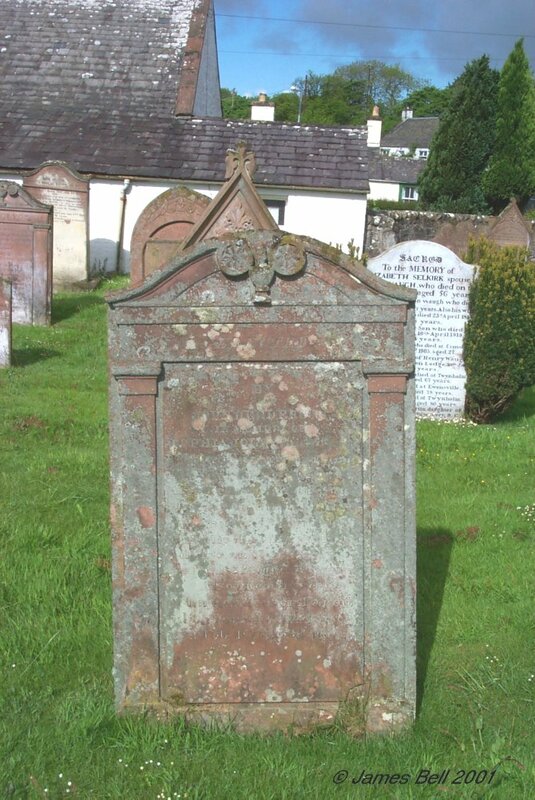 Also his daughter Isabella, who died at Crumwhill in Tongland, 6th May 1833 aged 19 years. And of his daughter Jane, who died at Chullshuch in Girthon, 1st October 1842 aged 16 years. Also his son Hugh, who died at Penang, Jan'y 1837, aged 19 years. 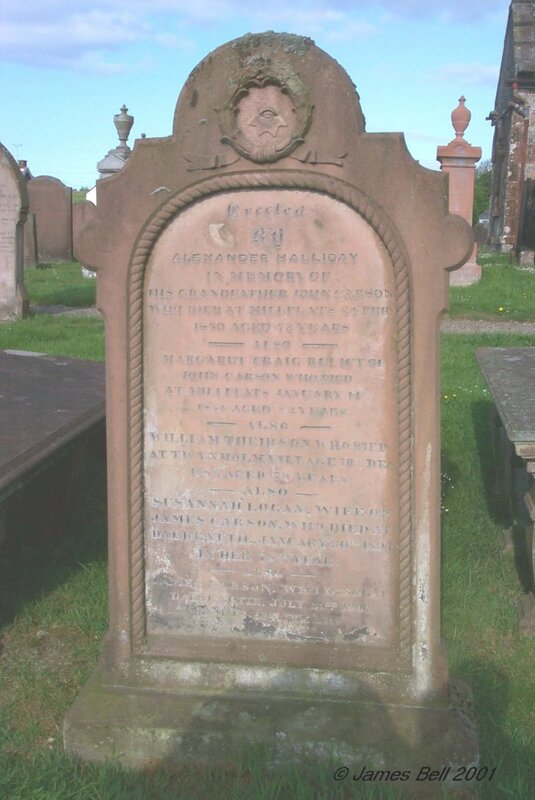 Also the above Alexander Halliday, who died at Trostrie, 15th March 1865, aged 77 years. Also his son David Halliday who died at Barstibly, Tongland 6th Jan'y 1882 aged 57 years. 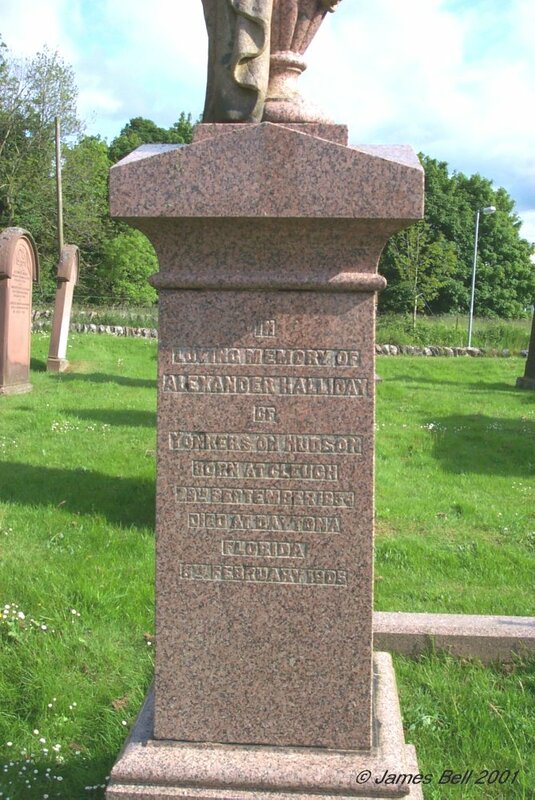 Also his son Alexander Halliday, who died at Barlocco, Borgue, 11th June 1883, aged 67 years. 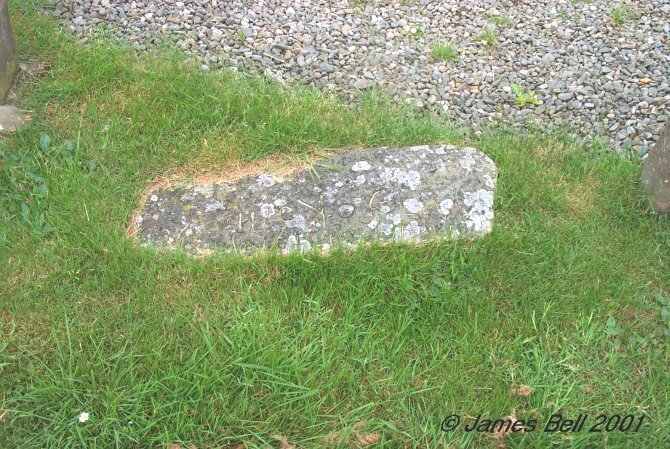 071 Here lyes the remains of Alexander Halliday, who died at Glengape, March 13th 1759, aged 85 years. 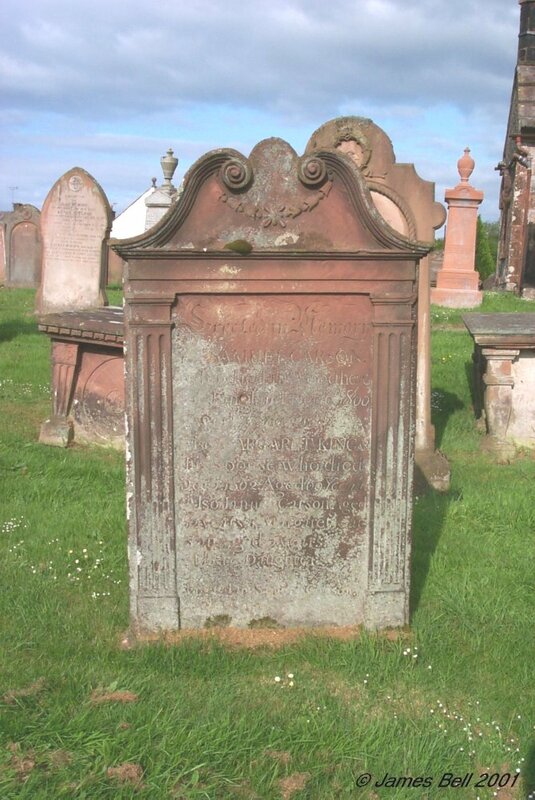 Also of Jean Muir, his spouse, who died Feb. 14th 1769 aged 82 years. Also here lyes the remains of David Halliday, their son, who died March 7th 1777, aged 64 years. 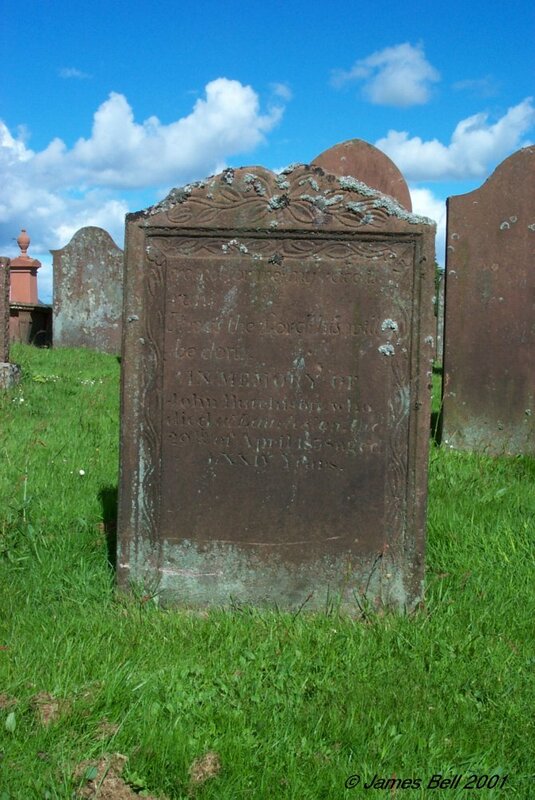 Also Mary Halliday, David Halliday's spouse, died Sept'r 3rd 1782, aged 59 years. 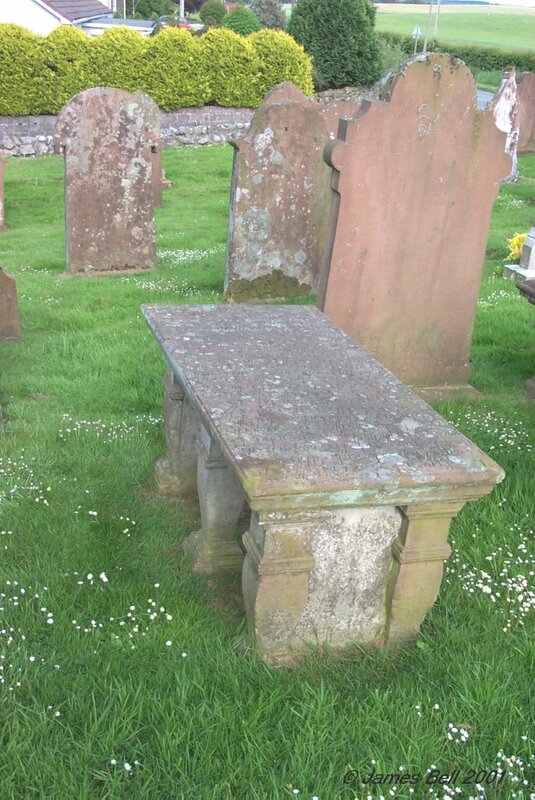 Also here lies the corpse of Margaret McNae, spouse to John Halliday, who died Nov'r 1788, aged 81 years. Also departed this life John Halliday in Bombay, January 17 1796, aged 87 years. 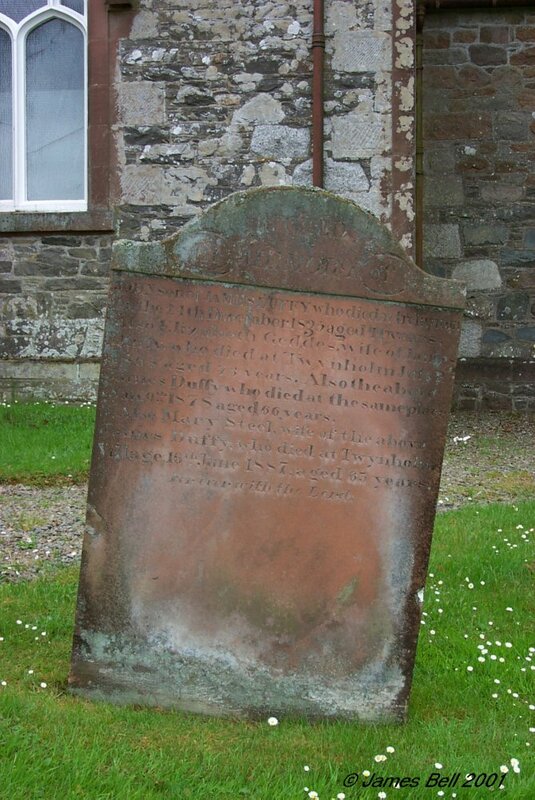 Rear: Here lyes the corpse of John Halliday, late in Glengape, who died Feb. 27th 1798, aged 49 years. 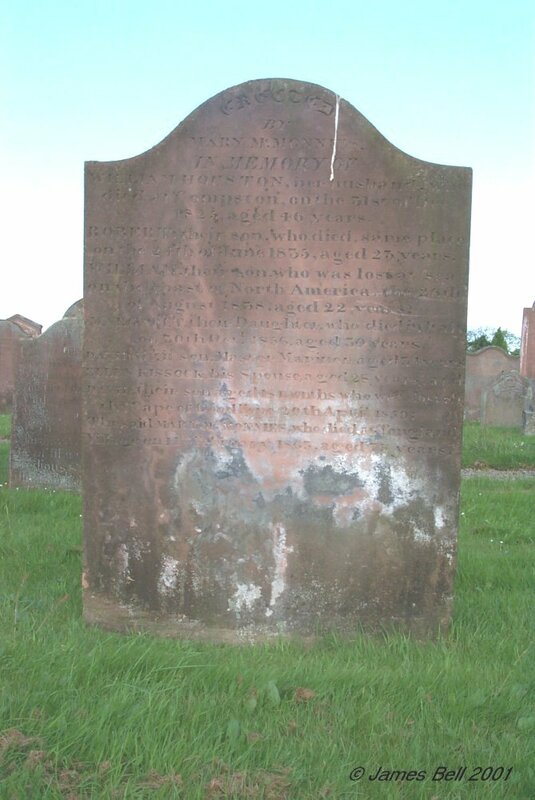 072 Erected in memory of Anthony Ker in Mucklewood, who died Dec'r 1791 aged 59 years. Also John Ker, his son, who died Oct'r 1764, an infant. 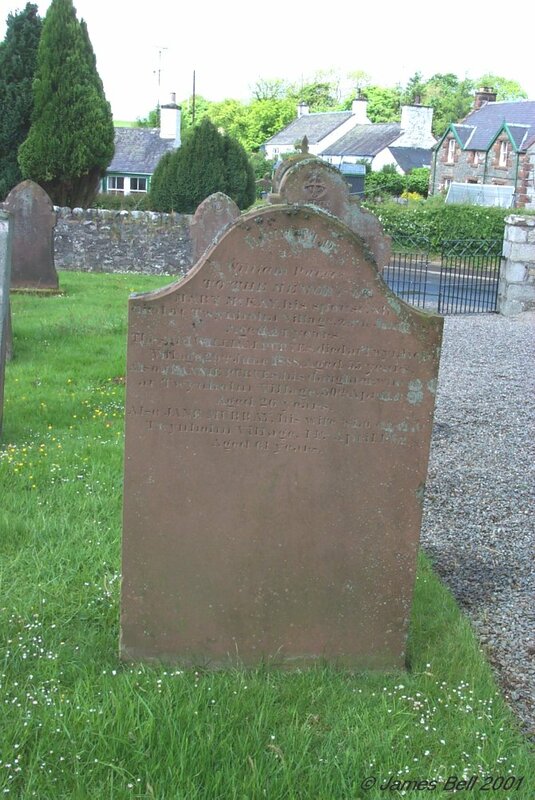 Also of Jean Halliday, spouse to the above Anthony Ker, who died at Brockloch, Carsphairn, 22nd May 1826, aged 90 years. 073 In Memory of John Hannay, late in Blackhill, who died March 1790, aged 88 years. Also Janet Nish, his spouse, who died Oct. 1788, aged 69 years. And their son James Hannay, who died at Marca--ncy, the 23rd March 1802, aged 43 years. Also Euphemia and Ellen, daughters of the late John Hannay of Laggan, who died 28th July 1887 and 28th March 1890 aged 80 years, respectively. Here are deposited the remains of John Hannay, late in Logan, of Cardoness, who died the 25th August 1813, in the 60th year of his age. Also his son Thomas, who died in infancy. Helen McCourty, his wife, who died in Creeton, - Oct 1860, aged 84 years. John Hannay, their son, died in Liverpool 31st August 1850, aged 17 years. Grace Hannay, their daughter, died at Creetown 27th Feb'y 1883, aged 72 years. 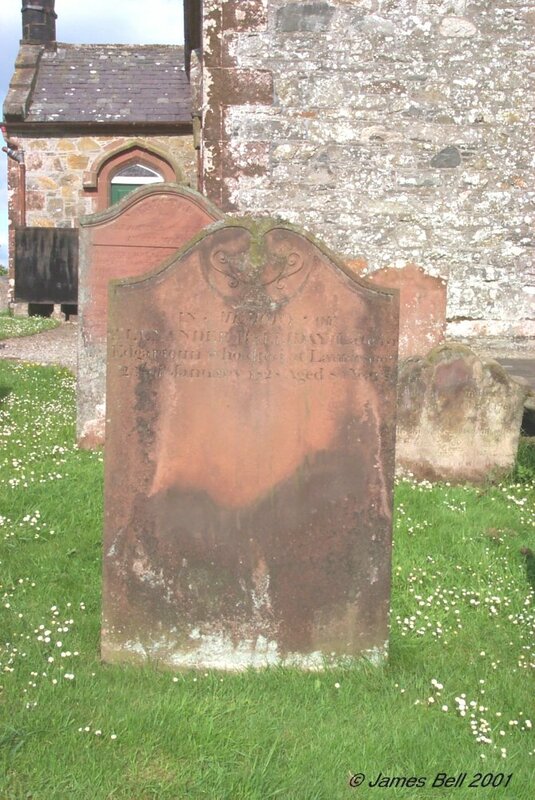 In memory of David Hannay, late farmer in North Milton, Kirkcudbright, who died 5th Nov. 1834, aged 70 years. Also his spouse, Anna Foster, who died 25th Aug. 1826, aged 42. Also his sister Euphemia, who died 30th May 1837, aged 82 years. And his sister Grace who died 20th July 1838, aged 85 years. Also their children Robert, died 10th Dec. 1850, aged 32; Mary, died 10 July 1851 aged 27; Grace, died 6th Oct. 1860, aged 52; John, died 26th Nov. 1860, aged 41. 074 Erected by Mary Paterson in memory of Adam Paterson, her father, who died at Crocketford-Barr on the 2nd of January 1840, aged 80 years. Margaret McKitterick, his spouse, who died at Castle Douglas the 2nd November 1847, aged 83 years. Also of their children viz; Robert, who died at Barcaple, the 14th of February 1821 aged 25 years. David, who died in Washington on the 15th of April 1831, aged 27 years. William who died at Stub-field, Ohio, U.S.America on the 23rd of March 1840 aged 44 years. Janet and James who died in infancy. 075 Erected by Alexander Halliday in memory of his grandfather, John Carson, who died at Millflats, 24 Feb 1850, aged 72 years. Also Margaret Craig, relict of John Carson, who died at Millflats, January 14th 1854, aged 82 years. Also William, their son, who died at Twynholm Village, 10th Dec'r 1885, aged 19 years. 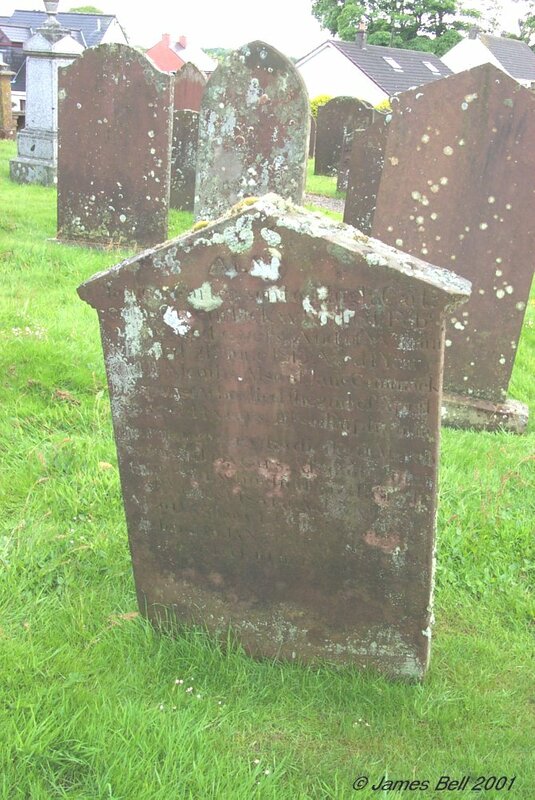 Also Susannah Logan wife of James Carson who died at Dalbeattie, 30th January 1894, in her 78th year. Also James Carson who died at Dalbeattie, July 29th 1909, in his 91st year. 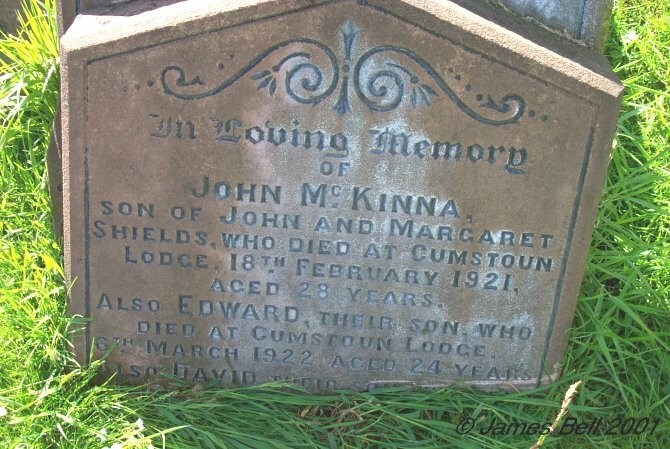 076 In loving memory of John McKinna, son of John and Margaret Shields, who died at Cumstoun Lodge, 18th February 1921, aged 28 years. Also Edward, their son, who died at Cumstoun Lodge, 6th March 1922, aged 24 years. Also David, their son, who died at Barstobrick, 18th April 1938, aged 42 years. 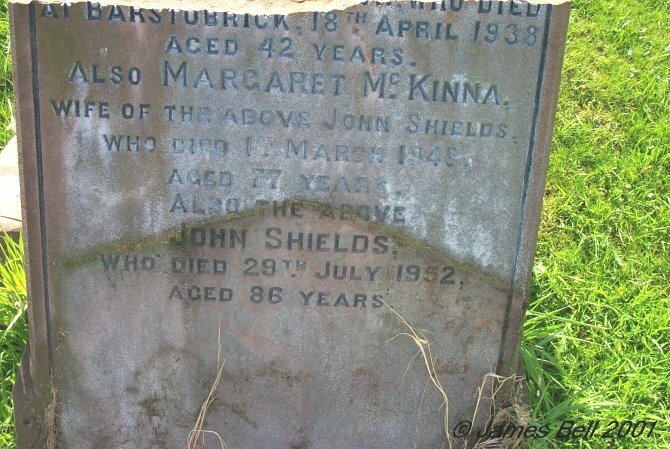 Also Margaret McKinna, wife of the above John Shields, who died 17th March 1948, aged 77 years. Also the above John Shields, who died 29th July 1952, aged 86 years. 077 Front: To the memory of Hands Barclay, who died at Twynholm Village, 27th Feb 'y 1847, aged 69 years. 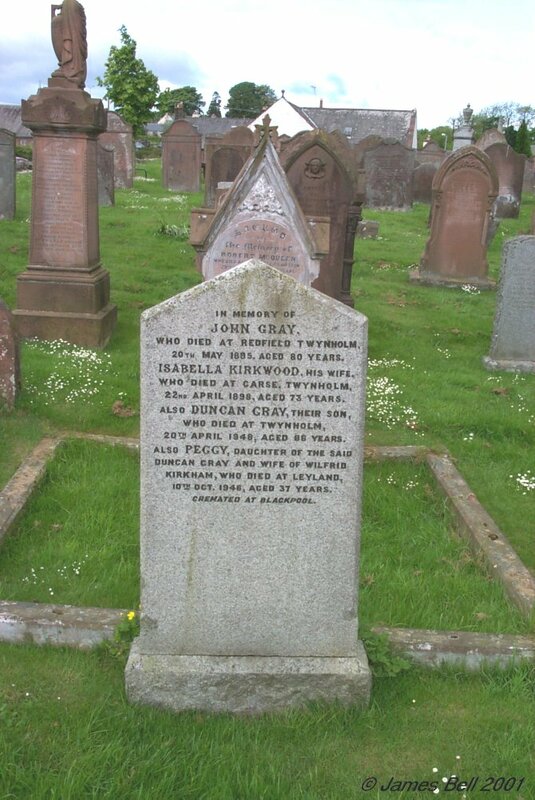 Also his spouse, Janet Craig, who died at same place 6th Dec'r 1862, aged 83 years. Also their son John, who died at same place, 8th Feb'y 1837, aged 30 years. 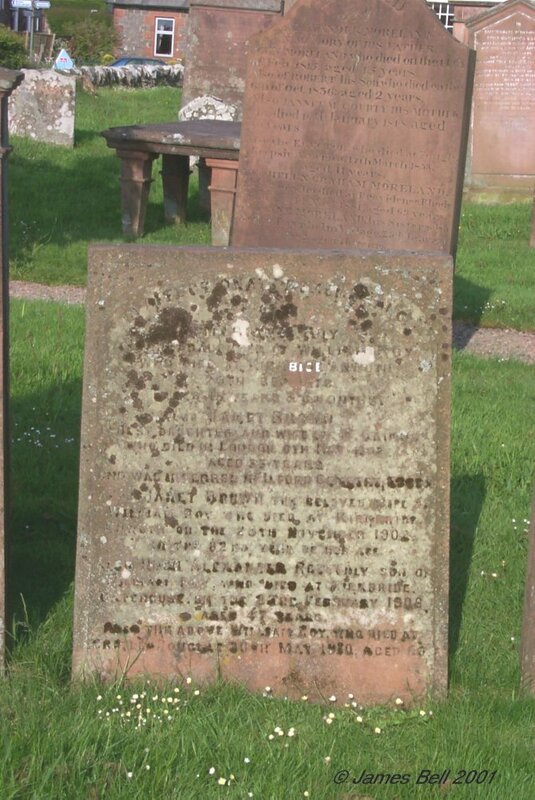 Also Margaret Barclay ,who died at Twynholm, Sept'r 1871 aged 55 years. Rear: Erected by John Craig in memory of Robert Craig, his father, who died in Carhow, Feb. 12 1791, aged 77 years. 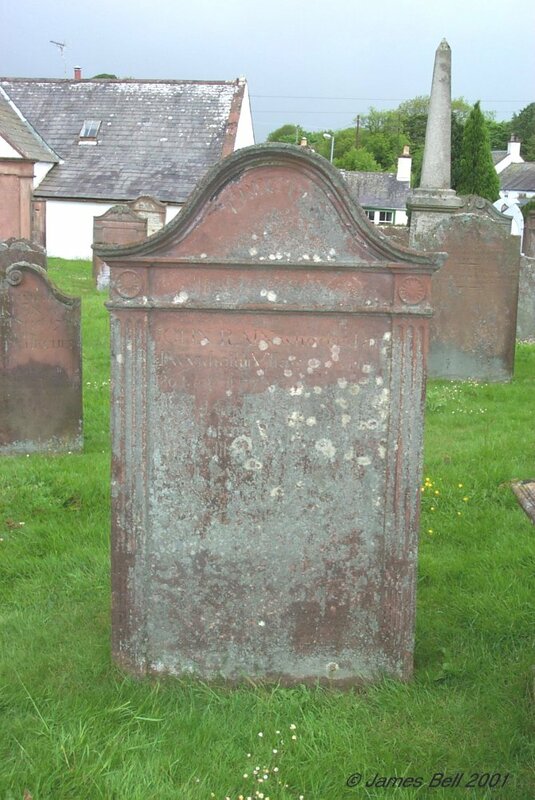 Also John Craig, son of Robert Craig and Kethren Cochran, who died February 1793, aged 17 years. And also the said John Craig, son to the above Robert Craig, who died at Carhow 4th April 1799, aged 62 years. 078 Erected by William Cuthbert, in memory of Mary Gray, his wife, who died at Redfield, 24th Nov'r 1866, aged 30 years. Also the above William Cuthbert, who died at same place 5th April 1872, aged 44 years. 079 Erected by George Stewart, Kirkchrist, in memory of David Carson, fourteen years his farm servant, who died 3rd Oct'r 1868, aged 54 years. Also his wife Margaret Miller, who died 27th Jan'y 1860 aged 48 years. 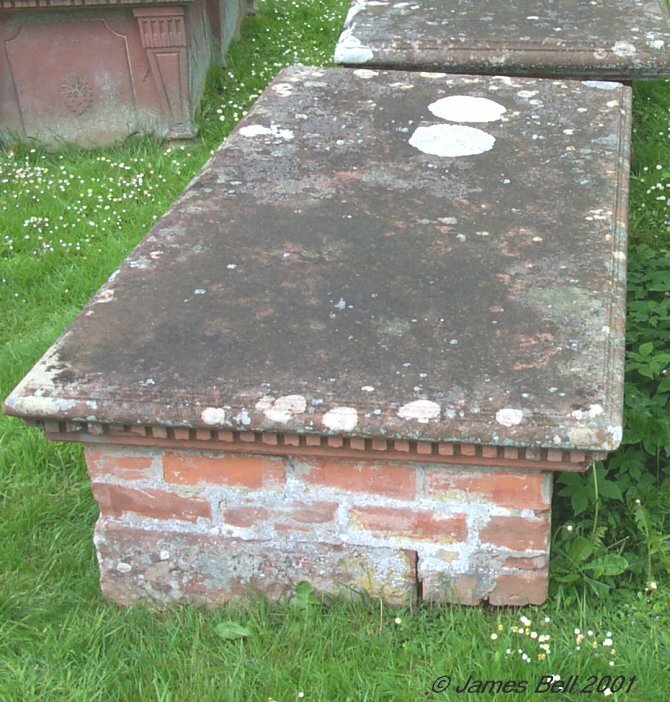 Also of their children, Isabella, Mary, Charles, Jane all interred here. 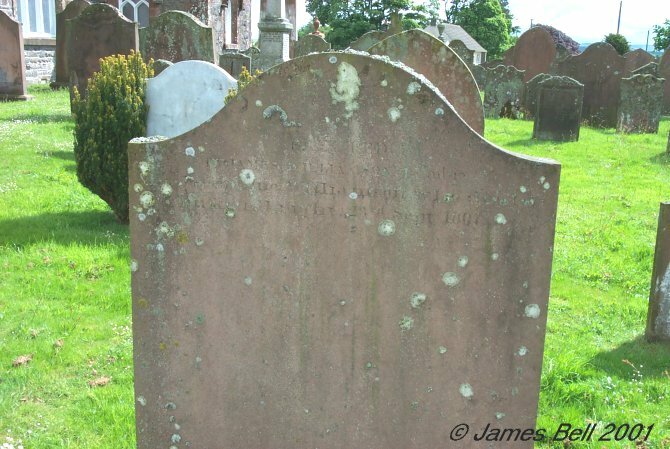 080 In loving memory of James Palmer, who died at Twynholm village, 27th Oct'r 1842, aged 72 years. Also Janet Johnston, his wife, who died 21st Sept. 1844, aged 70 years. Also their grandson Andrew Thomas Palmer who died 10th Feb. 18-3, aged 7 months. Also their grandson Nathaniel, son of James Palmer, who died 29th Nov. 1877, aged -- months. Sarah Shaw, wife of James Palmer Jnr. who died 6th Feb. 1879, aged 70 years. And the above James Palmer Jnr. who died -0th Oct. 188-, aged 79 years. 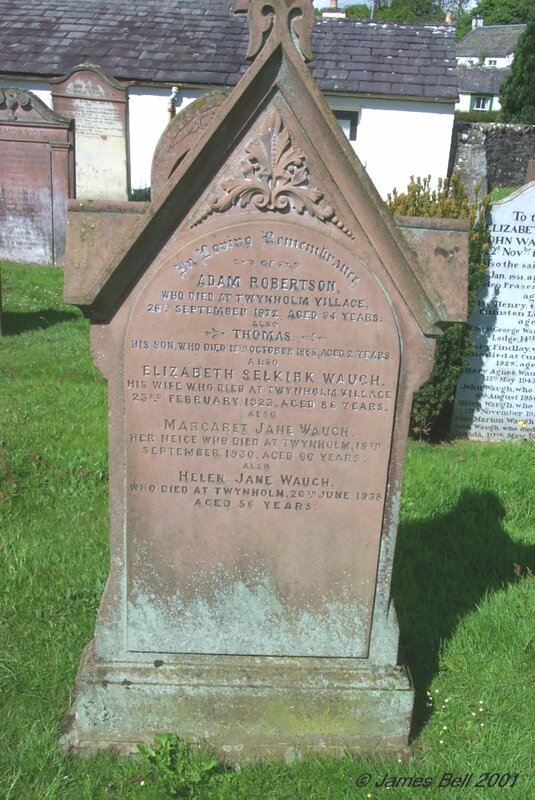 Also his daughter Jessie, wife of James Manson, who died at Kirkcudbright 20th January 188-, aged -- years. Erected by their children. 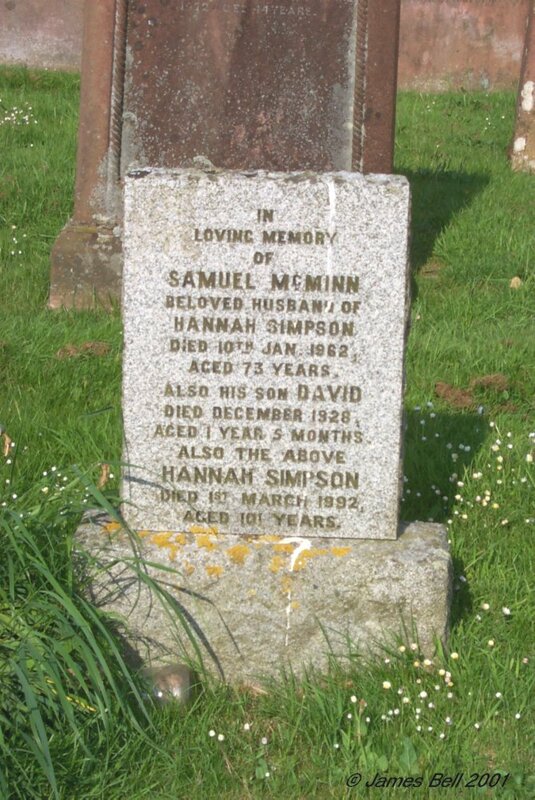 081 In loving memory of Samuel McMinn, beloved husband of Hannah Simpson, died 10th Jan. 1962, aged 73 years. Also his son David, died December 1928, aged 1 year, 5 months. Also the above Hannah Simpson, died 1st March 1992, aged 101 years. 083 In memory of Alex'r Mitchell, who died Sep'r 2 1809, aged 75 years. Also Margaret Carson, his spouse, who died Jan'y 6 1811, aged 74. Also their son ……….. Reverse - Also Jane Mitchell, died Feb 1st 1850, aged 83. 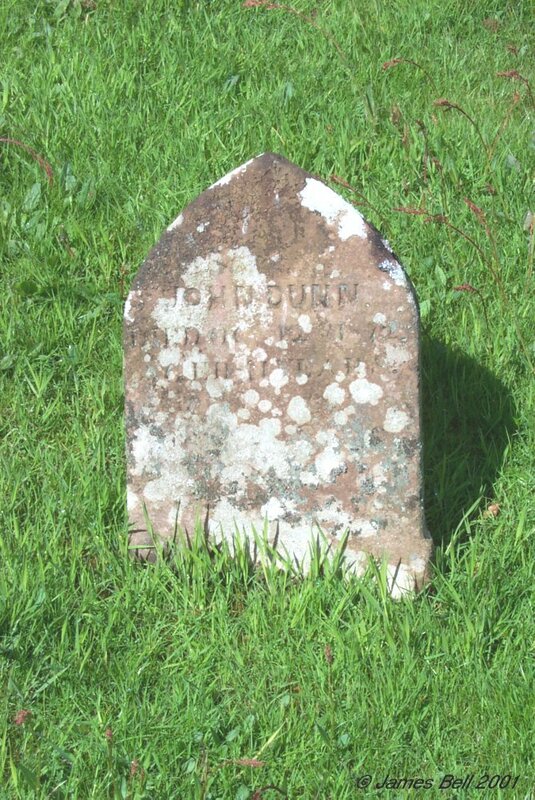 Also Alex'r Burnie, her husband, died June 4th 1851, aged 84 years. 084 In loving memory of Jeanie Kinnel, beloved daughter of John and Jeanie Kinnel, who died at Ingleston Dairy, Twynholm, 10th June 1925, aged 15 months. 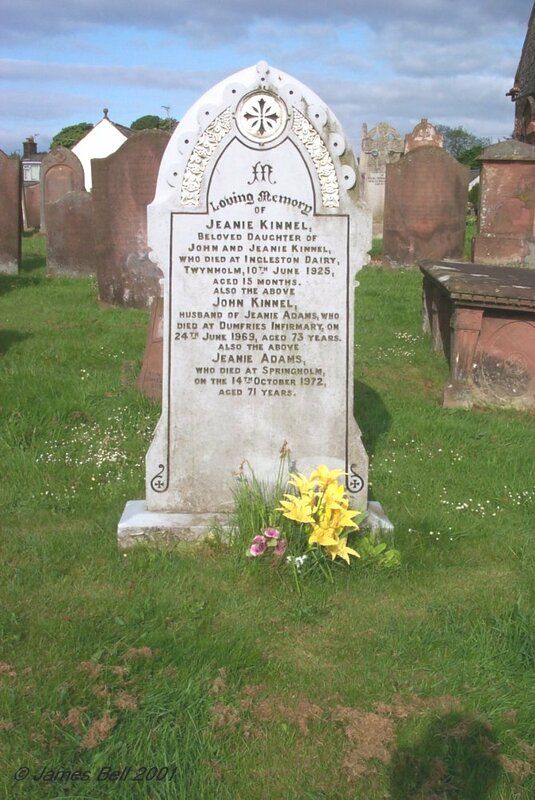 Also the above John Kinnel, husband of Jeanie Adams, who died at Dumfries Infirmary, on 24th June 1969, aged 73 years. Also the above Jeanie Adams, who died at Springholm on the 14th October 1972, aged 71 years. 085 Erected in memory of Samuel Carson, who died in Woodhead of Tongland, Dec'r 6th, 1800 aged 77 years. 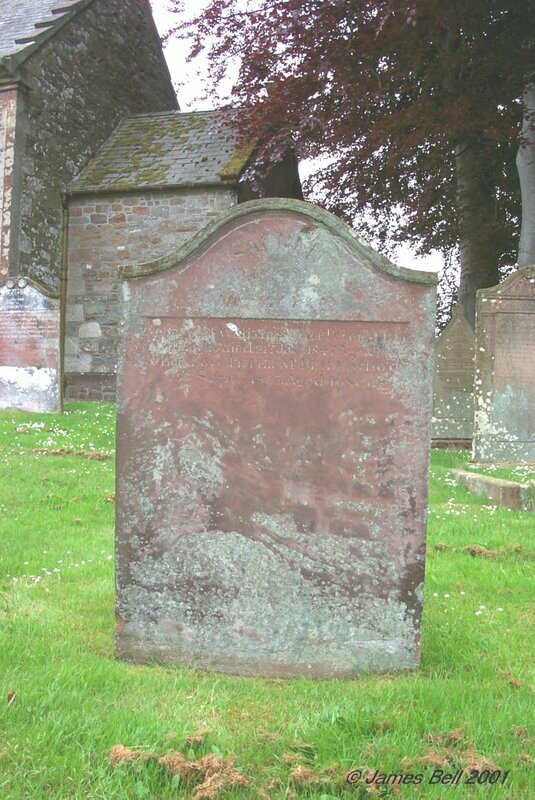 Also Margaret Kingan, his spouse, who died Dec'r 5th 1802, aged 69 years. Also Jannet Carson aged 2 years & Margaret Carson aged 3 years, their daughters. Erected by Samuel Carson, their son. 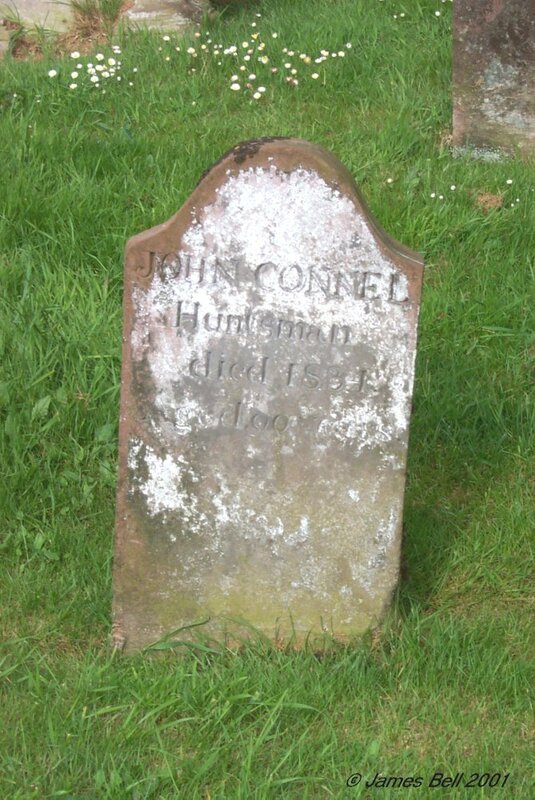 086 John Connel, Huntsman, died 1834, aged 90 years. 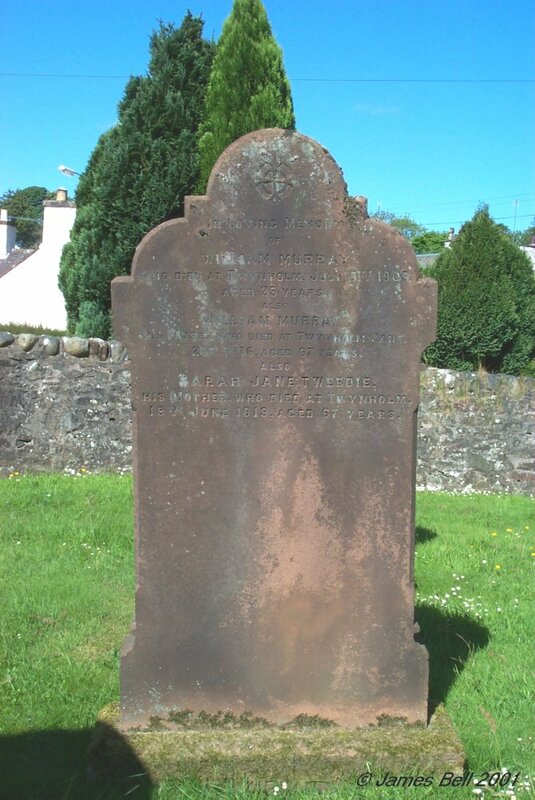 087 In memory of Alexander Halliday, late in Edgartoun, who died at Laurieston 23rd of January 1828, aged 84 years. 088 In memory of David Murray, late in Little Mains, who died 18th April 1819, aged 67 years. William, his son, who died in infancy. Also of James his son who died in Rochdale, Lancashire, 27th Jan'y 1830, in the 42nd year of his age. Also Peter his son who died in Manchester, 24th Dec'r 1843, aged 47 years. 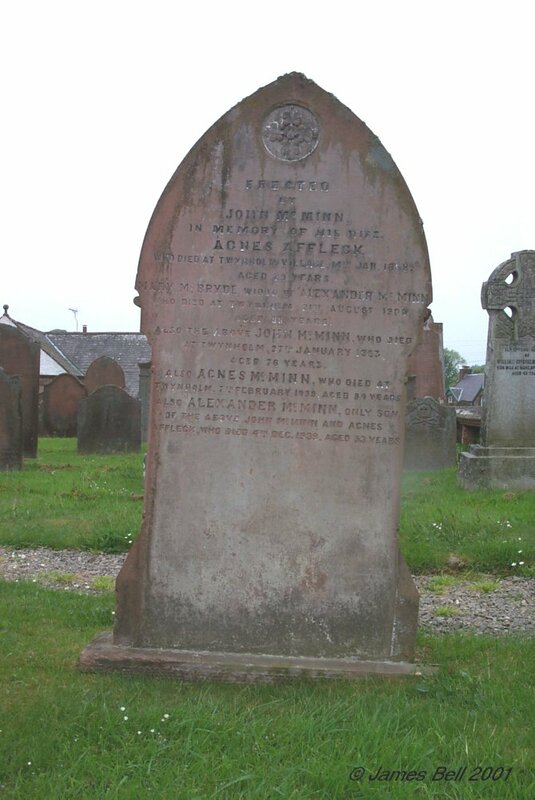 And of John his son who died at same place, 26th Jan'y 1844, aged 57 years. 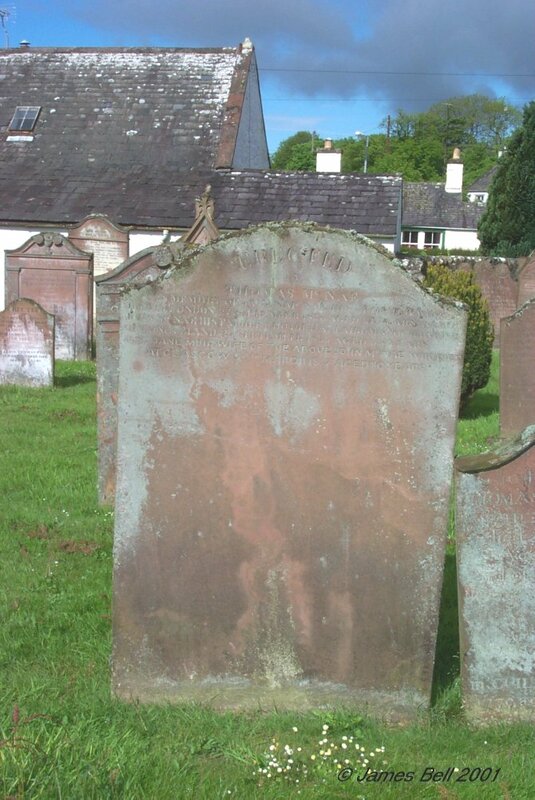 Jean his daughter, who died at Twynholm Village, 14th Feb'y 1847, aged 54 years. Also his spouse Elizabeth McNaught, who died at same place, 30th March 1847, aged 86 years. 089 Erected by Janet McCulloch in memory of her brother John, who who died at Hilltop, Cumpston, 8th July 1838, aged 17 years. 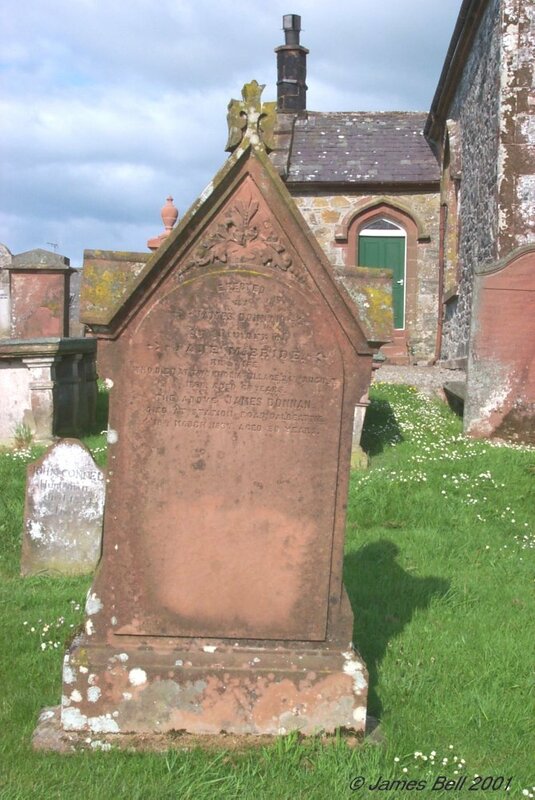 And of her father John McCulloch, who died at same place 1st Jan. 1851, aged 64 years. And of her brother Alexander who died at Ravenshall, 17th Feb 1860, aged 45 years. 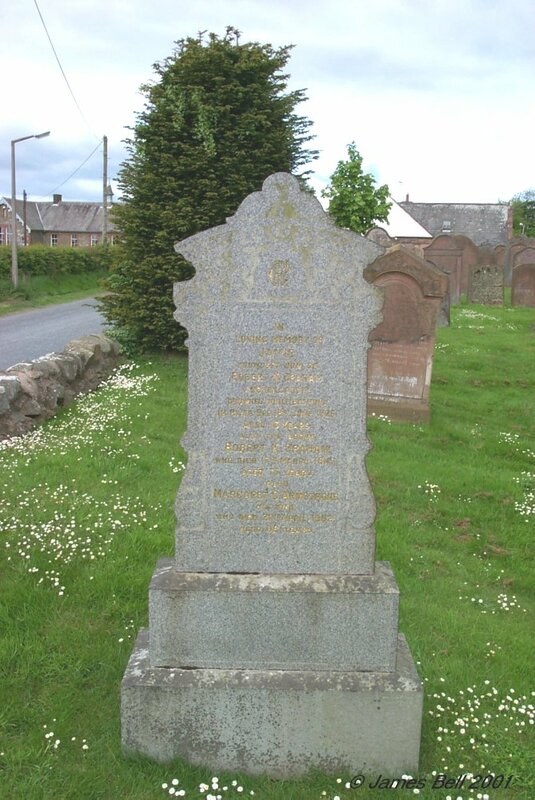 And of her mother, Mary McMurdoch, relict of John McCulloch, who died at High Newton, 20th March 1877, aged 88 years. Also of one brother and two sisters died in infancy . Also her brother Samuel McCulloch, who died in Liverpool in 1884, aged 54 years. 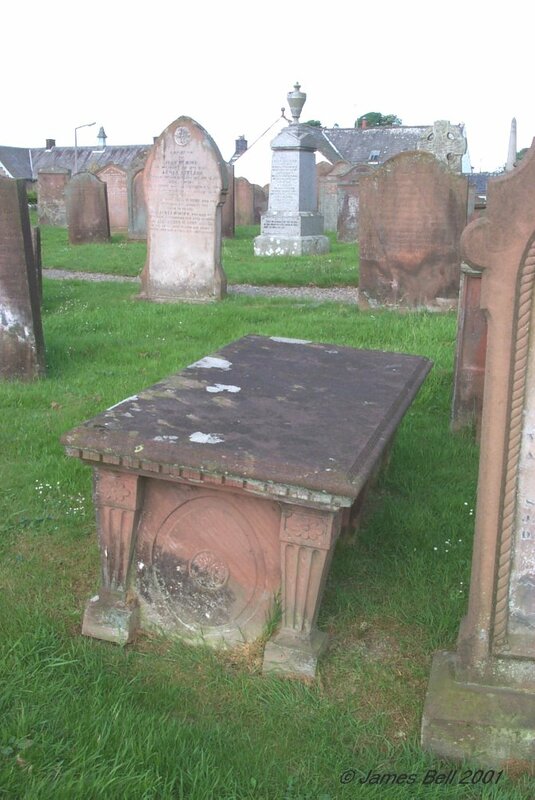 The said Janet McCulloch, died at High Newton, 18th July 1892 aged 73 years. 090 This is a fragment of a broken stone, perhaps covered by the soil underneath. 091 Erected by John McMurray, in memory of Margaret McMurray, his daughter who died at Larg of Kirkmabreck, 9th March 1857, aged 5 years. 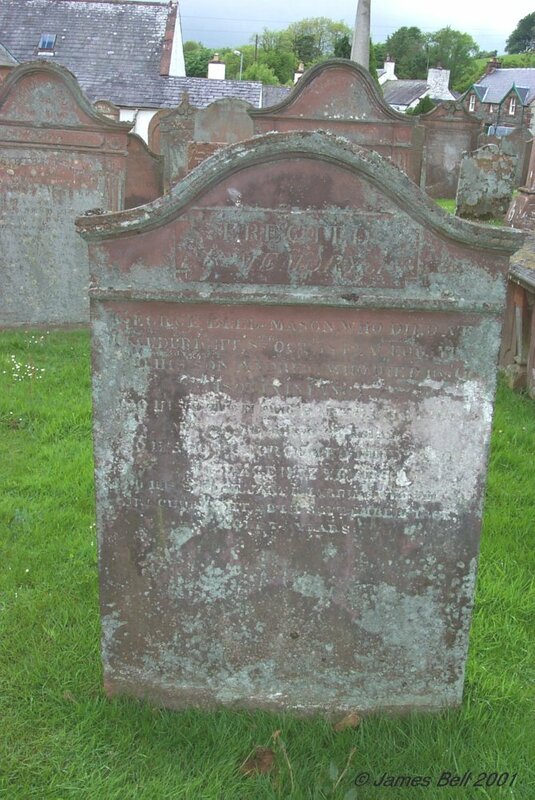 Also Isabella, who died at Culcaigrie, the 10th July 1877, aged 29 years. Also Elizabeth Laurie, his wife, who died at Killerton Mill, 29th April 1898, aged 75 years. Also the said John McMurray, who died at same place, 8th May 1898, aged 78 years. 092 In loving memory of Daniel McMichael, who died at The Knowe, Twynholm, 3rd July 1931, aged 68 years. And Margaret Bland, his wife, who died at The Knowe, Twynholm, 10th Nov. 1938, aged 78 years. Also Catherine Mary McMichael, their daughter, who died 1st May 1981, aged 87 years. 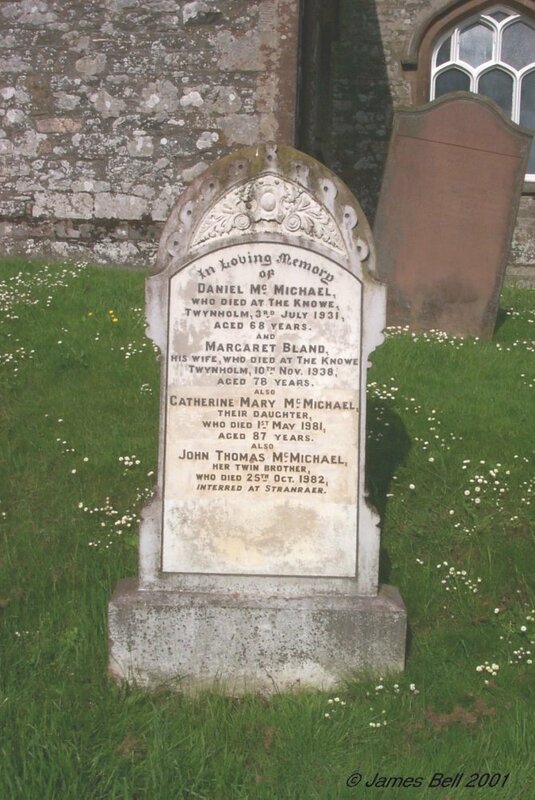 Also John Thomas McMichael, her twin brother, who died 25th Oct. 1982, interred at Stranraer. 093 Erected in memory of John Turner, who died at Grange, Dec'r 17th 1879, aged 86 years. He was for more than 50 years, cotman on Lord Selkirk's estate. 094 In memory of John Bland, who died at Twynholm Village, 14th March 1833, aged 24 years. Also of Mary Rae, his mother, who died 13th July 1850, aged 62 years. And David Bland, her husband, who died 14th March 1858, aged 82 years. 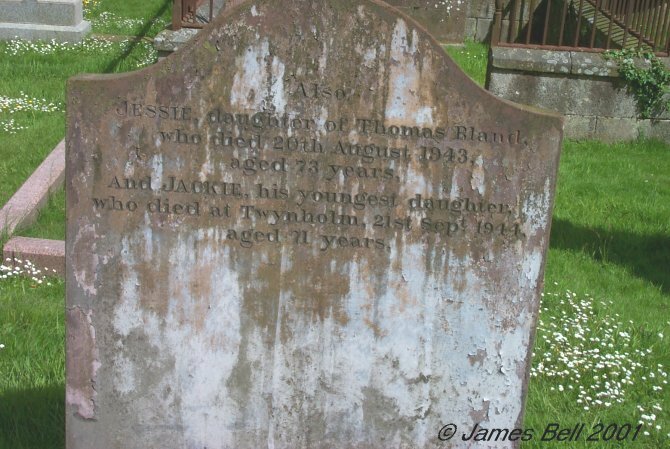 Also Thomas Bland, their son, who died at Twynholm Village, 9th June 1888, aged 62 years. And Jackie his daughter, died 24th August 1866, aged 3 months. Also Mary Bland, daughter of the above David Bland, who died at Twynholm ,15th Feb 1900, aged 89 years. Also Janet Thomson, wife of the above Thomas Bland, who died 5th March 1911, aged 79 years. David, son of the above Thomas Bland, who died 17th April 1922, aged 60 years. Also Thomas, second son of the above Thomas Bland, who died at New London, Conn., U.S.A., 28th Aug 1930, aged 62 years. Reverse: Also Jessie, daughter of Thomas Bland, who died 20th August 1943, aged 73 years. And Jackie, his youngest daughter, who died at Twynholm 21st Sept. 1944, aged 71 years. 095 Erected to the memory of John Thomson, who died at Twynholm Village, on the 8th day of October 1846, aged 62 years. Also James, his son, who died in infancy. Also Jannet, his daughter, who died Nov'r 9th 1858, aged 46 years. Also Mary McNish, his widow, who died on the 2nd of Mary 1875, aged 85 years. 096 In memory of Alexander Lindsay, who died at Ravenshall, 10th Dec 186,4 aged 75 years. Margaret Grier, his wife, who died at Trostrie, 19 March 1853, aged 62 years. Also Charles Lindsay, their son, who died at Lochenbreck, 16th Jan 1901, aged 67 years. 097 Erected by Anthony Milroy, in affectionate remembrance of Mary, his daughter, who died at Campbellton, 29th March 1867, aged 21 years. 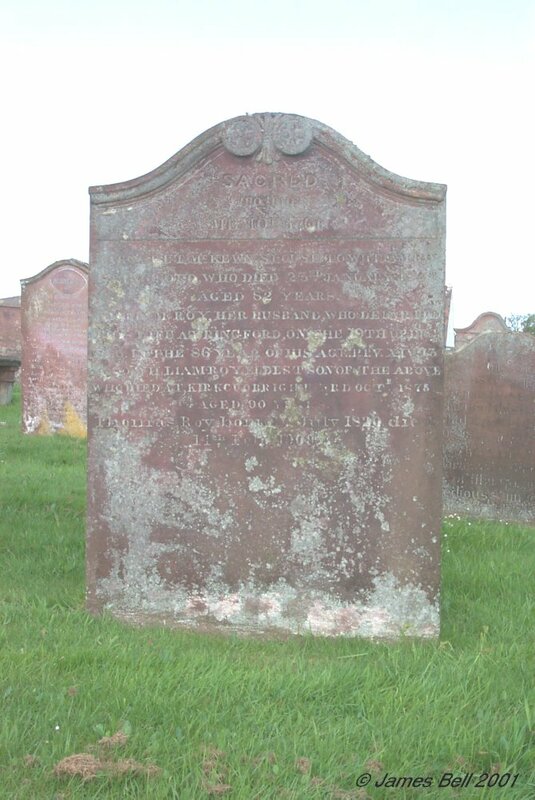 Also Mary Lindsay, his wife, who died at Twynholm Village 15th Feb 1879, aged 55 years. Also John, his son, who died at Detroit, U.S.A., on the 22nd of August 1884, aged 24 years. The above Anthony Milroy, who died at Quhytdwoollen, Lockerby, 31st July 1890 aged 75 years, and is interred here. 098 Erected by John Robison, in memory of his wife, Joanna Walker, who died at Doon, 17th March 1849, aged 27 years. 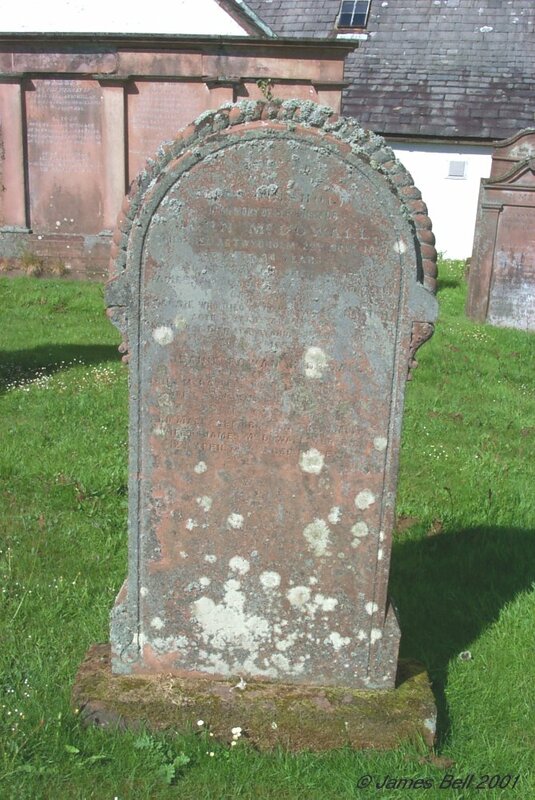 Also Ann Neilson, his wife, who died at Mooryard, 25th Feb 1855, aged 33 years. Also Elizabeth Hetherington, her mother, who died at same place, 25th Dec 1852, aged 52 years. 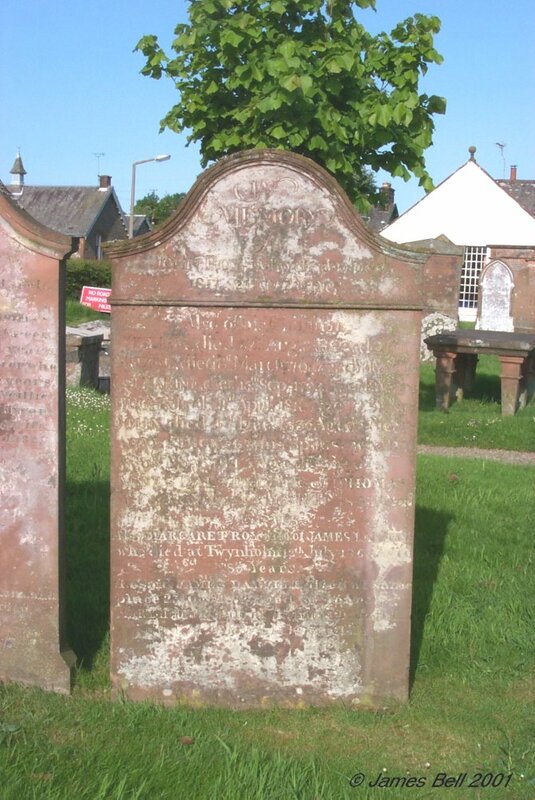 Also Barbara Robison, his daughter, who died at Twynholm, 19th June 1850, aged 9 years. 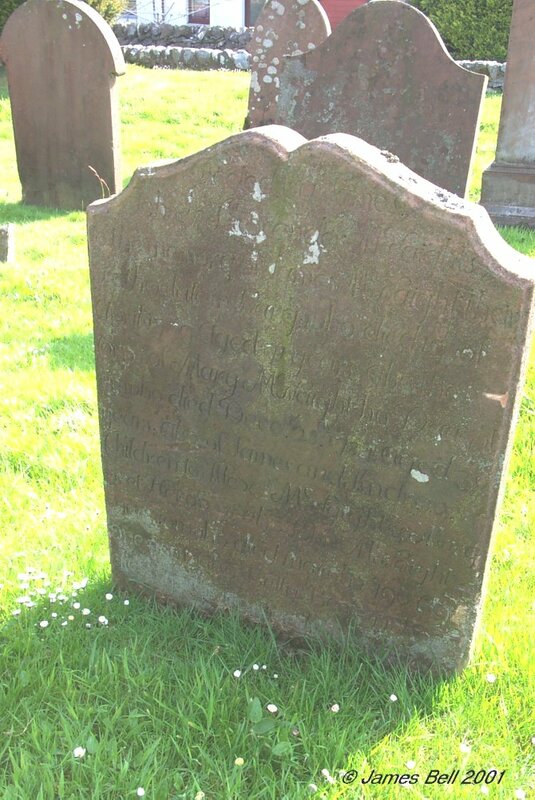 Also Margaret Robison, his daughter who died at N.Abbey, Ballasalla, Isle of Man, 18th August 1887, aged 35 years. Also the said John Robison who died at North Abbey, Ballasalla, Isle of Man, 3rd April 1901, aged 78 years. 099 In loving memory of Alexander Charters, who died at Twynholm Village, 5th Oct 1890, aged 81 years. And Janet Burgess, his wife, who died at same place, 27th Nov 1866, aged 56 years. Also their two children who died in infancy. Also Alexander Charters, grandson of the above, who died at Twynholm Village, 12th June 1912, aged 31 years. Also James Robertson, who died at Twynholm 7th June 1927, aged 74 years. Also Margaret, daughter of the above Alexander Charters, who died at Twynholm, 15th March 1934, aged 91 years. Also Margaret Charters, wife of the above James Robertson, who died 23rd Aug 1952, aged 82 years. 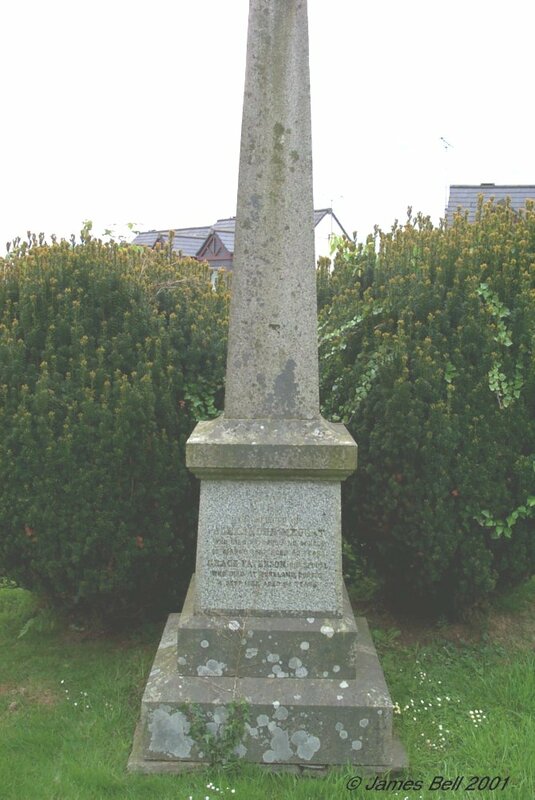 100 Erected in memory of Hugh Black, who died at Twynholm Village ,August 6th 1847, aged 66 years. 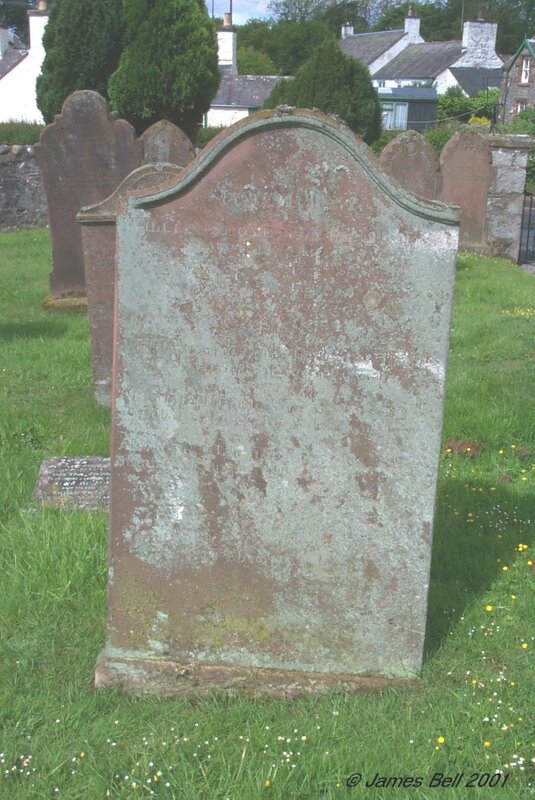 Also Jane Wilson, his wife, who died April 28th 1854, aged 68 years. Hugh their son, who died in London, Nov'r 1854, aged 36 years. 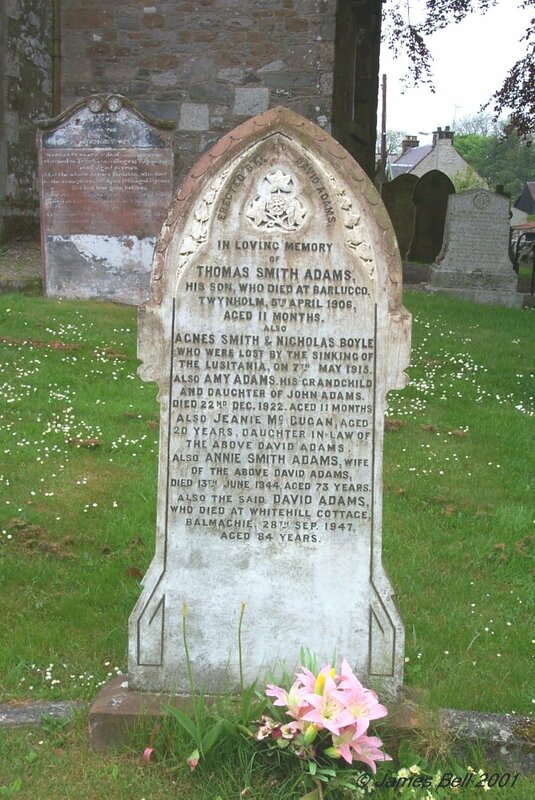 Thomas, their son, died at Twynholm, 28th June 1856, aged 48 years. 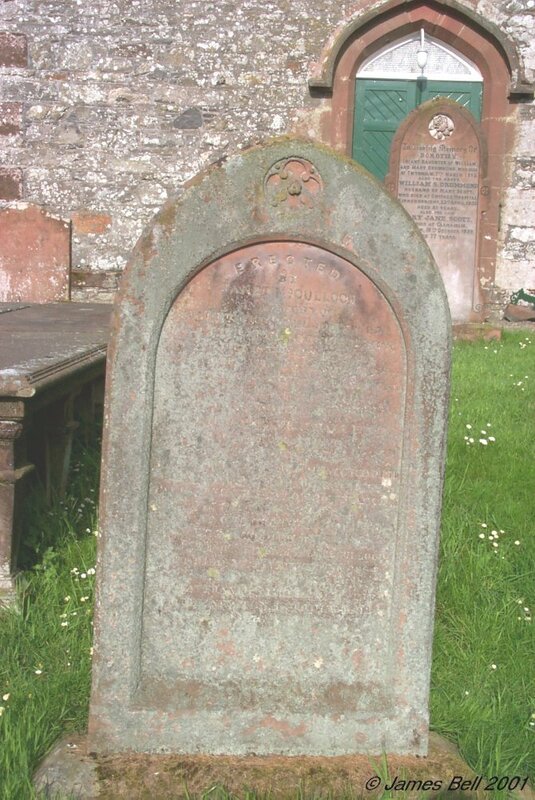 Isabella, their daughter, died at Kirkcudbright, 24th January 1895, aged 80 years. John, their son, who died at Twynholm, 10th March 1871, aged 64 years. Jane Muirhead, wife of the above John Black, who died at Twynholm 20th of Nov'r 1882, aged 60 years. Mary Nicholas ,daughter of John Black, who died July 1st 1862, aged 6 years. Also John, who died Feb'y 7th 1870, aged 11 years. Also David, who died at Auchencairn, 21st March 1906, aged 43 years. Also Elizabeth Bolton, who died at Kirkcudbright, 9th August 1919. Also Hugh eldest son of the above John Black, who died at Twynholm Village, 10th May 1931, aged 79 years. Also William Hugh, nephew of the said John Black, who died at Durban, South Africa, 7th Feb 1931, aged 63 years. Also Lizzie M. J. Black, sister of the above W. H. Black, who died at Twynholm, 22nd June 1932, aged 61 years. Also Jane Black, eldest daughter of the above John Black, died at Twynholm, 8th Sept 1944 aged 90 years. 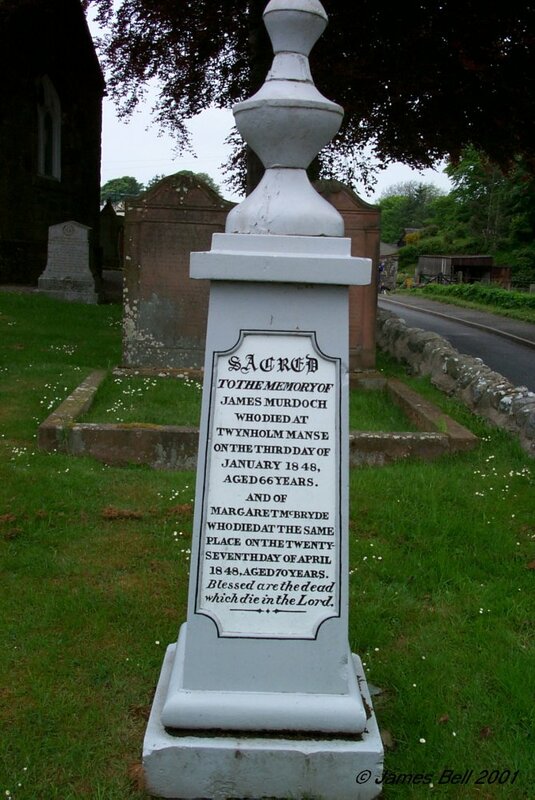 101 Sacred to the memory of Jane Irvine, wife of William Murray, who died at Muirhead, 2nd Sept 1898, aged 79 years. Also the said William Murray, who died at Muirhead, 16th March 1901, aged 84 years. Also John Hogg, who died at Minto, 1st February 1912, aged 20 years. Also Margaret, daughter of the above William Murray, who died at Minto, 19th Dec'r 1922, aged 73 years. Also Mary Ann Murray, his daughter, who died at Minto, 22nd April 1931, aged 85 years. Also Jane Murray, his daughter, who died at Minto, 31st Jan'y 1933, aged 81 years. 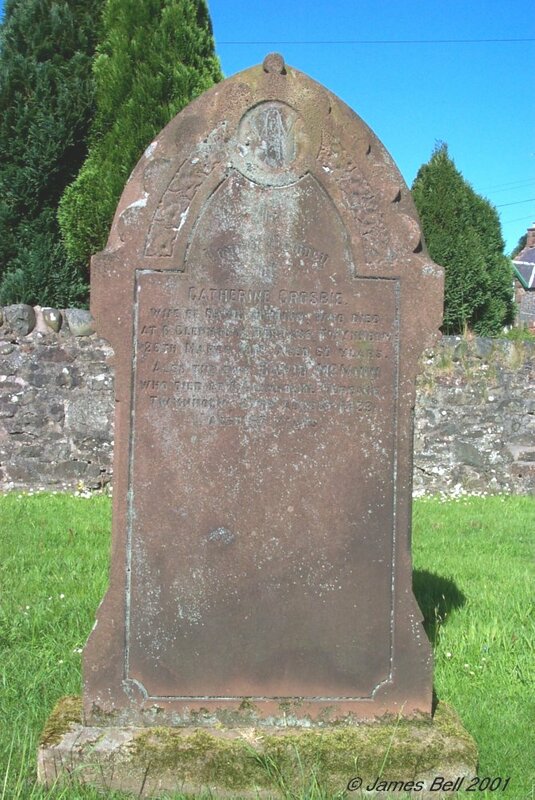 102 Erected by John Walker, in memory of Margaret Halliday, his wife, who died at Glengape the 19th of May 1829, aged 45 years. Also Margaret Walker, their daughter, who died 8th May 1820, aged 3 months. 103 a. 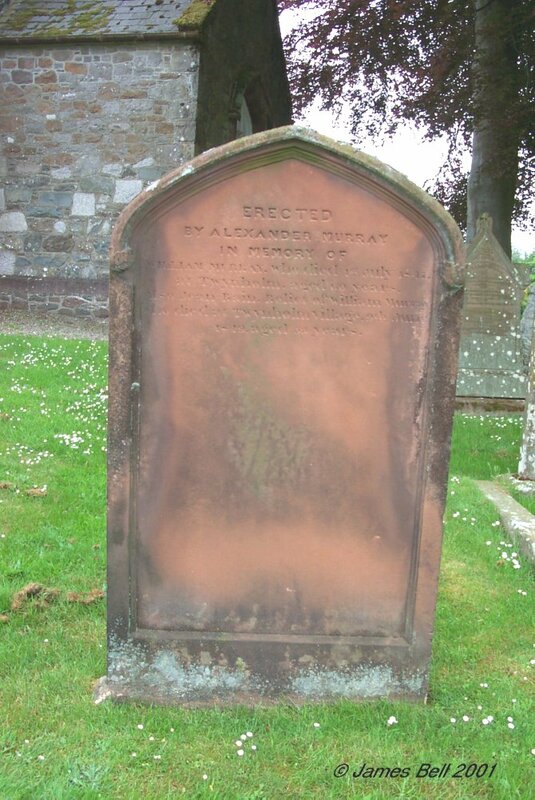 In loving memory of Alexander Halliday, died in 1839, aged 79. Isabella Harris, his wife, died in 1832, aged 79. 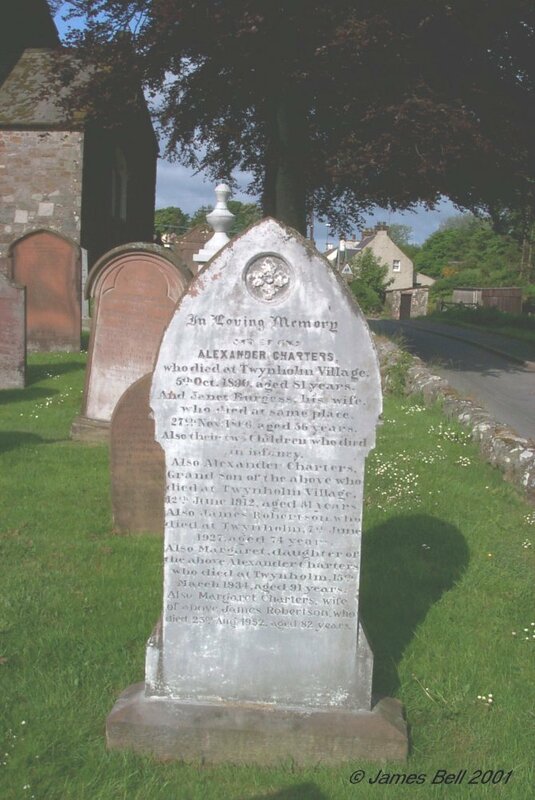 Alexander, their son, died at Cleuch, 13th April 1860, aged 74 years. b. In loving memory of Margaret Halliday, wife of Alexander Halliday, who died at Yonkers on Hudson, 19th February 1890, aged 78 years. c. In loving memory of Alexander Halliday, of Yonkers on Hudson, born at Cleuch, 29th September 1834, died at Daytona, Florida 6th February 1905. 104 In loving memory of Margaret Hamilton, who died at Twynholm, 26th June 1917, aged 23 years. Also Sarah, who died 15th July 1901, in infancy. Also Robert Hamilton, their father, who died at The Cottage, Twynholm, 31st July 1936, aged 77 years. Also Agnes Jane Beattie, his wife, who died at Conchieton, 20th August 1940, aged 81 years. Erected by Robert Hamilton. 105 Erected by James Carson in Gatehouse, in memory of his father and mother; the former died 4 Dec'r 1833 aged 82 years, the latter 1 April 1820 aged 67 years. And of their children, viz:- Ann, their daughter, died ------- aged 4 years, Mary, their daughter, died 28 Nov' r 1828, aged 41 years. William, their son, died 22 Feb'y 1834, aged 52 years. 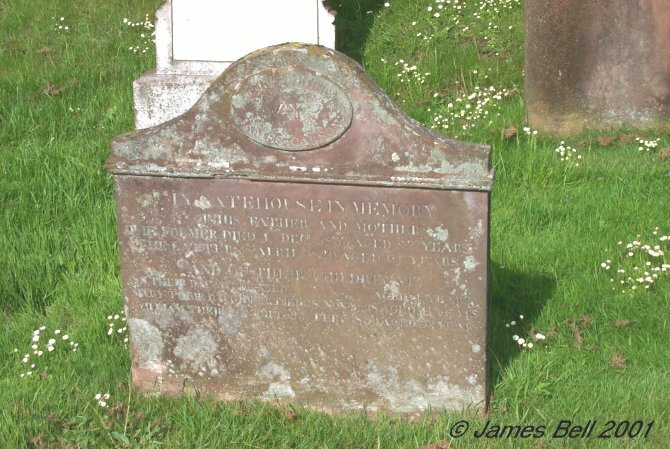 106 Sacred to the memory of William Inglis, late farmer in Moorhead of Twynholm, who died 8th April 1844, aged 75 years. 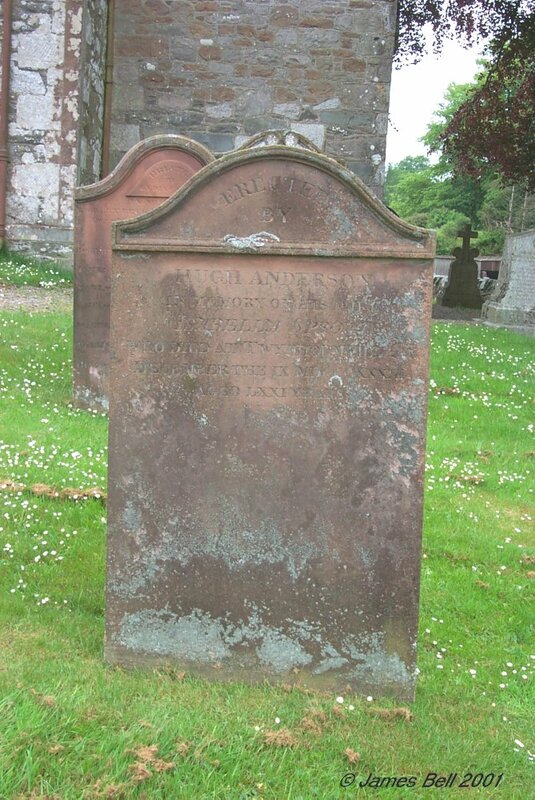 Also Margaret Anderson, his wife, who died 7th July 1825, aged 56 years. 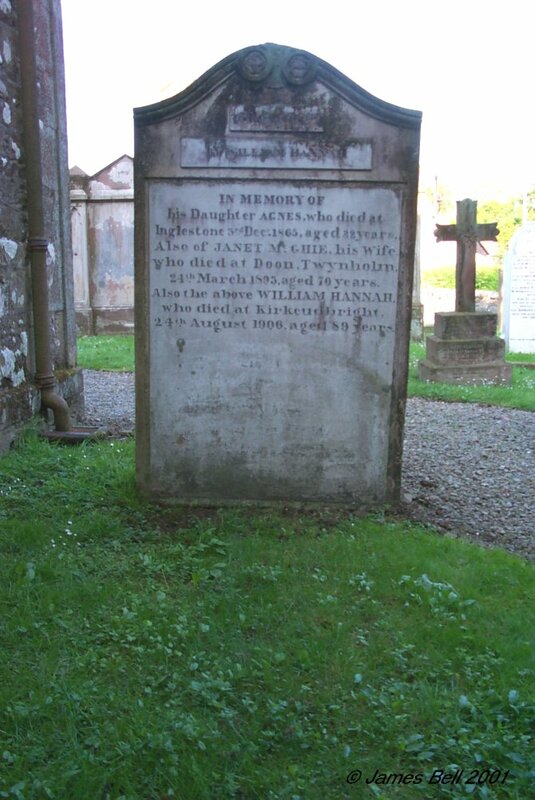 Also Janet, his daughter, who died 9th June 1821, aged 21 years. Henny who died in infancy. Mary, who died 10th April 1845, aged 32 years. 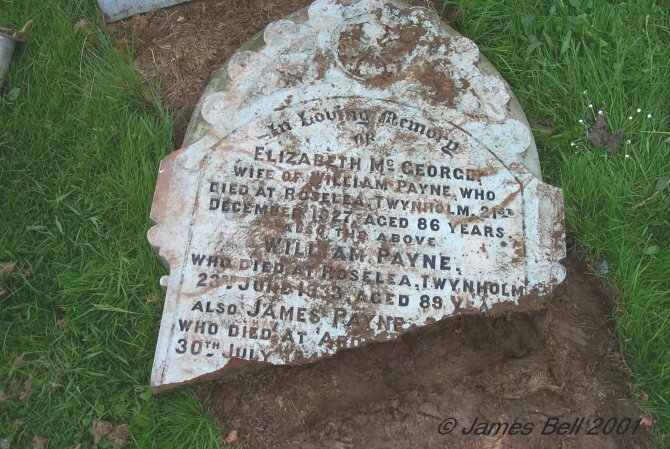 And Lydia who died at Gatehouse, 29th December 1875, aged 73 years. Daughters of the above William Inglis. 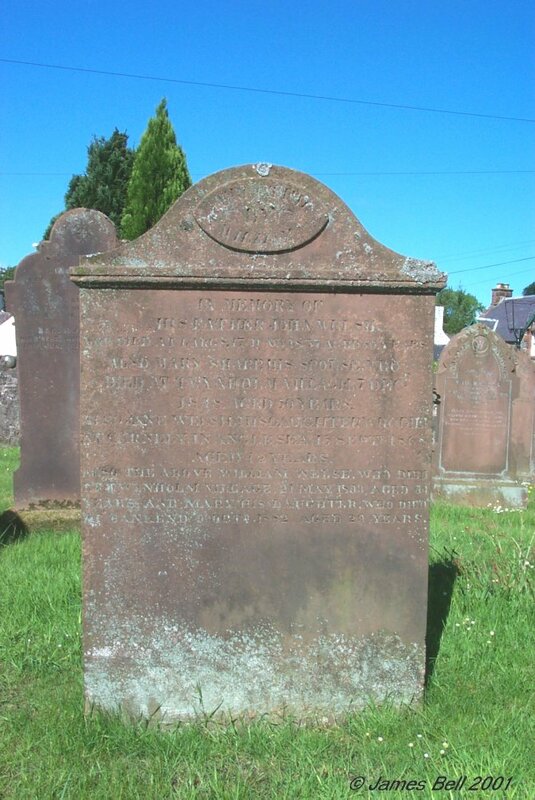 107 Sacred to the memory of John McCartney, late in Whitehill, Twynholm, who died 12th Dec'r 1831, aged 66 years. 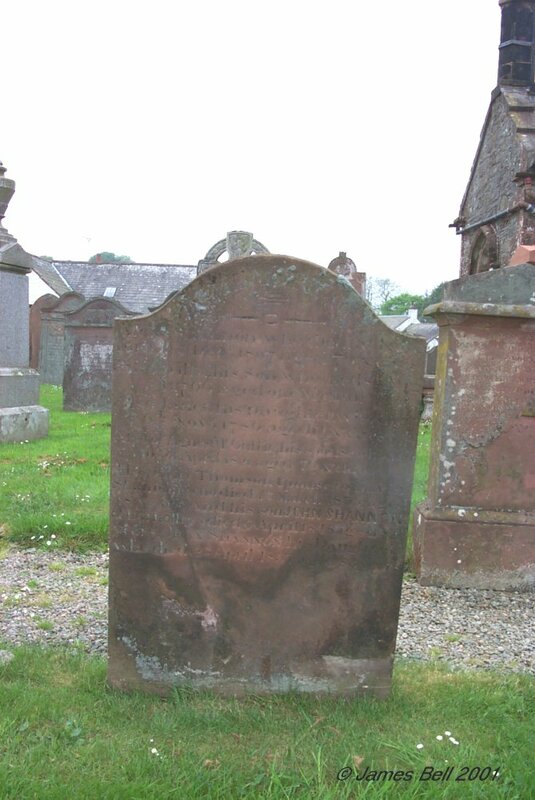 Also Agnes Paterson, his spouse, who died at Moffat, 22nd May 1814, aged 36 years. Also Marion and Elizabeth their children who died in infancy. John their eldest son, died at Twynholm Village, 8th September 1861, aged 63 years. Robert their second son, died 26th April 1866, aged 64 years. John Carter their grandson, died at Twynholm Village, 15th Sept'r 1868, aged 24 years. James, their third son, died 7th June 1866, aged 62 years. 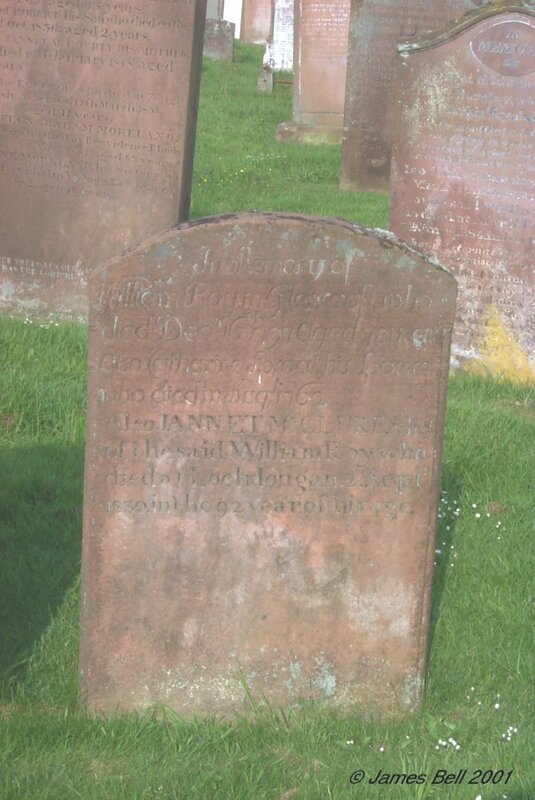 Also Janet McCartney their daughter, who died at Mid Boreland, Kirkcudbright, 12th Oct'r 1888, aged 81 years. 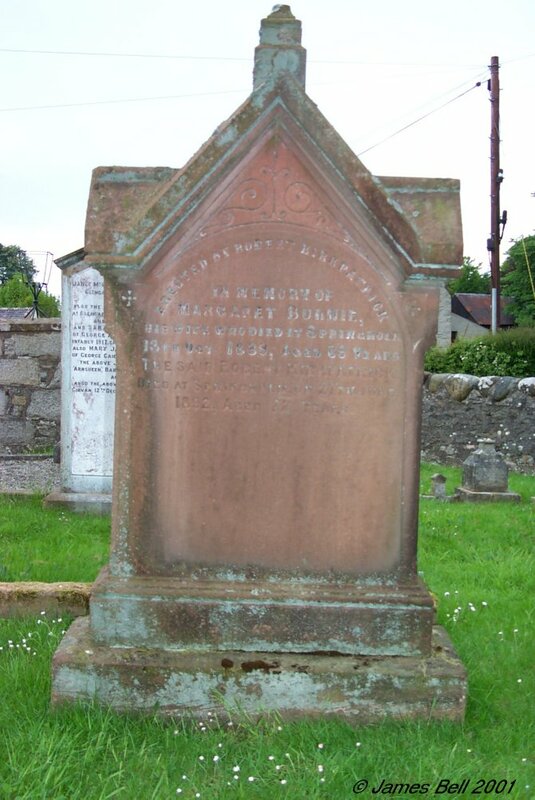 Also Mary McCartney, widow of John Bland, who died at Creetown, 8th Dec'r 1888, aged 85 years. 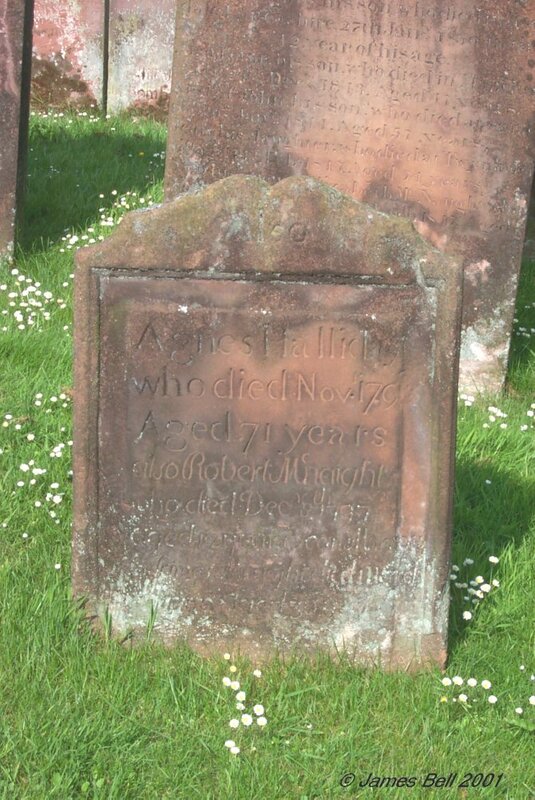 Reverse - Also Agnes Halliday who died Nov 1793, aged 71 years. Also Robert McNaight who died Dec 8th 1797 aged 12 years. 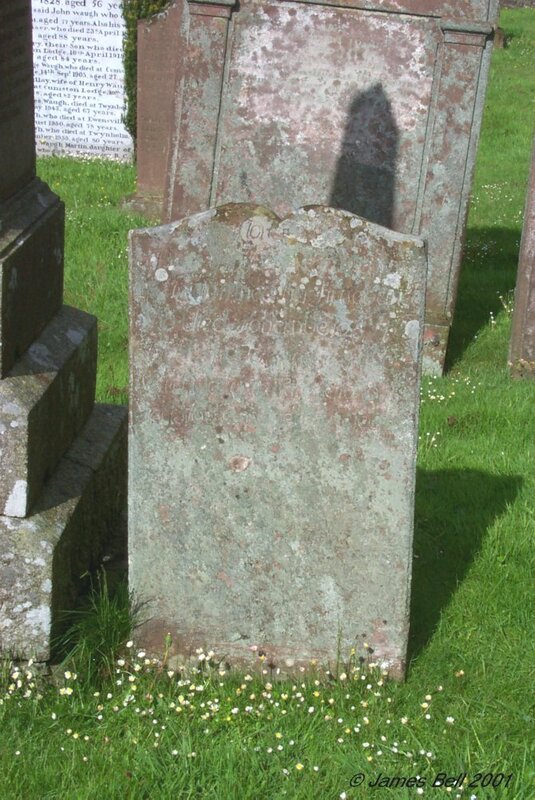 Also James McNaight, died March 27th 1799 aged 36 years. 109 Sacred to the memory of Margaret Heron, spouse to Alexander McNaught, who died at Rhonehouse, 8th July 1833, aged 81 years. And of their children, viz: James, Andrew, John and Anthony who died in infancy. Robert died in Dec. 1797, aged 12 years. Thomas died in Jan'y 1802 aged 5 years. Alexander who died at Nappanee, North America, on the 30th March 1824 aged 30 years. 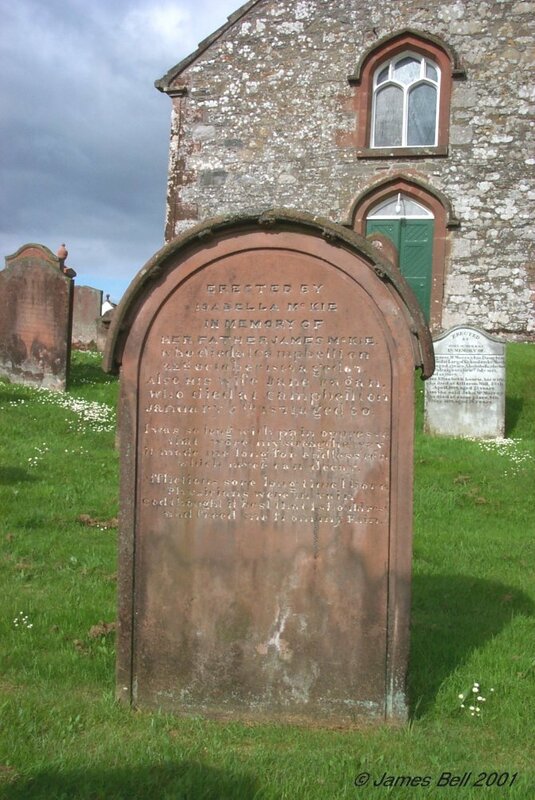 The said Alexander McNaught who died at Castle Douglas, on the 1st of April 1836, aged 86 years. 110 Erected by James Donnan in memory of Jane McBride, his wife, who died at Twynholm Village, 24th August 1890, aged 68 years. 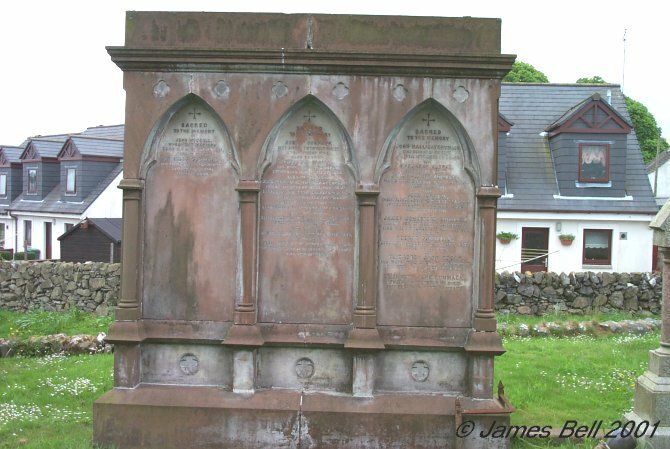 The above James Donnan, died at Station Road, Dalbeattie, 18th March 1897, aged 80 years. 111 Erected by Jane Sneddon, in memory of her husband William Donnan, died at Keltonhill, 17th Nov'r 1884, aged 24 years. 112 In memory of Jean Nabbon, who died at Cumston Wood, on the 11th December 1815, in the 66th year of her age. 113 In memory of William Moffat ,who died at Moatvale, 26th January 1899, aged 45 years. For 15 years Schoolmaster in this Parish. Also Thomas, his son, died 14th October 1893, aged 7 years and 11 months. 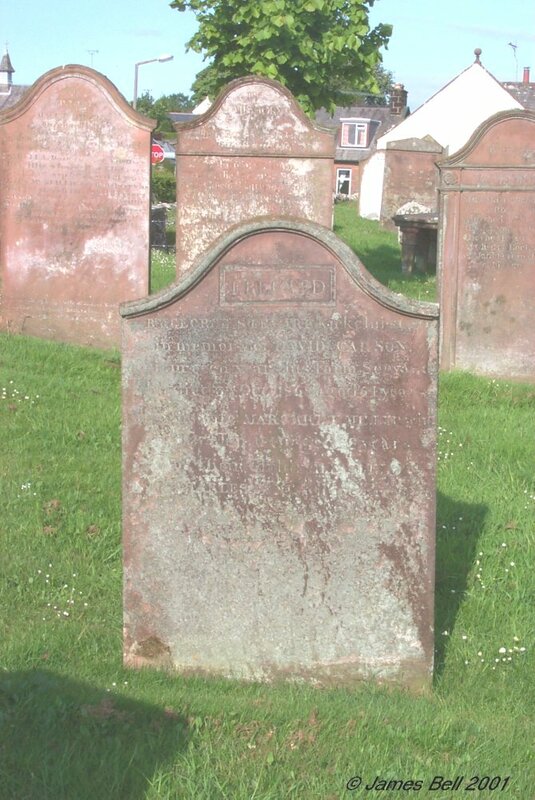 Also Agnes Helen, wife of the above, who died at Kirkcudbright, 22nd April, 1921 aged 74 years. 114 Sacred to the memory of James Campbell, who died at Barlocco, 3rd January 1869, aged 53 years. Also sons of the above, viz: John who died in infancy. John who died at Barlocco, 2nd May 1877, aged 28 years. 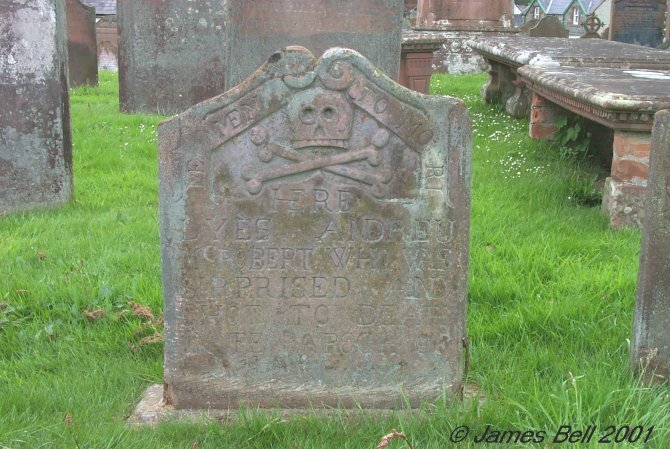 Peter who died at Gribdae, Kirkcudbright, 6th Jan'y 1878, aged 20 years. Also Margaret, daughter of the said James Campbell, wife of Charles Henderson, who died at Overlaw, 2nd October 1887, aged 32 years. Also their infant son George. 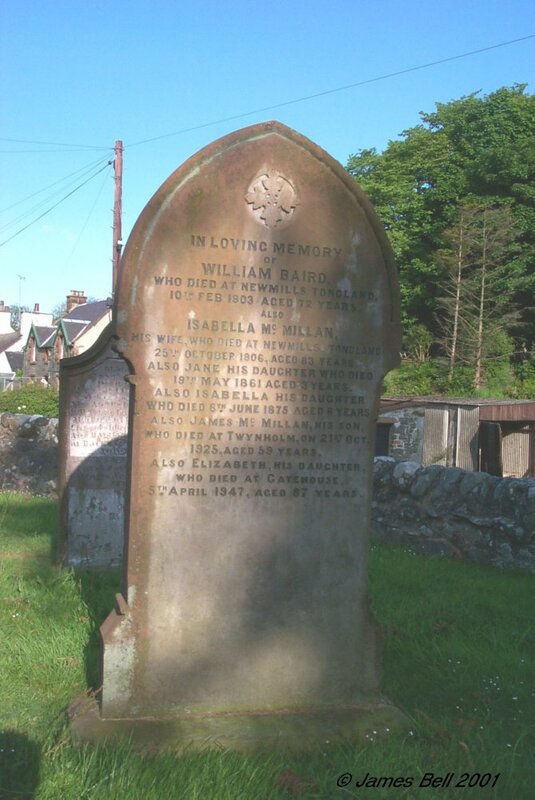 Also Marion Baird, relict of the above James Campbell, who died at Corsock, Colvend, 27th January 1897, aged 83 years. 115 In memory of William McKeand who died at Twynholm Village, 23rd April 1883, aged 80 years. David his son, who died at Liverpool, 7th June 1883, aged 49 years. Jane Rae, daughter of the above David McKeand, who died at Twynholm Village, 28th July 1872 aged 45 years. 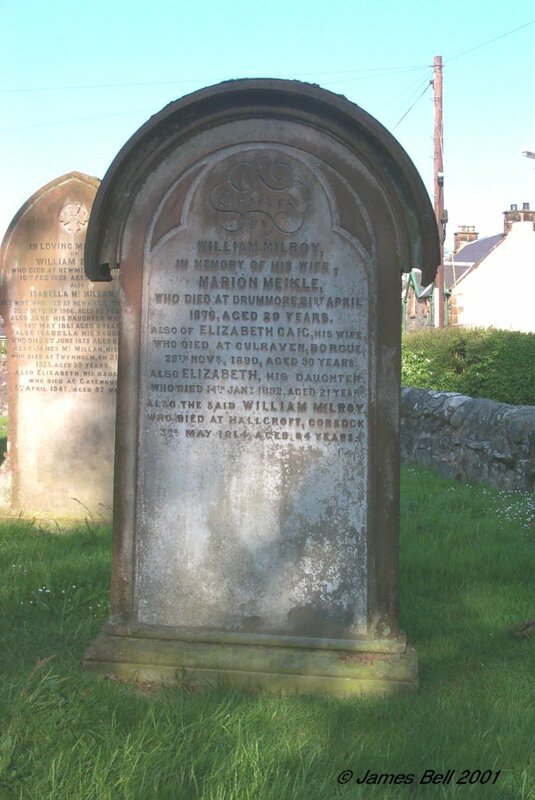 Mary Melville Hair, wife of the above William McKeand, who died at Twynholm, 26th Feb'y 1889, aged 82 years. William their son, who died at Liverpool, 10th March 1905, aged 62 years. Gordon their son who died at Sydney, N.S.Wales, Australia, 3rd Oct 1906 aged 73 years. Alexander their son, who died 14th July 1923, in his 74th year. Jane Dickson, beloved wife of James McKeand, who died at 27 Vandyke St., Liverpool, 17th Nov 1920 aged 70 years. Alexander their son, who died 14th July 1923, in 74th year. Also James McKeand, fifth son of the above William McKeand ,who died at 27 Vandyke St., Liverpool, 15th February 1927, in his 84th year. 116 a. Erected by Samuel Dinnell, in loving memory of Catherine Tole, his wife, who died at Twynholm, 30th March 1905, aged 49 years. 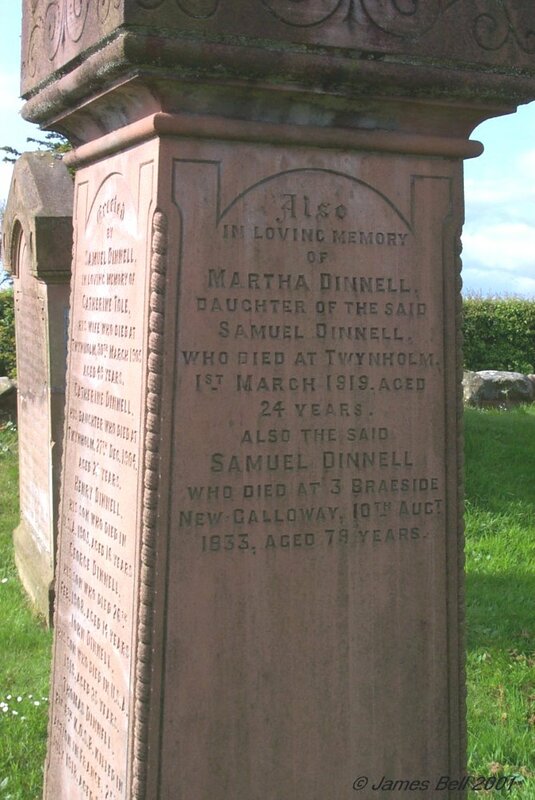 Catherine Dinnell, his daughter, who died at Twynholm, 27th Dec 1904, aged 22 years. Henry Dinnell, his son, died in U.S.A. 1905 aged 15 years. George Dinnell, his son, who died 26th Feb 1908, aged 14 years. John Dinnell, his son who died in U.S.A. 1919 aged 35 years. Thomas Dinnell, Pte 6th K.0.S.B. killed in action in France, 25th July 1918, aged 25 years. b. Also in loving memory of Martha Dinnell, daughter of the said Samuel Dinnell, who died at Twynholm, 1st March 1919, aged 24 years. 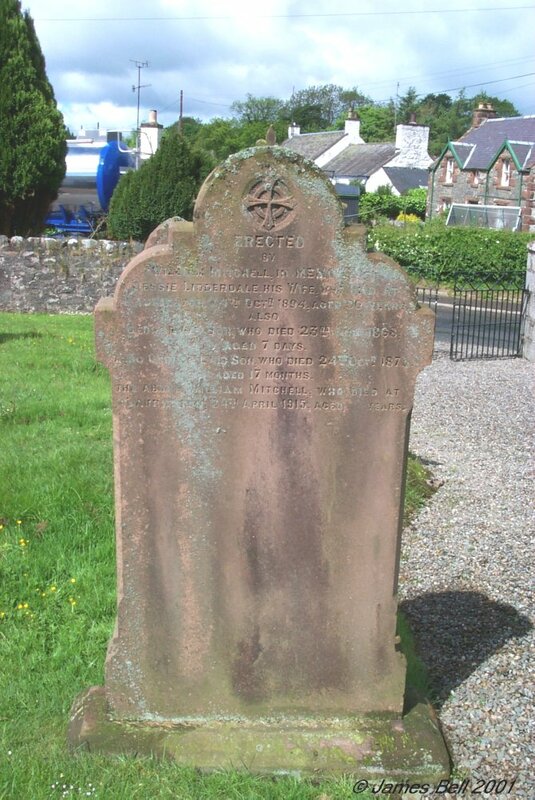 Also the said Samuel Dinnell who died at 3 Braeside, New Galloway, 10th Aug 1933 aged 79 years. 117 Sacred to the memory of William Taylor, Ship Master, who died at Moatvale, Twynholm, on the 5th August 1885, aged 71 years. Be ye therefore ready also; For the son of man cometh at an hour when ye think not. Luke XII Ch., & XL Vr. 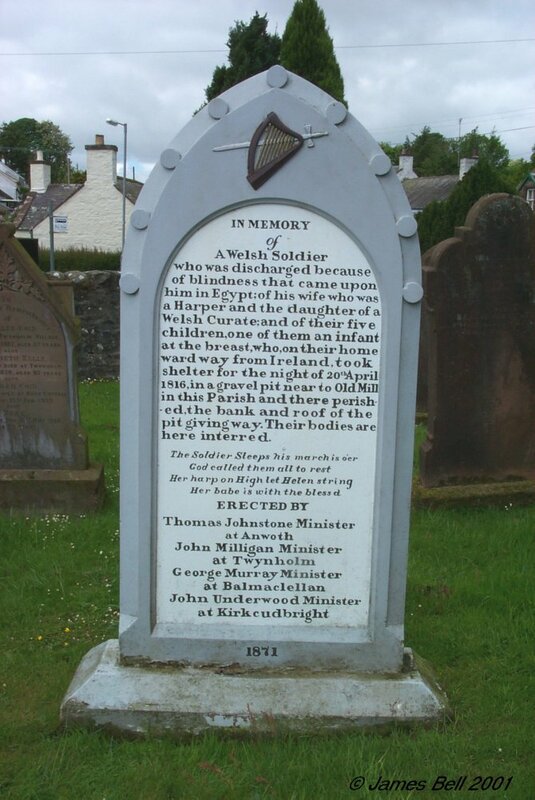 118 In loving memory of William McMinn, who died at Kirkcudbright, 24th July 1941, aged 64 years. Also his wife Sarah Campbell, who died at Twynholm, 30th March 1917, aged 40 years. 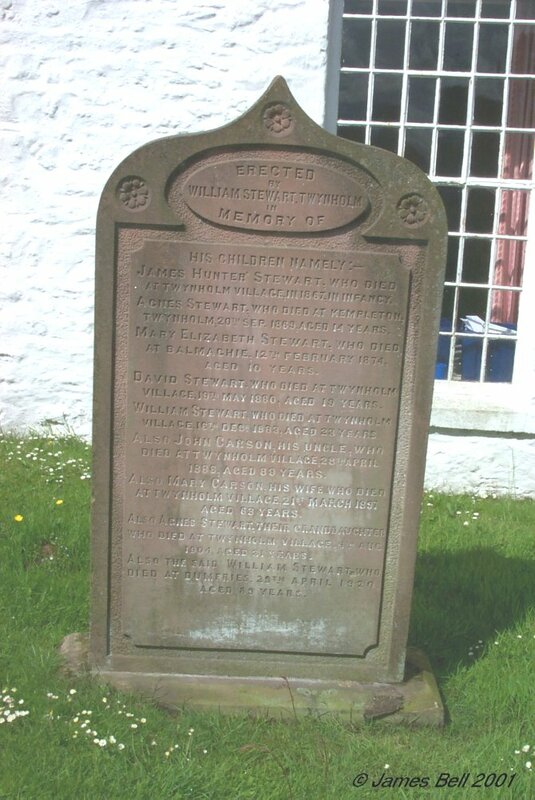 119 Erected by John Stewart, in memory of his father John Stewart, who died at Kirkchrist, 23rd May 1828, aged 36 years. Also his mother Margaret McMillan, who died 14th Feb 1860, aged 75 years. Also his daughter Jessie, who died 3rd March 1854, aged 9 years. 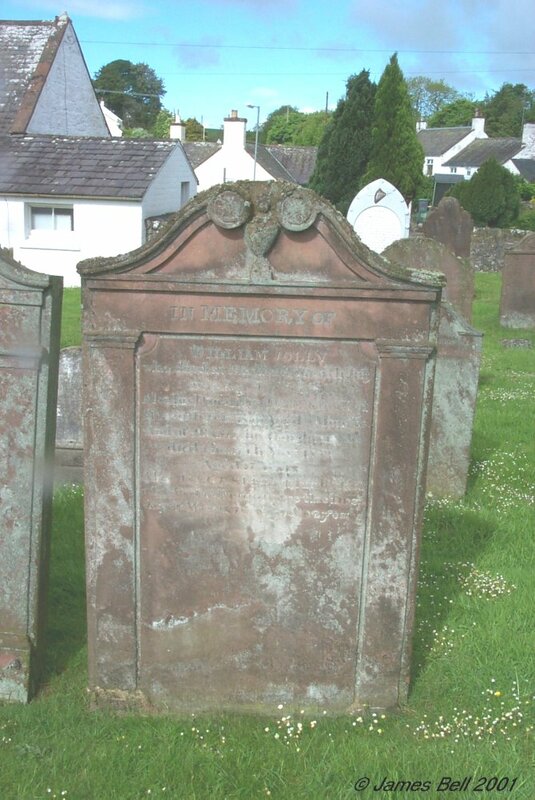 Also his wife Janet Cooper, who died at Dalbeattie, 2nd June 1887, aged 77 years. 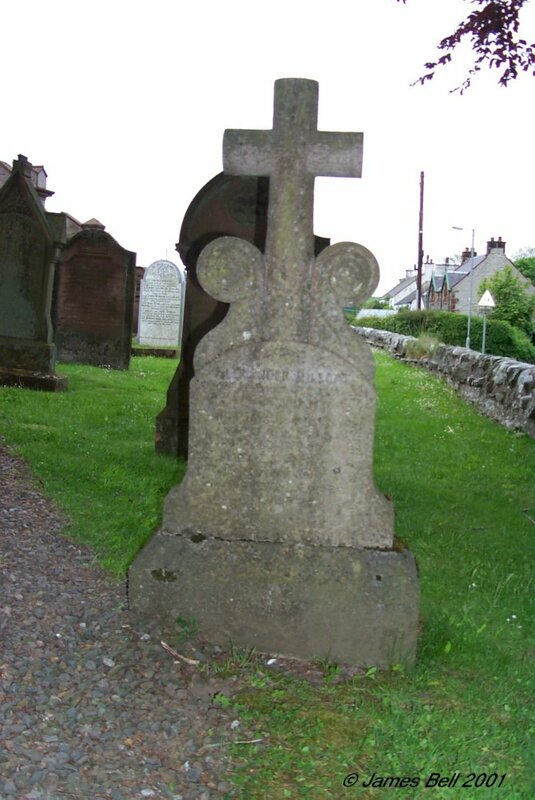 Also the above John Stewart, who died at Dalbeattie, 4th Feb 1892 aged 78 years. 120 In loving memory of Elizabeth McGeorge, wife of William Payne, who died at Roselea, Twynholm, 21st December 1927, aged 86 years. Also the above William Payne, who died at Roselea 23rd June 1933, aged 89 years. Also James Payne, their son, who died at Arden, Twynholm, 30th July 1947, aged 79 years. 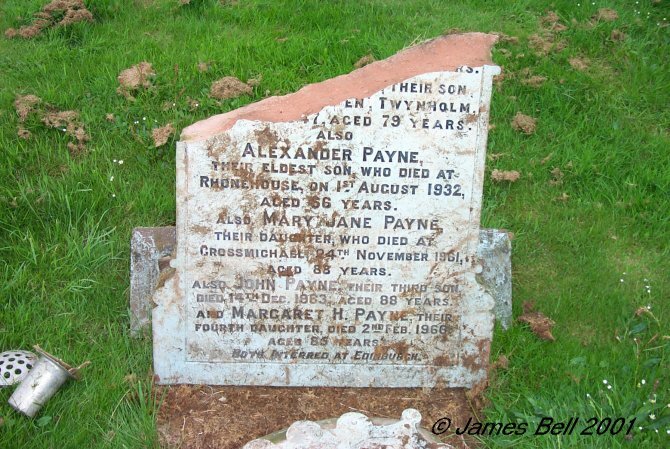 Also Alexander Payne, their eldest son, who died at Rhonehouse on 1st August 1932, aged 66 years. Mary Jane Payne, their daughter, who died at Crossmichael, 24th November 1961, aged 88 years. Also John Payne, their third son, died 14th Dec. 1963, aged 88 years. And Margaret H. Payne, their fourth daughter, died 2nd Feb. 1966, aged 85 years. Both interred in Edinburgh. 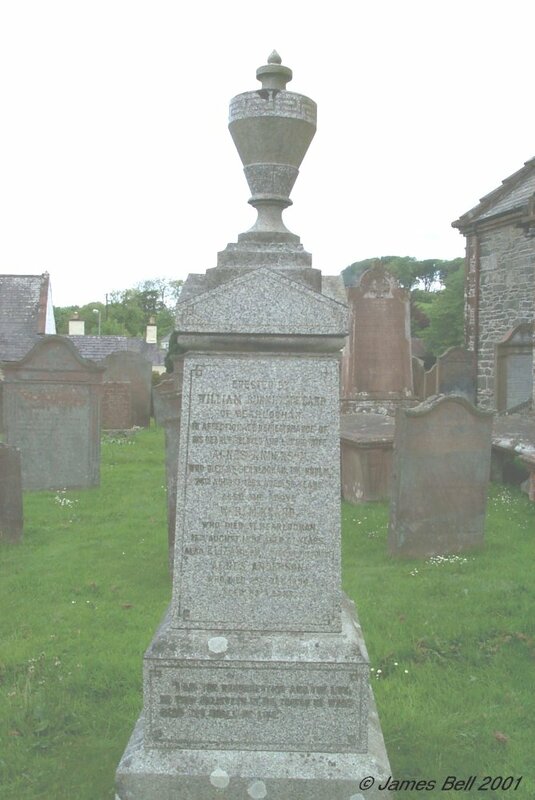 East Pedestal: In memory of John Halliday, late in Bombie, who died at Balgreddan 30th April 1857, aged 63 years. 122 Spero in deo. Erected by John Grant, in memory of Daniel Grant, who died at Village of Twynholm, 23d Aug't 1840, aged 21 years. Capt. Alex'r Grant who died at Brass River, Coast of Africa ,30th Dec'r 1861, aged 39 years. Capt'n John, his son, was lost at sea, 30th April 1864, aged 48 years. James his son, died 14th Nov'r 1866, aged 52 years. Mary his daughter, who died in Otaga, New Zealand, 17th of June 1867, aged 32 years. Also the above John Grant, died March 31st 1872, aged 90 years. Rossie Laurie Mackintosh widow of John Grant, died aged 96. 124 Erected by Elizabeth Dunlop, in affectionate remembrance of Robert Paton, her husband, who died at Barstibly, 25th Oct r 1869, aged 72 years. Also Thomas & Janet their children who died in infancy. Also the above Elizabeth Dunlop who died 4th March 1876, aged 76 years. Also their grandchild Robert Paton, son of John Paton, who died at Trostrie, 3rd January 1885 aged 4 years and 2 months. Also William Jolly Paton, son of the said John Baton, who died at Barclosh, Kirkgunzeon, 5th March 1888, aged 2 months. Also the said John Paton, who died at Barclosh, Dalbeattie, 9th November 1915, aged 72 years. 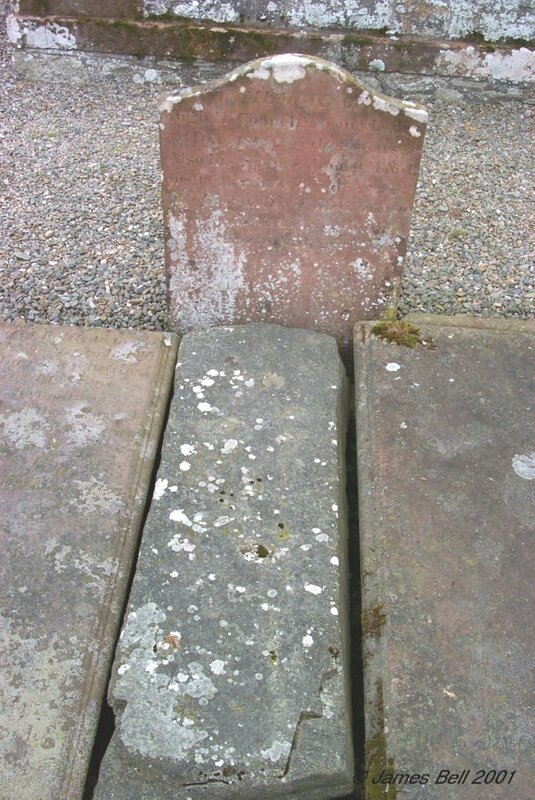 Interred in Kirkgunzeon Churchyard. Also Elizabeth Collins, wife of the above John Paton, who died 12th October 1916, aged 63 years. 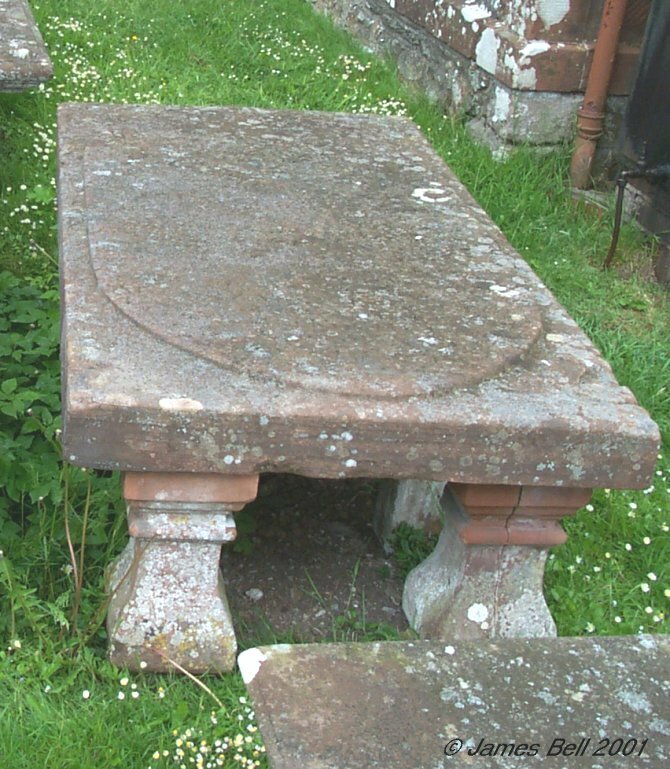 Interred in Kirkgunzeon Churchyard. Also John Paton, Corporal, Royal Scots, youngest son of the above, who fell in action in France, 1st July 1916, aged 21 years. 125 In loving remembrance of Janet, dearly beloved, and only daughter of John and Janet Charters, who died at Moat Croft, Twynholm, 31st March 1890, aged 10 years and 10 months. Also the above John Charters, who died at Moat Croft, Twynholm, on the 3rd October 1930, aged 79 years. Also Janet McAllister, his wife, who died at Moat Croft, Twynholm, 28th March 1932, aged 75 years. 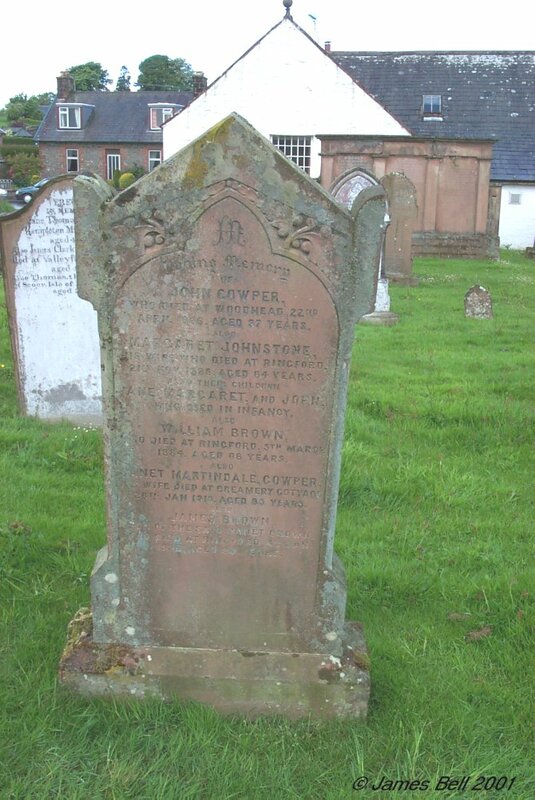 Also John McAllister Charters, their son, who died at Moat Croft, Twynholm, 30th June, 1964, aged 82 years. Also Janet Walker McCartney, wife of the above John Charters, who died at Moat Croft, Twynholm, 22nd August 1967, aged 86 years. 126 Erected by Isabella McKie, in memory of her father James McKie, who died at Campbellton, 22d October 1869, aged 67. Also his wife Jane Pagan, who died at Campbellton, Janaury 5th 1871, aged 80.
and freed me from my Pain. 127 Erected by William Stewart, Merchant, Twynholm, in memory of Isabell Henrietta, his daughter, who died 10th Nov'r 1869, aged 3 months. Also James Stewart his son, who died 31st March 1881, aged 15 years. Also Isabella McEwen, his wife, who died 22nd April 1881, aged 43 years. William Candlish Stewart, born Sept 2nd 1875, died June 4th 1914. Also Joanna Grieve his wife who died at Brae- side House, Twynholm, April 17th 1915. And his son-in-law, Pte., W. R. Grierson, Cameronian Scottish Rifles who died from wounds in France, 26th April 1917. He died the noblest death a man may die, fighting for God and Right, and Liberty, and such a death is immortality. Also the above William Stewart, who died 6th November 1919, aged 80 years. But once I pass this way, and then - no more, for no man travels time, the great highway, that climbs through darkness up to light, - through night to day. Also Jane Grieve, wife of J.J. Grierson, died 24th Oct 1927, interred at Anwoth Cemetery. And Maggie Isa Robson, wife of the above W. R. Grierson, died 30th Oct 1934, interred at Inverness, daughters of William Stewart. 128 In loving memory of John McQuarrie, who died 7th December 1942, aged 75 years. Also Agnes Burnie, his wife, who died 24th May 1937, aged 68 years. Also James, their son, killed in action March 1917. Also Fred, thir son, accidentally killed 15th March 1915, aged 11 years. Also John, their son, who died 10th September 1993, aged 84 years. Also Mary Oag, their daughter, who died 21st January 1994. 129 Erected by James Anderson, in memory of Jane Wilson, who died at Trostrie, 28th Oct 1868, aged 77. 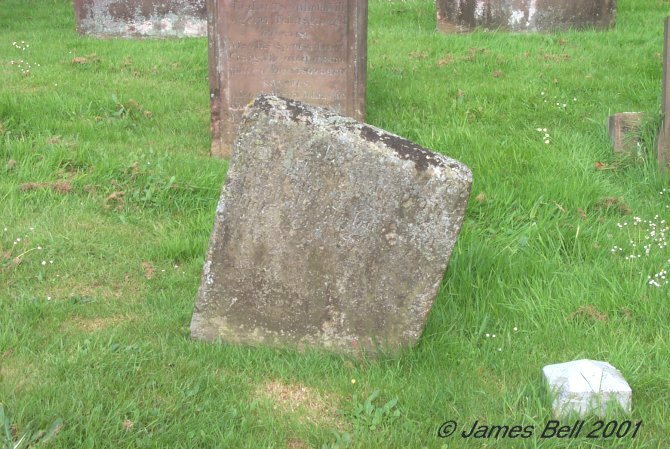 Agnes Ingles, daughter of the above Jane Wilson, and wife of the said James Anderson, died at Muiryard, Borgue, 8th Feb 1872, aged 43. Also Elizabeth Marion Anderson, his daughter, who died 23rd March 1884, aged 4 years and 3 months. Also the above James Anderson, who died at Fairgirth, Colvend, 18th May 1911, aged 87 years. Also of Jane Campbell, wife of the above James Anderson, who died at Campbelton, 11th Nov 1926, aged 83 years. Also James Anderson their son, who died at Campbelton, 11th April 1950, aged 55 years. 130 Erected by Mary Jardine in memory of Jane Jardine, her sister, and wife of William McVinnie, who died at High Compstone, on the 27th September 1866, aged 27 years. Also of their children James, who died 10th Feb'y 1861 in infancy, John who died 25th Oct'r 1864, aged 5 years, James Anderson who died 26th Oct 'r 1864, aged 7 months, Mary Elizabeth who died 10th March 1867, aged 8 months. 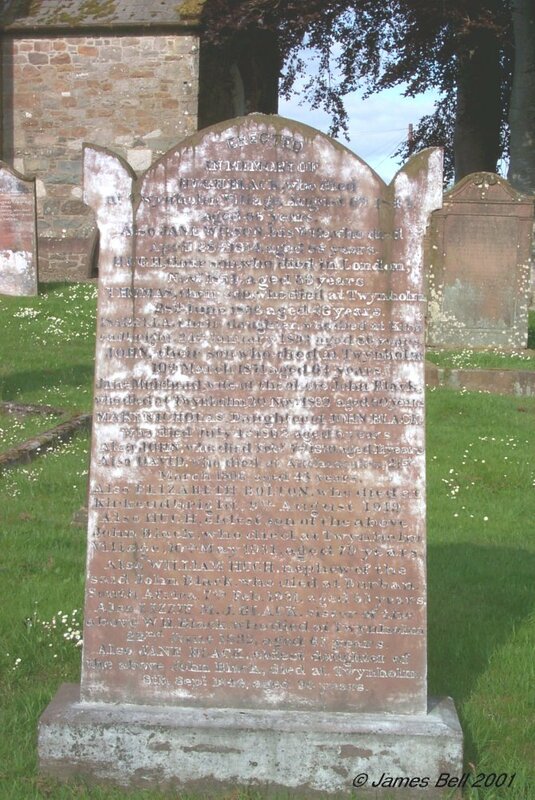 131 Erected by Janet McAdam in affectionate remembrance of Thomas Ferguson, her husband, who died at Compston, 7th August 1869, aged 58 years. The said Janet McAdam, died at same place 18th April 1870, aged 60. 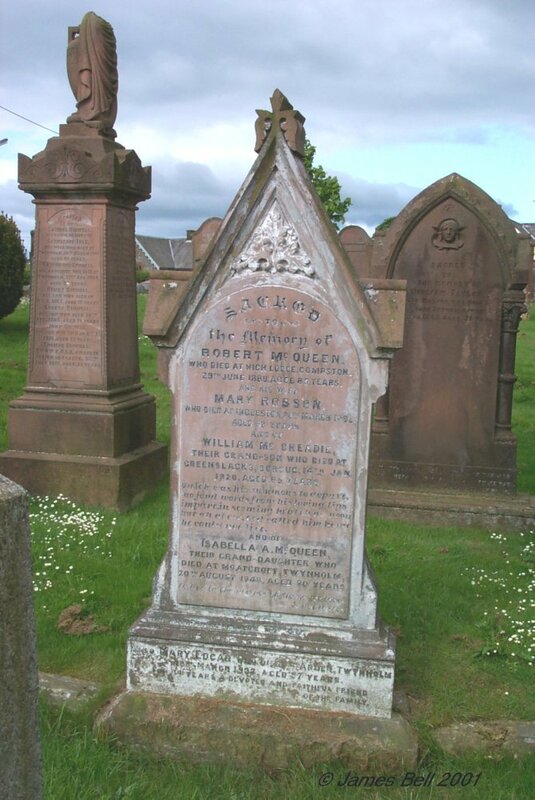 132 Sacred to the memory of Robert McQueen who died at High Lodge, Compston, 29th June 1889, aged 83 years. And his wife Mary Robson, who died at Ingleston, 26th March 1895, aged 87 years. 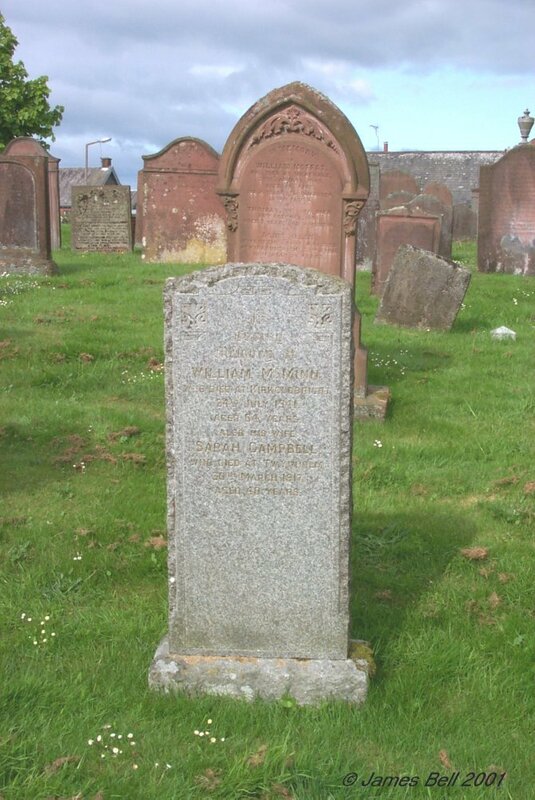 And of William McCreadie, their grandson, who died at Greenslacks, Borgue, 14th Jan 1920, aged 65 years. Quick was his summons to depart, no fond words from his loving lips impart, in seeming health at noon, but ah at eve, God called him home he could not live. And of Isabella A. McQueen, their grand-daughter, who died at Moatcroft, Twynholm, 20th August 1948, aged 80 years. Also Mary Edgar, who died at Arden, Twynholm, 18th March 1932, aged 57 years, for 14 years a faithful and devoted friend of the family. 133 In memory of Elizabeth Weer who died at Twynholm Village 13th April 1874 aged 82 years. 134 In loving memory of Mary Jane McCulloch, beloved wife of Samuel Gordon, who died at Barstibly, 16th June 1924, aged 45 years. Also Agnes Jane Gordon, their daughter, died at Meiklewood 14th September 1904, in infancy. Also John Carter Gordon, their son, died at Meiklewood, 6th July, 1908, aged 7 years. Also the above Samuel Gordon, who died at Rambler Cottage, Tongland, 30th January 1937, aged 86 years. Also William Campbell Gordon, their son, who died at Cardiff, 24th Aug. 1950, aged 33 years. Also Mary Helen Gordon, their daughter, who died at Dumfries Infirmary, 1st June 1985. 135 In loving memory of Jamie, youngest son of Robert A. Graham, Auchengassel, died while bathing in River Dee, 18th June 1926, aged 13 years. Also the above Robert A. Graham, who died 17th March 1947, aged 75 years. Also Margaret Armstrong, his wife, who died 21st April, 1982, aged 98 years. 136 In memory of James Gordon who died at Mayfield, 5th Jan'y 1900, aged 68 years. 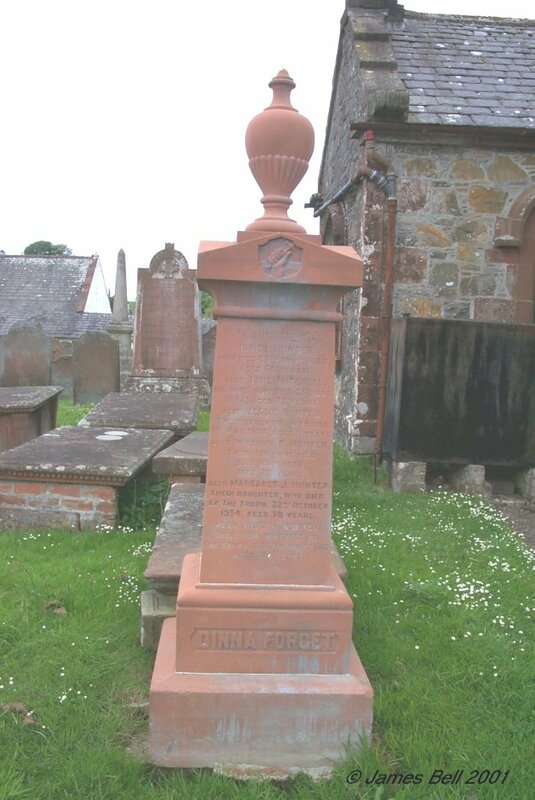 Also Maggie, his daughter, who died at Dumfries Infirmary, 13th Sept'r 1891, aged 23 years. Also Annie McGhie, his wife, died at Mayfield 28th April 1915, aged 79 years. David his son died 30th June 1922, aged 63 years. Also Jean Gordon, wife of the above David Gordon, who died 14th Dec 1927, aged 74 years. Erected by his family. 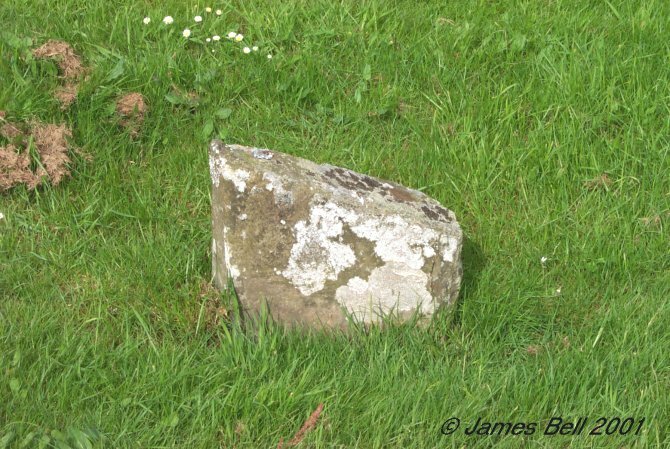 137 (Small stone in front of #136) In loving memory of Alasdair, son of John and Anne Caig, grandson of the above Jean Gordon, who died at Dalvair, Twynholm, 10th February 1941, aged 14 years. 138 In memory of John Gray, who died at Redfield, Twynholm, 20th May 1895 aged 80 years. Isabella Kirkwood his wife, who died at Carse, Twynholm, 22nd April 1898, aged 73 years. Also Duncan Gray their son who died at Twynholm, 20th April 1948, aged 86 years. Also Peggy daughter of the said Duncan Gray, and wife of Wilfrid Kirkham, who died at Leyland, 10th Oct 1946, aged 37 years. Cremated at Blackpool. 139 In loving memory of Samuel Hart Maxwell, who died at Star Hotel, Twynholm, 9th August 1922, aged 50 years. Also William H. Maxwell, his son, who died in infancy. Also Jane C. B. Henderson, wife of the above, died at Cottage Hospital, Castle Douglas, 17th May 1929, aged 62 years. 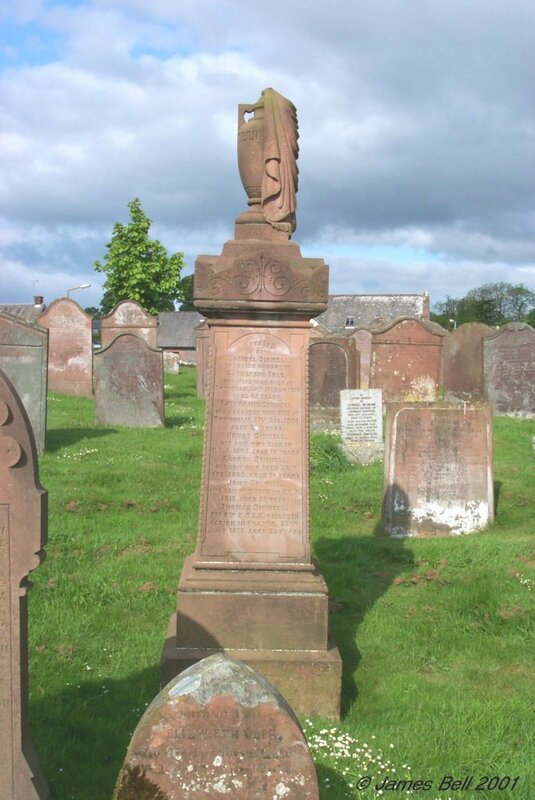 140 Erected by William Haddow, in affectionate remembrance of Annie Patterson, his wife, who died at Woodhouse, Jedburgh, on the 11th January 1898, aged 34 years. David Patterson his father-in-law, who died at Twynholm Village, 31st July 1898, aged 64 years. Ann Philips, wife of the above David Patterson, who died at Dryfeholm, Lockerbie, March 1st 1911, aged 84 years. John their son who died at Liverpool, April 27th 1913, aged 56 years. 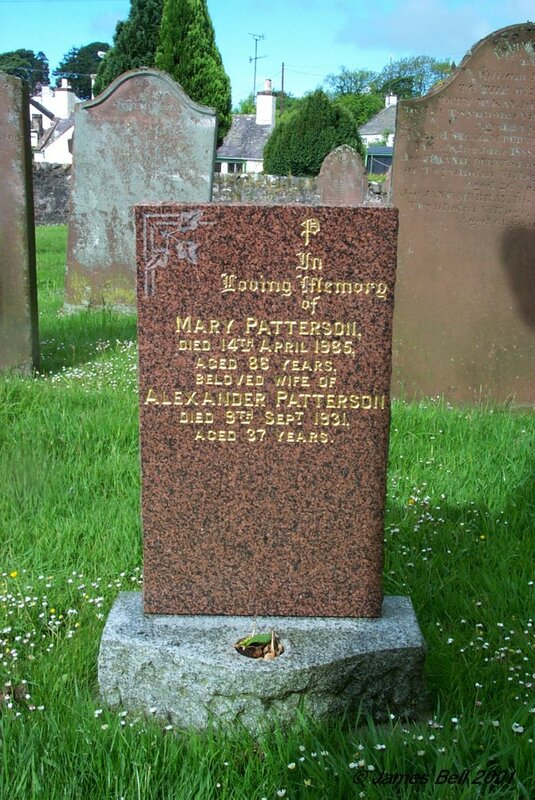 Also Mary Patterson, daughter of the above David Patterson, who died at Cresswell Hill, Dumfries, 24th May 1945, in her 85th year. 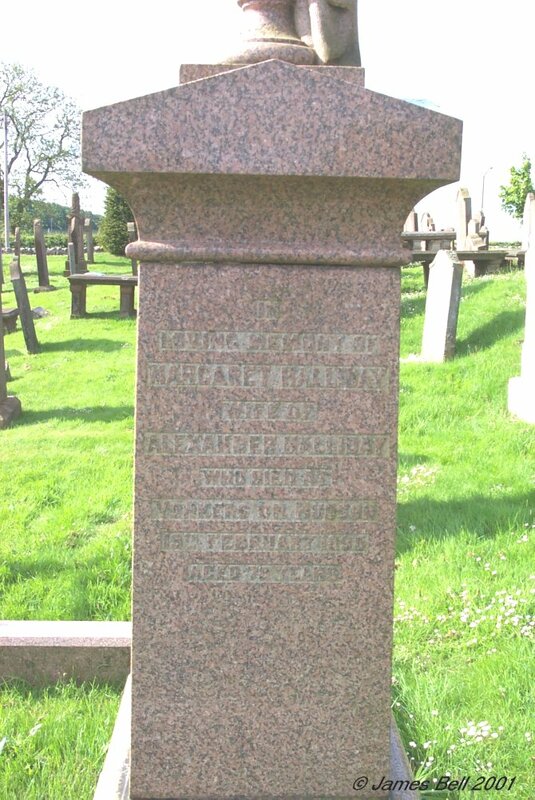 Also Alfred, grandson of the above David Patterson, died at Edinburgh 27th Sep 1949, aged 65 years. 141 In loving memory of William Arres, who died at Welltrees, 2nd Dec. 1913, aged 74 years. And Agnes Montgomery, his wife, who died at same place, 2nd March 1923, aged 85 years. Also Agnes Elspeth Arres, their daughter, who died July 1885, aged 15 years. 142 In memory of Elizabeth McClellan, wife of David Halliday of Chapmanton, who died at Kirkcudbright, 26 June 1822 aged 36 years. And of James Halliday of Mullock, who died at Leith, 15 June 1829, aged 77 years. 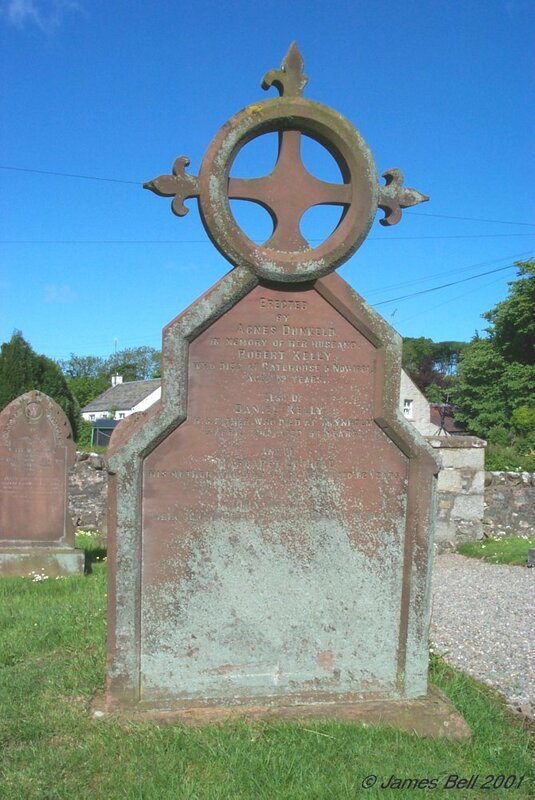 Also the said David Halliday who died at Kirkcudbright, 20 June 1831, aged 77 years. 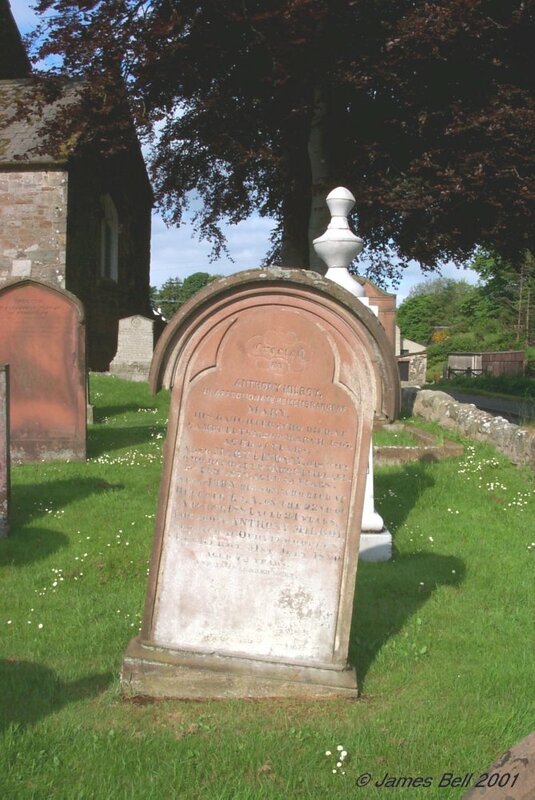 And of David his son who died at Auchencairn, 22 August 1837, aged 22 years. 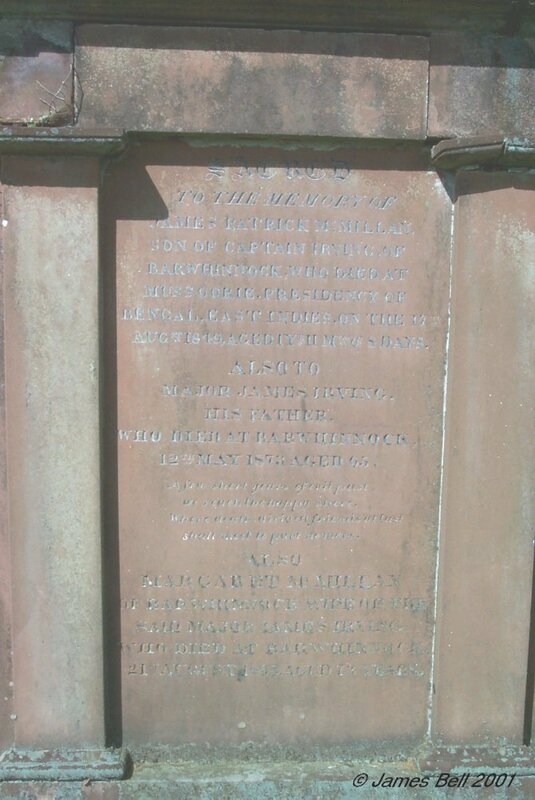 Also of James Halliday, M.D., his son who died at Castle Douglas, 4 December 1841 aged 29 years. 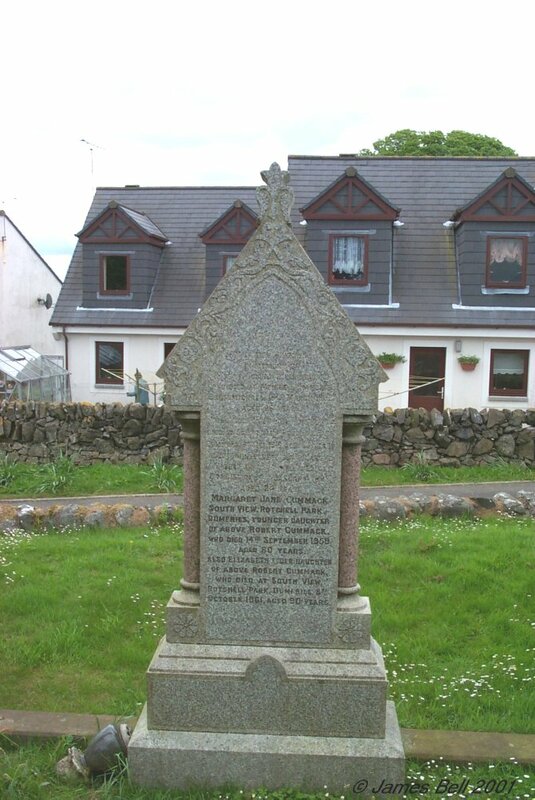 143 Erected by Margaret Cummack, in memory of Robert Cummack, her husband, who died at Meikle Ernambrie, Crossmichael, 15th March 1882, aged 66 years. Margaret Dinwoodie, his wife who died at South View, Rotchell Park, Dumfries, 19th Dec 1916, aged 78 years. Also John, eldest son of the above Robert Cummack, who died at Corbieton, 14th January 1898, aged 24 years. Margaret Jane Cummack, South View, Rotchell Park, Dumfries, younger daughter of the above Robert Cummack, who died 14th September 1959, aged 80 years. Also Elizabeth, elder daughter of above Robert Cummack, who died at South View, Rotchell Park, Dumfries, 8th October 1961, aged 90 years. 144 Centre. 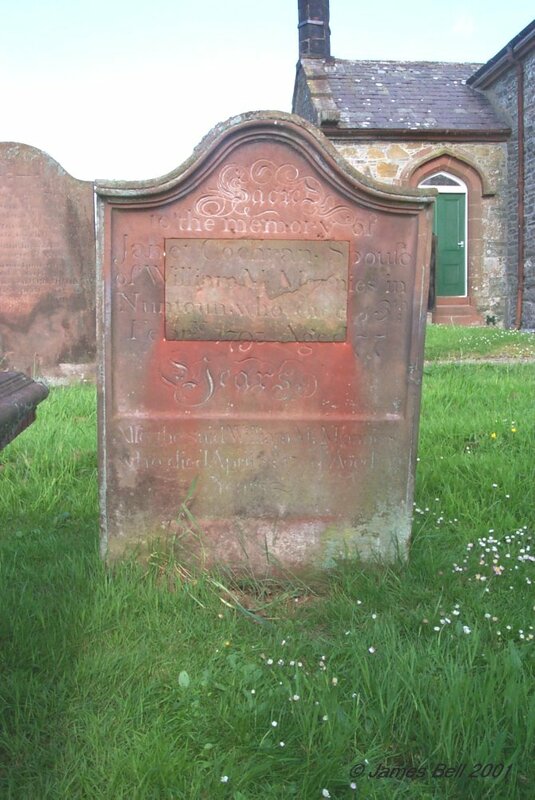 Sacred to the memory of Robert Cummack, who died at Twynholm Mains, 11th September 1828, aged 84 years. Euphemia Carter his wife, died at Bankend, 7th October 1826, aged 77 years. 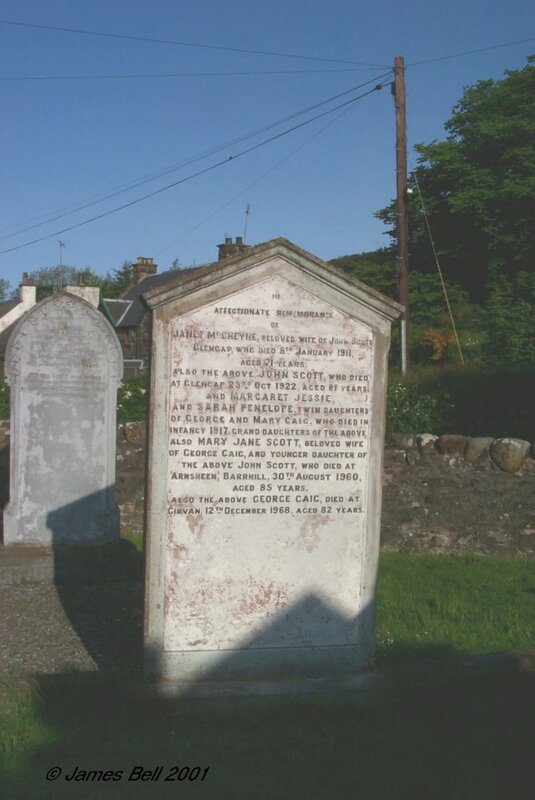 Also of their son John Cummack, who died at Lochhill, 7th May 1872, aged 84 years, and his wife Nicholas Halliday, died at Lochhill, 8th March 1868, aged 83 years. And of their children viz:— Euphemia, died at Mains, 15th April 1855, aged 34 years. 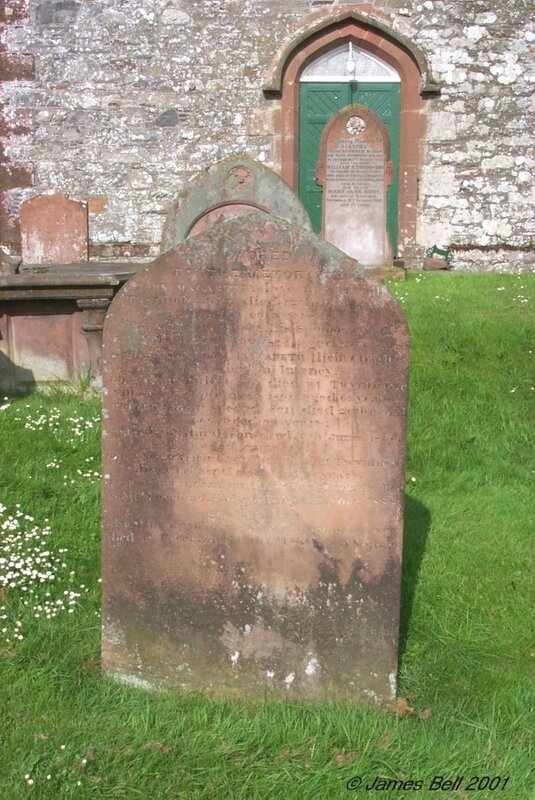 Margaret, died at Church Place, Kirkcudbright, 7th February 1885, aged 71 years. Nicholas died at Glencroft, 1st May 1888, aged 66 years. 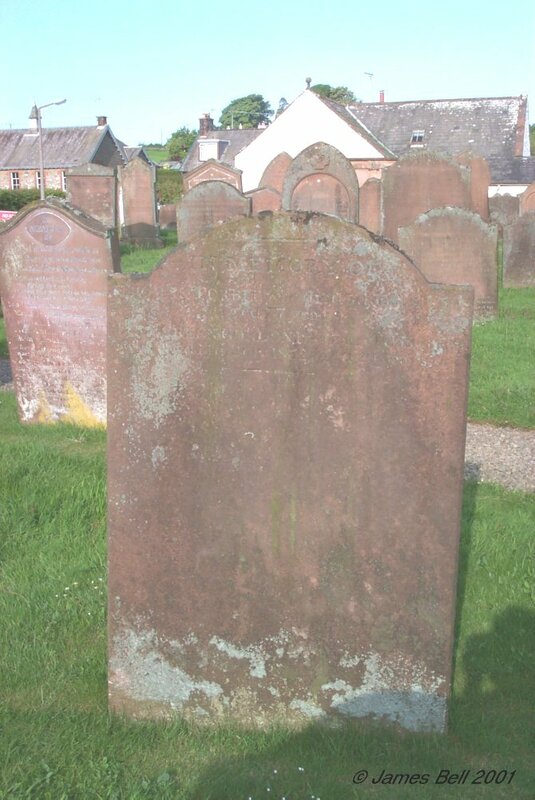 Jane, formerly of Church Place, Kirkcudbright, died at Glencroft ,14th March 1890, aged 78 years. Right. Sacred to the memory of John Halliday Cummack, who died at Glencroft, 16th April 1897, aged 72 years. Also Margaret Murray, wife of the above John Halliday Cummack, who died at Glencroft, 14th Oct 1912, aged 74 years. 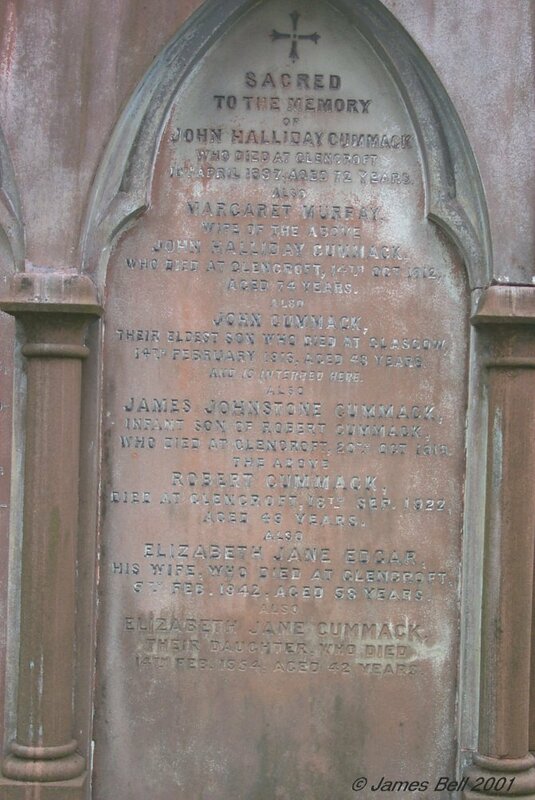 Also John Cummack, their eldest son, who died at Glasgow, 14th February 1913, aged 43 years. And is interred here. Also John Johnstone Cummack, infant son of Robert Cummack, who died at Glencroft, 20th Oct 1918. The above Robert Cummack, died at Glencroft, 18th Sep 1922, aged 49 years. Also Elizabeth Jane Edgar, his wife, who died at Glencroft, 5th Feb 1942, aged 58 years. Also Elizabeth Jane Cummack, their daughter, who died 14th Feb 1954, aged 42 years. Left. Sacred to the memory of John McCoull who died at Meridon, Conn., U.S.A., 9th April 1871, aged 50 years. 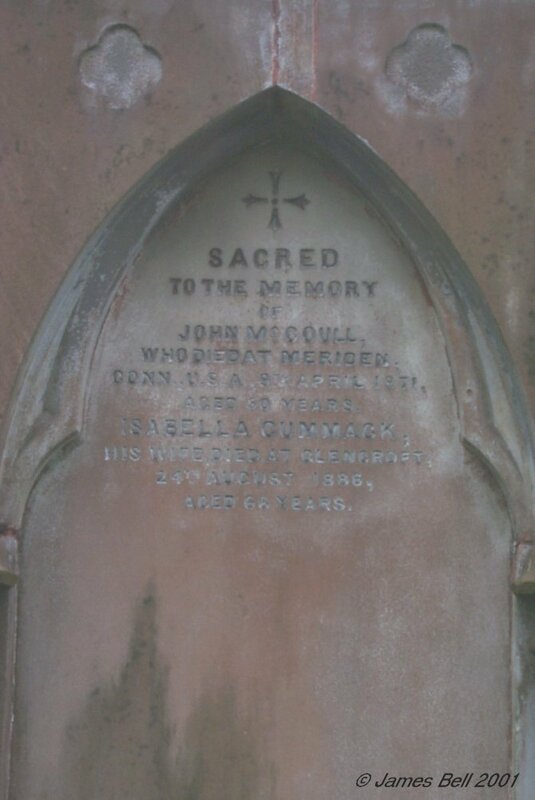 Isabella Cummack, his wife, died at Glencroft, 24th August 1886 aged 66 years. 145 a. Sacred to the memory of Alexander Meggat, who died at Boreland, Borgue, 28 March 1867, aged 49 years. Grace Paterson his spouse, who died at Boreland, Borgue, 4 Sept 1882, aged 64 years. b. Mary Meggat, their daughter, who died at Glengap, Twynholm, 12 June 1851, aged 10 months. 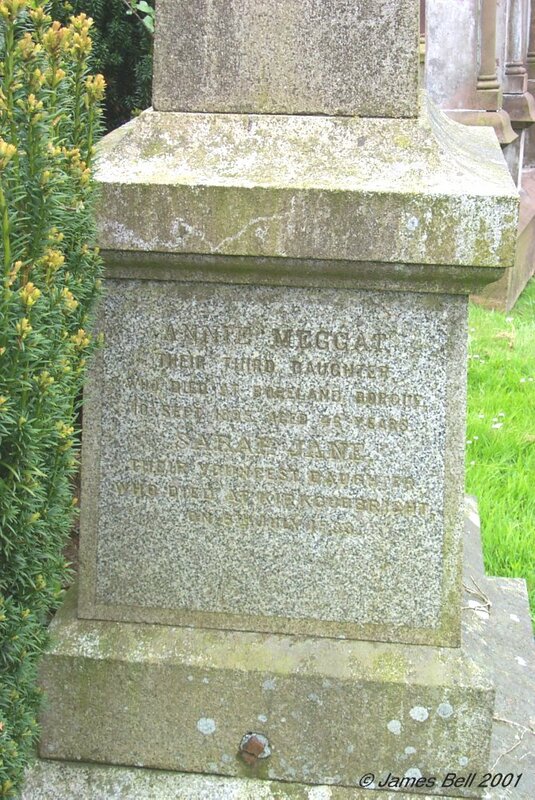 William Meggat, their son, who died suddenly at Castle Douglas, 19 Sept 1892, aged 38 years. Mary Meggat, their fifth daughter, who died 24th November 1937, aged 86 years. c. Annie Meggat, their third daughter, who died at Boreland, Borgue, 10 Sept 1895, aged 46 years. Sarah Jane their youngest daughter, who died at Kirkcudbright, on 6th July 1939. 146 Erected by Samuel McCormick, in memory of his father Thomas McCormick, who died at Twynholm, 28th June 1912, aged 80 years. And his mother Isabella Hastings, who died at Twynholm, 3rd April 1904, aged 72 years. Also Margaret their daughter, who died at Kirkcudbright, 18th Oct’r 1916, aged 56 years. 147 Erected by John and Robert Johnston, in memory of Margaret Mitchell their mother, who died at Barnolleys, Parish of Tongland, 16 Oct 1841, aged 56 years. The above Robert Johnston, died at Gatehouse of Fleet, 5th May 1853, aged 38 years. Agnes Alexander his wife died 25th August —-—- aged 42 years. 148 a. In memory of James Hunter, who died 29th Nov’r 1882, aged 60 years. Also Jane Mitchell, his wife, who died 25th Aug 1894, aged 73 years. Also Jessie Hunter, their daughter, who died 1st May 1874, aged 11 years. Also William B. Hunter, their son, who died 23rd May 1928, aged 78 years. Also Margaret J. Hunter their daughter, who died at The Thorn, 31st January 1945, aged 84 years. “Dinna Forget”. b. 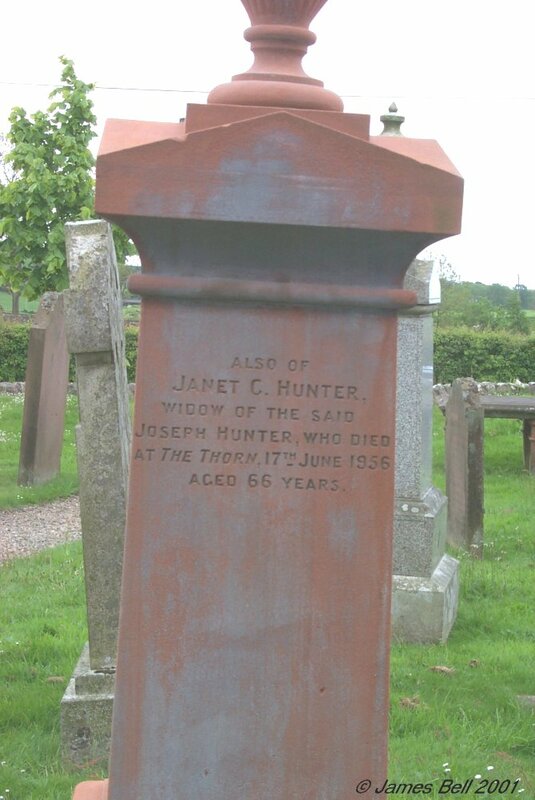 Also of Janet C. Hunter, widow of the said Joseph Hunter, who died at The Thorn, 17th June 1956, aged 66 years. 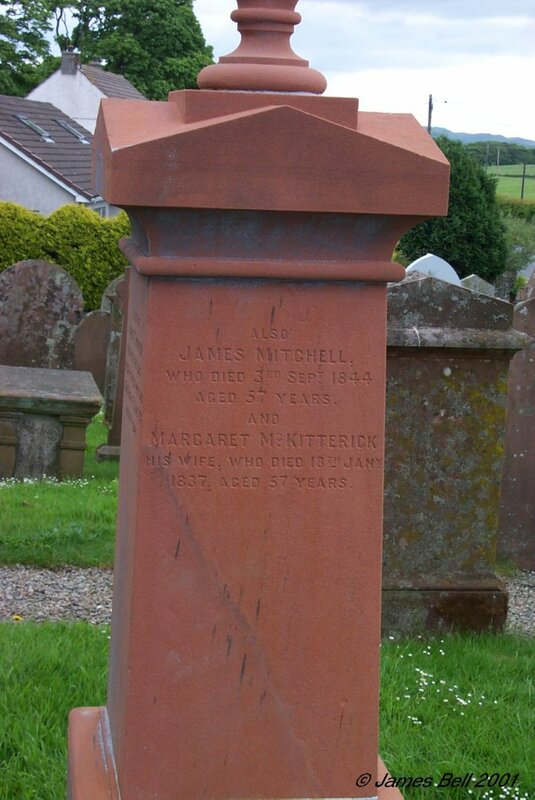 c. Also James Mitchell, who died 3rd Sept 1844, aged 57 years. And Margaret McKitterick, his wife, who died 18th Jan’y 1837 aged 57 years. 149 The inscription on this stone is very faint, and was unreadable. 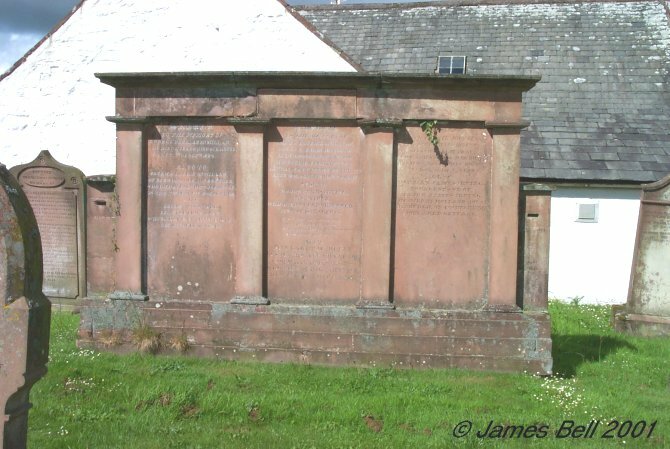 150 Erected by Richard his son, in memory of Thomas Sproat, who died at Colquharn, Tongueland, August 9th 1787, aged 72 years. Reverse: Tongland by Grier of Lagg for his adherence to Scotlands Reformation Covenants Nationall and Solemn League, 1685. 152 In loving memory of William McCulloch Barclay, who died at Mark, 21st March 1904, aged 43 years. 153 Erected by William Burnie McKeand, of Bearlochan, in affectionate remembrance of his dearly beloved and loving wife Agnes Anderson, who died at Bearlochan, Twynholm, 24th August 1889, aged 50 years. Also the above W.,B. McKeand, who died at Bearlochan, 15th August 1892, aged 67 years. Also Elizabeth, sister of the above Agnes Anderson, who died 23rd Oct 1894, aged 53 years. I am the resurrection and the life, he that believeth in me, though he were dead, yet shall he live. 154 In memory of Helen Thomson spouse of Alex’r McClune who died 12th Dec’r 1813 aged 58 years. Also of their children viz:- Janet, Robert, John, Mary and an infant. Also the said Alexander McClune who died 20th May 1829 aged 69 years. Also Dunbar McClune their son who died 4th Aug’t 1829 aged 34 years. John son of Dunbar McClune who died 31st July 1843 aged 20 years. James McClune died in Boston, Massachuetts July 6th 1854 aged 26 years. 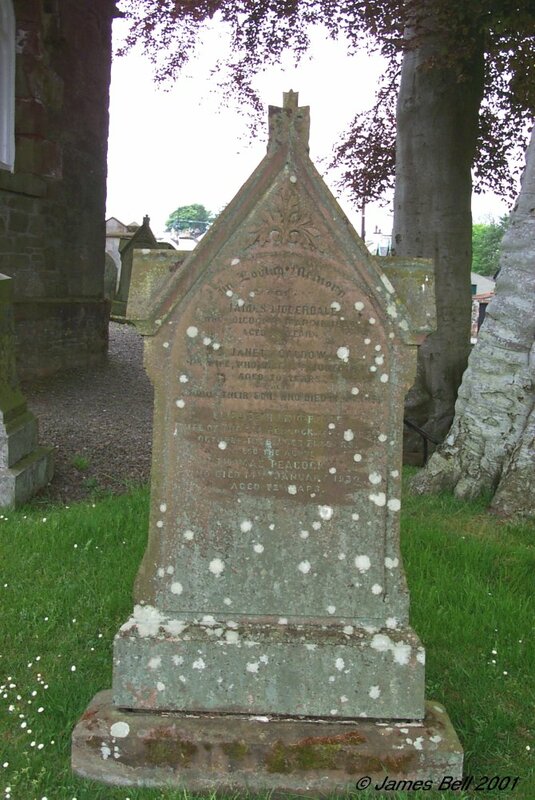 Also Isabella Kirkpatrick widow of Dunbar McClune who died in Boston, 26th April 1877 aged 79 years. 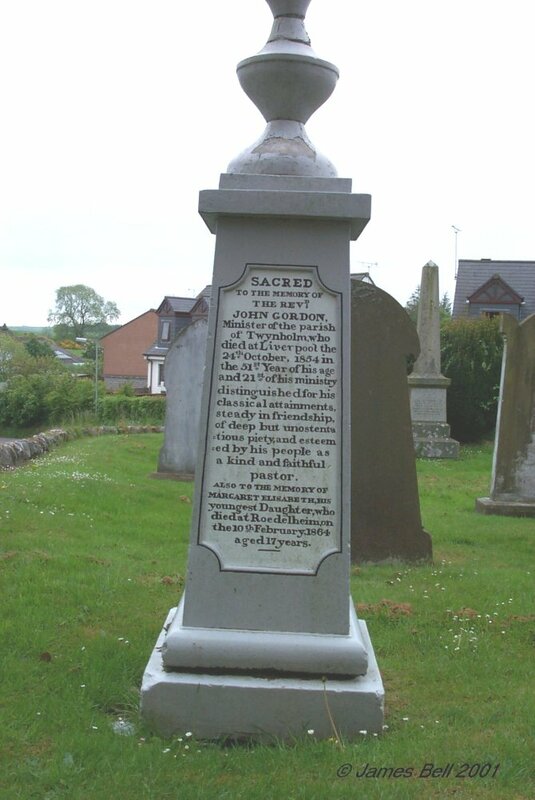 155 In memory of Mr John Johnstone, student of Divinity and Principal Schoolmaster of the Parish of Parton, who died at Drumrash in that Parish, upon Thursday the 9th of March 1890, of a long protracted illness, which he bore with exemplary patience and resignation, aged 28 years. He possessed very considerable talents, both natural and acquired and a portion of prudence and moderation superior to that of most young men, combined with pleasing unaffected manners and the great goodness of heart, and while his attainments and his virtue qualified him in no ordinary degree for that sacred profession on which he was about to enter and promised so fair to adore, they endeared him to a numerous and respectable circle of acquaintances who will long continue to cherish his memory and to regard his untimely fall with the most lively sentiments of regret. 156 In memory of Anne Gaw, spouse of John McNaight of Cumstanend, who died on the 11th of August 1814, aged 57 years. Also of the said John McNaight, who died the 19th Jan’y 1832, aged 87 years. 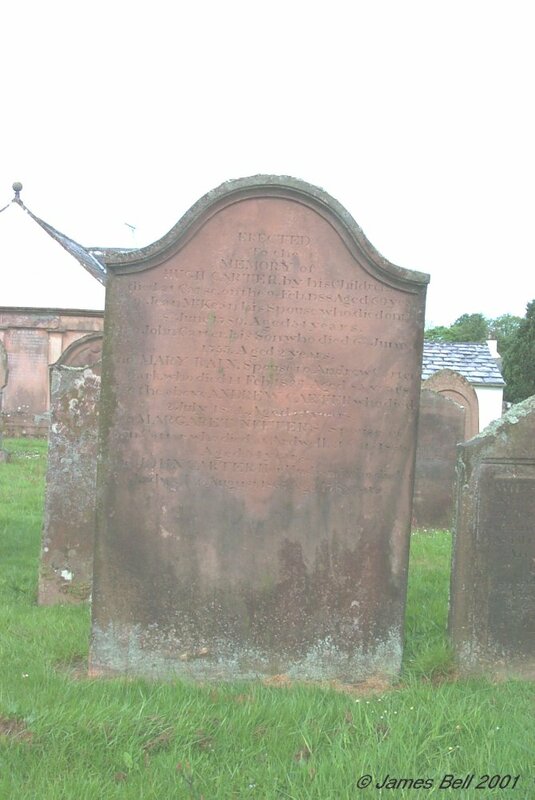 Also Margaret their daughter, spouse to John Clarke in Kirkcudbright, who died 12th March 1824, aged 44 years. Also Elizabeth their daughter, spouse to William Haywood, Manchester, who died 7th Oct’r 1836 aged 37 years. Also Alex’r their son, who died 1st Jan’y 1837, aged 47 years. 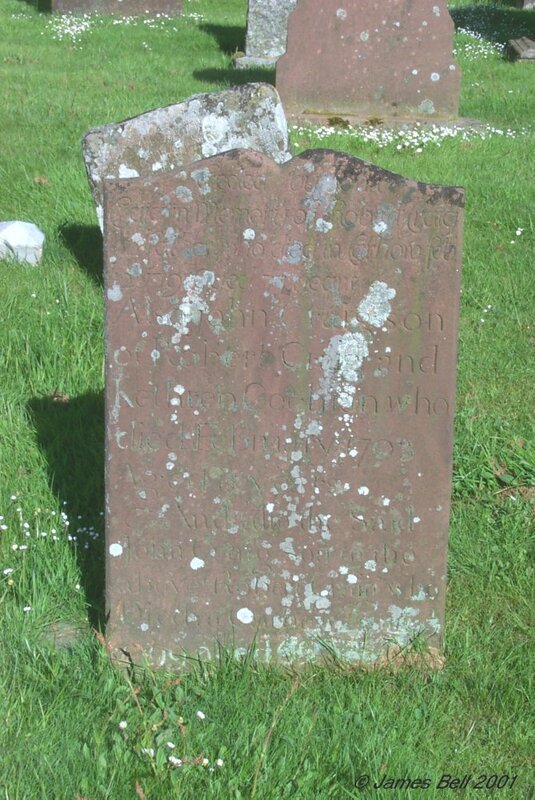 And Sarah their daughter, died at Carse, Kirkcudbright, 4 Sept’r 1859, aged 74 years. 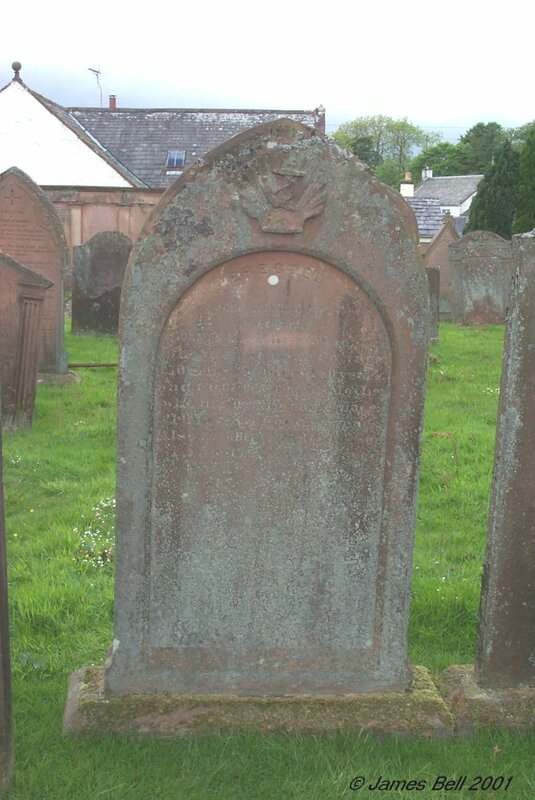 Also their daughter Janet, who died at Upper Carse, 25th May 1861. Reverse: Also Mary, their daughter, and spouse of James Lawrie, Liverpool, who died 29th Fub'y 1858, aged 61 years. 157 Erected by John McKie, C.E.R.N., in memory of James McKie, his father, who died at Doon Cottage, 10th May 1866, aged 80 years. And Grace Charters, his mother, also died at the same place 21st May 1871, aged 87 years. Also Cuthbert Murray, his son, who died 1st June 1871, aged 1? years. 158 In memory of James McKie, who died at Ringford Dec'r 21st 1825, aged 78 years. And Margaret Cochrane, his wife, who died at same place Feb. 14th 1829, aged 86 years. Minnie, their daughter, died at Nunton, April 4th 1801, aged 20 years. William, their son, died at Wigan, Lancashire, Oct. 12 1827, aged 45 years. Marrion, their daughter, died at Cally, Nov. 21st 1838, aged 65 years. Elizabeth, their daughter, died at Ringford 20th August 1850, aged 65 years. 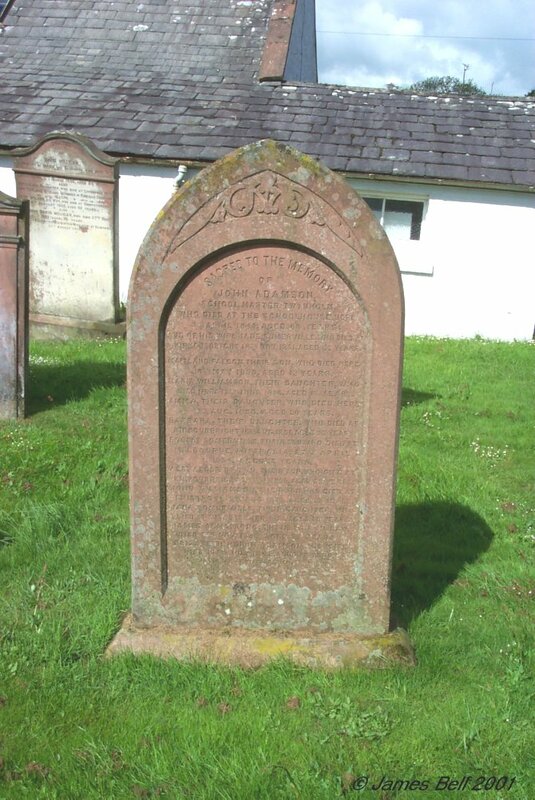 Margaret, daughter of James McKie and Grace Charters, died at Doon Cottage, 31st of October 1881, aged 60 years. 159 To the memory of William Thompson who died April 1st 1804, aged 66 years. Also Mary Reed, his spouse, who died April 23rd 1813 aged 72 years. 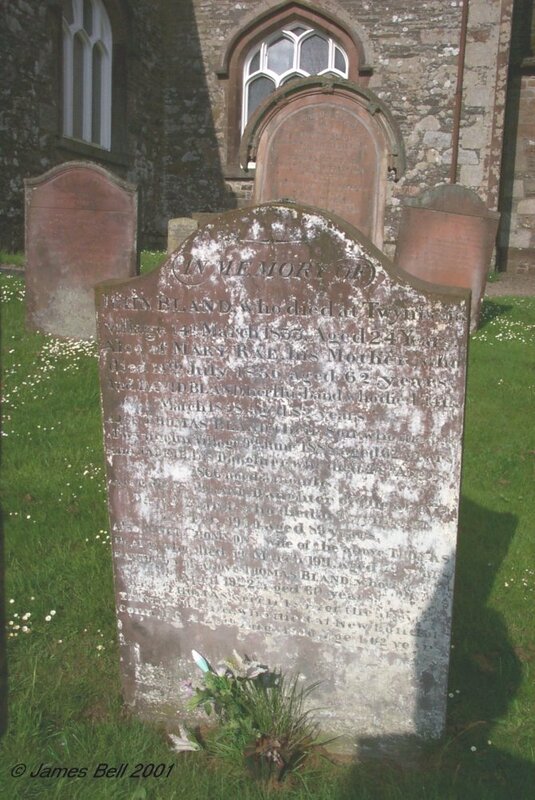 160 Erected in memory of George Bell, mason, who died at Kirkcudbright, 8th Oct’r 1842, aged 65 years. Also his son Andrew, who died 16th Oct 1803, in infancy. Also his daughter Sarah, who died 12th May 1834, aged 23 years. Also his son George, who died 29th July 1839, aged 17 years. 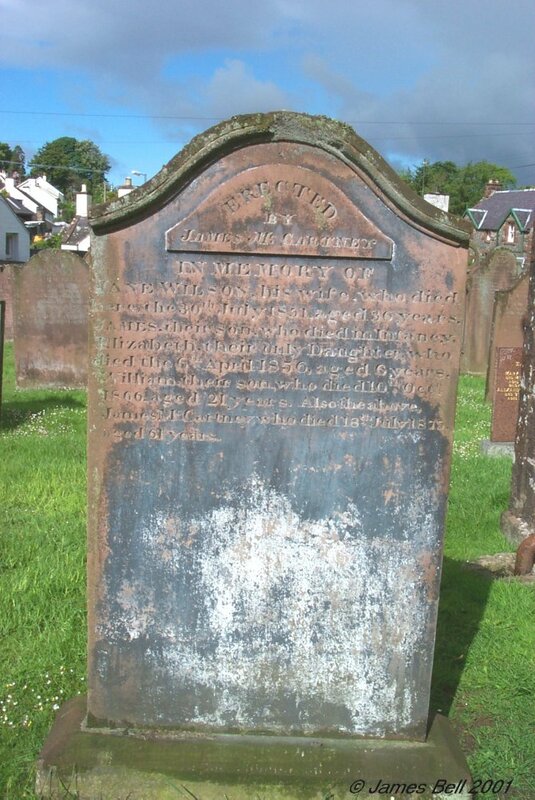 Also his spouse Janet Jardine, who died at Kirkcudbright 29th September 1861, aged 74 years. 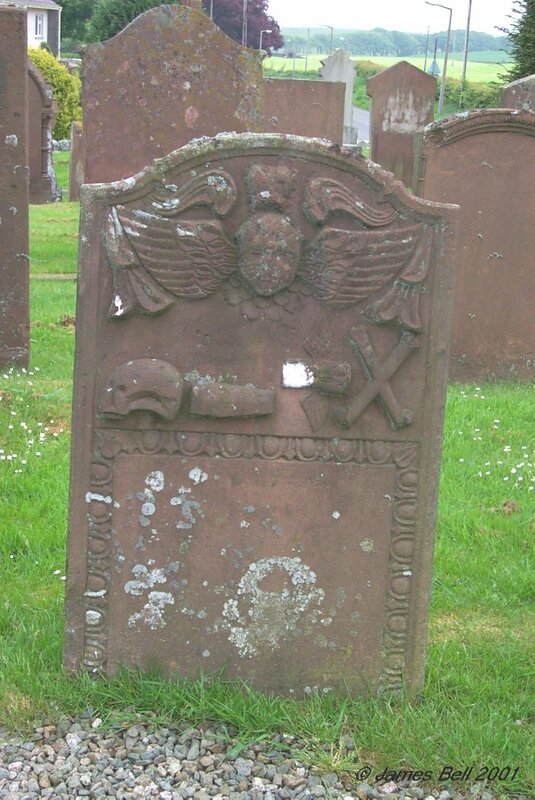 Reverse: In memory of Janet Brackenridge, who died 2nd August 1847, aged 16 months. Andrew Brackenridge, who died 6th January 1862, aged 5 years. Grandchildren of the said George Bell and Janet Jardine. 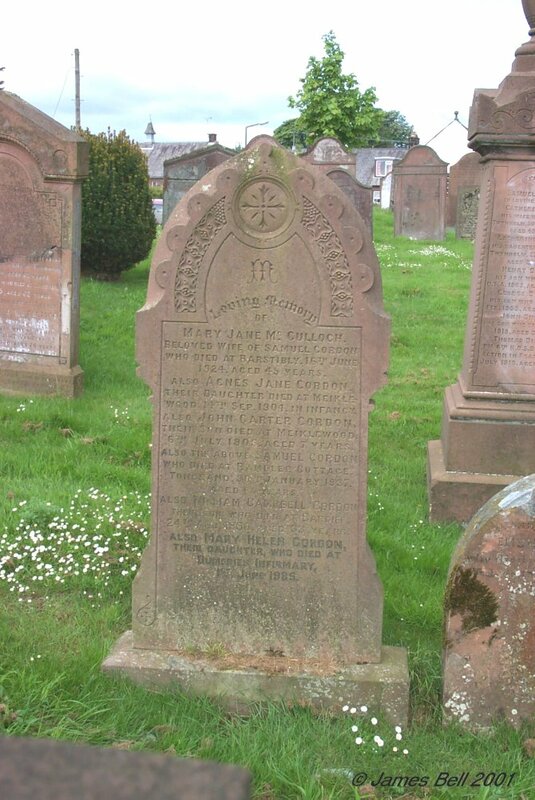 Also Janet Brackenridge who died 20th May 1866 aged 14 years. 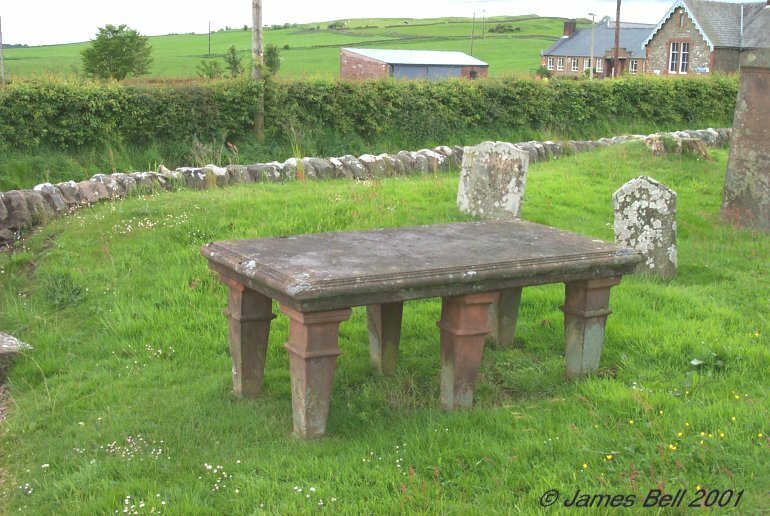 161 Sacred to the memory of James Jardine, who died in Cumston, June 15th 1795, aged 50 years. 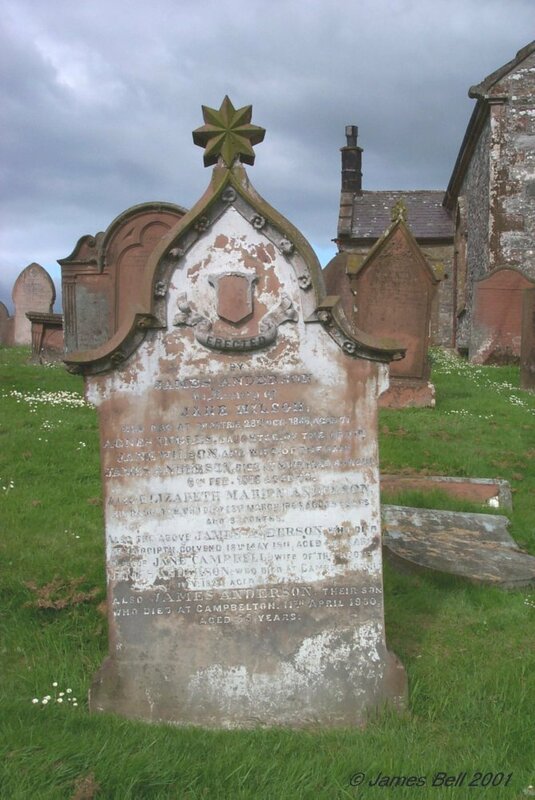 Also his son Robert Jardine, who died 16th May 1808, aged 30 years. And his spouse Mary Johnston, who died 15th Aug’t 1817, aged 70 years. 162 This stone is erected by John Boyd, of Milton of Urr, as a memorial sacred to the memory of Nicholas MacMillan, his first spouse, who died 9th May 1771, aged 21 years. Of Mary Boyd, their only daughter, who died Jan’y 1770, aged 9 months. Of Andrew Boyd, their eldest son, Preacher of the Gospel, who died March 1796, aged 28 years. Of Anne Heron, his second spouse, who died 18th Sept’r 1818, aged 67 years. The above named John Boyd himself, who died at Barbeith House, New Abbey, the 13th Nov’r 1832, aged 88 years, also interred here. He was the last survivor of the numerous family of his father, the singularly venerated Rev'd Andrew Boyd, Minister of the Gospel in the Parish. 163 Inscription very worn. Begins as below, but remainder unclear. 164 Hic situs Rdus. Andreas, Born Tuinholmae, in sacris praepositus ut pastorem si spectes, officis pastorali adeo functus est, ut laudem sibi magnam utilitatem aliis ingentem parapet, ut hominem si tueanis. Humanitatis omnia ita curavit ut miseris misericordia carns. Omnibns suavitate dilectus evaderet. Ob. 16 Apr. 1761. Aetat 67 iffic 35. 165 Here are deposited the remains of the Rev'd John Scott, D.D., late Pastor of this parish, who died on the 7th day of Nov’r 1801, in the 65th year of his age, and 39th of his Ministry. 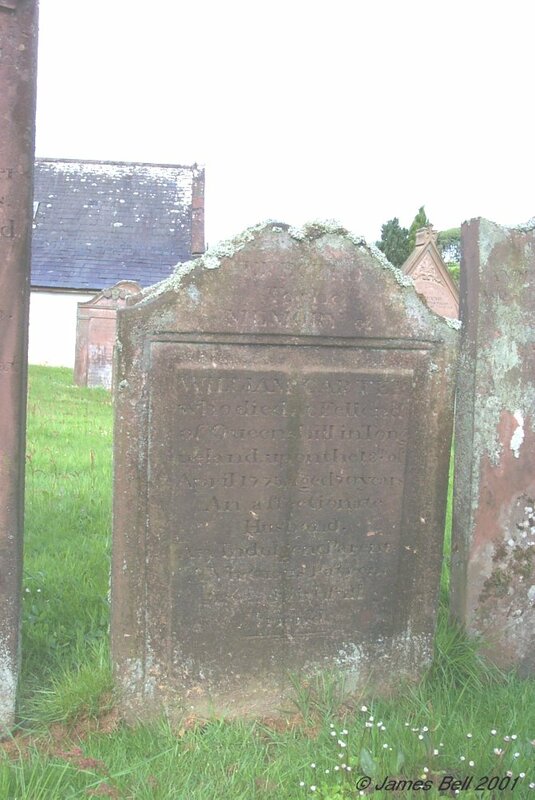 And of Jean Boyd, daughter of the Rev’d Andrew Boyd, Minister of this parish, his spouse, who died at Newton Stewart, Wigtownshire, on the 21st June 1819, aged 89 years. 166 Erected by their sons in memory of John Rain, who died at Twynholm Village, 22nd March 1801, aged 77 years. And Janet Shannon, his spouse, who died at Twynholm Village, 24th Dec’r 1818, aged 87 years. Also James Rain, their grandson, who died at Twynholm Village, 21st Sept’r 1810, aged 21 years. Reverse: Also Eliza Black, died 24 May 1835, aged 82 years. Also her spouse, W. Rain, who died 21 Feb’y 1841, aged 82 years. Also their son William, died 27 May 1826, aged 36 years. Alex’r, their son, died 22 April 1830, aged 38 years. 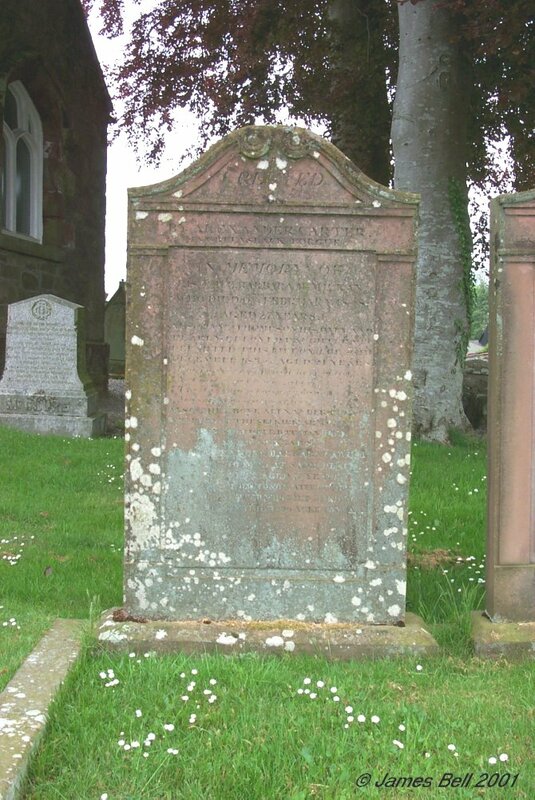 Their daughter Janet, died at Balmaclellan, 22nd June 1861. 167 Erected by James Rain, in memory of Catherine Rain, his daughter, who died at Brighouse, 7th March 1819, aged 19 years. Also Elisabeth Sproat, spouse of James Rain, and mother of the above Catherine Rain, who departed this life 27th April 1841, aged 76 years. Also the said James Rain, who departed this life 12th August 1846, aged 75 years. 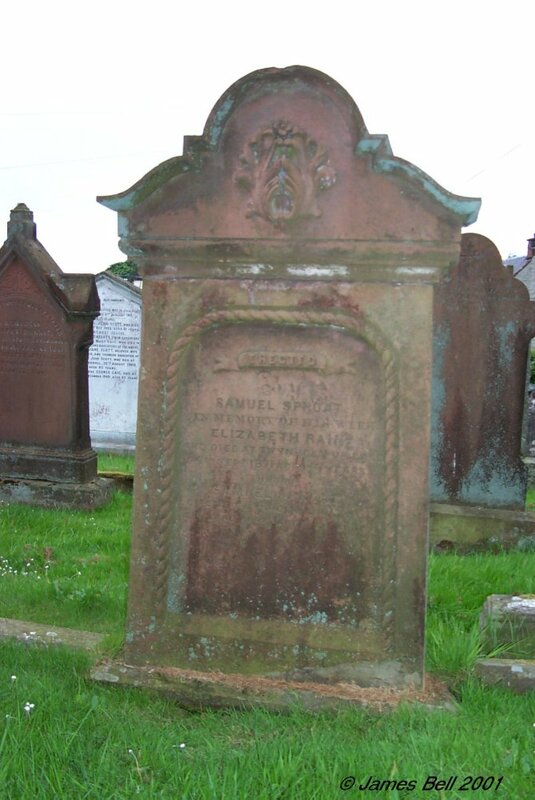 Reverse: Also his grandchildren, James Sproat who was lost off the coast of Africa, in the Ship Fairfield, on the 6th Sept’r 1852, aged 18 years. John Sproat, Chief Officer in the Barque Meteor, who died at Liverpool on the 28th July 1862, aged 32 years. (Pet)er Sproat, who was killed by accident in the employment of Machie & Gladstone of Liverpool, 26th May 1863, aged 21 years. Isabella Sproat, who died at Laurieston on the 25th September 1865, aged 26 years. And Jane and Samuel who died in infancy. Also James Sproat their father, who died at Laurieston, 10th Nov’r 1876 aged 84 years. 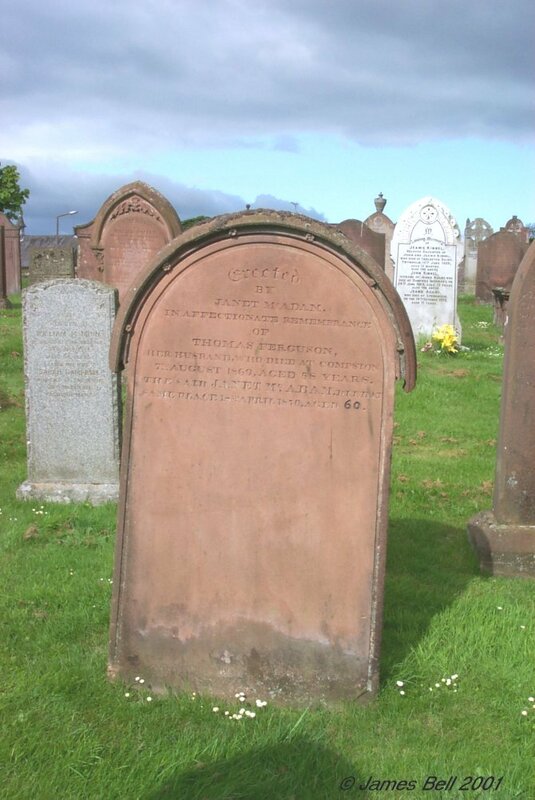 Also Janet Rain, his spouse, who died at Laurieston on the 5th Dec’r 1883, aged 84 years. Also Thomas Sproat their son, who died at Laurieston 29th Dec 1906, aged 59 years. Also Alexander Sproat their son, who died at Laurieston 22nd Feb’y 1919, aged 75 years. 168 In affectionate remembrance of Effie Cummock Carter, beloved daughter of Hugh and Mary Carter, who departed this life April 6th 1908 aged 21 years. “Effies text, St John X. 27th to 29th." The above Hugh Carter, late of Stroans, Kirkmabreck, beloved husband of Mary Courty Murray, who died at Twynholm, March 21st 1922, aged 82 years. 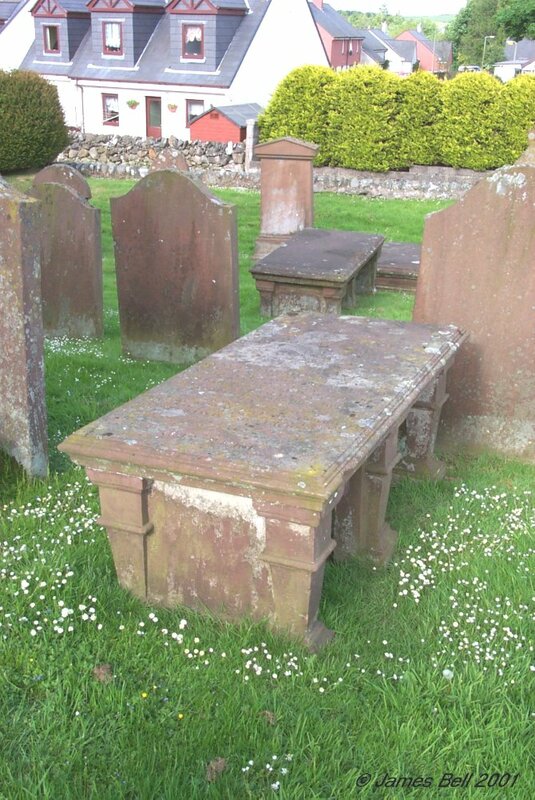 Also the said Mary Courty Murray, who died at Dumfries 27th October 1933, aged 83 years, and is interred here. Also David John Brown Carter, their son, who died 31st May 1955, aged 72 years. Also Hugh Carter, son of the above Hugh Carter, who resided at Greenslack, Borgue, died 2nd Oct 1964, aged 85 years. 170 Here lyes the corps of Robert McDouall who died Feb’y 1744 aged 44 years. 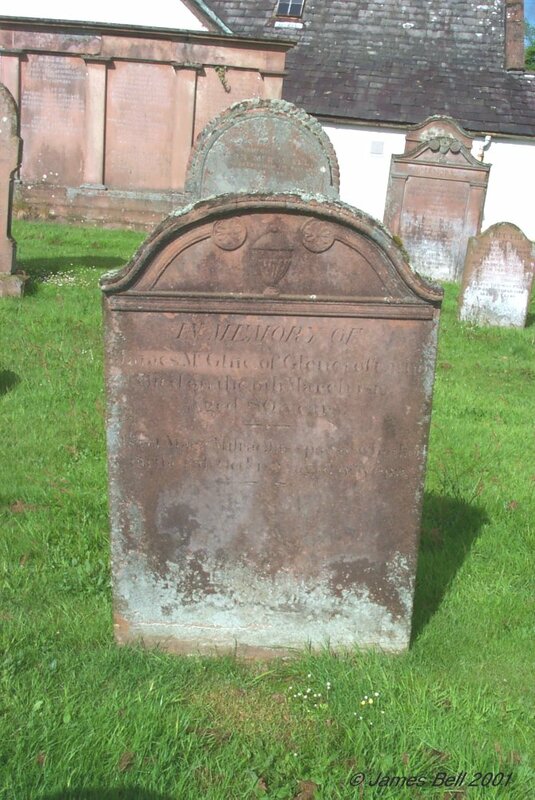 Also the corps of Fanny Sophia Strothers spouse to John McDowall who died April 11th 1764 aged 20 years. 171 Erected by Robert McCourty, in memory of Alexander McCourty, his father, who died at Waltrees, 26th October 1818, aged 87 years. Helen Graham, his mother, died at Waltrees, 10th December 1822, aged 82 years. 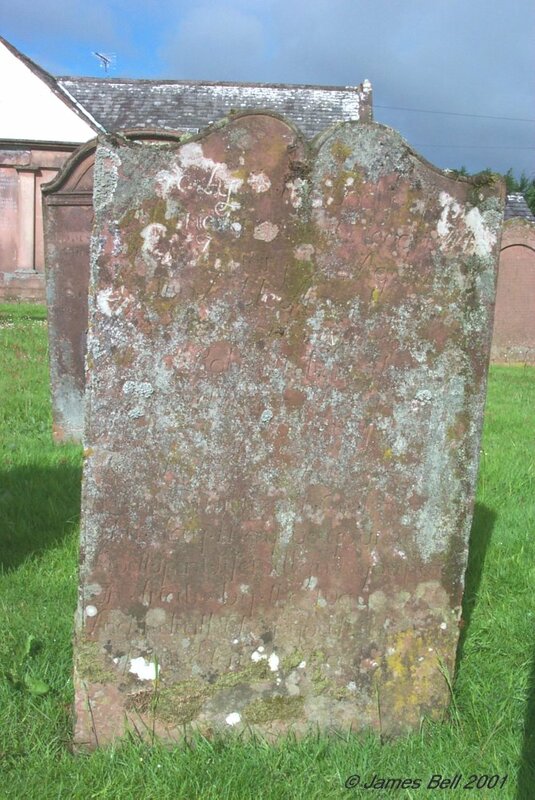 David McCourty, his son, died 24th July 1827, aged 6 years. Helen McDowall, his wife, who died at Gatehouse, 3rd April 1869, aged 80 years. 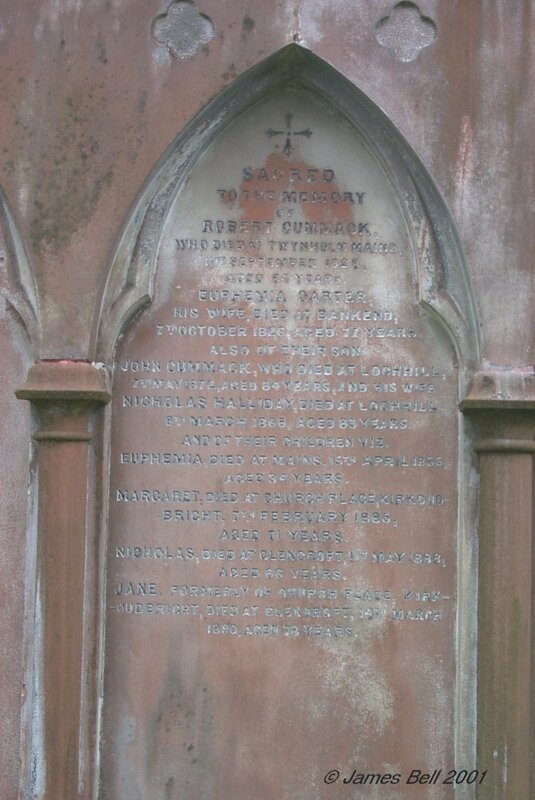 Robert McCourty ,the erector, died at Gatehouse, 19th August 1874, aged 86 years. 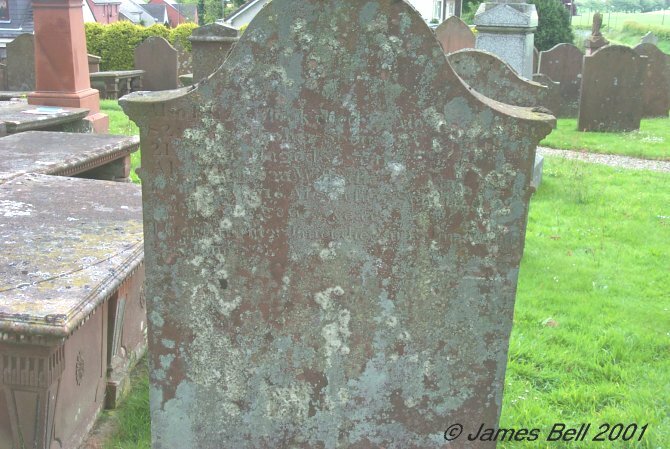 172 In memory of James Carter, who died in Greenslack of Borgue, March 13th 1795, aged 83 years. Also And’w Carter, his son, who died Febr 2nd 1781, aged 32 years. Also John and Agnes Carters, his children. 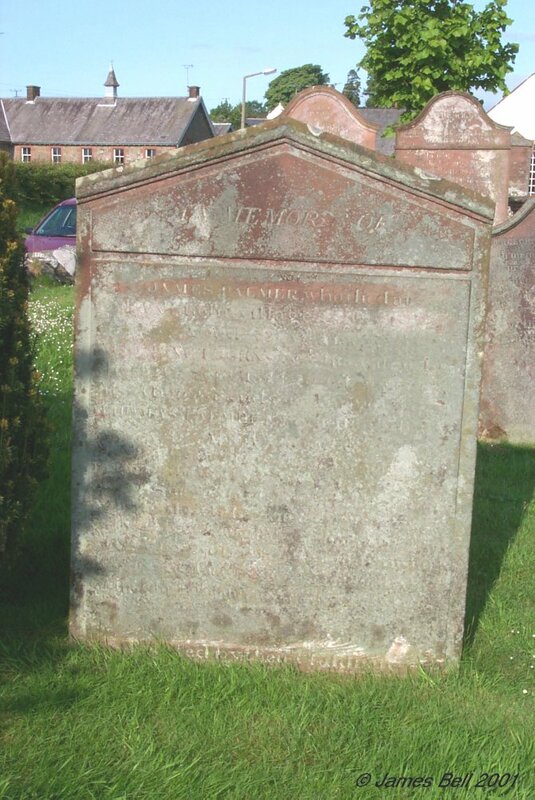 Also here lyes the corpse of Agnes Arnot, spouse to the s’d James Carter, who died August 10th 1797, aged 75 years. Erected by his son Hugh Carter. 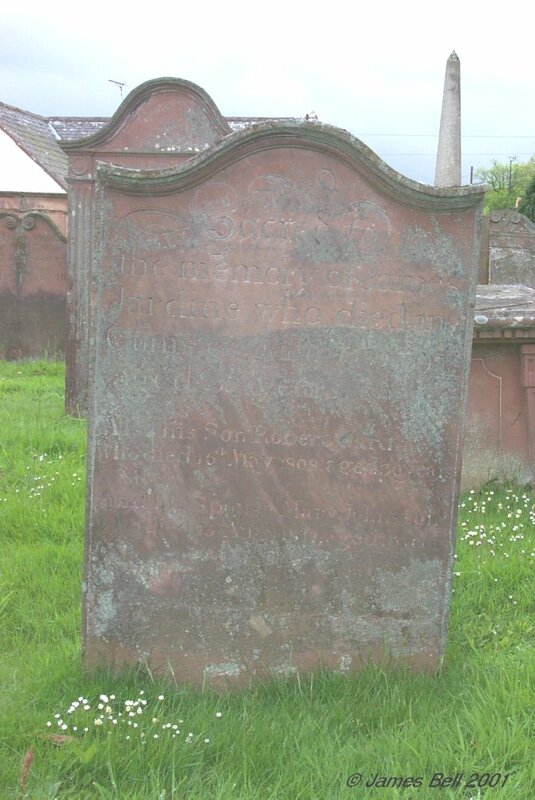 Reverse: Also James Carter, son to Hugh Carter in Greenslack, who died Febr 21st 1812, aged 13 years. And of William, who died 21st June 1813, aged 1 year and 11 months. Also of Jane Commack, his spouse, who died the 2nd of April 1823, aged 44 years. Also Euphemia, their daughter, who died 2nd March 1832, aged 15 years. Also of John, their son, who died on the 15th of August 1834, aged 27 years. 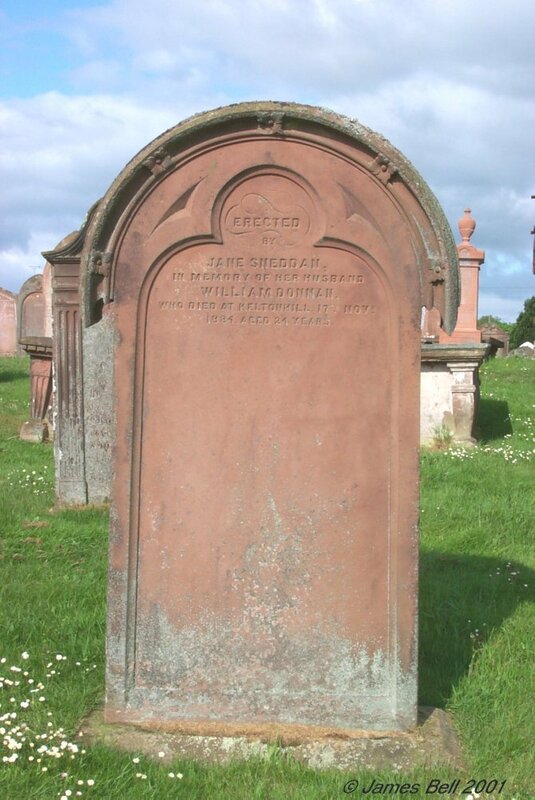 Also the above Hugh Carter, husband to Jane Commack, died at Greenslack, 11th January 1846, aged 86 years. 173 In memory of Margaret Thomson who died at Hillowton, Crossmichael, 22nd April 1872, aged 28 years. Also Andrew Thomson, who died at same place, 17th Nov 1874, aged 25 years. Also Mary Thomson, wife of Bryce Smith, who died at Balannan, Ringford, 8th June 1883, aged 22 years. 174 In memory of Peter McKean, who died 24 day of Sept’r 1785, aged 88 years. And also Helen Hechel his wife. William McKean, their son, who died at Balcarry, 2nd March 1824, aged 68 years. And Margaret Douglas, his spouse, who died 9th April 1806, aged 38 years. Blessed are the dead who died in the Lord, they rest from their labours, and their workes do follow them. 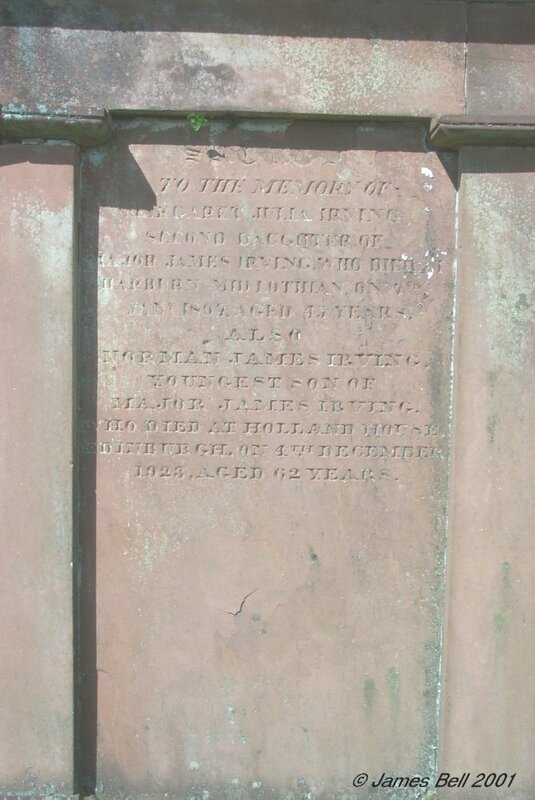 Reverse: Erected by William McKean, their son. 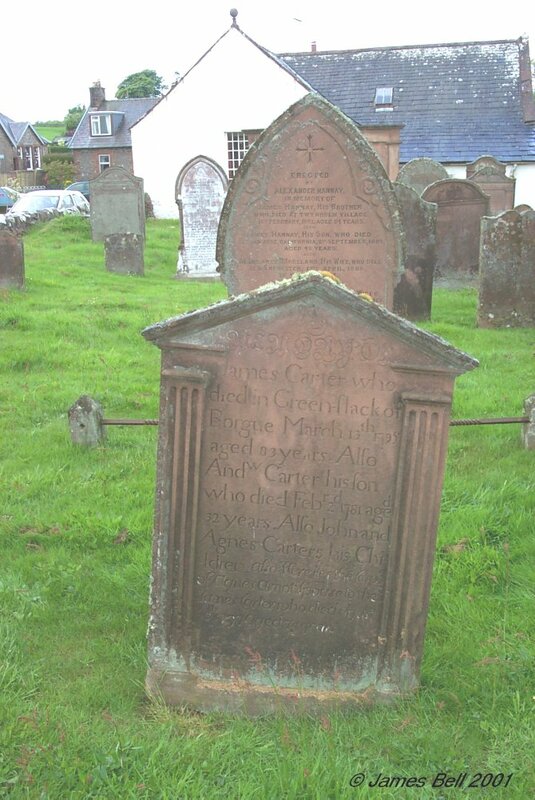 Janet Carter, spouse of W. McKean, died at Greenslack, 9th Feb’y 1841, aged 72 years. 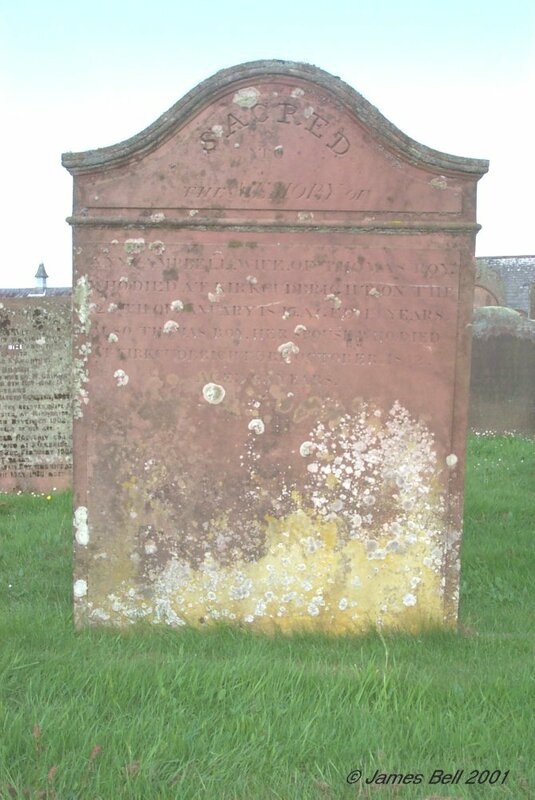 175 Sacred to the memory of Alexander Browne of Langlands, who died on the 18th of March 1798, aged 78 years. 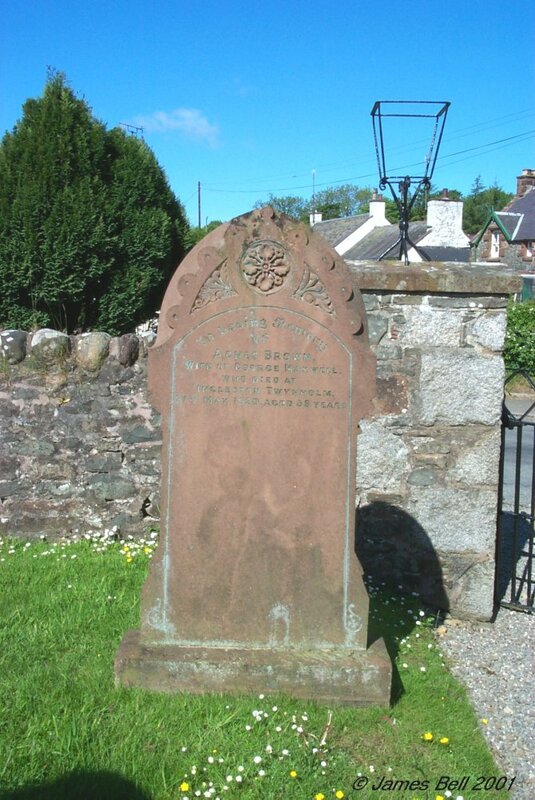 And Isabella Boyd, his spouse, who died on the 20th February 1798, aged 70 years. Also John Browne their son, who died on the 25th Jan’y 1812, aged 56 years. And Mary Torbet, his spouse, who died 5th Jan’y 1836, aged 53 years. And their sons and daughters viz:- Isabella, who died 8th April 1822, aged 19 years. Andrew ,who died 25th May 1824, aged 11 years. Margaret, who died 15th May 1823, aged 19 years. Alexander, M.D., Physician to the 37th Regt, who died 15th April 1872, aged 71 years. Jane, who died 25th April 1873, aged 66 years. Mary, who died 29th June 1874, aged 75 years. 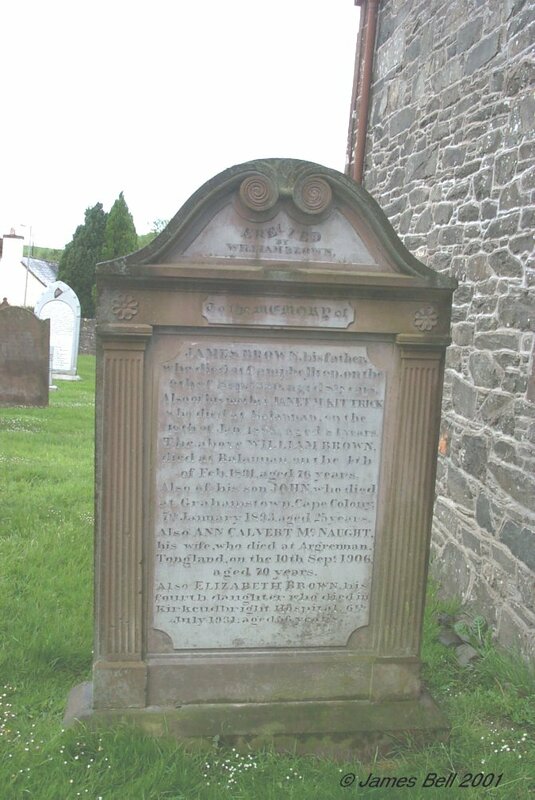 176 Erected by William Brown to the memory of James Brown, his father, who died at Campbellton on the 6th of Sept 1850, aged 81 years. 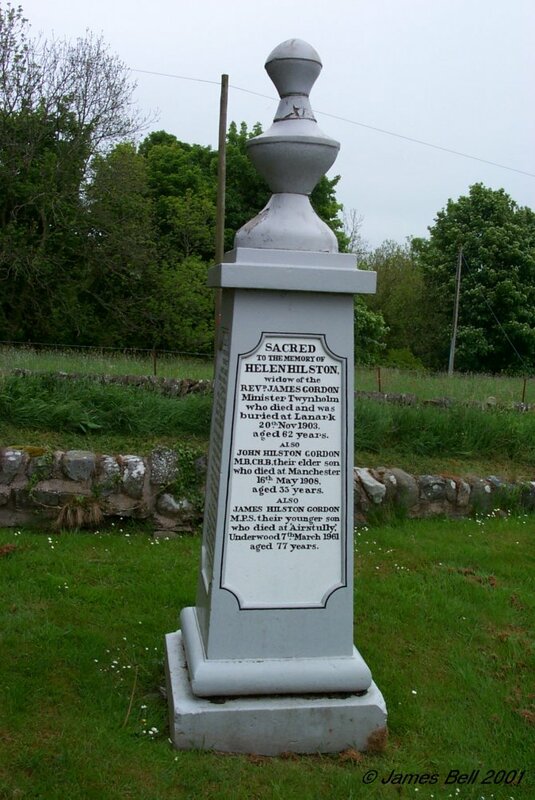 Also of his mother Janet McKittrick, who died at Balannan, on the 16th of Jan 1868, aged 84 years. The above William Brown, died at Balannan, on the 4th of Feb 1891, aged 76 years. Also of his son John, who died at Grahamstown, Cape Colony, 7th January 1893, aged 25 years. Also Ann Calvert McNaught, his wife, who died at Argrennan, Tongland, on the 10th Sept 1906, aged 70 years. 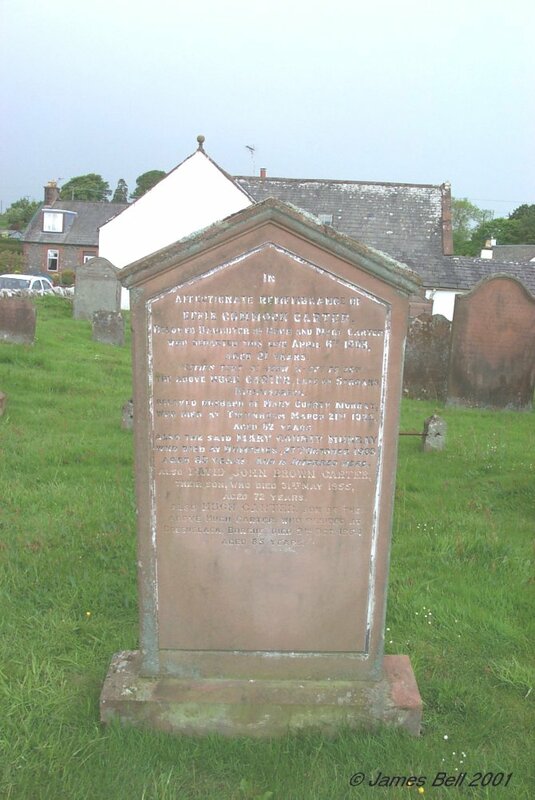 Also Elizabeth Brown, his fourth daughter, who died in Kirkcudbright Hospital, 6th July 1931, aged 56 years. 177 Here lys the corps of Wm. McTaggart, who died in the year 1775, aged 32 years. 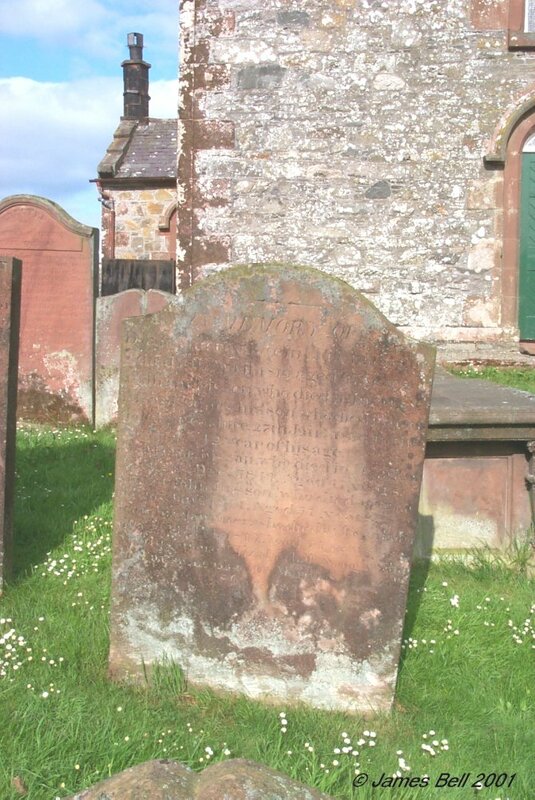 And also Margaret McTaggart, who died in Whitehill, 20th Nov’r 1791, aged 32 years. 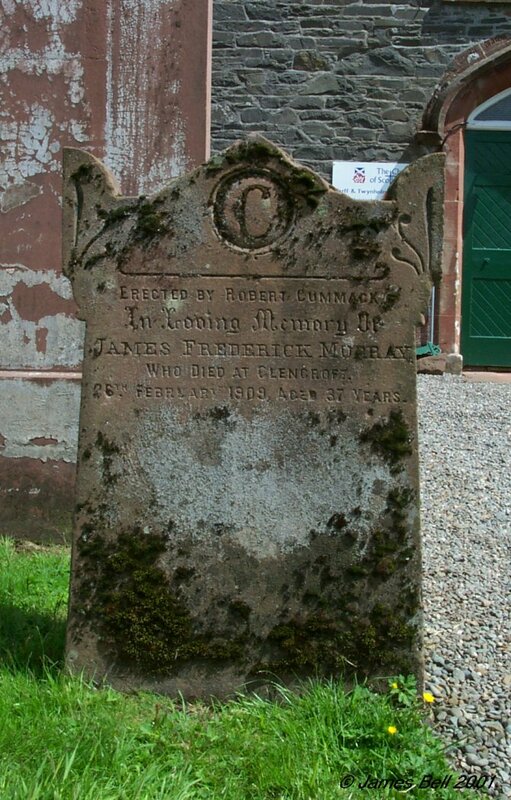 And of James Clark, her son, who died 27th Oct’r 1791, aged 2 years. 178 Erected to the memory of John Macknaught who died Gatehouse, the 28th of March 1830, in the 70th year of his age. 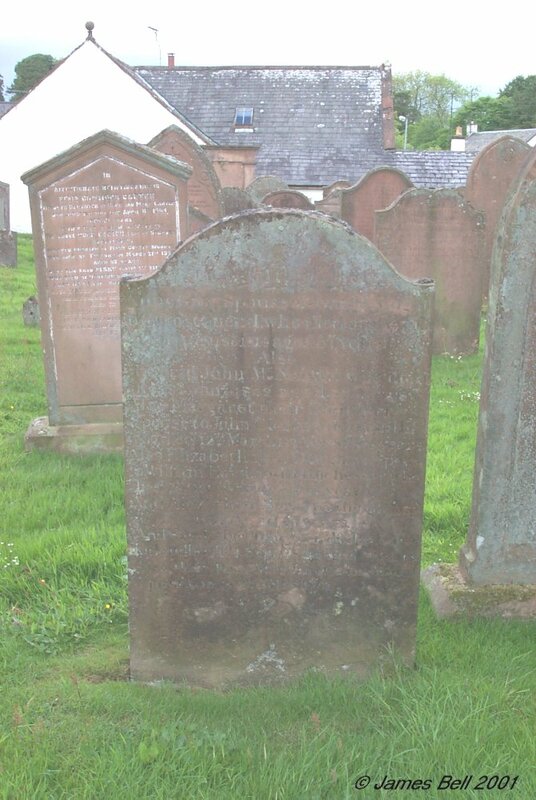 And also of Marg’t Brown, his spouse, who died at Kirkcudbright, the 23rd March 1831, aged 80 years. 179 In loving memory of Annie McIntosh Robertson, beloved wife of David Hamilton, who died 1st December 1967, aged 75 years. Also Susan McIntosh, their daughter, who died 9th June 1929, aged 2 years 5 months. Also Isobel Jane, their daughter, who died 3rd June 1935, in infancy. Also the above David Hamilton, who died 17th November 1971, aged 71 years. 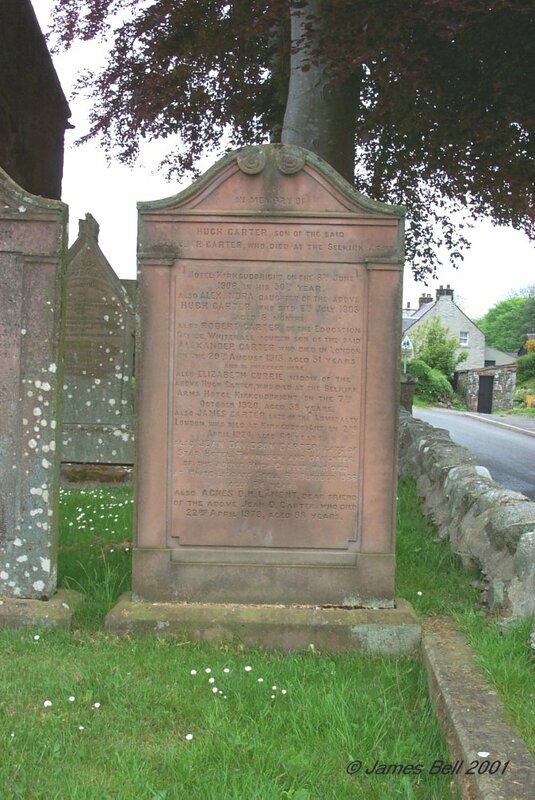 180 Erected by James Harrison in memory of his daughter Susan, who died at Springholm, 15th Sep 1881, aged 5 years. 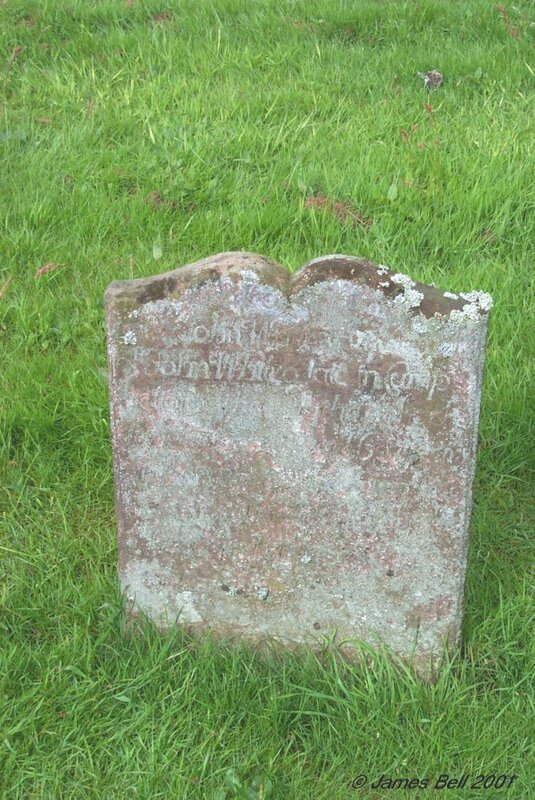 Also his daughter Isabella, who died at Twynholm, 6th May 1885, aged 1? years. 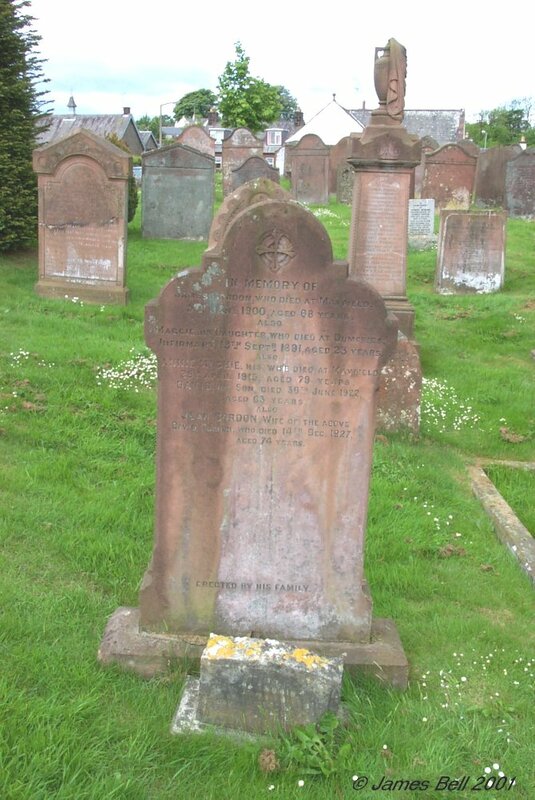 Also of his wife Marion Thomson who died Twynholm, 28th Sep 1890, aged 40 years. Also of his father Stephen Harrison, who died at Twynholm, 25th March 1882, aged 62 years. Also of his mother Annabella Stroyan, who died at Valleyfield, Tongland, 23 April 1897, aged 73 years. 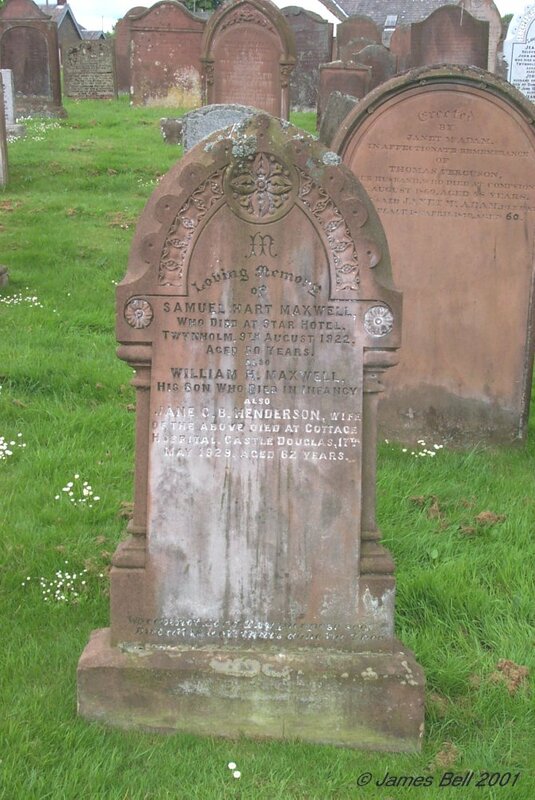 Also the above James Harrison, who died at Twynholm, 22nd March 1929, aged 76 years. Also Jane McBride Murphy, wife of the above, who died at Twynholm, 28th December 1929, aged 76 years. 181 Erected by Alexander Hannay in memory of James Hannay, his brother, who died at Twynholm Village, 15th February 1882, aged 84 years. Also James Hannay, his son, who died at San Jose, California, 2nd September 1883, aged 43 years. Also Margaret Moreland, his wife, who died at Manchester, 12th April 1885, in her 82nd year, and is interred here. Also Helen Hannay, his daughter, wife of Henry Moultrop, who died at Providence, America, 1st February 1889, aged 57 years. Also the erector Alexander Hannay, who died at Manchester, 1st March 1892, in his 91st year, and is interred here. Also Jessie Hannay, his daughter, the beloved wife of John Watson Atkinson, who departed this life at Manchester on 28th January 1933, in her 91st year. Also Mary Muir Hannay, his daughter, the beloved wife of Robert Watson Atkinson, who departed this life at Manchester on 1st March 1935, in her 89th year. 182 In loving memory of John Couper, who died a t Woodhead, 22nd April 1846, aged 37 years. 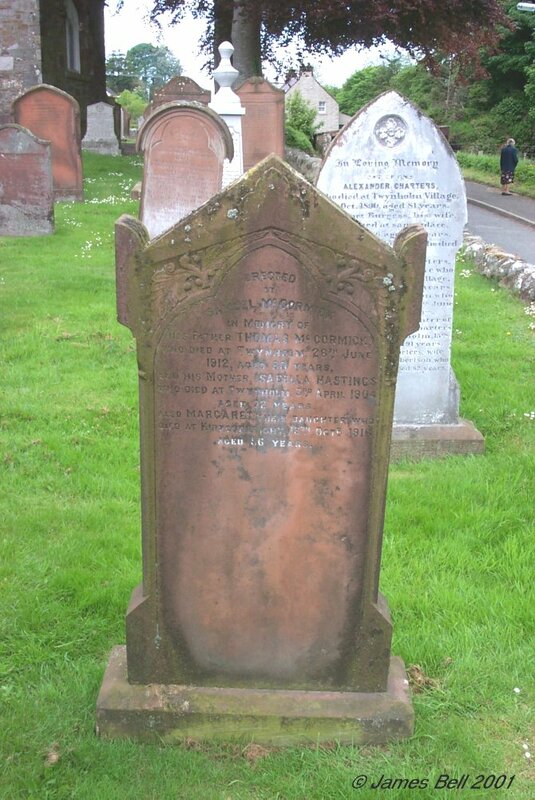 Also Margaret Johnstone, his wife, who died at Ringford, 21st Nov 1888, aged 84 years. Also their children, Jane, Margaret and John who died in infancy. Also William Brown, who died at Ringford, 5th March 1884, aged 68 years. Also Janet Martindale Couper, his wife, died at Creamery Cottage, 26th Jan 1913, aged 85 years. Also James Brown, son of the said Janet Brown, who died at Ringford, 4th Jan 1936, aged 80 years. 183 Erected in memory of Jane Thomson, who died at Kempleton Mill, April 14th 1871, aged 40 years. Also James Clark, her husband, who died at Valleyfield, June 6th 1879, aged 47 years. 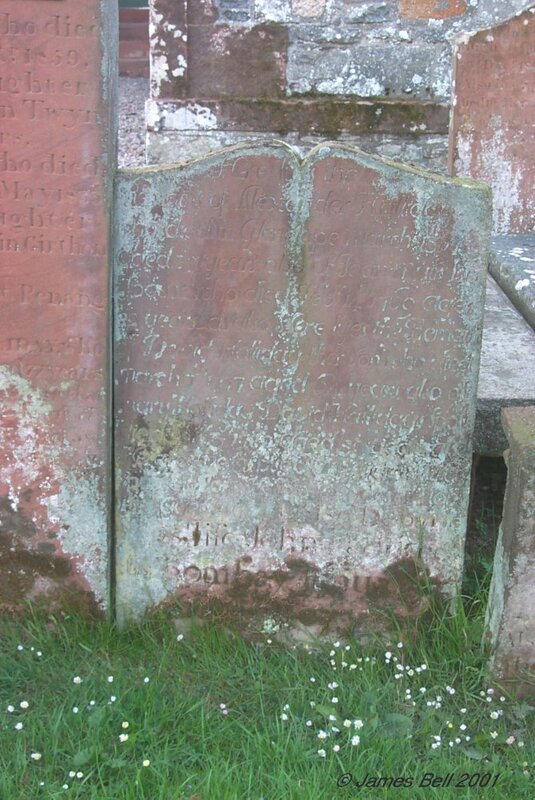 Also Thomas, their son, who died at Scoor, Isle of Mull, 2nd April 1887, aged 25 years. 184 Erected by William Robertson, in memory of his mother-in-law Mary Sproat, who died 6th Jan 1876, aged 86 years. The above William Robertson, who died 13th Sept 1884, aged 54 years. Also Jane, his daughter, who died at Manchester, 5th July 1894, aged 45 years. Also Edward John, his son, who died at Liverpool, 10th June 1896, aged 33 years. Also Agnes McKeand, wife of Wm. Robertson, who died at Dalry, 10th Jan’y 1907, aged 80 years. 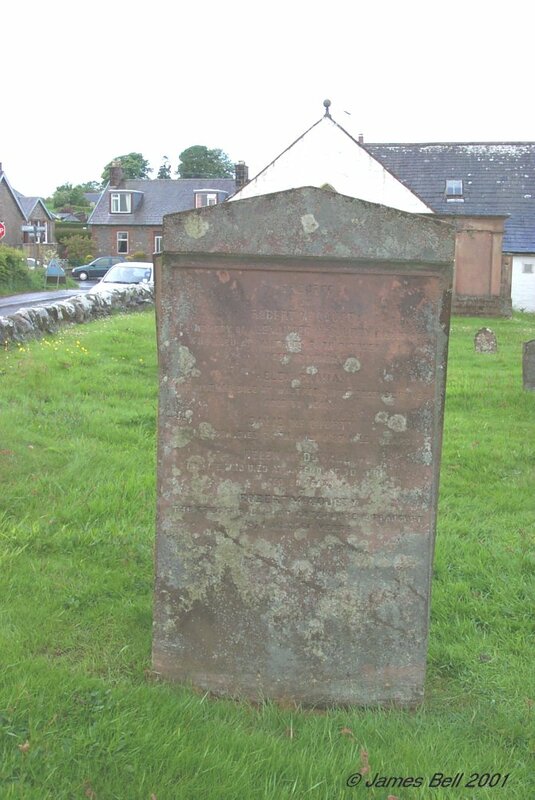 185 Erected to the memory of Hugh Carter by his children, he died at Carse, on the 9th Feb 1788, aged 69 years. 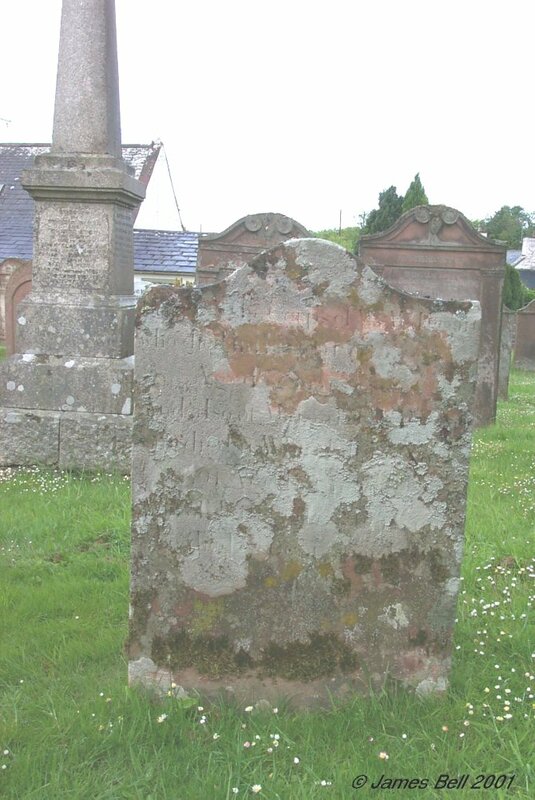 Also Jean McKean, his spouse, who died on the 8th June 1780, aged 54 years. 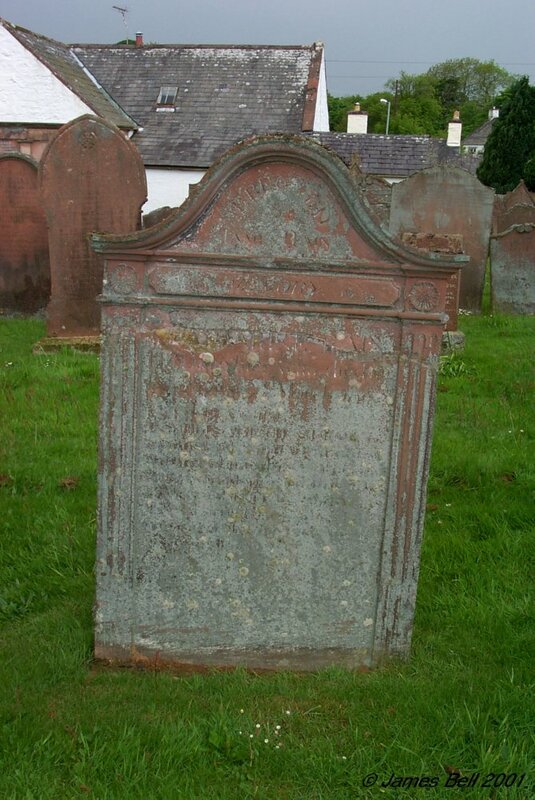 Also John Carter, his son, who died 6th June 1755, aged 2 years. And Mary Rain, spouse to Andrew Carter of Mark, who died 14 Feb 1834, aged 85 years. Also the above Andrew Carter, who died 2nd July 1834, aged 74 years. Also Margaret Nitters, spouse to John Carter, who died at Ardwell, 21st Oct 1866, aged 54 years. 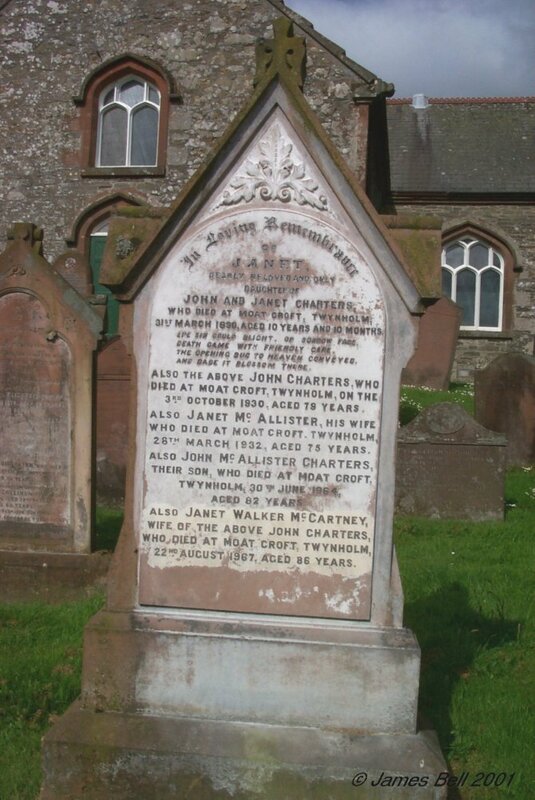 Also John Carter, her husband, who died at Ardwell, 2nd August 1867, aged 78 years. 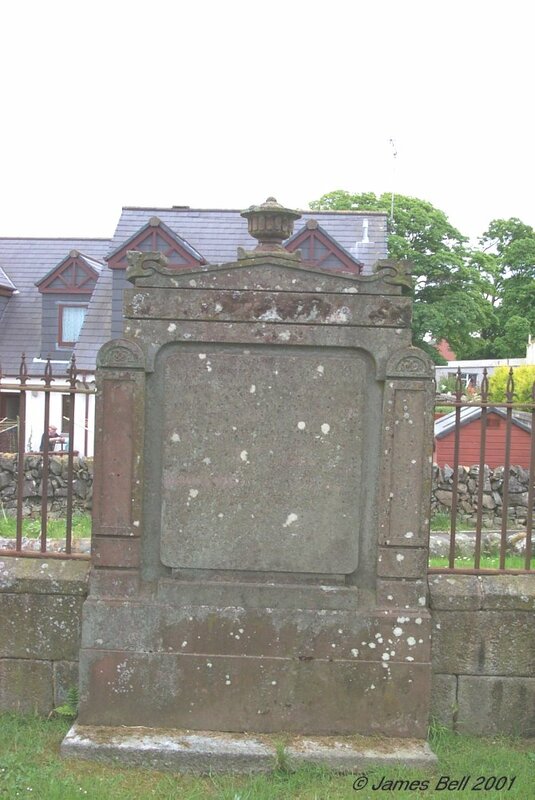 186 Erected to the memory of William Carter, who died at Fellend of Queenshill, in Tongueland, upon the 13th of April 1775, aged 70 years. An affectionate husband, an indulgent parent, a virtuous patron and a faithful friend. 187 In memory of Andrew Carter in Gatehouse, who died 3rd March 1782, aged 39 years. And Isabella Clark, his spouse, who died 15th Jan’y 1818, aged 78 years. 188 Erected by James McCartney, in memory of Jane Wilson, his wife, who died here the 30th July 1851, aged 36 years. James their son, who died in infancy. Elizabeth their only daughter, who died the 6th April 1856, aged 6 years. William their son, who died 10th Oct’r 1866, aged 21 years. Also the above James McCartney, who died 18th July 1873, aged 61 years. 189 This stone is erected by Mary McKenzie, in memory of Ninian McNea, her husband, who died November 25th 1761 aged 87 years. And also the said Mary McKenzie, who died Nov’r 24, aged 75 years. 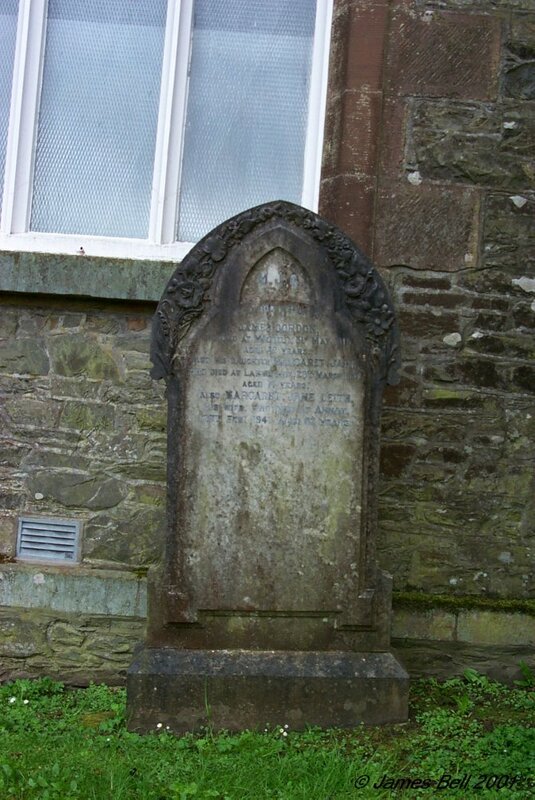 190 a. Erected by Thomas McNae and Clarke Knox in memory of their son John Clarke McNae, who died at Garrochar, Parish of Kirkmabreck, 12th March 1867, aged 25 years. 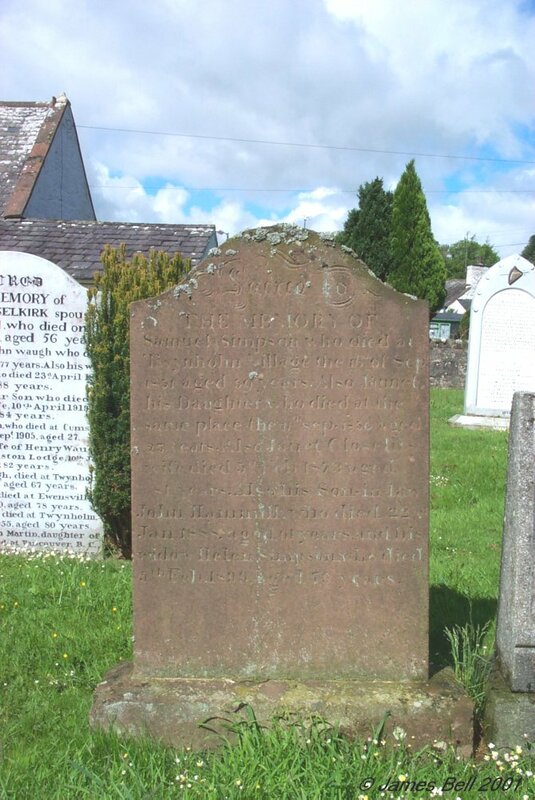 Also the erector Thomas McNae, who died at Creetown, January 1891, aged 80 years. 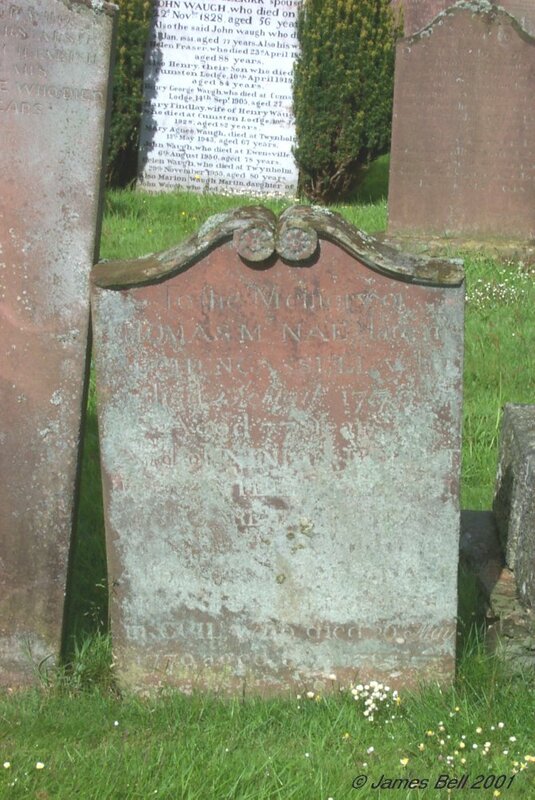 191 To the memory of Thomas McNae, late in Auchengassel, who died 23rd April 1779, aged 77 years. And of Ninian, Robert, John, William, Janet, Margaret and Jean McNaes, his children. 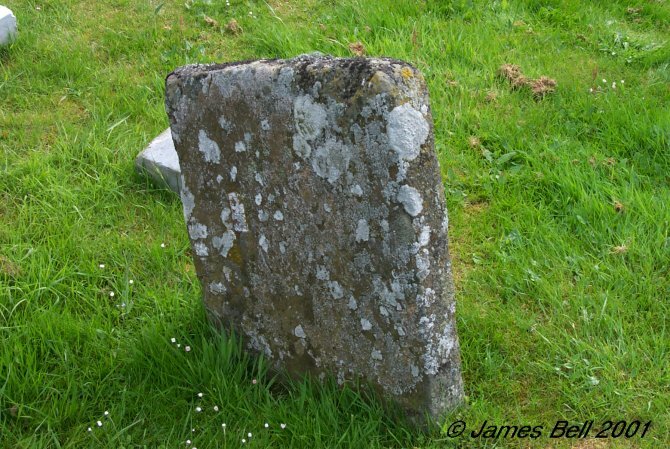 Also of Janet McAdam, widow of Samuel McQuhae, in Cuil, who died 26th May 1770, aged 88 years. 192 Erected by Thomas McNae in memory of James McNae, his brother, who died in London 27 September 1826, aged 21 years. 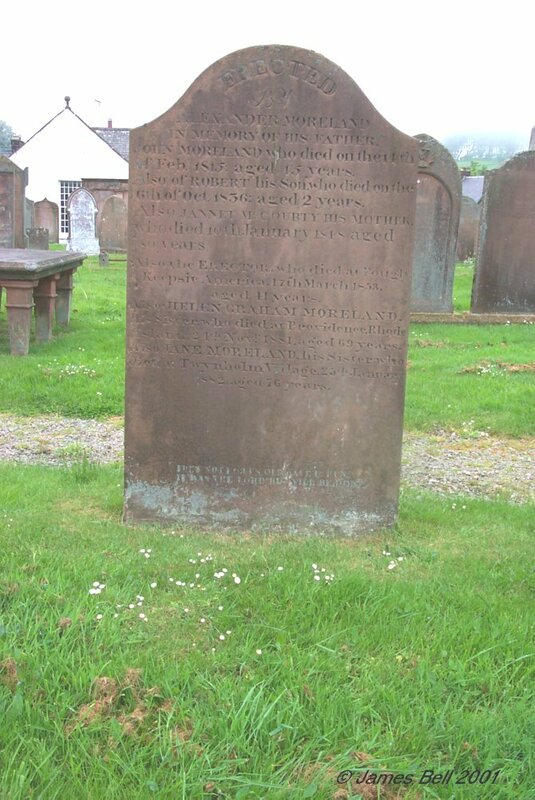 Also John McNae, his father, who died at Lairdmanoch, Parish of Tongueland, 23 September 1835, aged 53 years. Also Jane Muir, wife of the above John McNae, who died at Glasgow, 29th March 1857, aged 80 years. 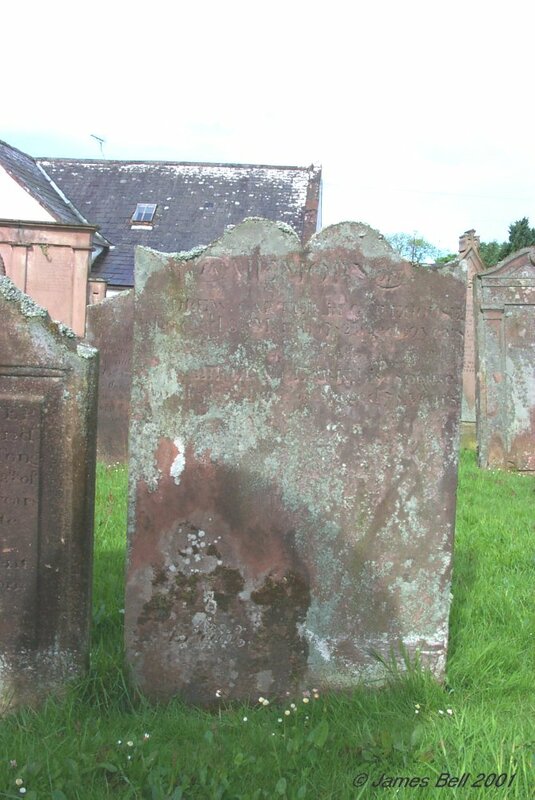 193 Here lyeth the body of John McBirnie, tenant in Colcagrie, who died January 1744, aged 49 years. Also Isable McNae, his spouse, who died April 1741, aged 37 years. 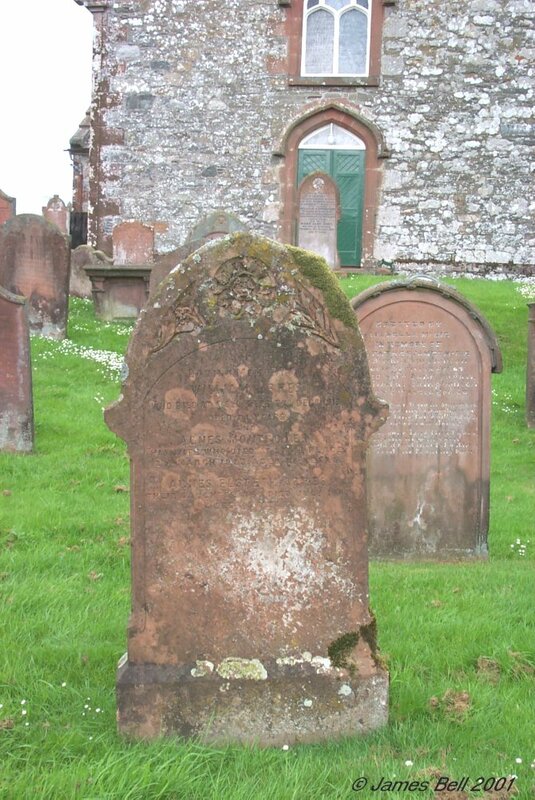 Also of Robert McBirnie, their son, who died March 11th 1753, aged 28 years. This day may be your last. 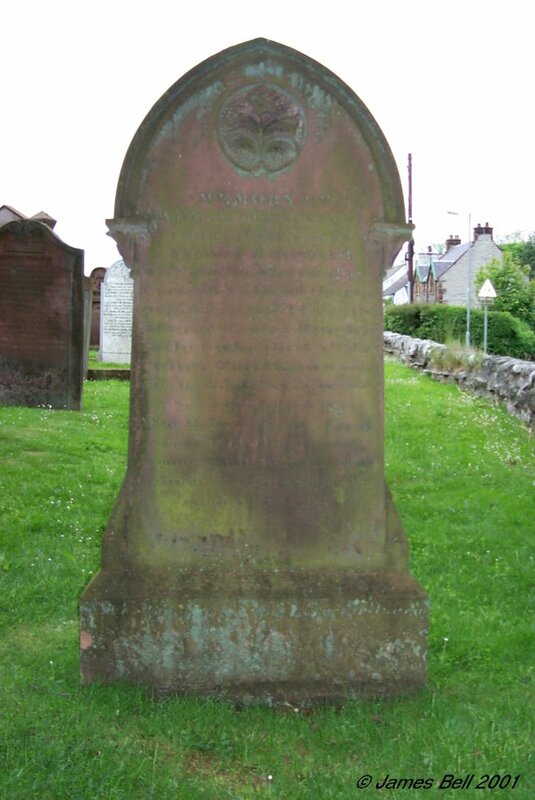 194 In memory of Andrew Donaldson, late of Manchester, who died at Castle Douglas 21st Nov’r 1818, aged 38 years. 195 Erected by Samuel + John Whitro, late in Campbellton, in memory of John Whitro, their father, who died June 30th 1781, aged 60 years. 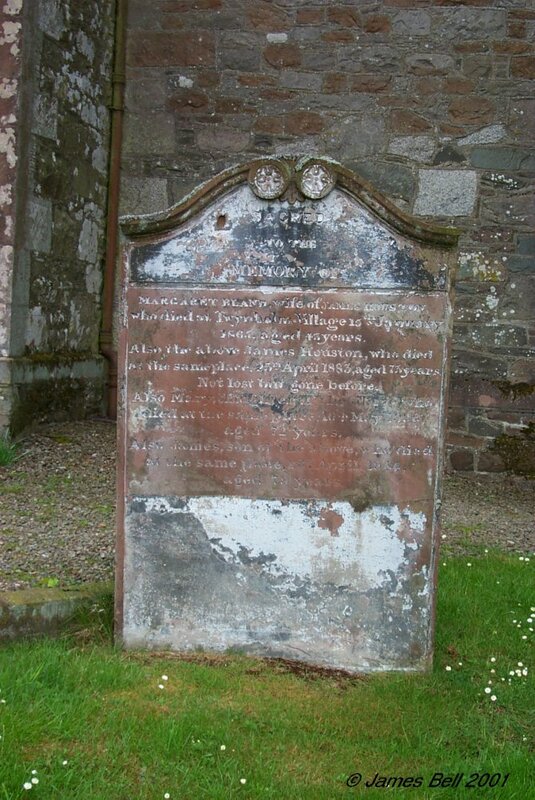 And of Mary Thomson, his spouse, who died Feb’ry 5th 1775, aged 56 years. 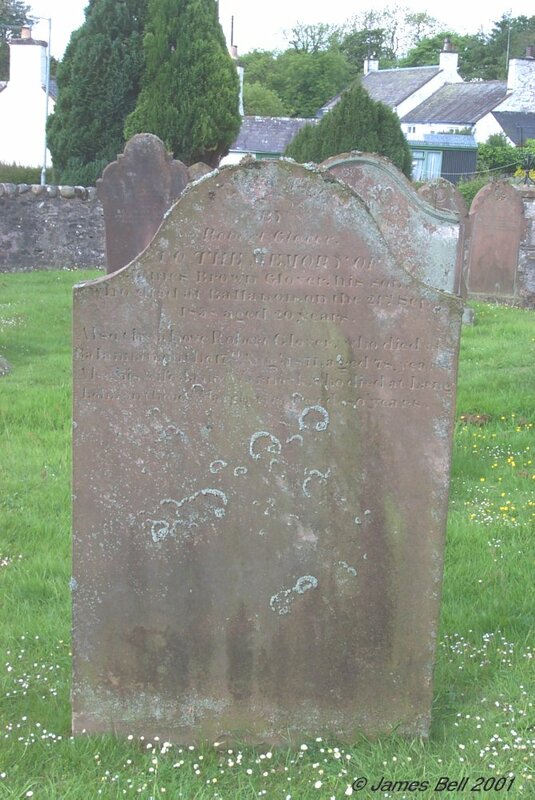 196 Erected by James Clarkie, in Trostrie of Twynholm, to the memory of his children, viz; Mary who died March 6th 1764, aged 2 years, and William who died April 15th 1783, aged 27 years. 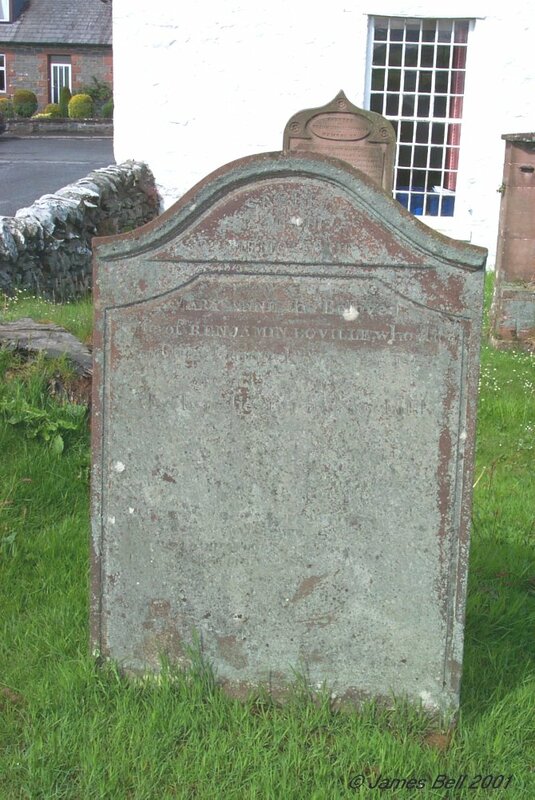 And also of Margaret Callan, his spouse, who died Jan 6th 1788, aged 61 years. Also the said James Clark who died July 11th 1796, aged 70 years. Reverse — Also Gilbert Connal, his son in law, who died Feb’ry 14th 1796, aged 34 years. 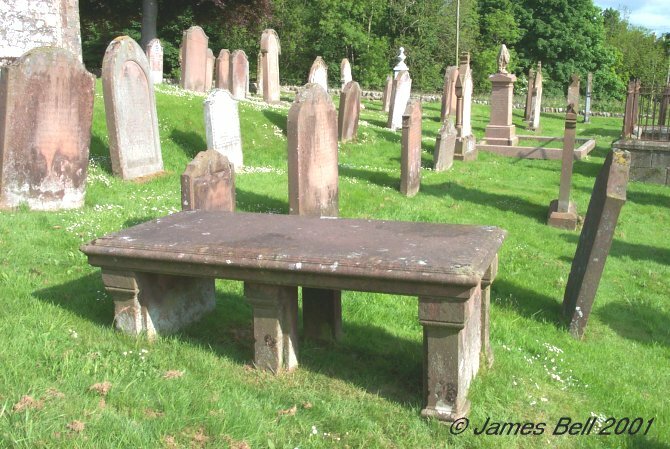 197 In memory of James McGhie of Glencroft, who died on the 6th March 1819, aged 80 years. Also Mary Milrae, his spouse, who died on the 17th Oct’r 1824, aged 96 years. 198 Erected by his son John, to the memory of William Muir, who died in Hardgate of Twynholm on the 29th of July 1785, aged 85 years. 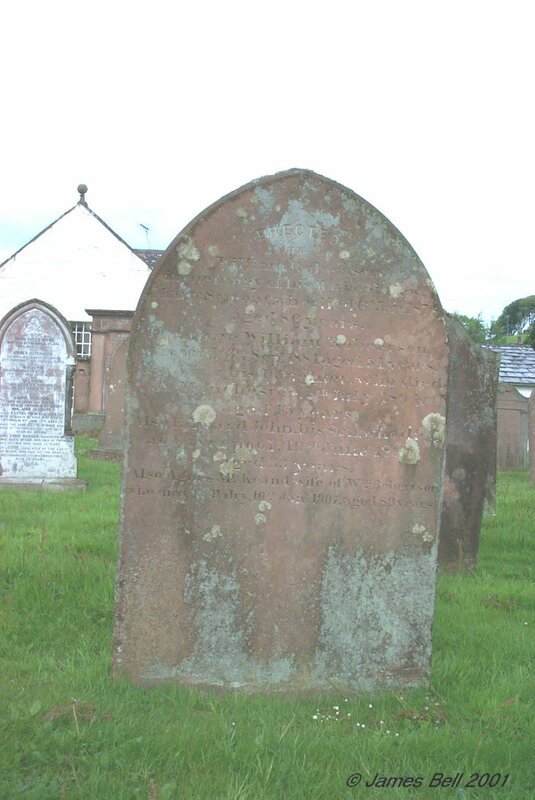 Also Ann Rain, spouse of the said William Muir, who died 2nd Dec'r 1807, aged 83 years. Also their daughter Elisabeth, spouse to James Johnston in Backfell, who died 20th Oct’r 1818, aged 55 years. Reverse: Fret not for me; my race is run. It was the Lord; his will be done. 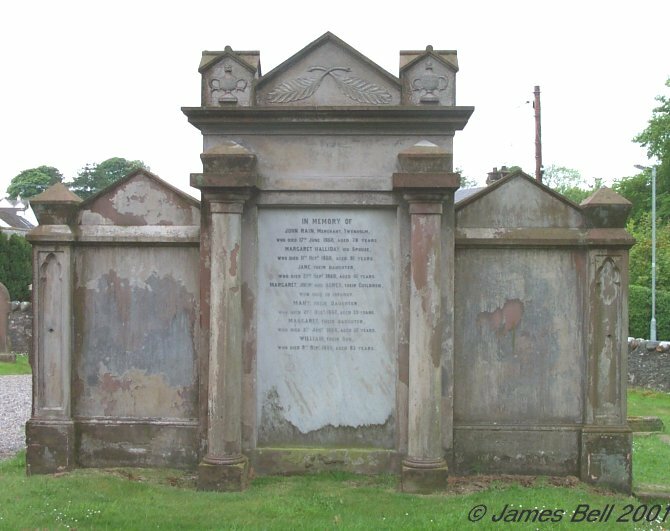 In memory of John Hutchison, who died at Laurieston the 29th of April 1838, aged LXXIV years. 199 Erected by John Henderson in memory of Sophia Jolly, his wife, who died at Edgarton, on the 25th Nov 1863, aged 26 years. Also George, their son, who died in infancy. Also Jane Sproat, their aunt, who died at Twynholm Village on the 3rd day of Sept’r 1872, aged 79 years. Also the above John Henderson, Farmer, Edgarton, who died on the 29th Feb’y 1876 aged 41 years. 200 Erected by Samuel Jolly in memory of Anne Hanning Gibson, his wife, who died at Drummore, the 12th day of June 1874, aged 37 years. 201 In memory of William Jolly, who died at Redfield, the 9th July 1852, aged 52 years. Also his daughter Jane, who died the 20th Feb'y 1830, aged 8 months. And of Jeannie, his daughter, who died the 27th Nov’r 1852, aged 17 years. 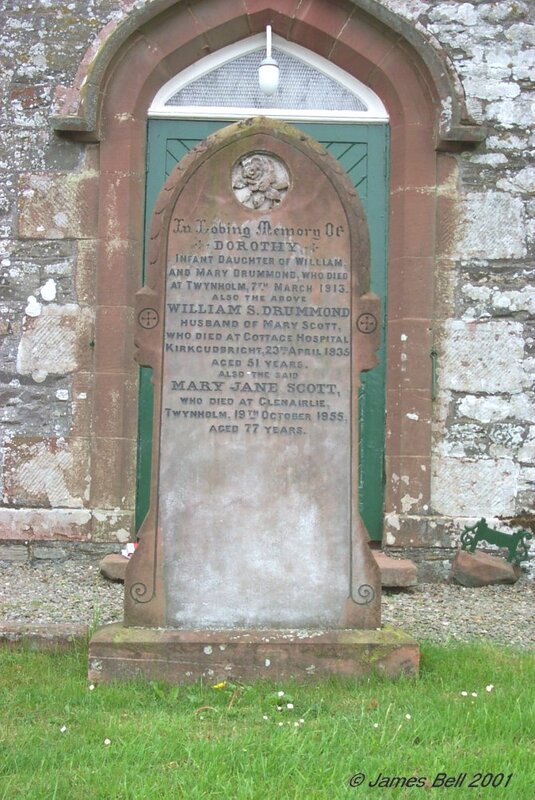 Also Janet Sproat, his relict, who died at Drummore the first day of May 1878, aged 82 years. 201a In loving memory of Mary Patterson, died 14th April 1985, aged 86 years. Beloved wife of Alexander Patterson, died 9th September 1931, aged 37 years. 202 In loving memory of William Clark who died -- April, 19--, aged 7- years. Also Mary Woods, his wife, who died 23rd May 1942, aged 83 years. 203 Erected to the memory of Marion Sloan, spouse to Henry Blane, who died in Woodhead of Twynholm, Jan’y 12th 1800, aged 63 years. 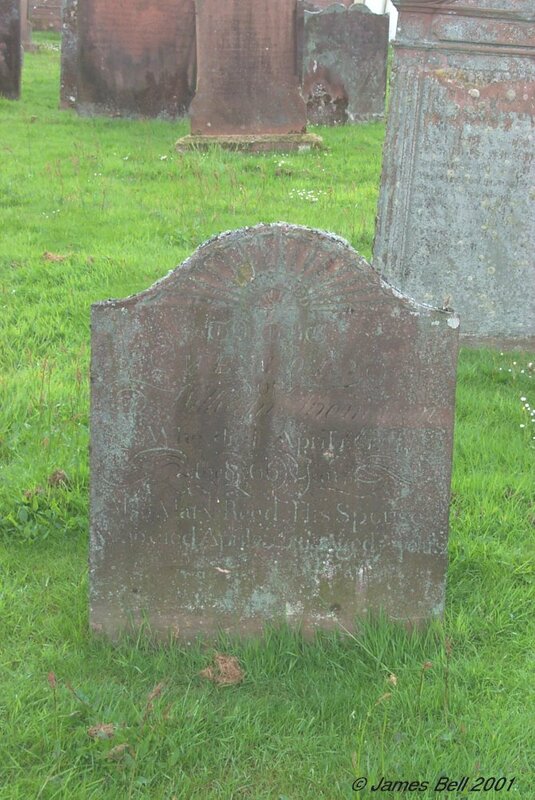 Also Isabella Gillone, spouse to Alex’r Bland, who died in Twynholm Village 28th Nov’r 1835, aged 58 years. Also Catherine Bland, their daughter, died August 18th 1846, aged 30 years. Also the above Alex’r Bland who died 30th Dec’r 1859, aged 81 years. 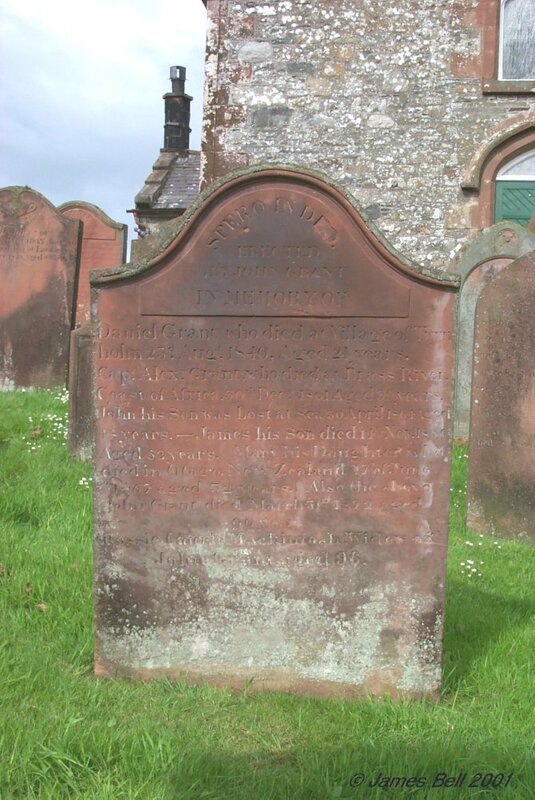 204 In loving memory of James Hutton, who died at Miefield, Twynholm, 20th June 1941, aged 72 years. 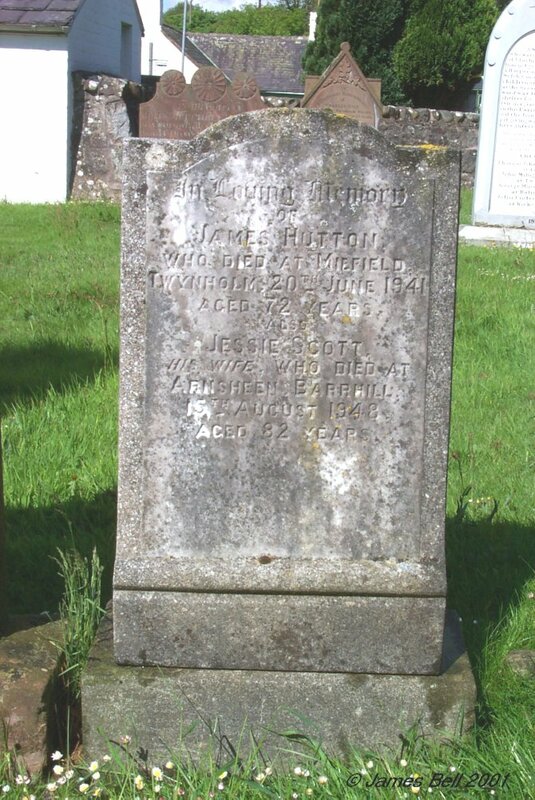 Also Jessie Scott, his wife, who died at Arnsheen, Barrhill, 15th August 1948, aged 82 years. 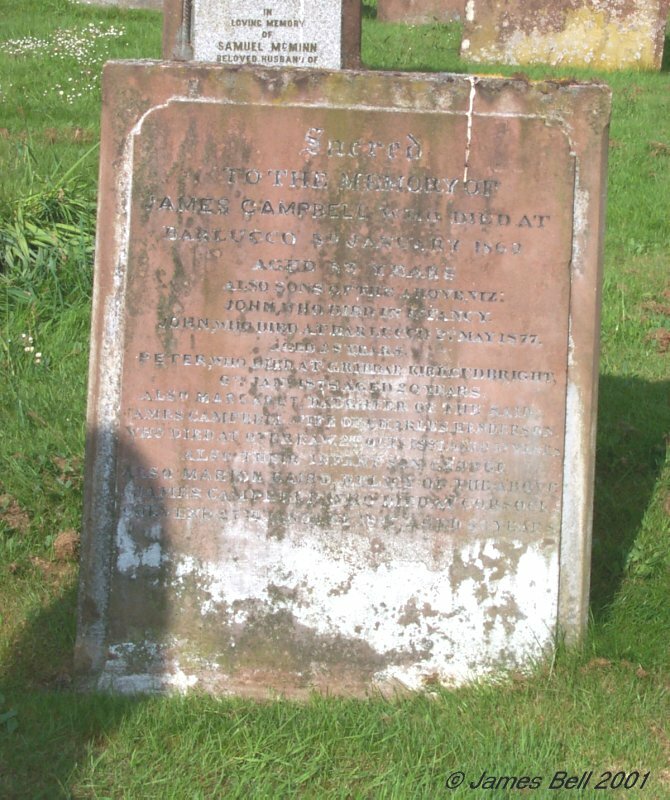 205 Sacred to the memory of Samuel Simpson, who died at Twynholm Village, the 16th of Sep 1851, aged 59 years. Also Jannet, his daughter, who died at the same place, the 11th Sep 1850, aged 23 years. Also Janet Close, his wife, died 5th Feb 1873, aged 81 years. Also his son-in-law ,John Hammill, who died 22nd Jan 1888, aged 61 years. And his widow Helen Simpson, who died 5th Feb 1899, aged 79 years. Reverse: Also his grand-children, Jane Robson, died 4 Sep. 1851, aged 1 year, and Agnes Turnbull, died 11 Nov'r 1850, aged 2 years. 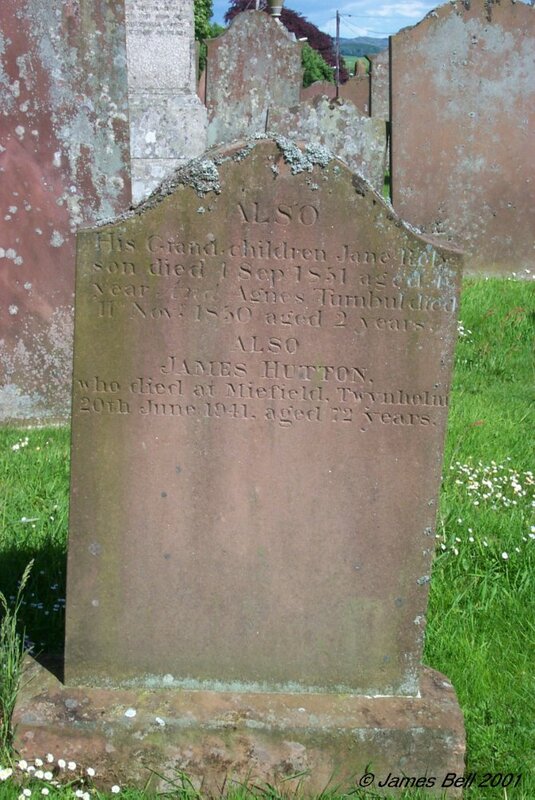 Also James Hutton, who died at Miefield, Twynholm, 20th June 1941, aged 72 years. 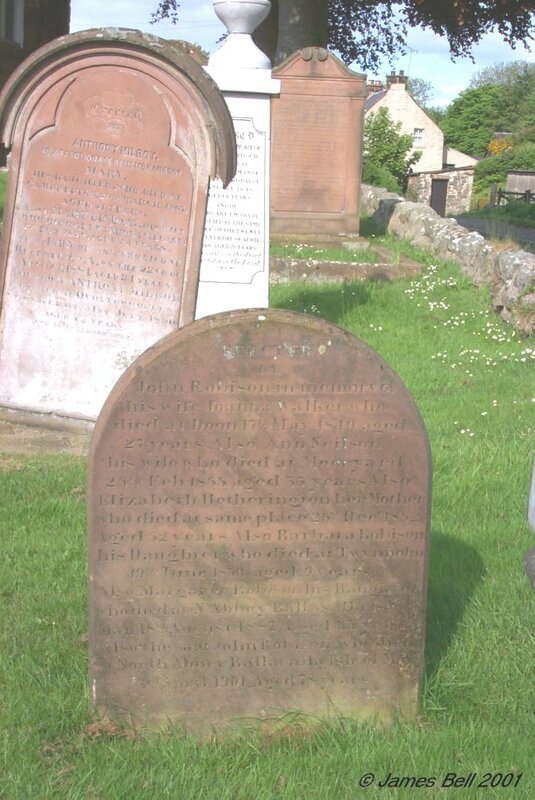 206 In loving remembrance of Adam Robertson who died at Twynholm Village, 26th September 1872, aged 34 years. 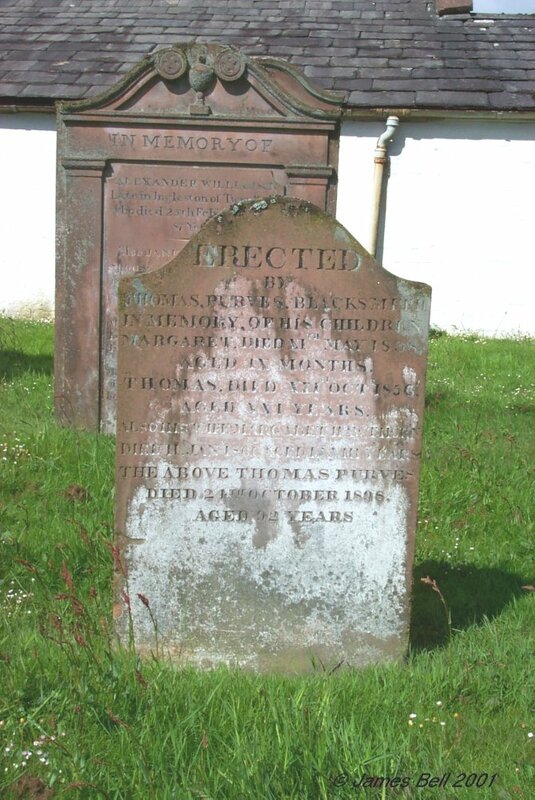 Also Thomas, his son, who died 12th October 1865, aged 2 years. 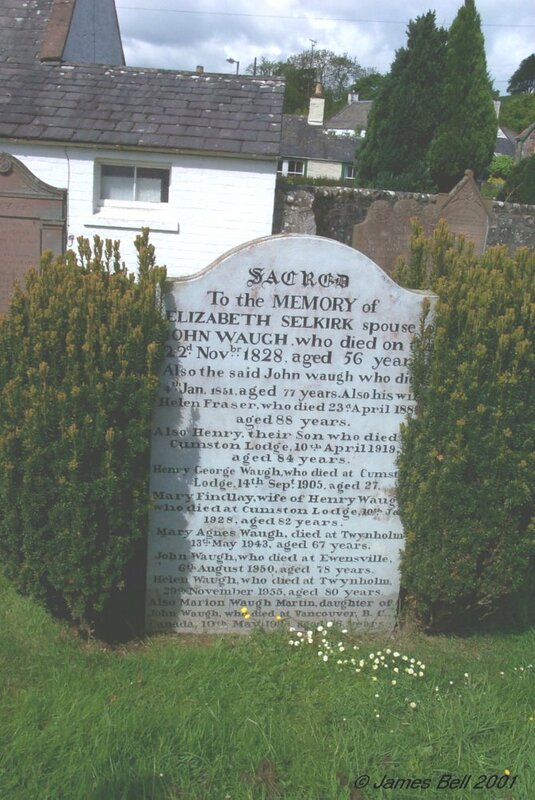 Also Elizabeth Selkirk Waugh, his wife, who died at Twynholm Village, 23rd February 1923, aged 86 years. Also Margaret Jane Waugh, her niece, who died at Twynholm, 19th September 1930, aged 60 years. Also Helen Jane Waugh, who died at Twynholm, 26th June 1938, aged 50 years. 207 Erected by Mary Chisholm, in memory of her husband John McDowall, who died at Twynholm 22nd Nov'r 1891, aged 34 years. Also of her children namely; James, who died at Newcastle 23rd April 1887, aged 3 months; Maggie, who died at Newcastle 22nd May 1887, aged 7 years and 11 months; John, died at Twynholm 15th November 1891, aged 3 months. Jeannie Rowan McDowall, sister of the above John McDowall, who died at Doon, Twynholm, 19th November 1893, aged 24 years. 'Not lost, but gone before.' And Margaret Crossan, their mother, wife of James McDowall, who died 12th April 1899, aged 68 years. 208 John Dunn, died Oct 12th 1872, aged 11 years. 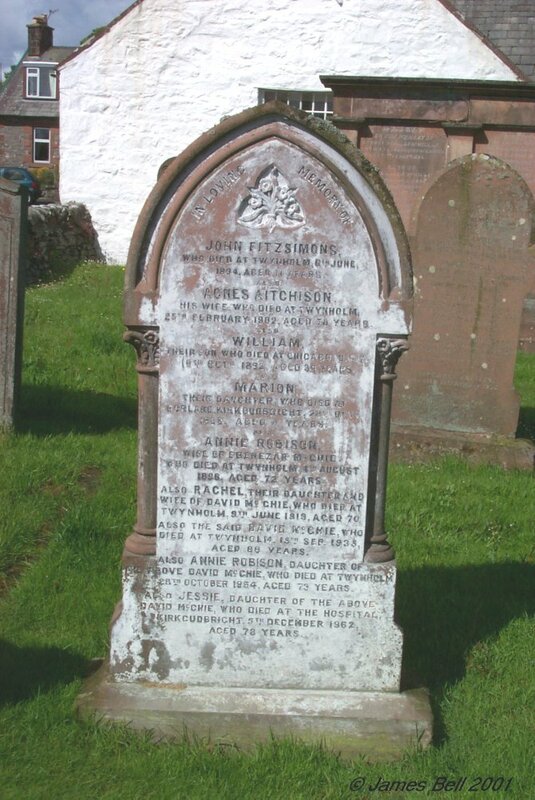 209 In loving memory of John Fitzsimons, who died at Twynholm, 6th June 1894, aged 71 years. Also Agnes Aitchison, his wife, who died at Twynholm, 25th February 1902, aged 78 years. Also William their son, who died at Chicago, U.S.A., 16th Oct’r 1892, aged 39 years. 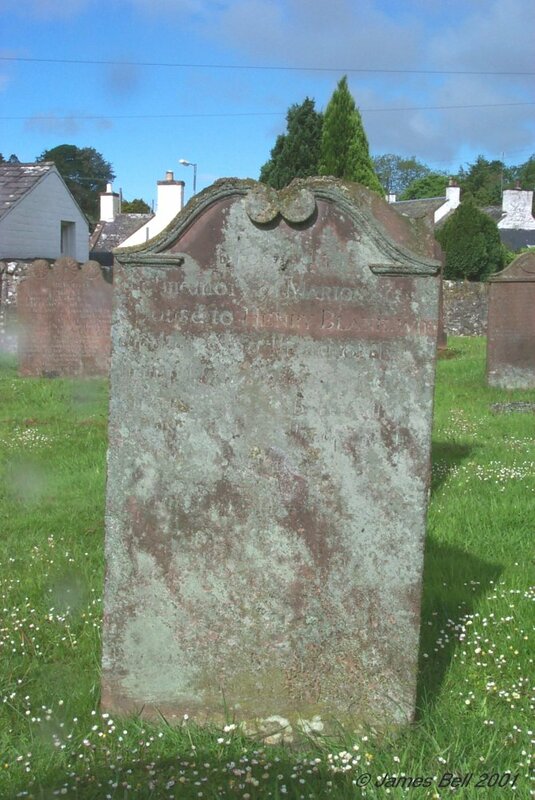 Also Marion their daughter, who died at Borland, Kirkcudbright, 28th Oct'r 1868, aged 4 years. 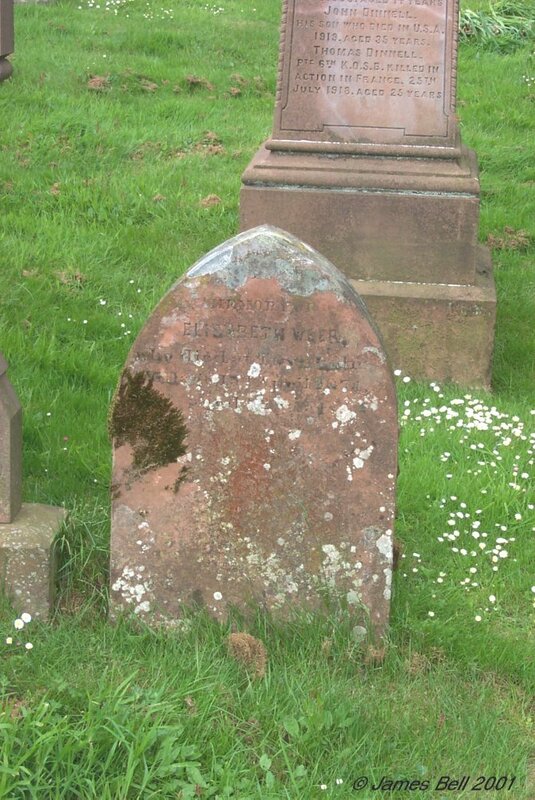 Also Annie Robison, wife of Ebenezor McGhie, who died at Twynholm, 4th August 1896, aged 72 years. Also Rachel their daughter, and wife of David McGhie, who died at Twynholm, 9th June 1919, aged 70. Also the said David McGhie, who died at Twynholm, 15th Sep 1935, aged 88 years. 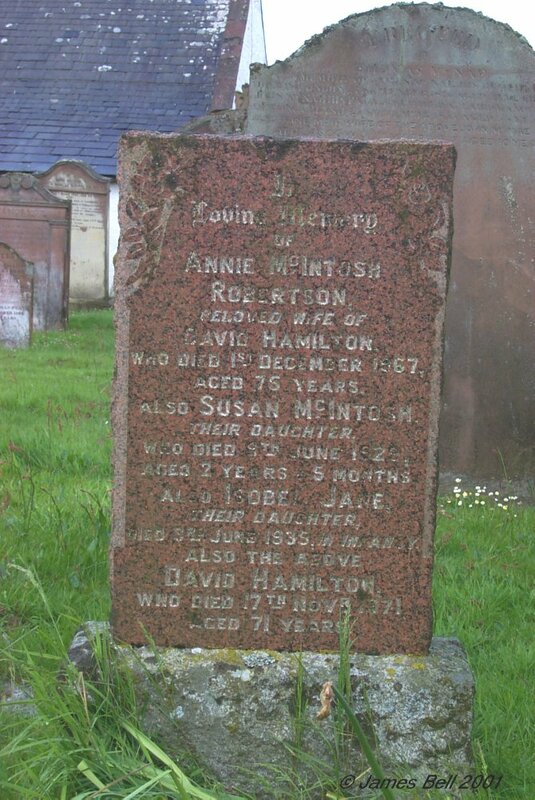 Also Annie Robison, daughter of the above David McGhie, who died at Twynholm, 28th October 1954, aged 73 years. 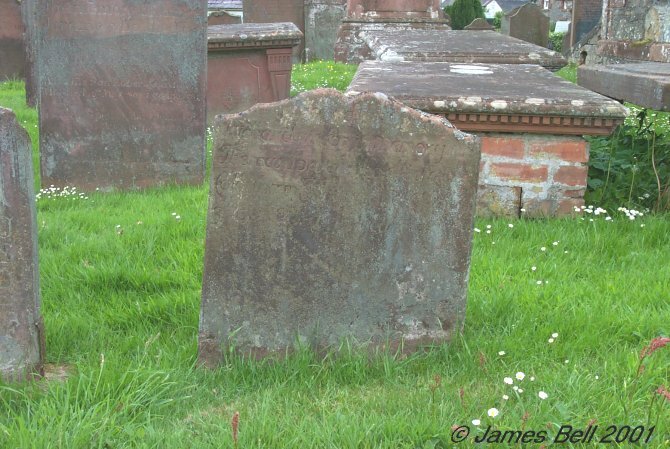 Also Jessie, daughter of the above David McGhie, who died at the Hospital, Kirkcudbright, 5th December 1962, aged 78 years. 210 Erected by Robert McCourty in memory of Jannet Heslop, his mother, who died Feb’y 1st 1773, aged 76 years. 211 Sacred to the memory of Mary Anne, the beloved wife of Benjamin Boville, who died at Barwhinnock, Nov’r 26th 1867, aged 33 years. Also here lies her infant child. Affliction sore, long time she bore, physicians were in vain, but God above, out of his love, died ease her of her pain. 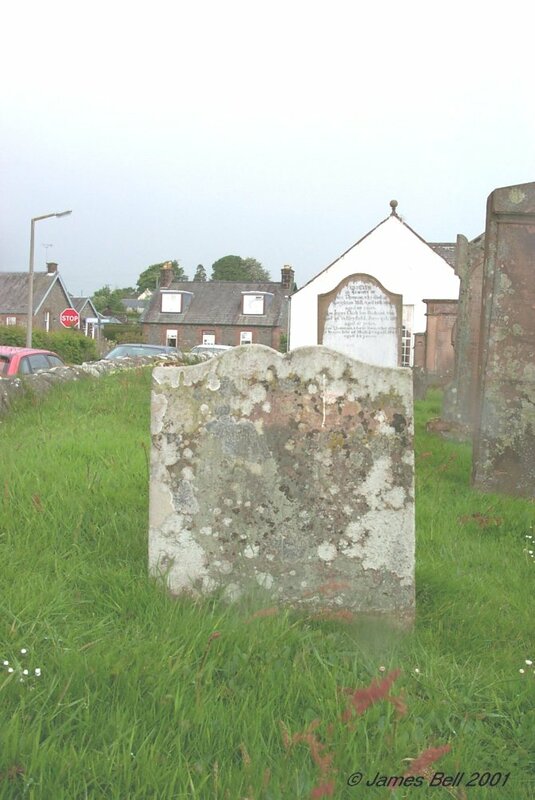 212 In memory of Agnes McMurray, who died at Twynholm Village 22nd Nov 1890, aged 92 years. 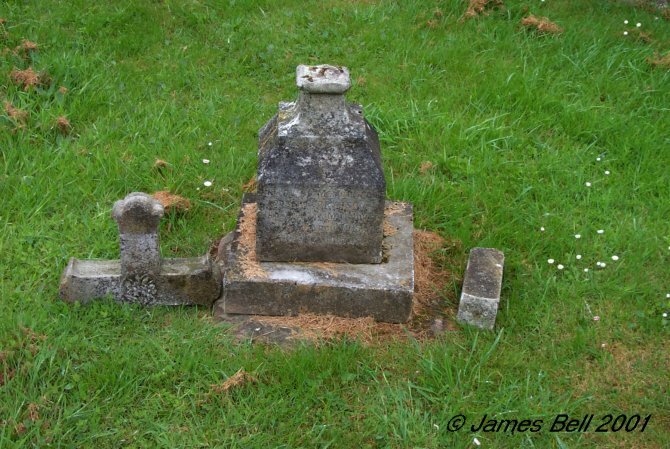 Also Jannet Laidlaw, her daughter, who died at the same place 16th Feb 1898, aged 64 years. Also Samuel Paisley, her grandson, who died at Glencroft, 19th July 1910, aged 19 years. Gone but not forgotten. Also Mary Laidlaw, daughter of Jannet Laidlaw, who died at Twynholm Village 1st Jan 1920, aged 53 years. Asleep in Jesus. Also Jane Carolina Dummicken, who died at Twynholm Village on 14th Feb 1926, aged 68 years. Also Margaret Paisley who died 19th August 1926. 213 Erected by Thomas Purves, blacksmith, in memory of his children, Margaret, died XIth May 1838, aged IX months. Thomas, died XXIst Oct 1856, aged XXI years. Also his wife Margaret Hawthorn, died 11th Jan 1866, aged LXVIII years. The above Thomas Purves, died 24th October 1898, aged 92 years. 214 Sacred to the memory of John Adamson, schoolmaster, Twynholm, who died at the Schoolhouse here, 3rd April 1843, aged 66 years. 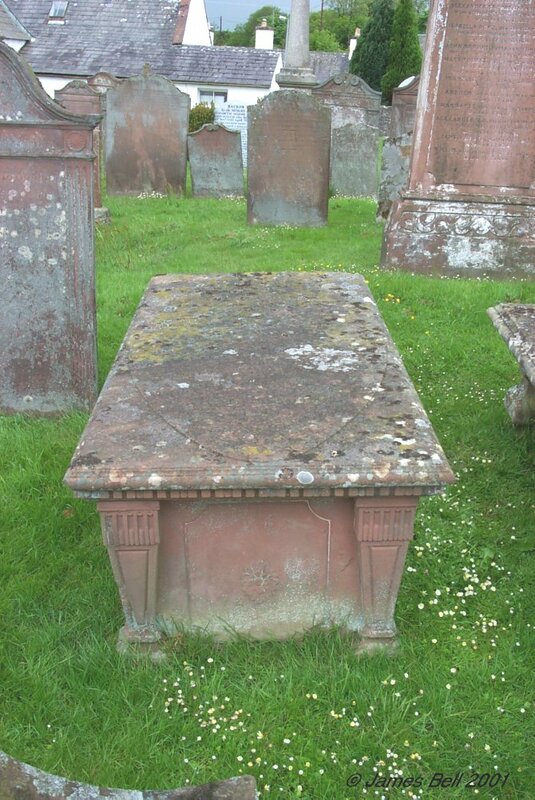 And of his wife Jane Somerville, who died at Kirkcudbright, 16th Nov 1851, aged 62 years. Also Maitland Falcon, their son, who died here 14th May 1835, aged 19 years. Maria Williamson, their daughter, who died here 12th June 1836, aged 13 years. Emma their daughter, who died here 17th Aug 1839, aged 20 years. 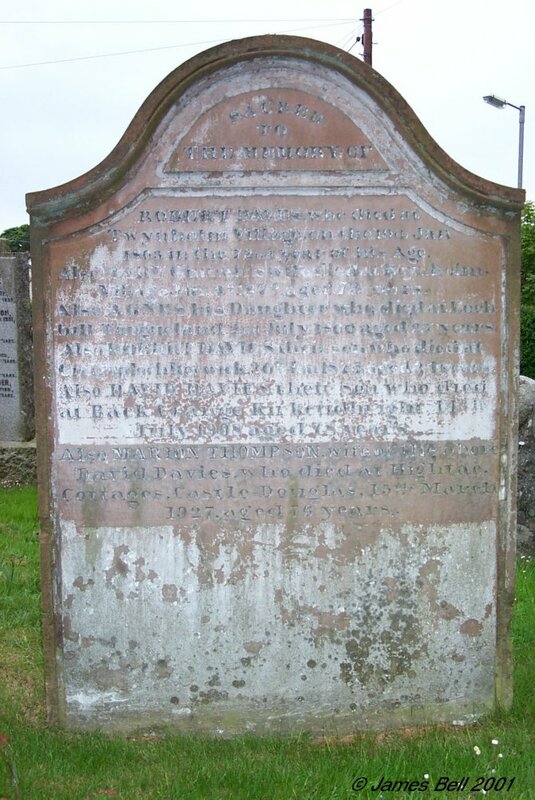 Barbara their daughter, who died at Kirkcudbright 16th Aug 1851, aged 33 years. Robert Somerville, their son, who died at Melbourne, Australia, 27th April 1854, aged 16 years. 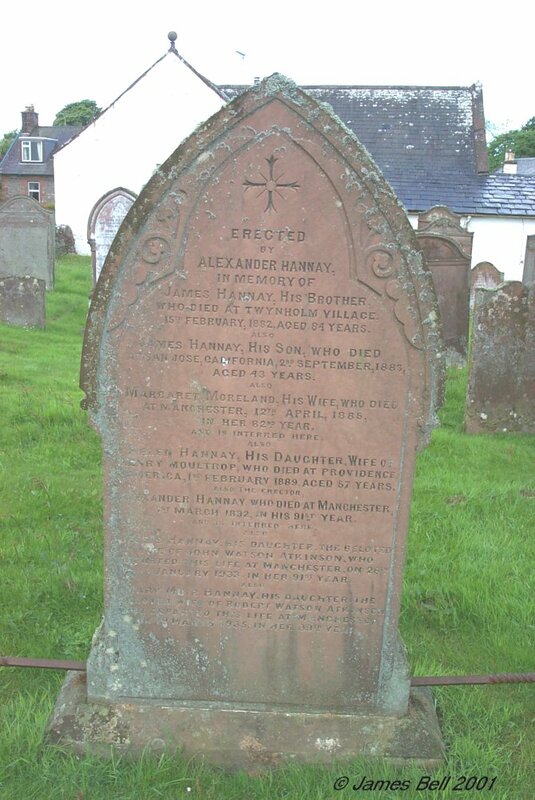 Alexander Brown, their son, who died at Kirkcudbright, 8th Nov 1859, aged 28 years. John Williamson their son, who died at Liverpool, 5th Aug 1873, aged 59 years. Jane Somerville their daughter, who died at Wigan, 12th Jan 1881, aged 59 years. James Armstrong, their son-in-law, who died 5th Nov 1899, aged 65 years. 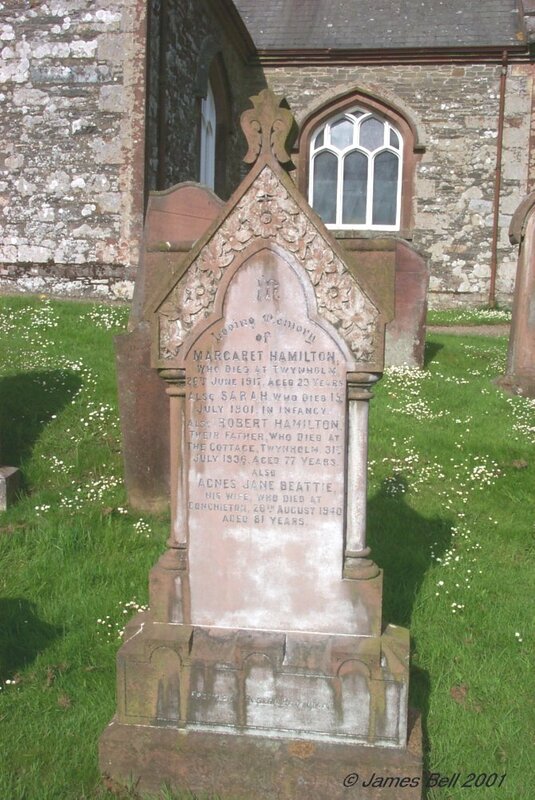 Elizabeth Heron Adamson, his wife, died 14th July 1907, aged 88 years, interred at Kirkcudbright. 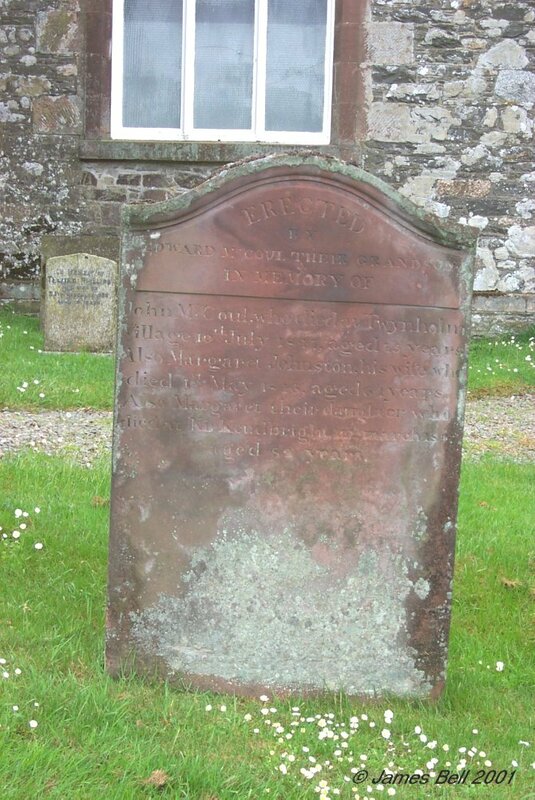 215 Sacred to the memory of Elizabeth Selkirk, spouse to John Waugh, who died on the 22nd Nov’r 1828, aged 56 years. 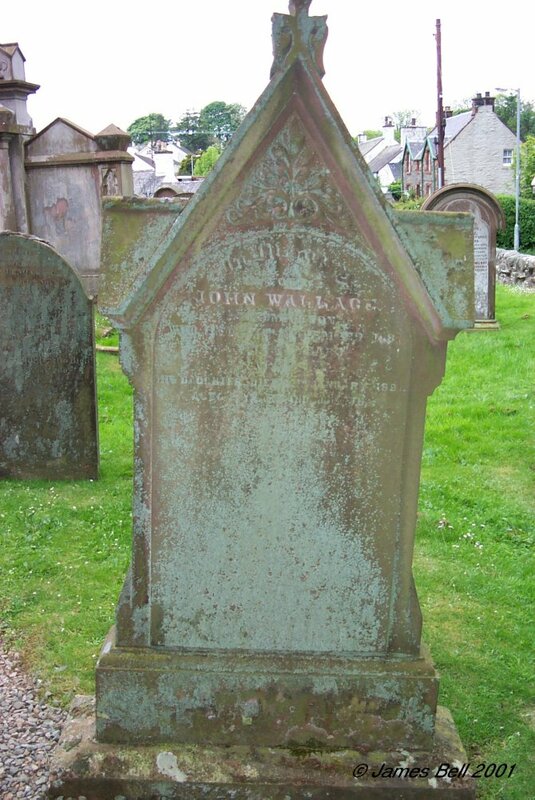 Also the said John Waugh, who died 4th Jan 1851, aged 77 years. Also his wife Helen Fraser, who died 23rd April 1888, aged 88 years. Also Henry, their son, who died at Cumston Lodge, 10th April 1919, aged 84 years. Henry George Waugh, who died at Cumston Lodge, 14th Sept. 1905, aged 27. Mary Findlay, wife of Henry Waugh, who died at Cumston Lodge, 10th Jan. 1928, aged 82 years. Mary Agnes Waugh, died at Twynholm 13th May 1943, aged 67 years. John Waugh, who died at Ewensville, 6th August 1950, aged 78 years. Helen Waugh, who died at Twynholm, 29th November 1955, aged 80 years. Also Marion Waugh Martin, daughter of John Waugh, who died at Vancouver, B. C., Canada, 10th May 1998, aged 96 years. 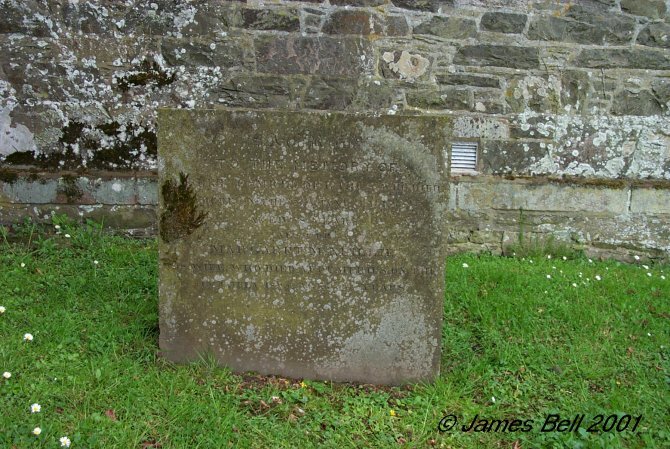 216 In memory of William McMillan, who died at Twynholm Village on the 22nd of Nov’r 1834, aged 82 years. Also of Jane McKeand his widow, who died at Twynholm Village on the 27th day of June 1861, aged 88 years. Also Elizabeth McMillan, their daughter, who died at Twynholm Village on 16th December 1894, aged 74 years. 217 Erected by Robert Glover to the memory of James Brown Glover, his son, who died at Balannan, on the 21st Sept 1858, aged 20 years. Also the above Robert Glover, who died at Balannan, on the 17th Aug’t 1871, aged 78 years. 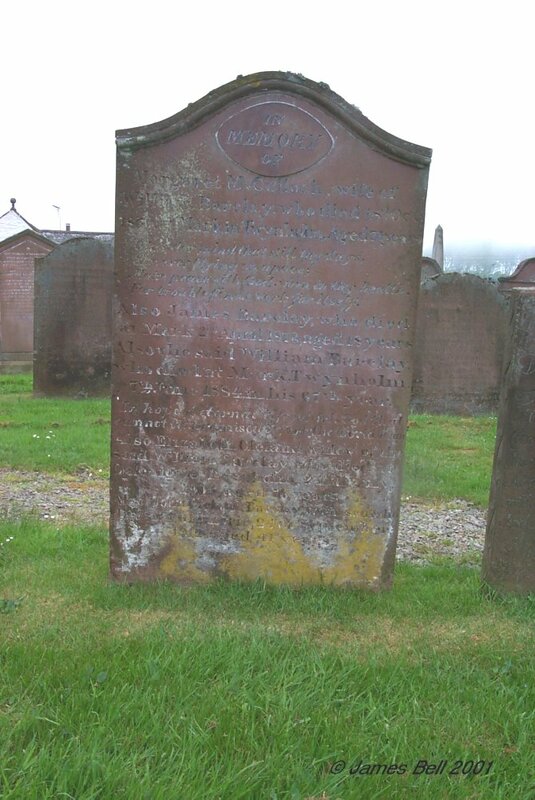 Also his wife Jane Warrock, who died at Langholm, the 16th March 1872, aged 80 years. 218 Erected by William Purves to the memory of Mary McKay, his spouse, who died at Twynholm Village, 24th June 1861, aged 24 years. 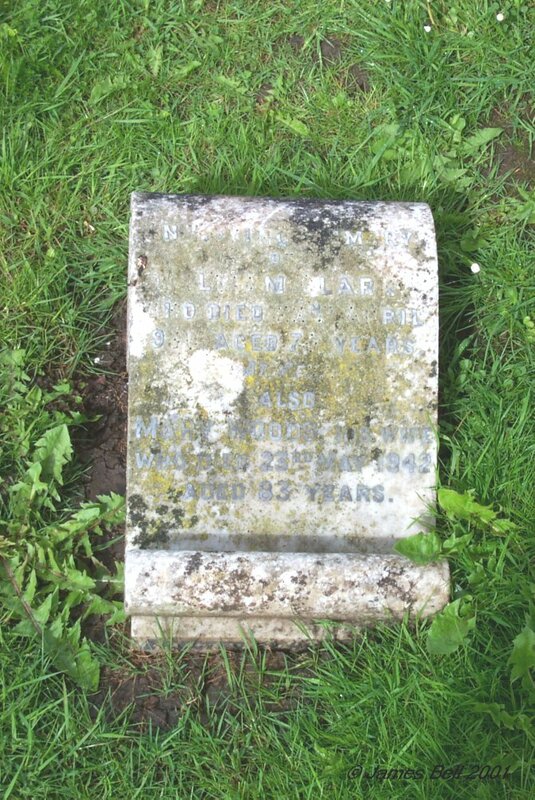 The said William Purves, died at Twynholm Village 29th June 1888, aged 55 years. Also Jeannie Purves, his daughter, who died at Twynholm Village 20th April 1894, aged 26 years. 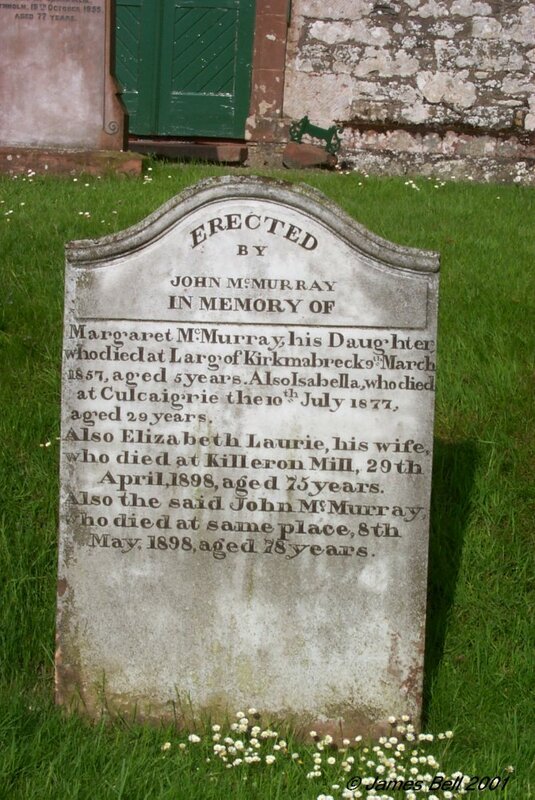 Also Jane Murray, his wife, who died at Twynholm Village 14th April 1902, aged 61 years. 219 rs. Also George his son, who died 23rd June 1868, aged 7 days. Also George his son, who died 24th Oct’r 1873, aged 17 months. The above William Mitchell, who died at Laurieston, 24th April 1915 aged (blank) years. 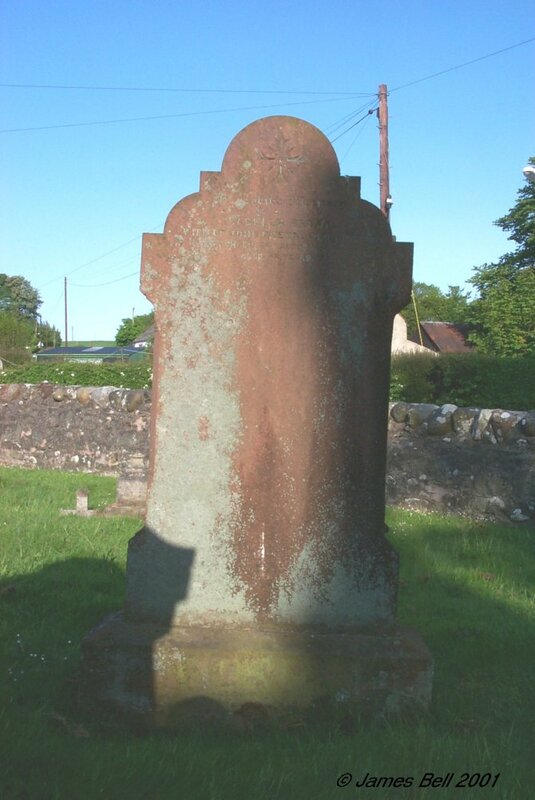 220 In memory of William Slone who died at Barlochan, 3rd April 1840, aged 53 years. I hope, dear friends, we'll meet again. And James, his son, who died at Leeds, 25th April 1851, aged 20 years. Cut in the bloom of life. Also Mary Harris, wife of the said William Slone, who died 21st Jan'y 1867, aged 83 years. 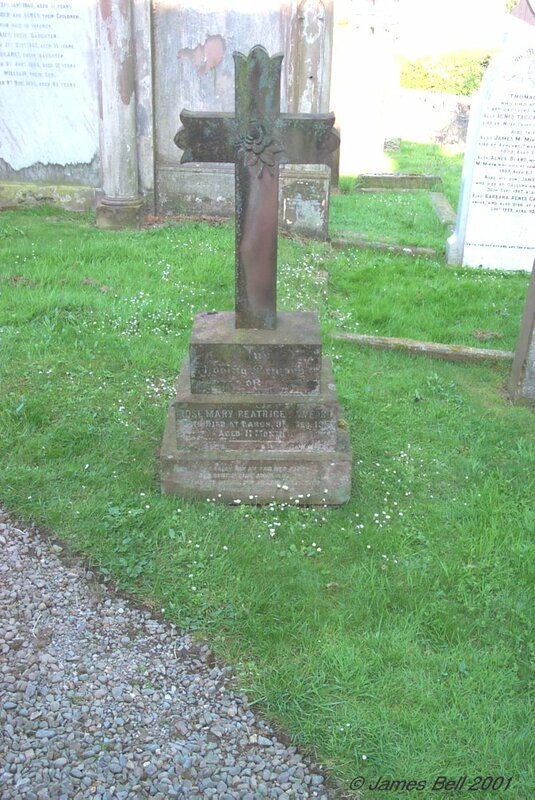 Also Mary, their daughter, who died at Dumfries on 9th July 1904, aged 76 years. Erected by James, his son. 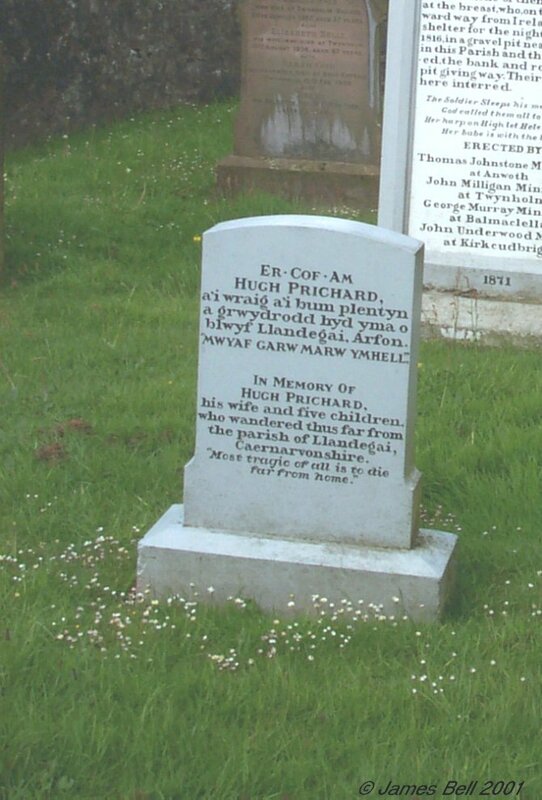 221 Er Cof Am Hugh Pritchard, a`i wraig a`i bum plentyn a grwydrodd hyd yma o blwyf Llandegai, Arfon. 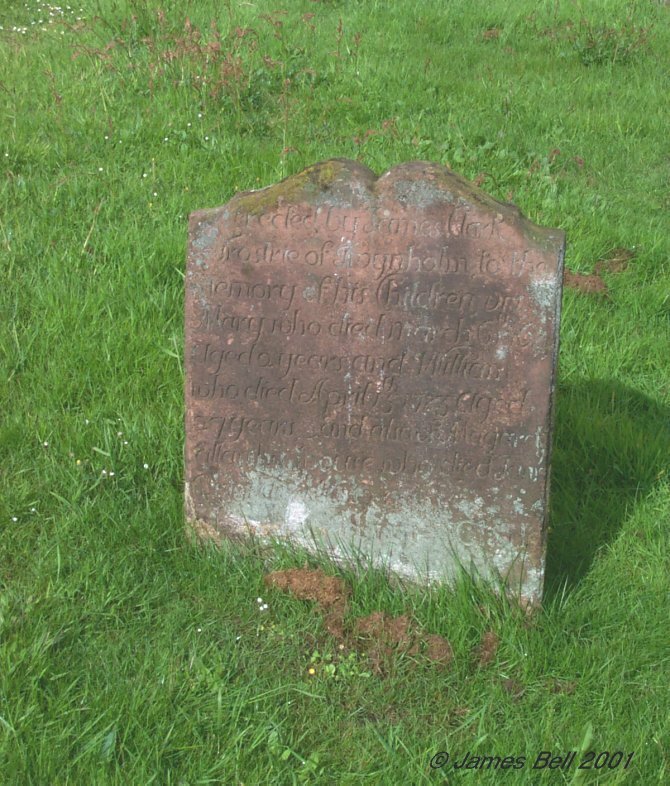 "MWYAF GARW MARW YMHELL"
In memory of Hugh Pritchard, his wife and five children, who wandered thus far from the Parish of Llandegai, Caernarvonshire. "Most tragic of all is to die far from home." 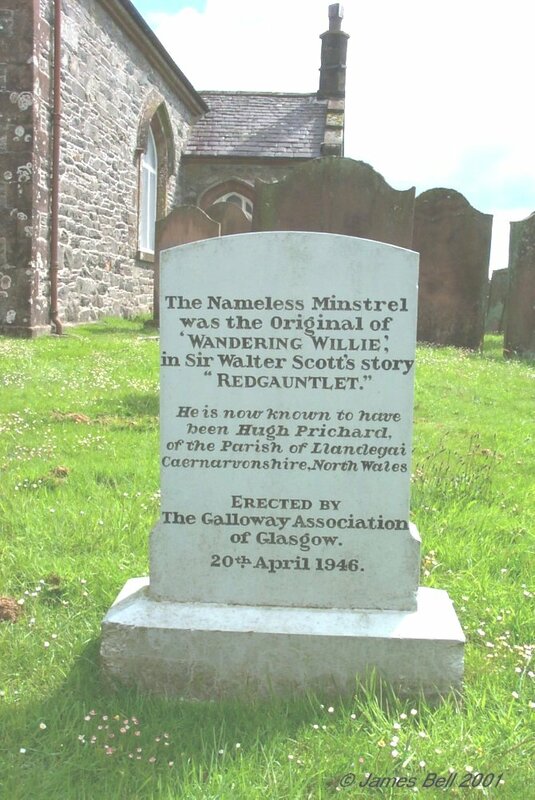 Reverse: The Nameless Minstrel was the original of 'Wandering Willie,' in Sir Walter Scott's story 'Redgauntlet." He is now known to have been Hugh Pritchard, of the Parish of Llandegai, Caernarvonshire, North Wales. Erected by the Galloway Association of Glasgow, 20th April 1946. 222 In memory of Jessie Williamson, who died at Bombie on the XXXth August MDCCCXXXVII, in the XIIth year of her age. Capt Alexander Williamson, of Ship Lanercost of Liverpool, who died at sea 23rd Aug't 1861, aged 34 years. 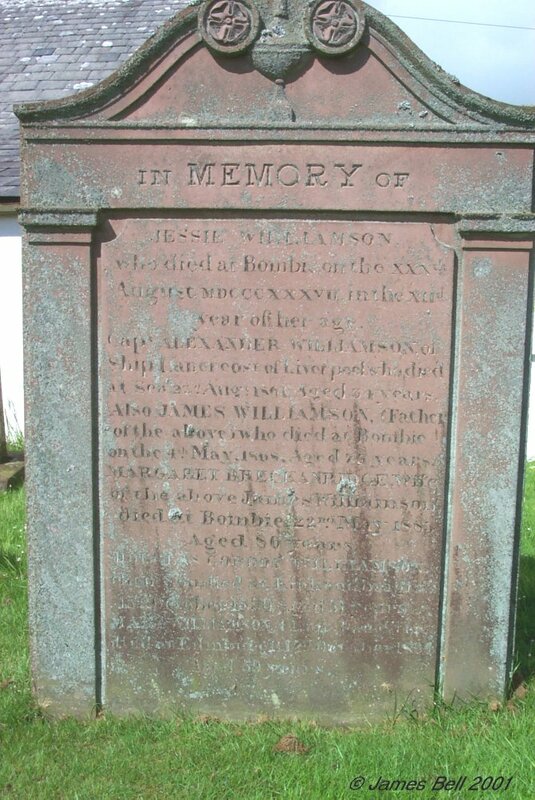 Also James Williamson, (father of the above) who died at Bombie, on the 4th May 1868, aged 73 years. 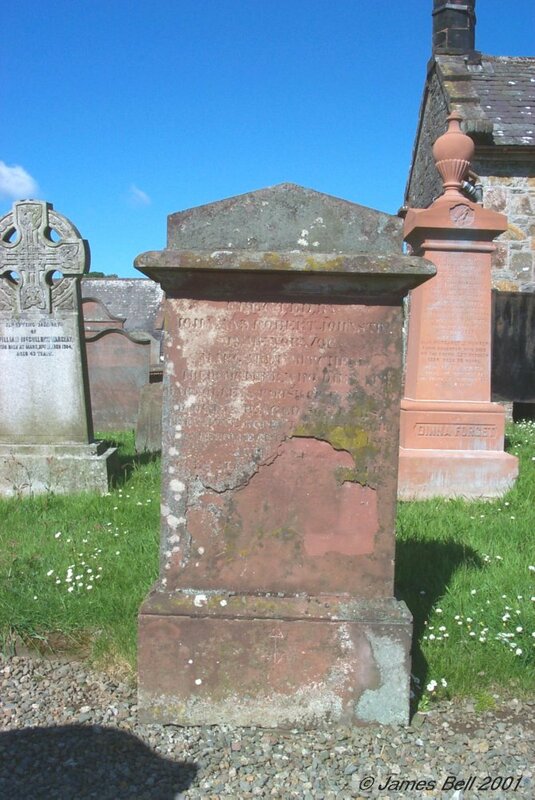 Margaret Breckanridge, wife of the above James Williamson, died at Bombie 22nd May 1885, aged 86 years. 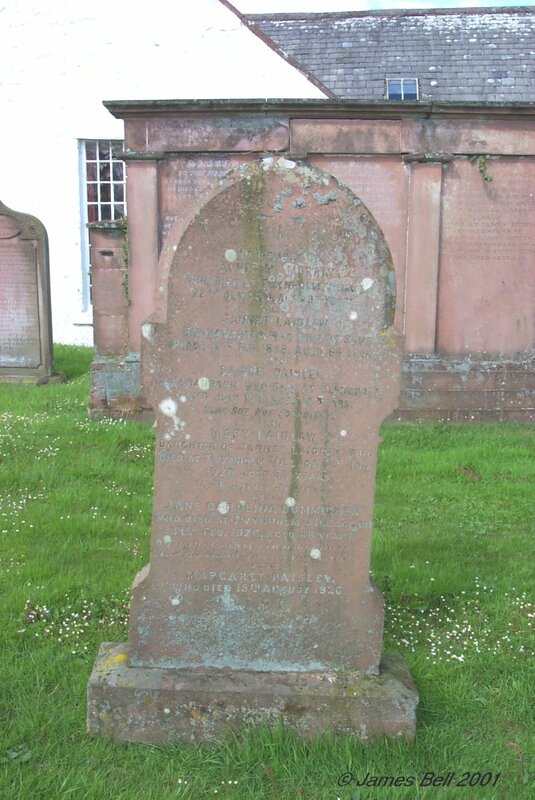 Douglas Gordon Williamson, their son, died at Kirkcudbright, 15th October 1890, aged 51 years. Mary Williamson their daughter, died at Edinburgh 12th October 1891, aged 59 years. 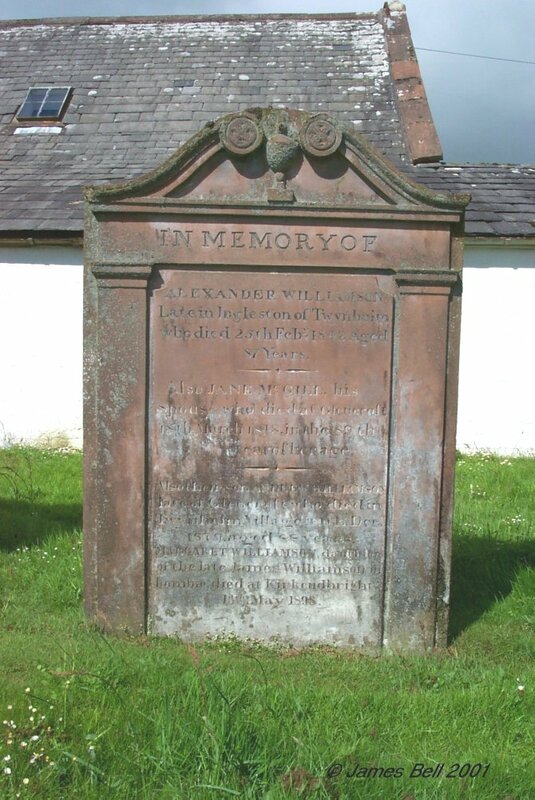 223 In memory of Alexander Williamson, late in Ingleston of Twynholm, who died 25th Feb 1842, aged 87 years. Also Janet McGhie, his spouse, who died at Glencroft, 18th March 1848, in the 89th year of her age. Also their son Andrew Williamson, late of Glencroft, who died in Twynholm Village, 24th Dec r 1879, aged 88 years. 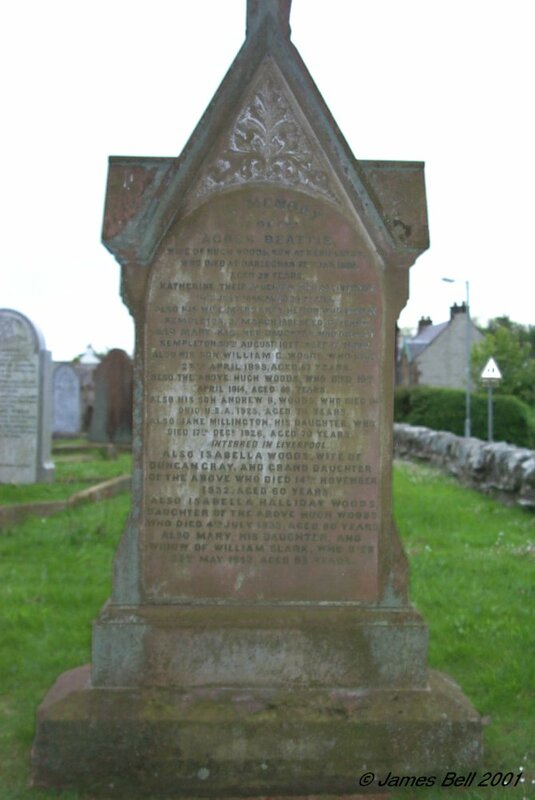 Margaret Williamson, daughter of the late James Williamson in Bombie, died at Kirkcudbright 13th May 1898. 224 a. Sacred to the memory of James Patrick McMillan, son of Captain Irving of Barwhinnock, who died at Mussoorie, Presidency of Bengal, East Indies, on the 17 Aug't 1849, 1 yr, 11 mths & 8 days. Also to Major James Irving, his father, who died at Barwhinnoch, 12th May 1873, aged 65. Shall need to part no more”. Also Margaret McMillan of Barwhinnock wife of the said Major James Brown who died at Barwhinnock 21st August 1895 aged 73 years. b. Sacred to the memory of George Douglas McMiken, who died at Barwhinnock House, on the 27th of Sept 1821. 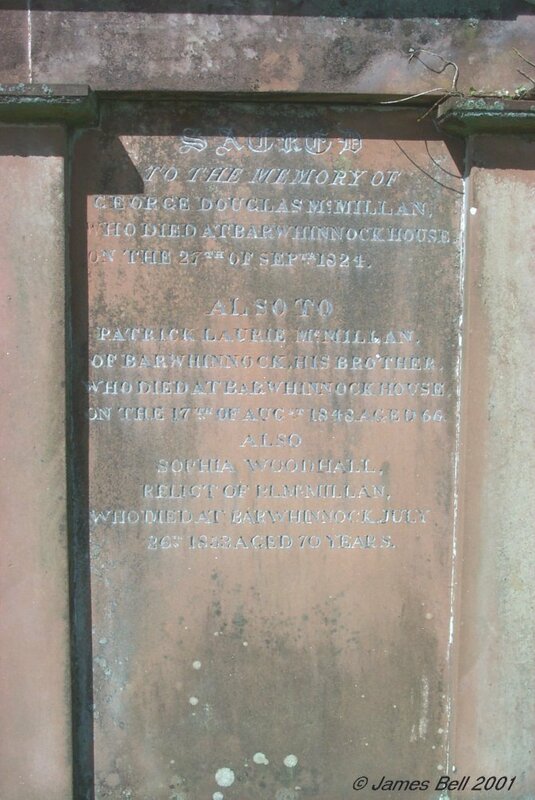 Also of Patrick Laurie McMillan, of Barwhinnock House, his brother, who died at Barwhinnock House on the 17th of Aug 1848, aged 66. Also Sophia Woodhall, relict of P.E. 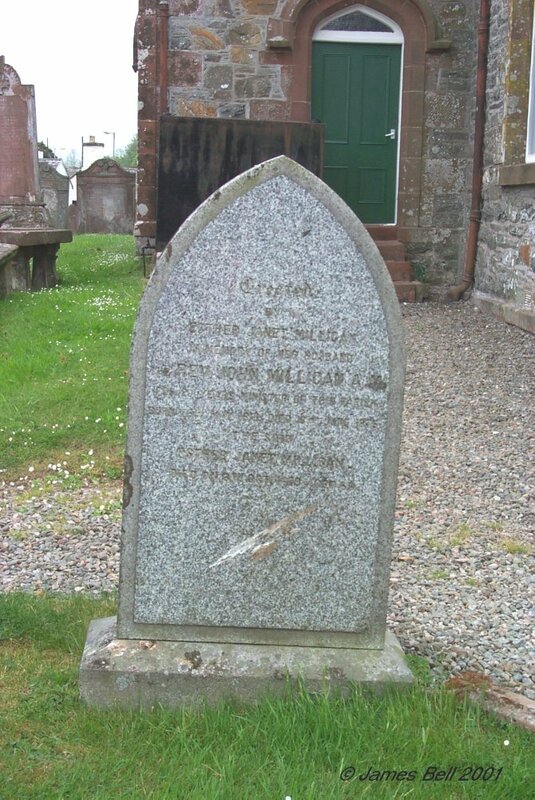 McMillan, who died at Barwhinnock July 26 1855, aged 70 years. c. Sacred to the memory of Margaret Julia Irving, second daughter of Major James Irving, who died at Harburn, Mid Lothian, on 7th Jan'y 1897 aged 45 years. Also Norman James Irving, youngest son of Major James Irving, who died at Holland House, Edinburgh, on 4th December 1923, aged 62 years. 225 Erected by William Stewart, Twynholm, in memory of his children namely: James Hunter Stewart ,who died at Twynholm Village in 1867 in infancy; Agnes Stewart ;who died at Kempleton, Twynholm; 20th Sept 1863 aged 14 years; Mary Elizabeth Stewart, who died at Balmaghie, 12th February 1874, aged 10 years; David Stewart, who died at Twynholm Village, 19th May 1880, aged 19 years; William Stewart, who died at Twynholm Village, 16th Dec 1883 aged 23 years. Also John Carson, his uncle, who died at Twynholm Village, 28th April 1886, aged 88 years. Also Mary Carson, his wife, who died at Twynholm Village, 21st March 1897, aged 63 years. 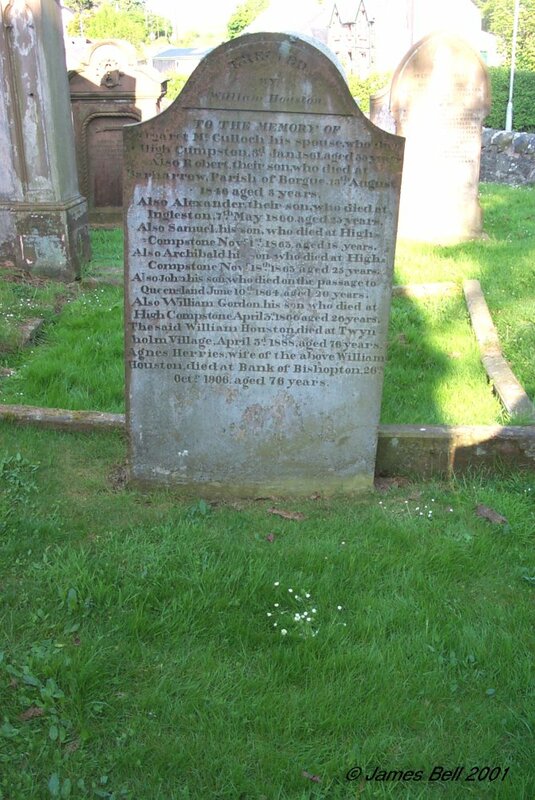 Also Agnes Stewart, their grand-daughter, who died at Twynholm Village, 4th Aug 1904, aged 21 years. 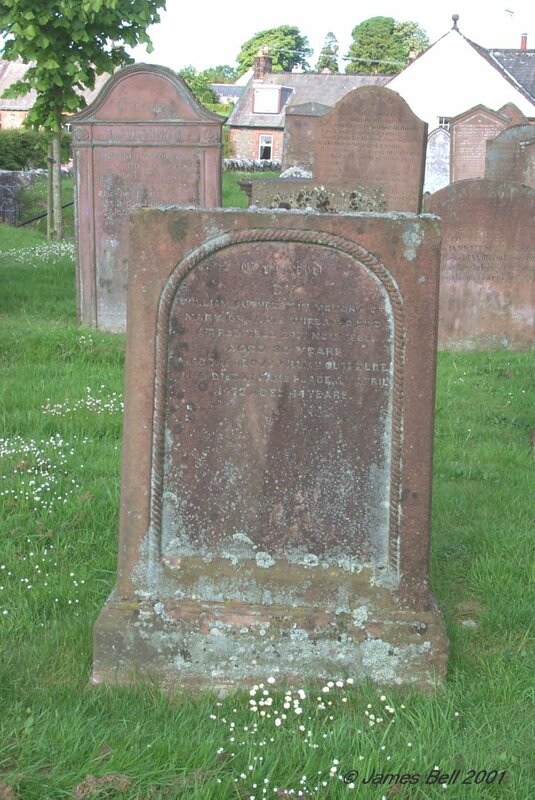 Also the said William Stewart, who died at Dumfries, 29th April 1920, aged 89 years. 226 Erected by David Milligan in memory of Mary, his daughter, who died at Compstonend, 17th March 1882, aged 24 years. Also Jessie, his daughter, who died at Liverpool, 16th June 1884, aged 18 years, interred at Kirkdale Cemetery. 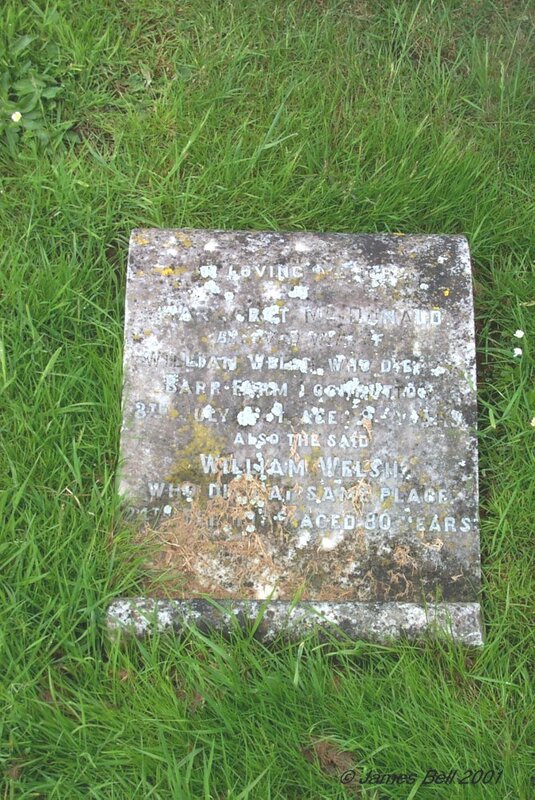 Also Jane Wilson, his wife, who died at Compstonend, 6th January 1902, aged 65 years. 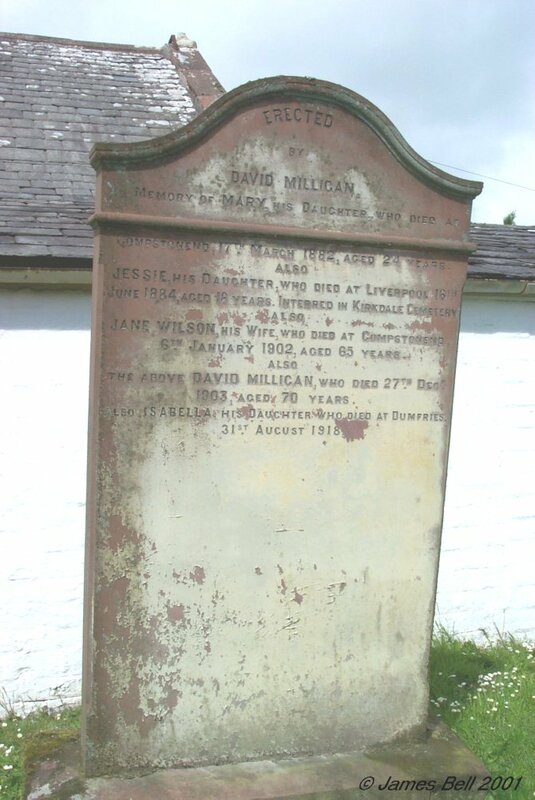 The above David Milligan, who died 27th Dec’r 1903, aged 70 years. Also Isabella, his daughter, who died at Dumfries, 31st August 1918. 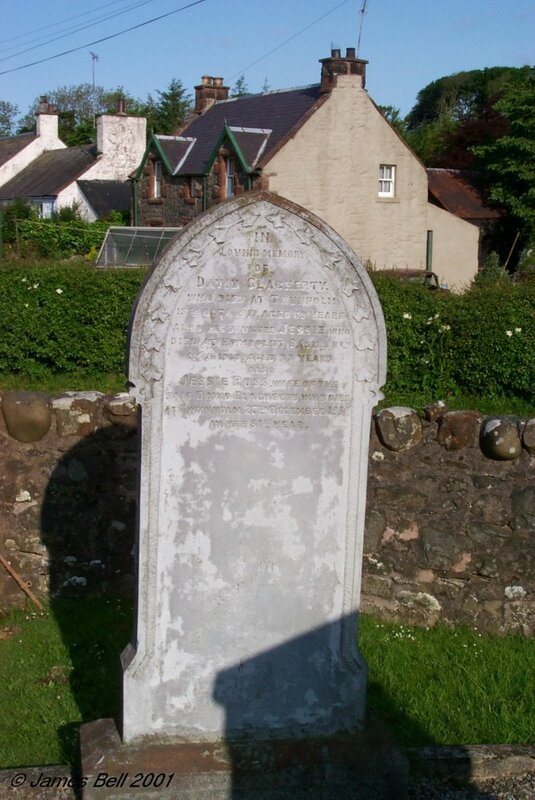 227 In memory of John Mitchell, late Farmer in Crumwhill, who died in Tongland 1st Dec’r 1827, aged 38 years. Also his daughter Isabella, died 28th Aug’t 1833 aged 9 years. Also his son Hugh, died 17th May 1840, aged 18 years. 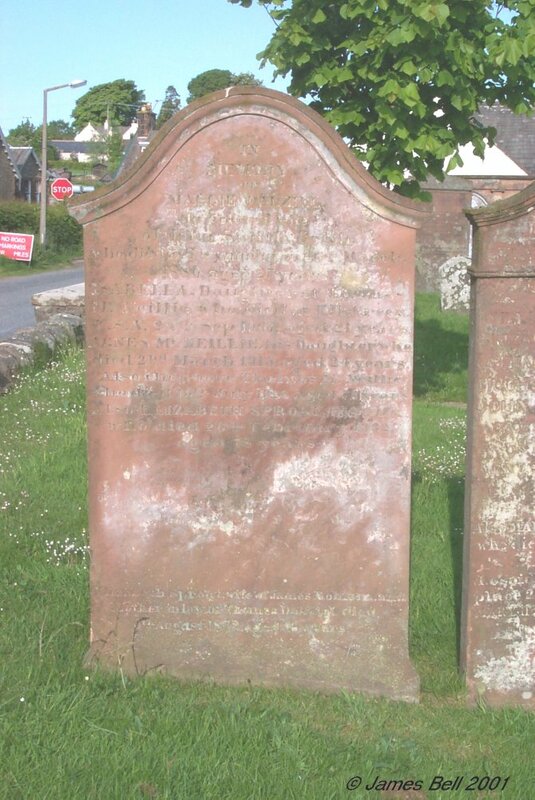 And his father Hugh Mitchell, late farmer in Barlocco, Twynholm, who died 2nd Feb’y 1837 aged 82 years. Also his mother Isabella Thomson, who died 21 May 1841, aged 84 years. And his son John Mitchell, who died at Ringford, 23rd Jan’y 1858, aged 34 years. Jean Halliday, his wife, who died 6th July 1870, aged 76 years. Jane Barclay, widow of John Mitchell, died at Ringford 13th Feb’y 1896. 228 In memory of a Welsh soldier who was discharged because of blindness that came upon him in Egypt: of his wife who was a Harper, and the daughter of a Welsh Curate; and of their five children, one of them an infant at the breast, who on their homeward way from Ireland, took shelter for the night of 20th April 1816 in a gravel pit near Old Mill in this Parish, and there perished, the bank and roof of the pit giving way. Their bodies are interred here. Her babe is with the bless’d”. John Underwood, Minister at Kirkcudbright. 229 In loving memory of Margaret McDonald, beloved wife of William Welsh, who died at Barr Farm, Lochrutton, 8th July 19-1, aged -- years. Also the said William Welsh, who died at same place 24th February 1936, aged 80 years. 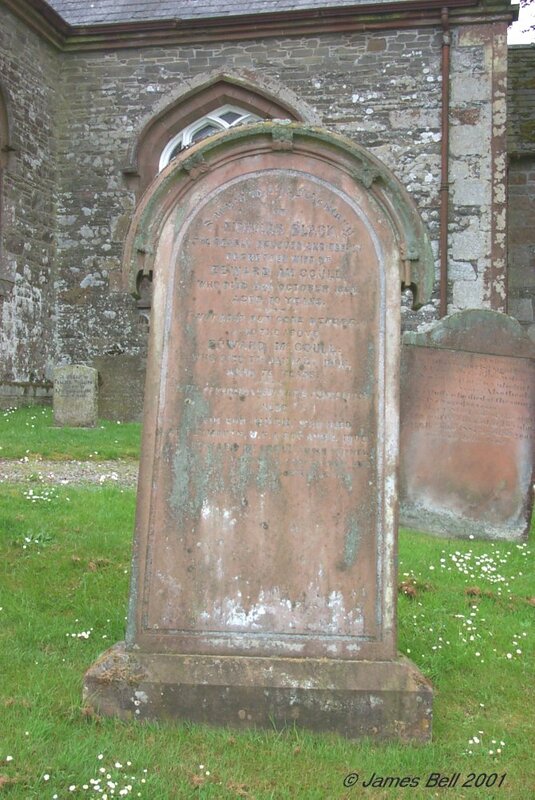 230 Erected by William, in memory of his father John Welsh, who died at Largs, 17 June 1837, aged 50 years. 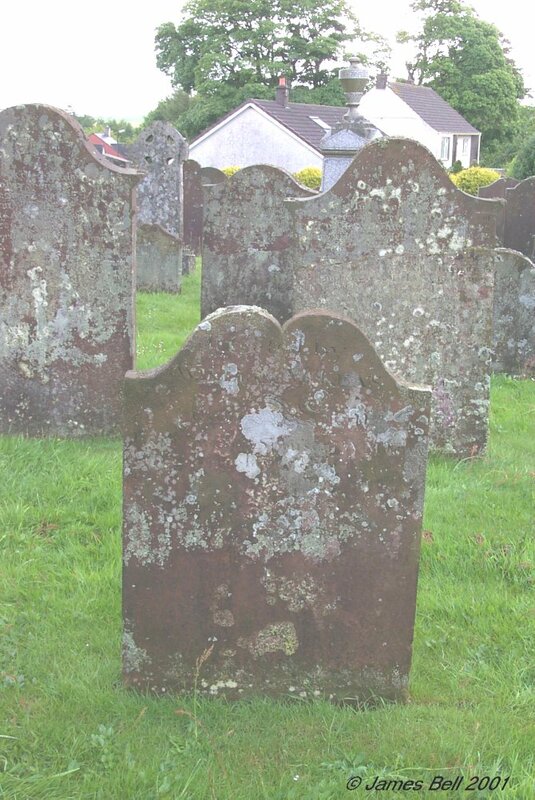 Also Mary Sharp, his spouse, who died at Twynholm Village, 7 Dec’r 1848, aged 50 years. Also Jane Welsh, his daughter, who died at Carnely in Anglesea, 15 Sept. 1868, aged 42 years. Also the above William Welsh who died at Twynholm Village 21 May 1893, aged 64 years. And Mary, his daughter, who died at Bankend, 9 Oct 1882, aged 29 years. 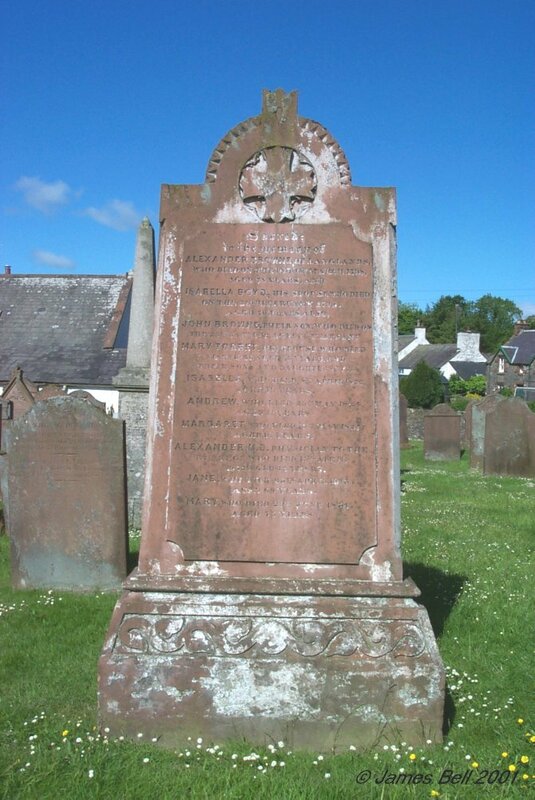 231 Erected by Agnes Dunkeld, in memory of her husband Robert Kelly, who died at Gatehouse, 5 Nov 1881, aged 52 years. Also of Daniel Kelly, his father, who died at Twynholm 5 April 1843, aged 56 years. And of Margaret Lochead, his mother, who died 4 Oct 1877, aged 82 years. Also of John Kelly, their son, who died 12th Jan 1892, aged 71 years. 232 In loving memory of William Murray who died at Twynholm, July 31st 1909, aged 23 years. Also William Murray, his father, who died at Twynholm, June 2nd 1916, aged 67 years. Also Sarah Jane Tweedie, his mother, who died at Twynholm, 18th June 1919, aged 67 years. 233 In affectionate remembrance of Charles Coid, who died at Twynholm Village, 20th January 1907, aged 57 years. 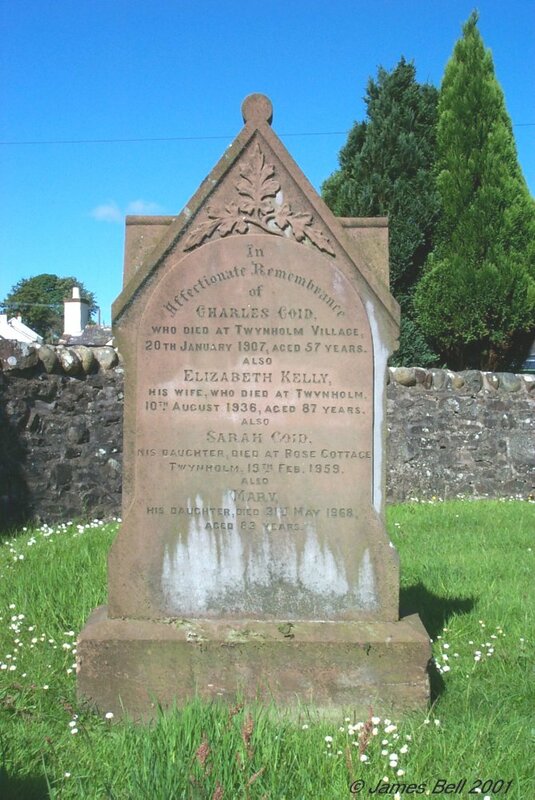 Also Elizabeth Kelly, his wife, who died at Twynholm, 10th August 1936, aged 87 years. Also Sarah Coid, his daughter, died at Rose Cottage, Twynholm, 19th Feb 1959. Also Mary his daughter, died 31st May 1968, aged 83 years. 234 In loving memory of Catherine Crosbie, wife of David McMinn, who died at 6 Glenholme Terrace, Twynholm, 26th March 1918, aged 60 years. Also the said David McMinn, who died at 6 Glenholme Terrace, Twynholm, 27th August 1922, aged 67 years. 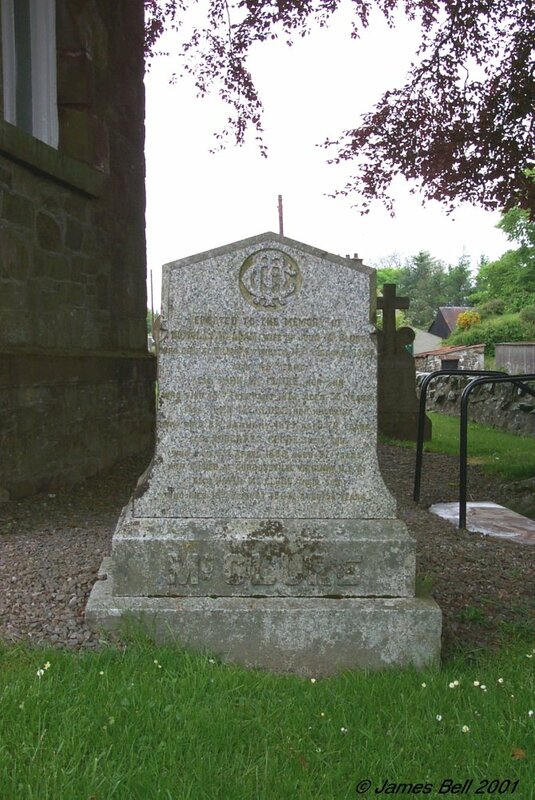 235 In loving memory of William Wallace, who died at Ingleston, Twynholm, 15th Nov. 1918, aged 47 years. Sadly missed. Also Mary Ann Morrison, beloved widow of the above, who died at Fardingbank, Thornhill, 17th November 1938, in her 70th year. Sadly missed. 236 In loving memory of Agnes Brown, wife of George Maxwell, who died at Ingleston, Twynholm, 31st May 1920, aged 38 years.